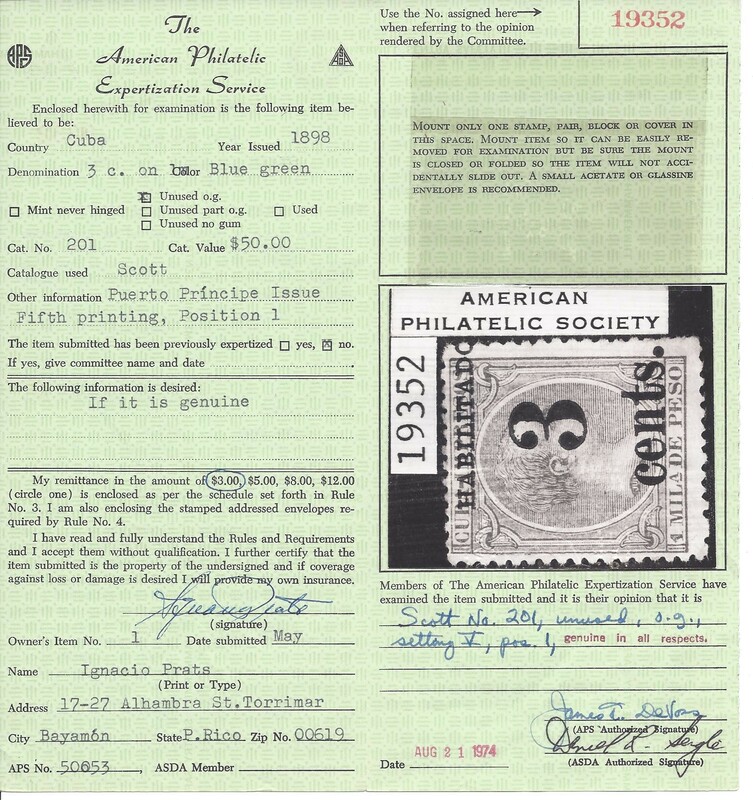 The source of the images are current collections and auction catalogs. 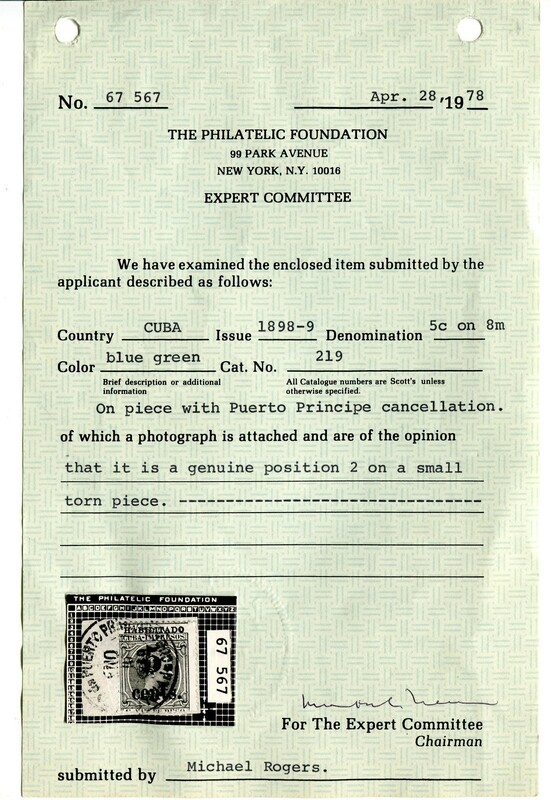 Ignacio Prats, sold 24 June 2006 by Greg Manning Auctions, West Caldwell, N.J.
Yamil H. Kourí, Jr., sold 19 and 25 June 2010 by Robert A. Siegel Auction Galleries Inc., New York, N.Y.
have also been included and are referenced in the body of the inventory. 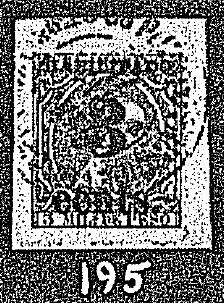 and of covers at 150 dpi with closeups of the stamps on the cover at 600 dpi. 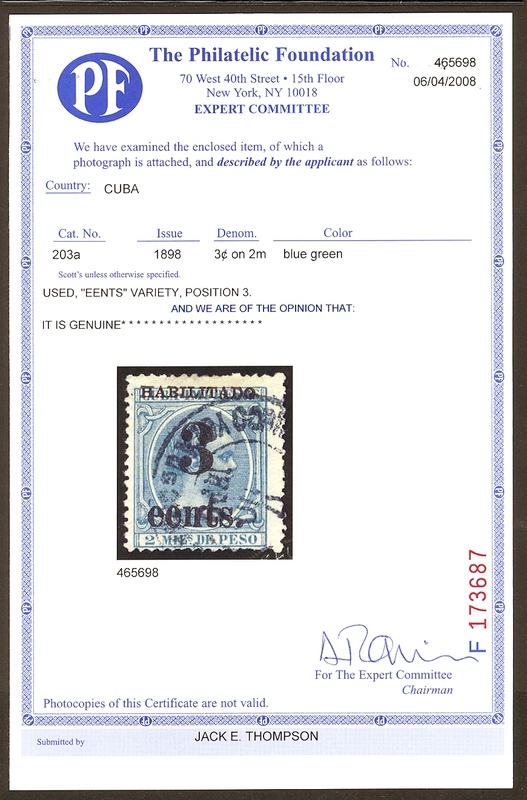 unless it is accompanied by a certificate of authenticity from a recognized authority. 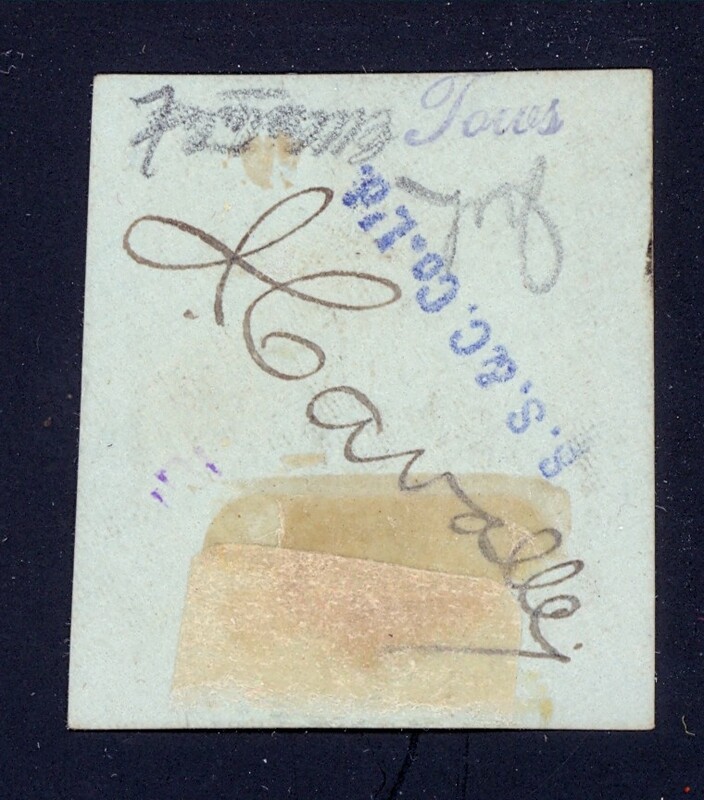 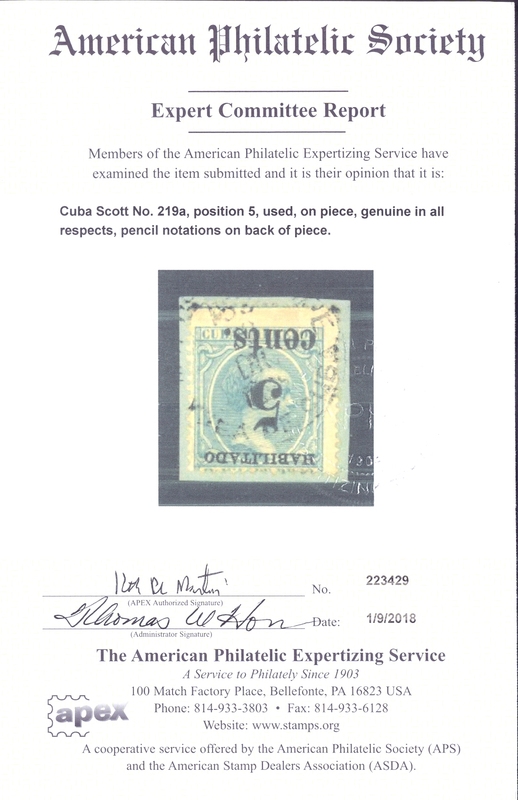 Auction houses cannot be expected to be experts on the stamps they sell. 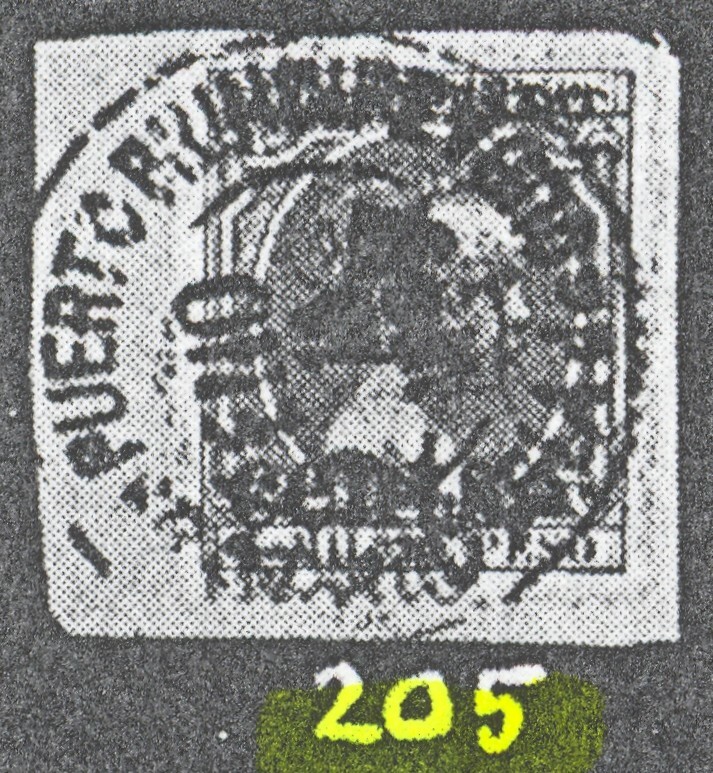 This stamp has been stolen in transit from the APS to its owner. 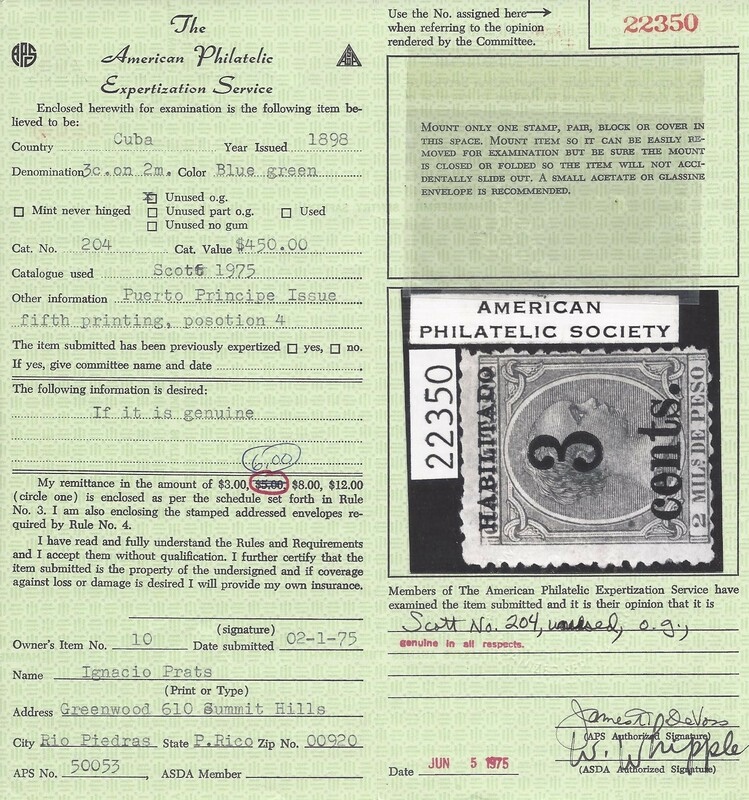 If you see it offered for sale anywhere, please contact the APS Stamp Theft Committee immediately. 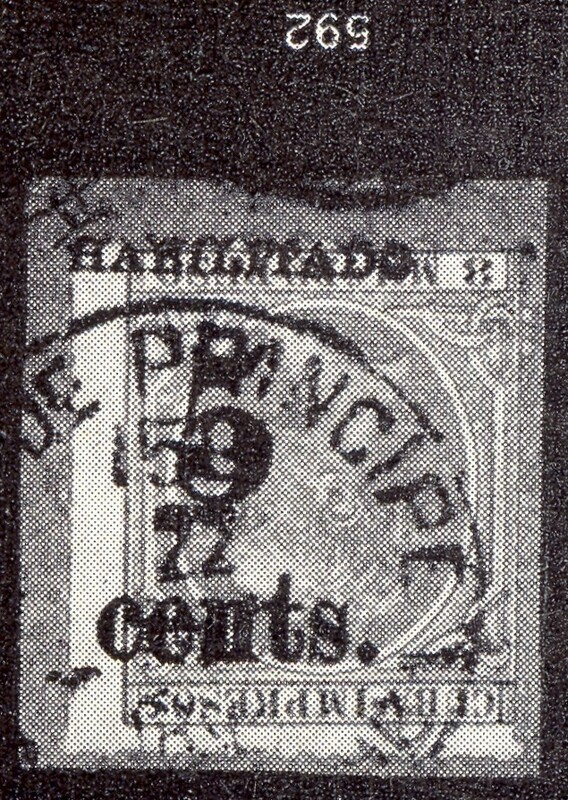 Stolen stamps are subject to confiscation by the police. 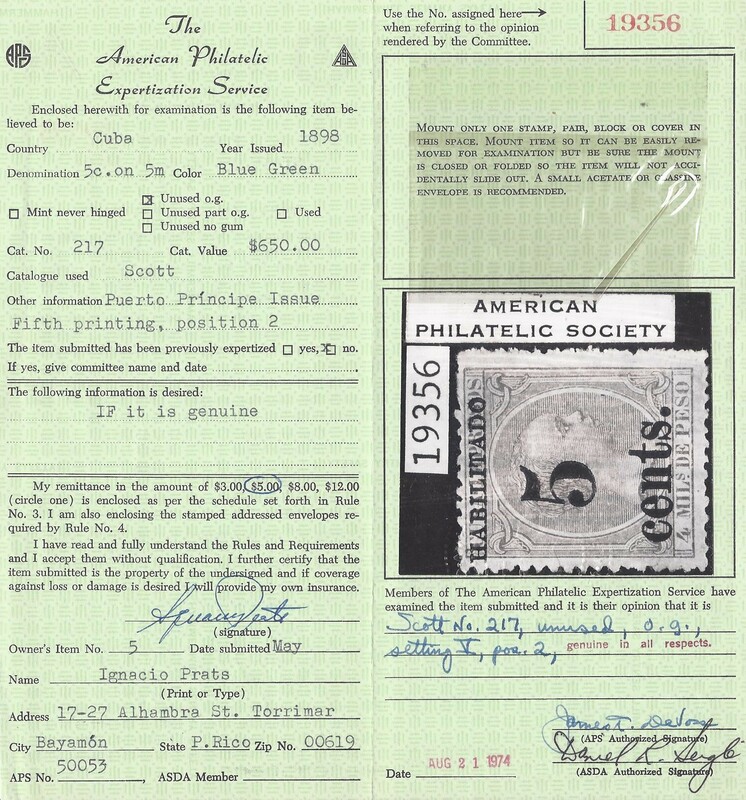 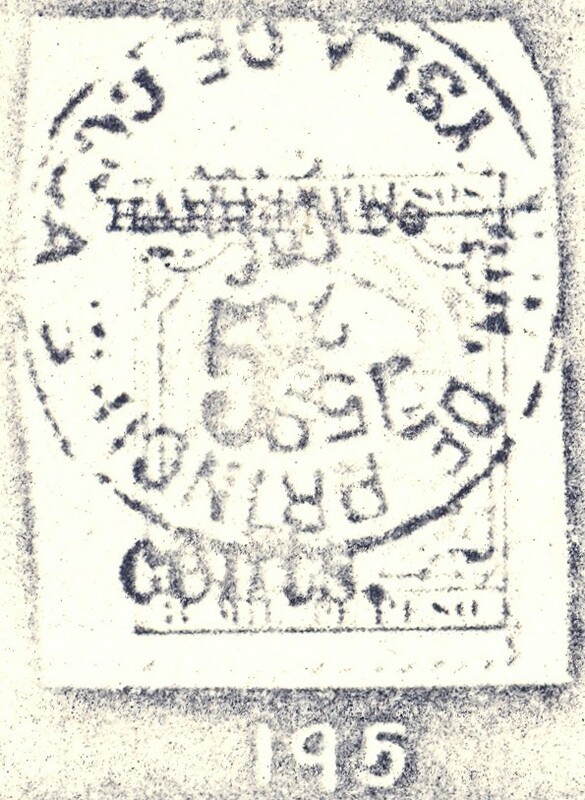 Colson sale was referenced and the stamp could not be identified in either Klein sale (<KLEI3403> or <KLEI4103>). 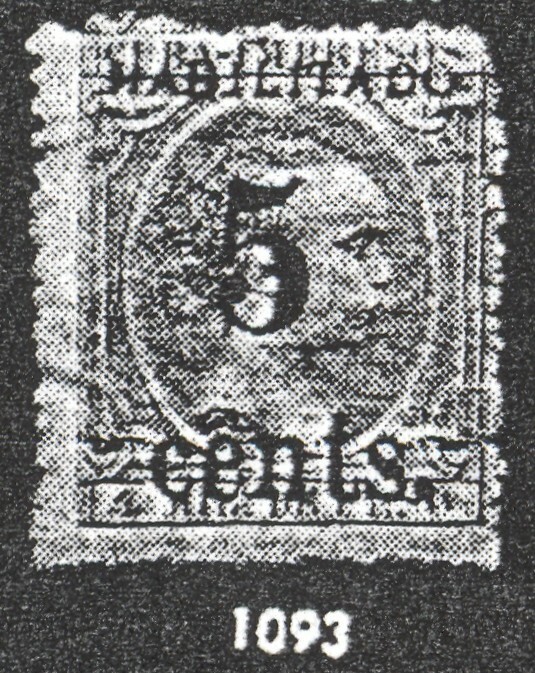 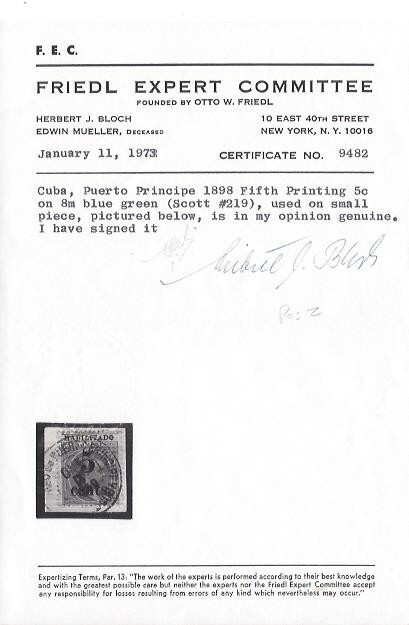 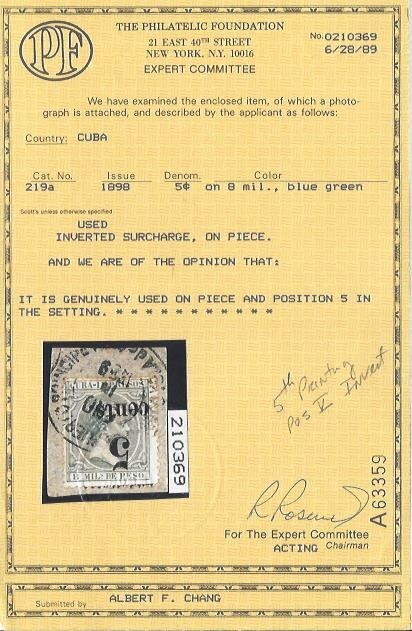 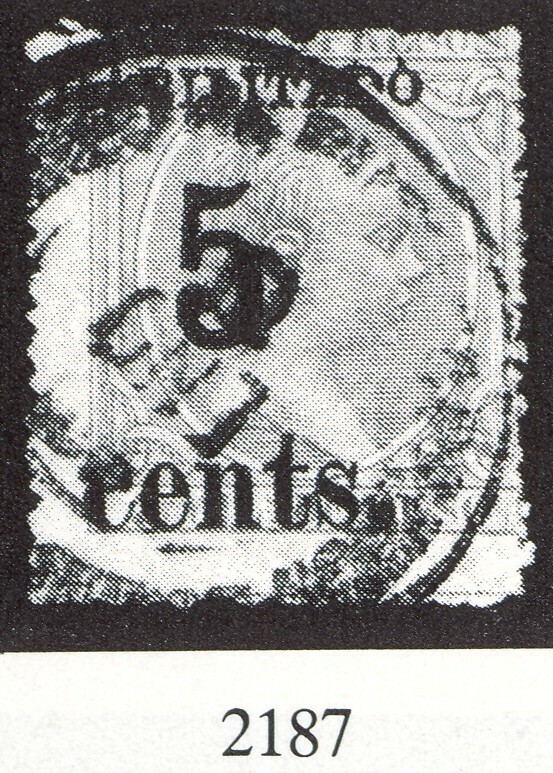 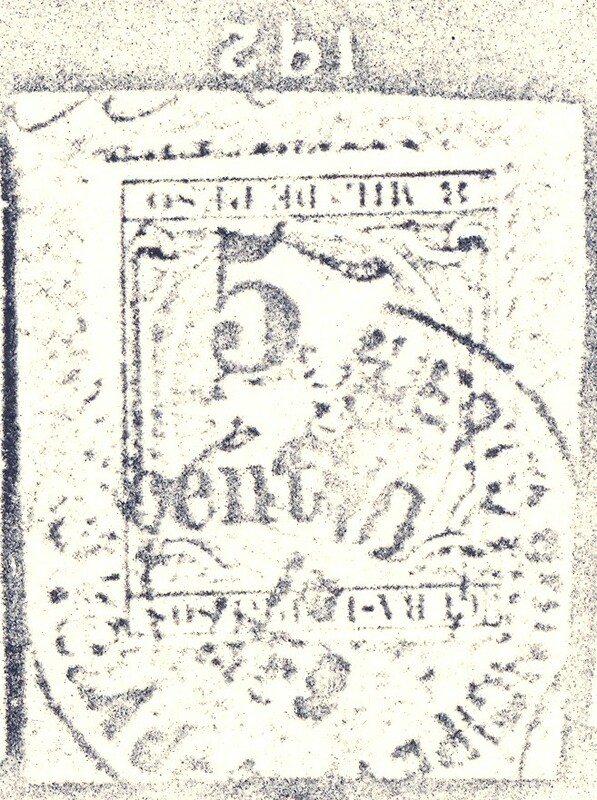 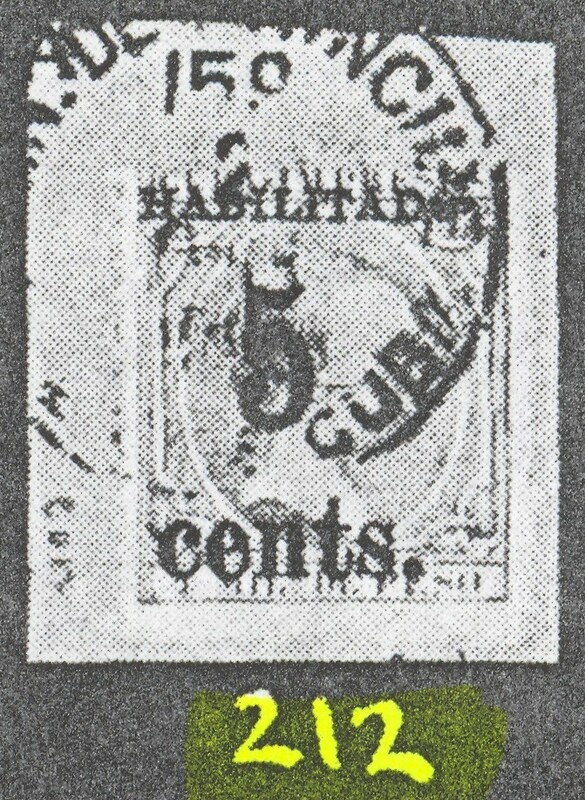 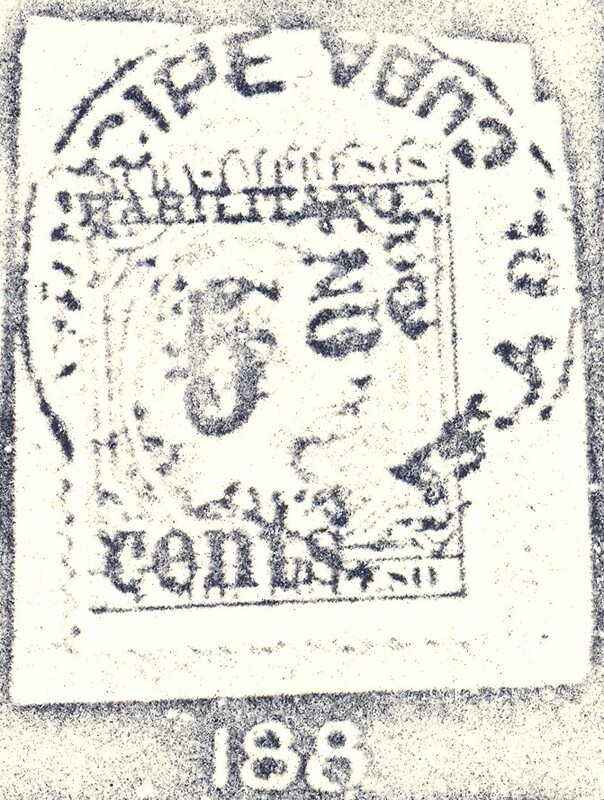 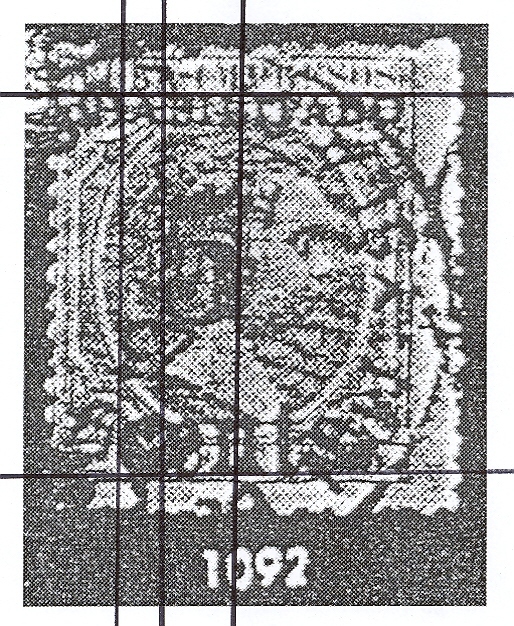 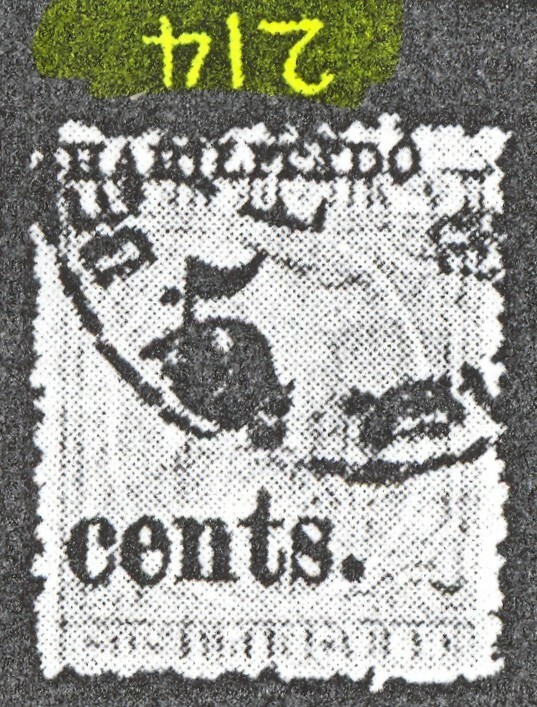 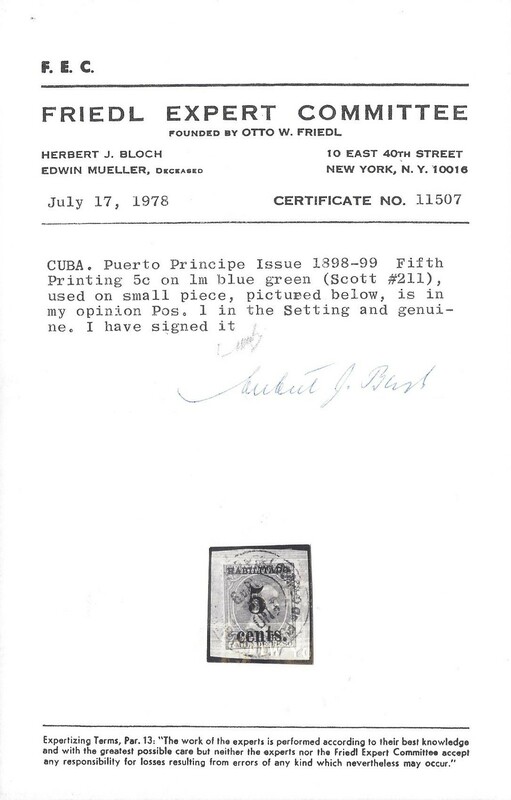 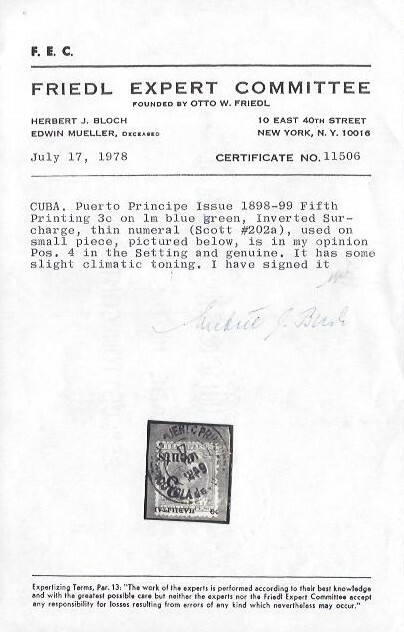 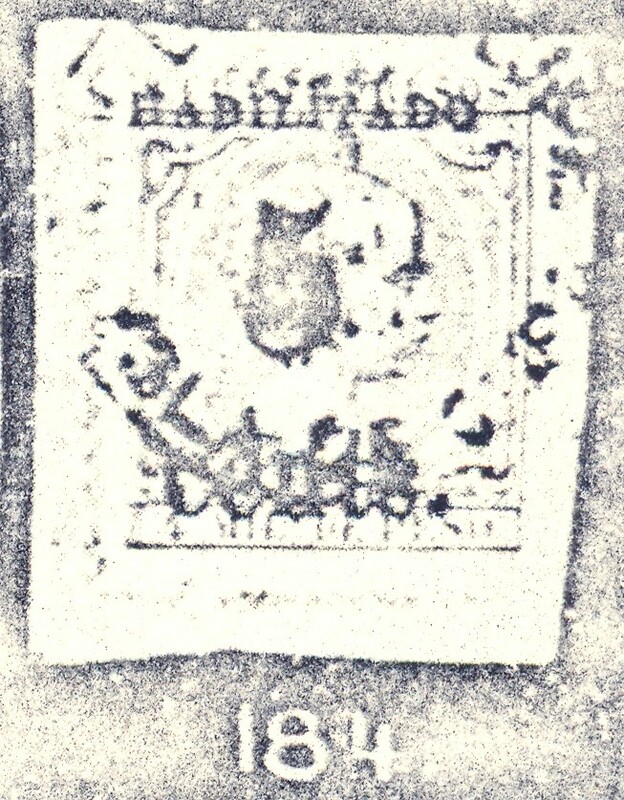 Note the piece to which this stamp is attached appears to have been trimmed at the top in the image shown in the Siegel auction catalog. 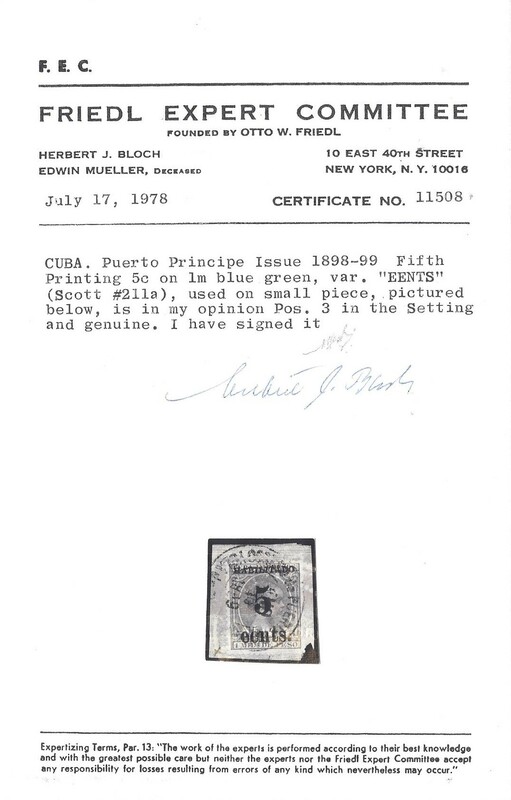 However, the image shown in the Kouri sale again shows the full piece shown in the Brock sale. 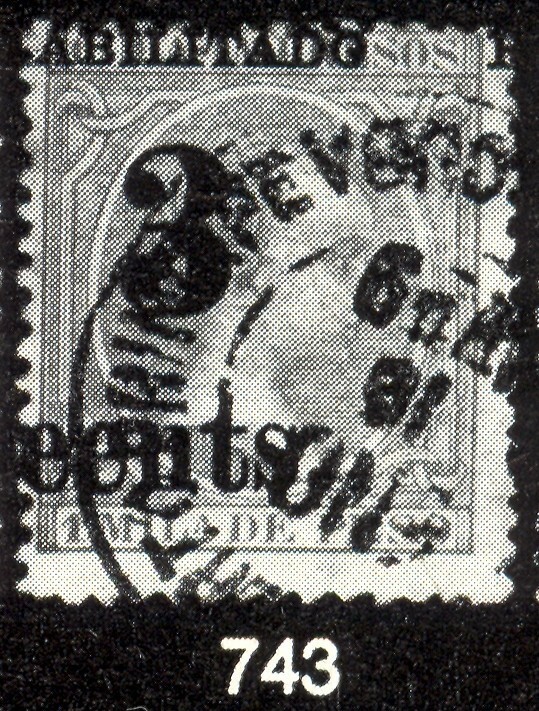 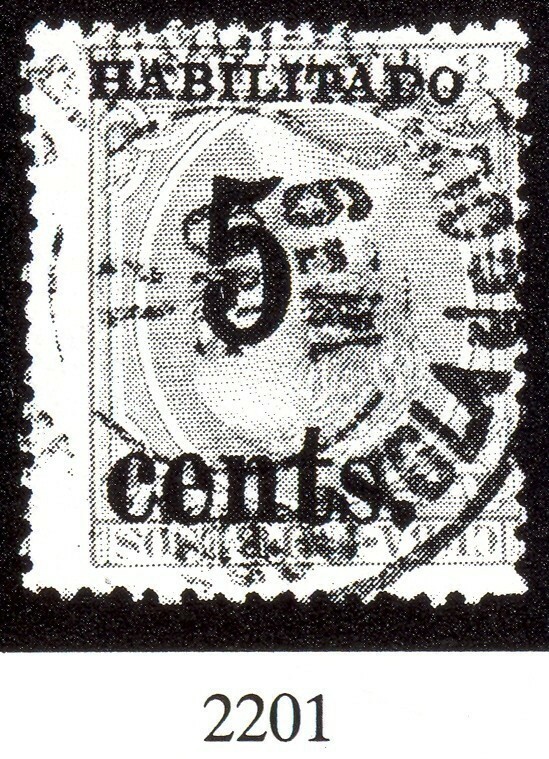 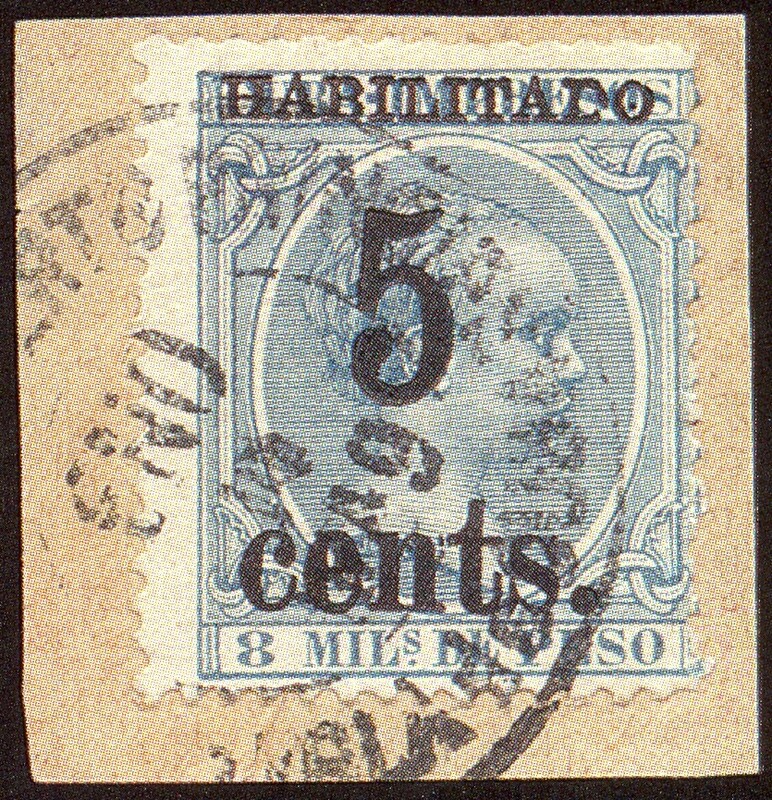 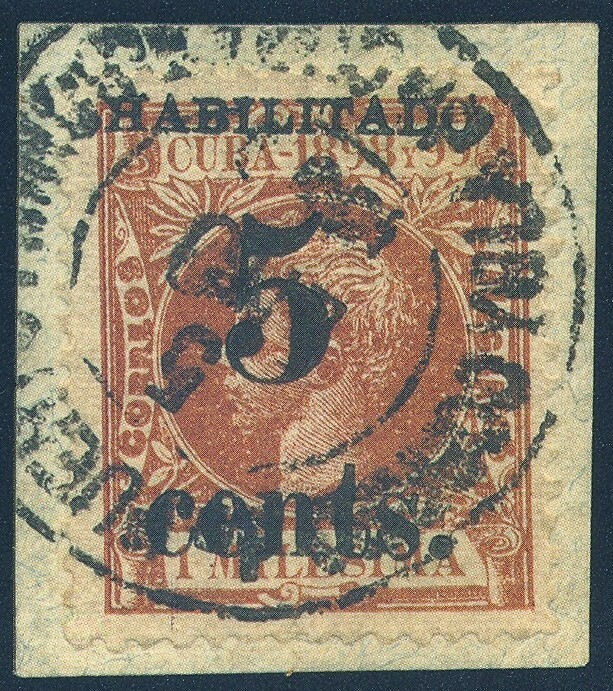 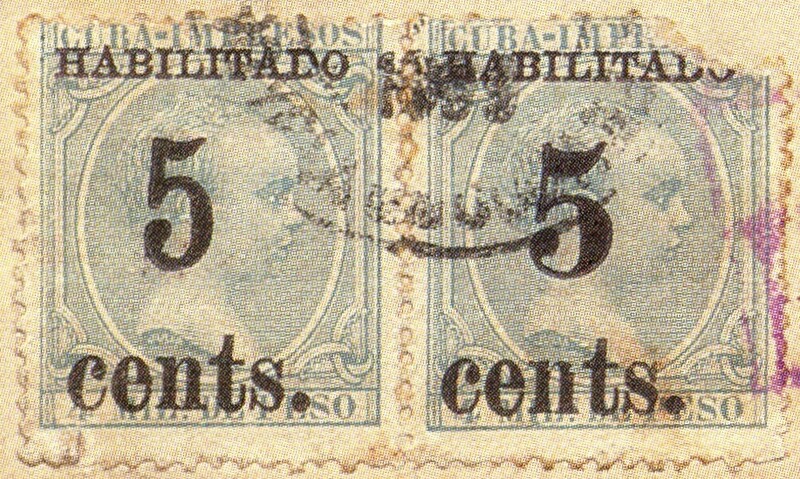 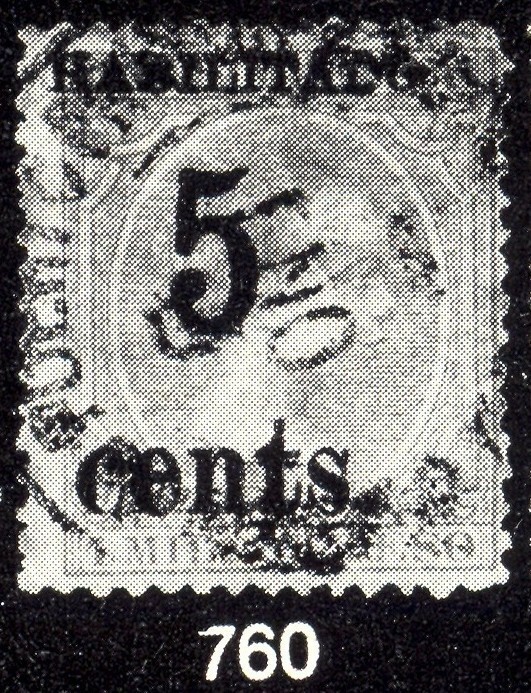 Note: Some Scott 156 (1 milésima orange-brown issue of 1898) stamps were overprinted in the fifth printing with the numeral 5. 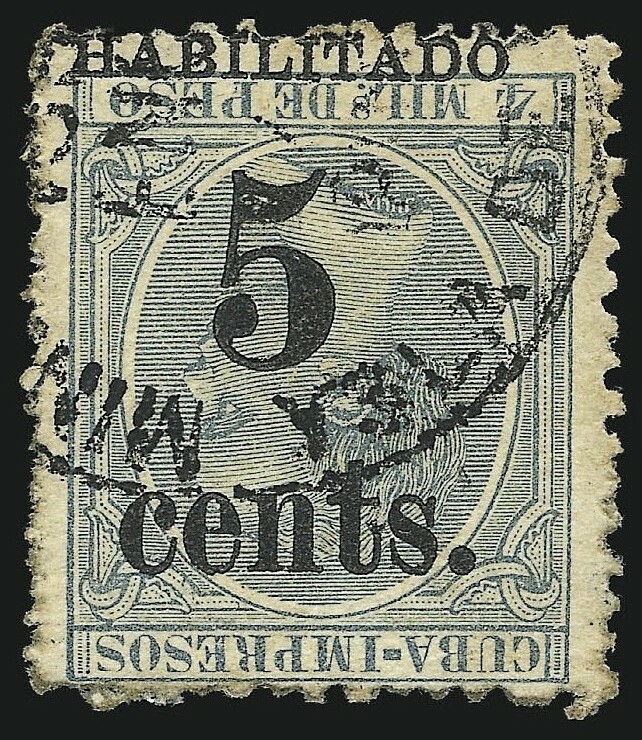 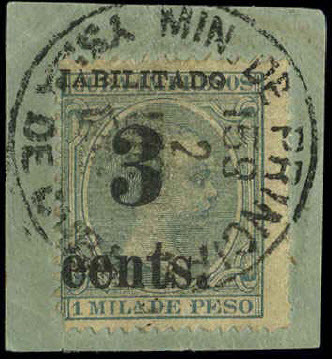 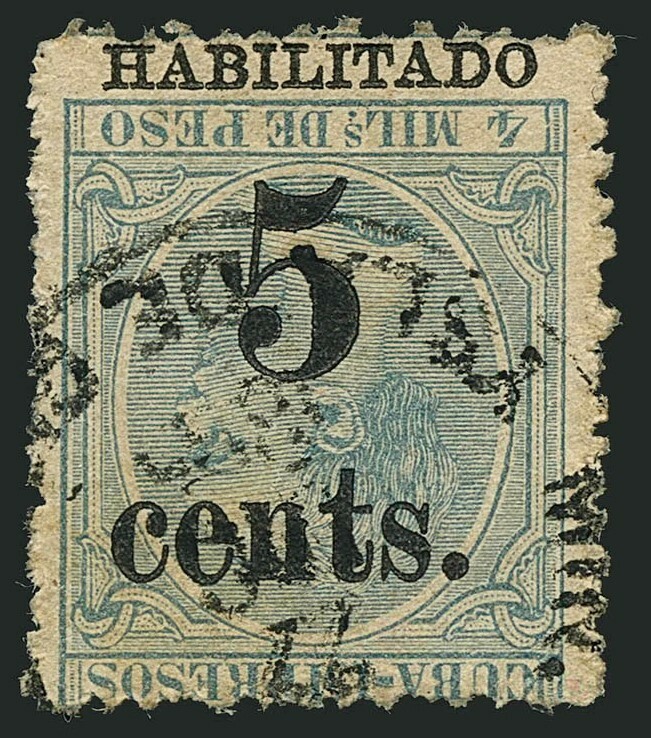 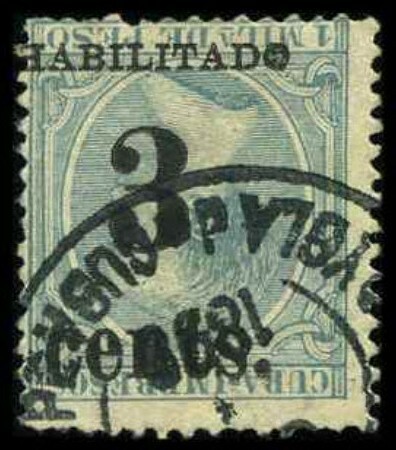 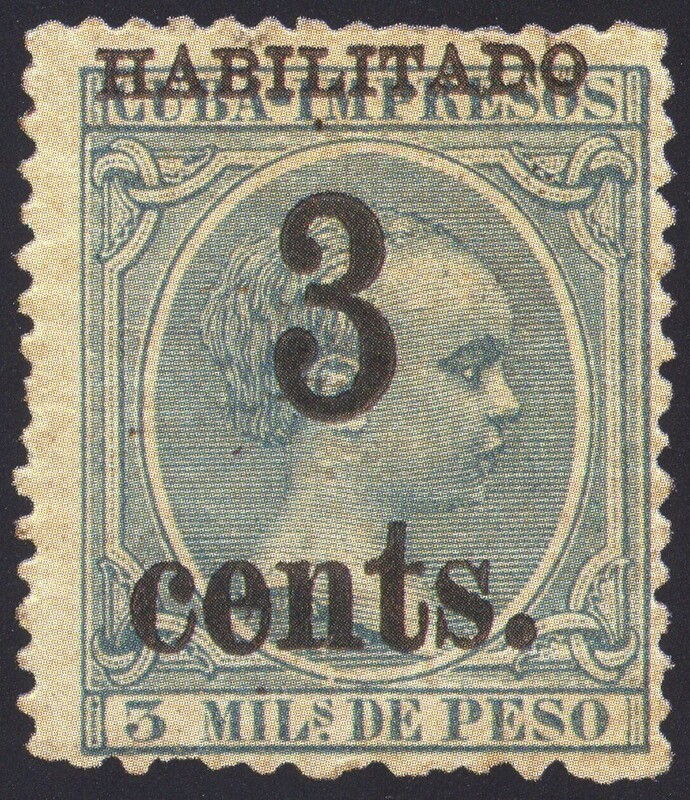 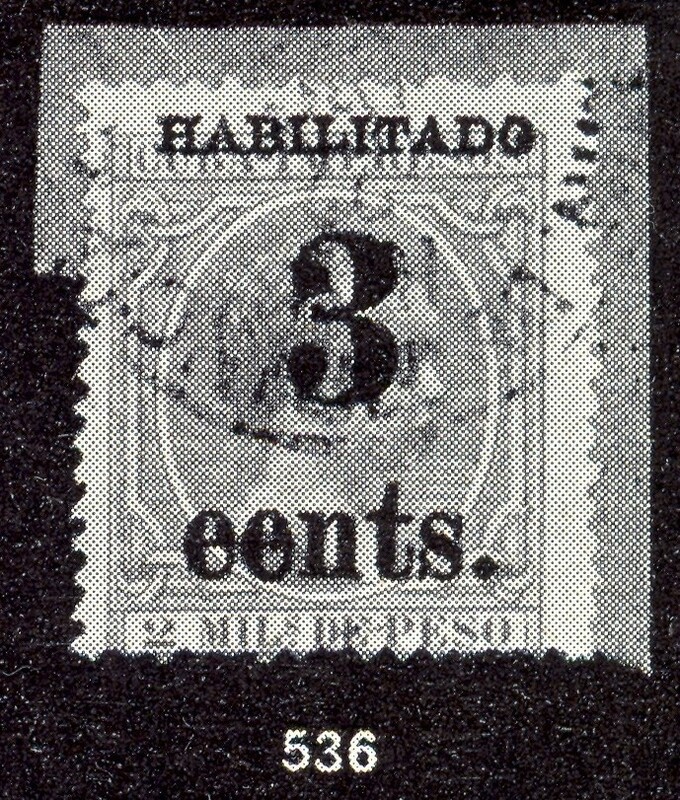 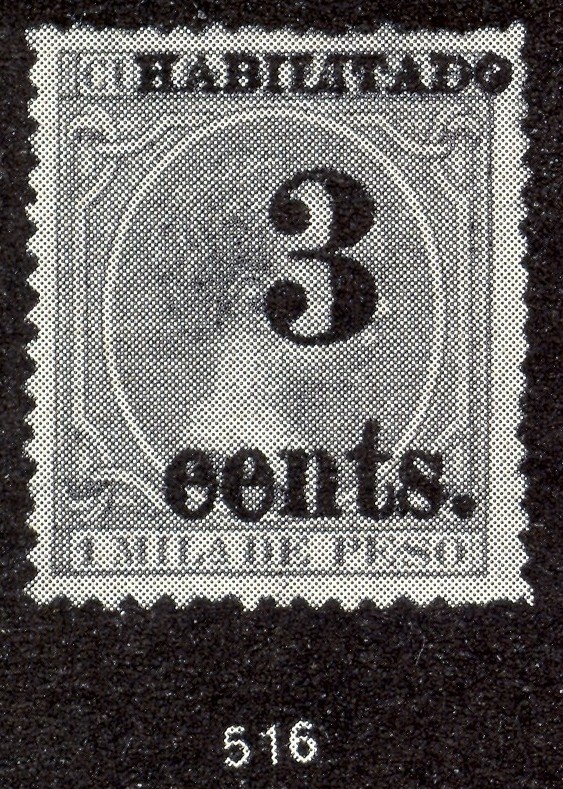 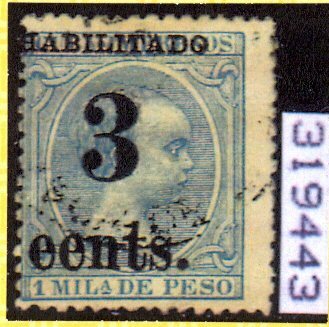 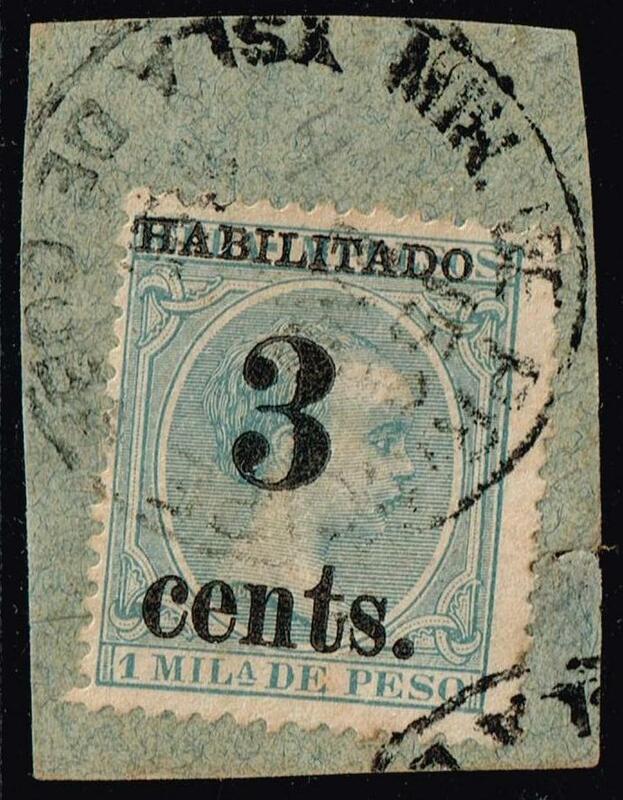 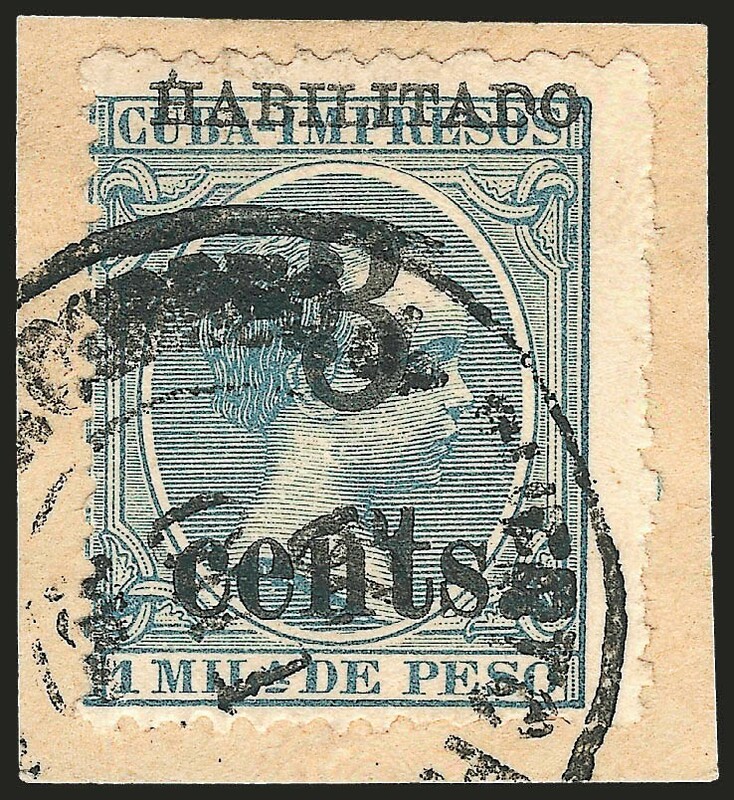 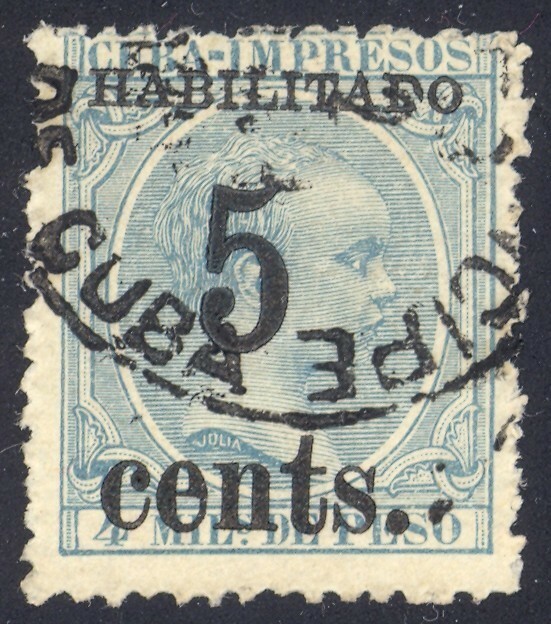 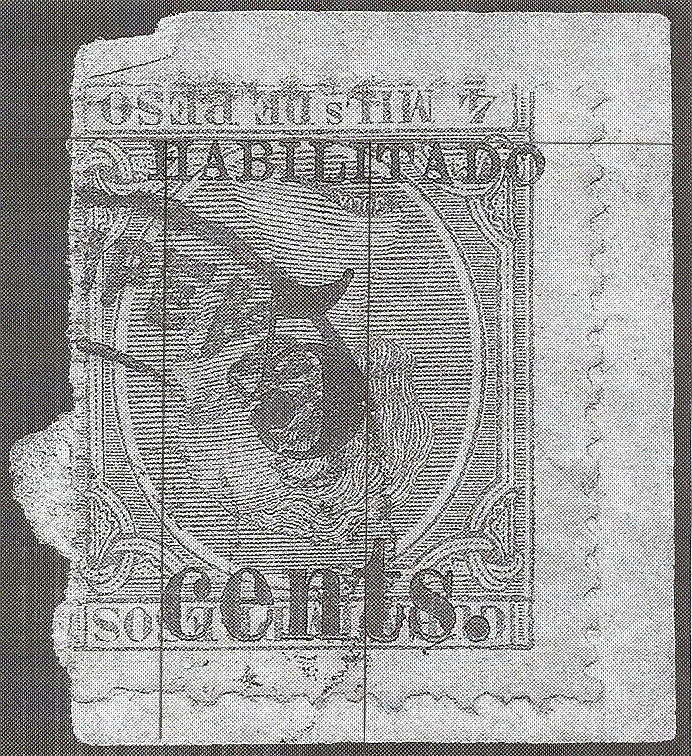 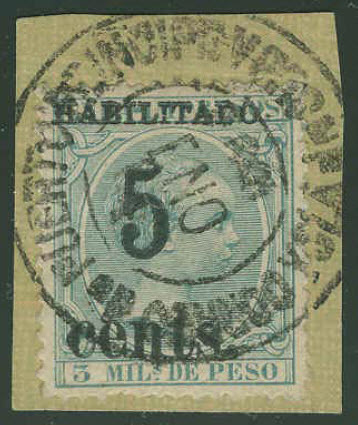 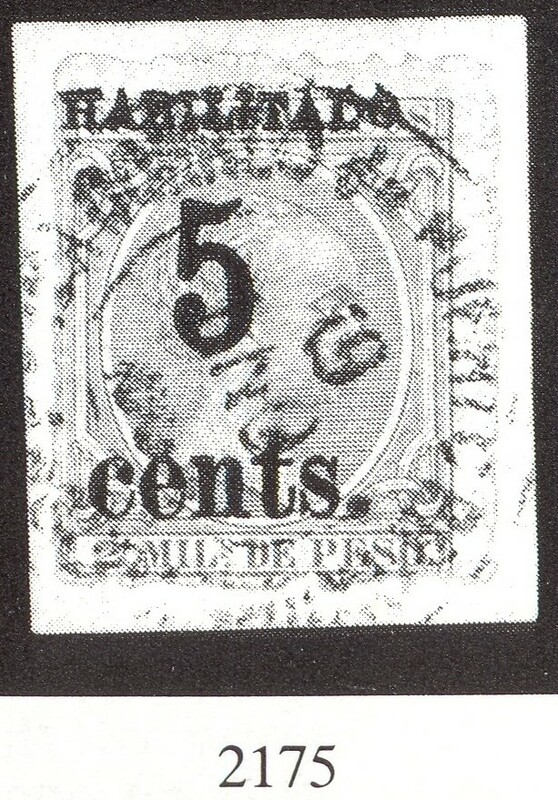 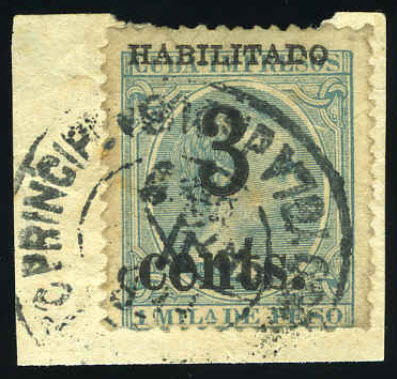 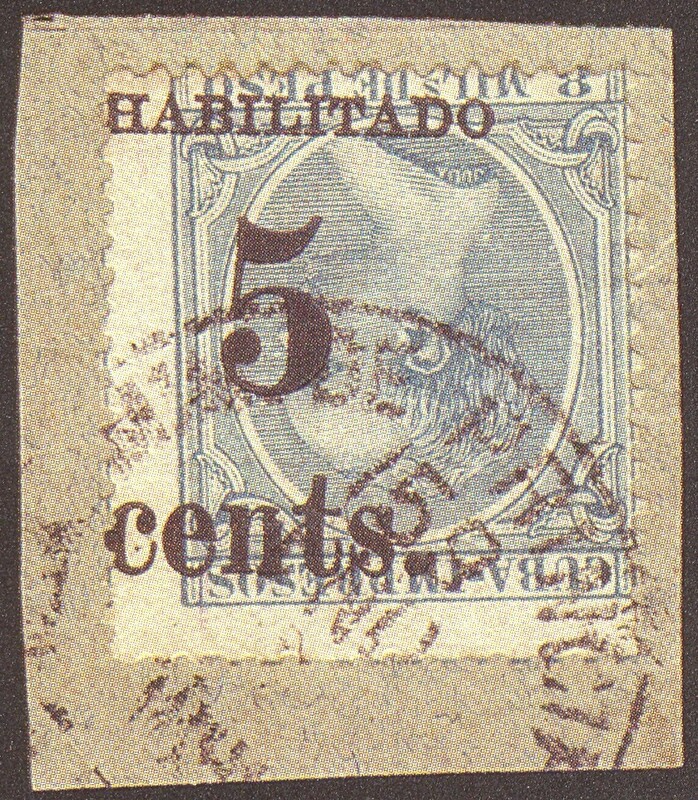 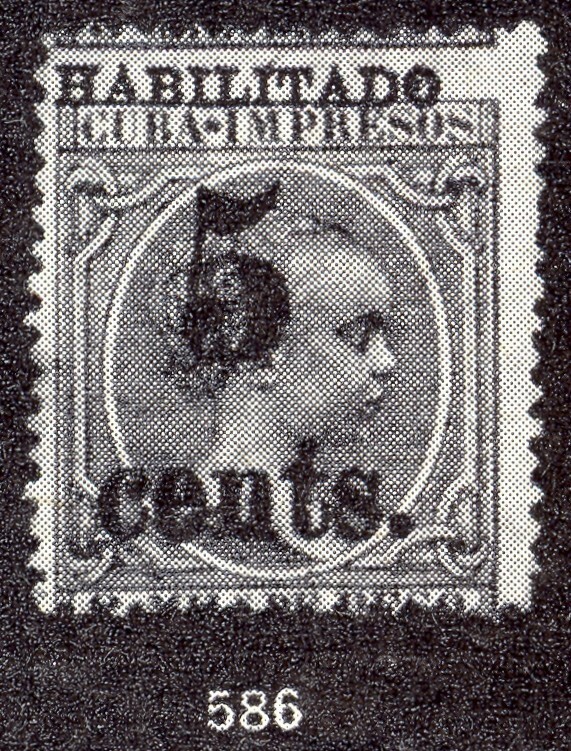 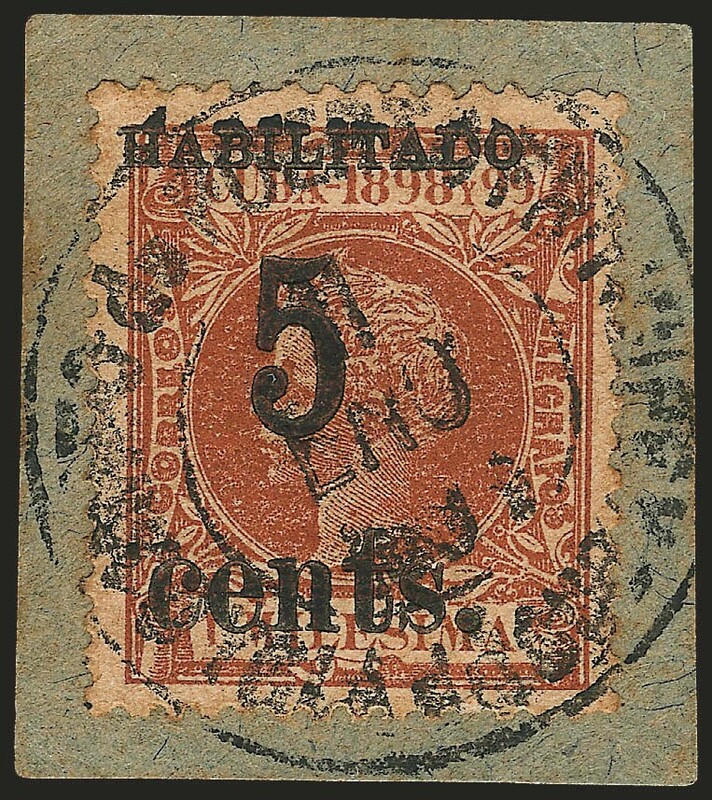 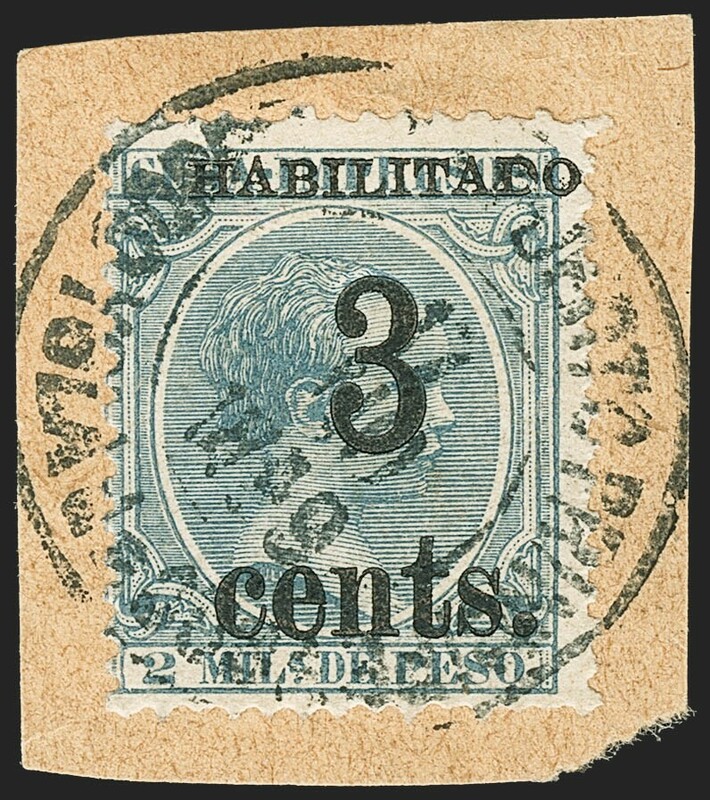 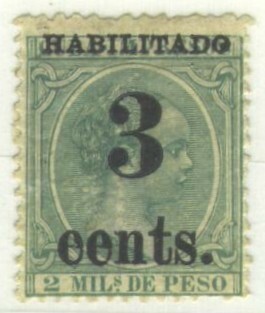 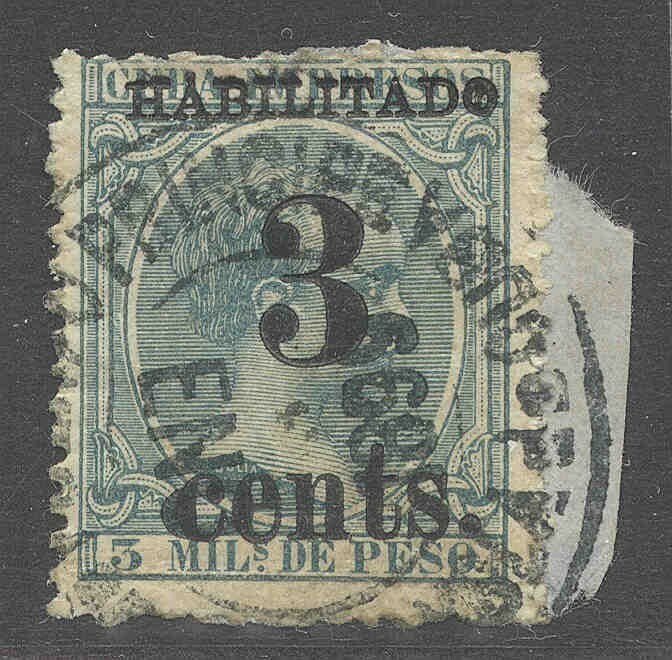 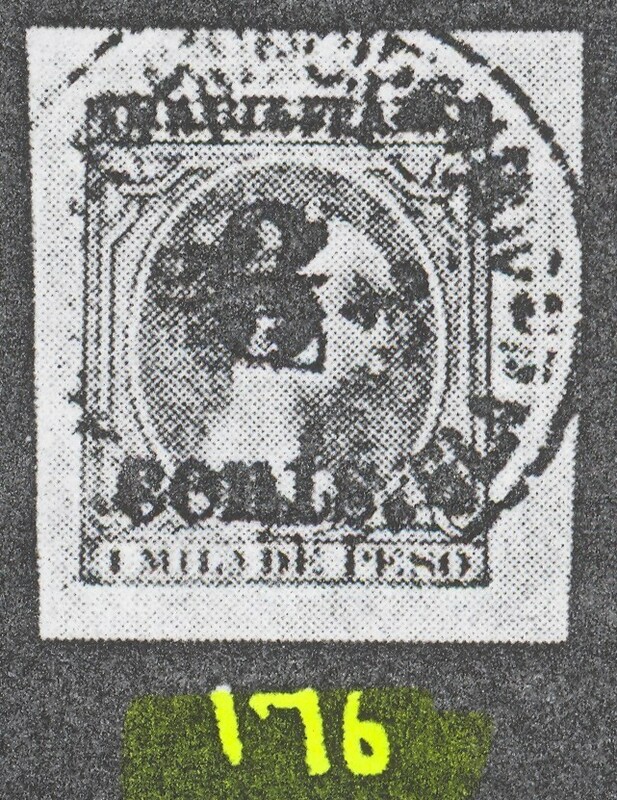 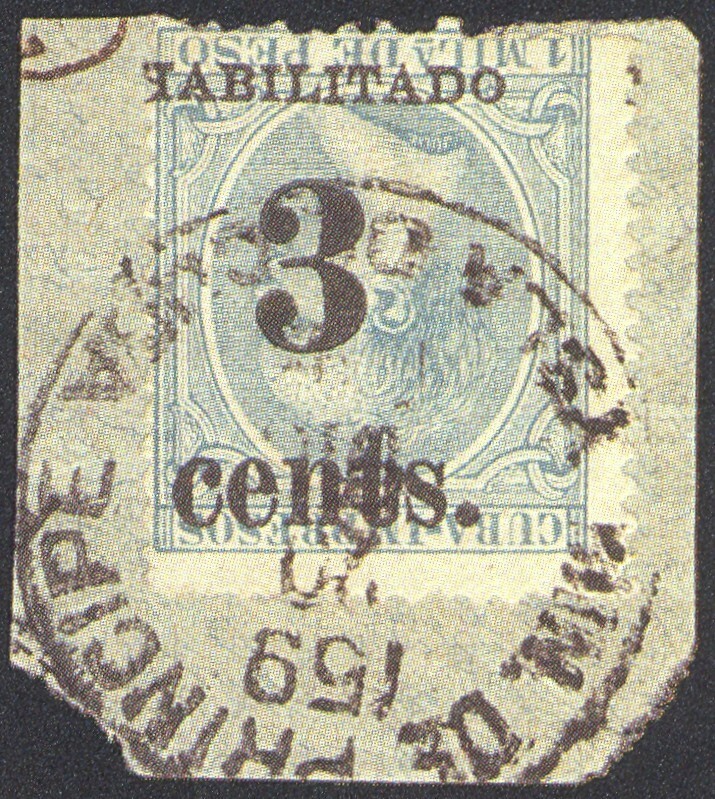 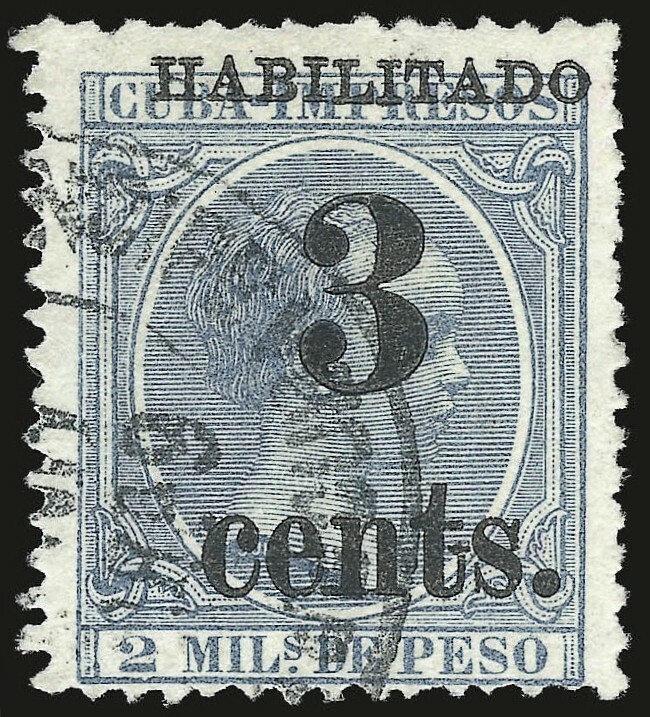 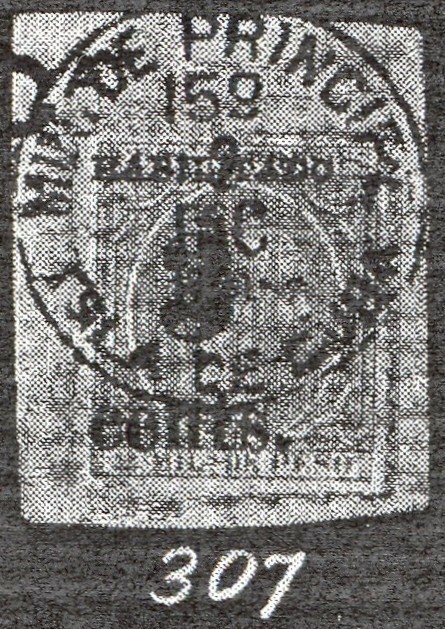 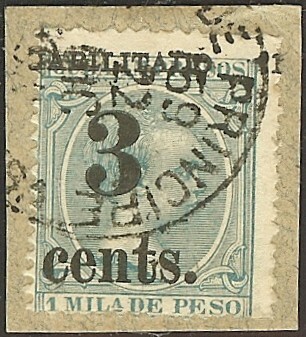 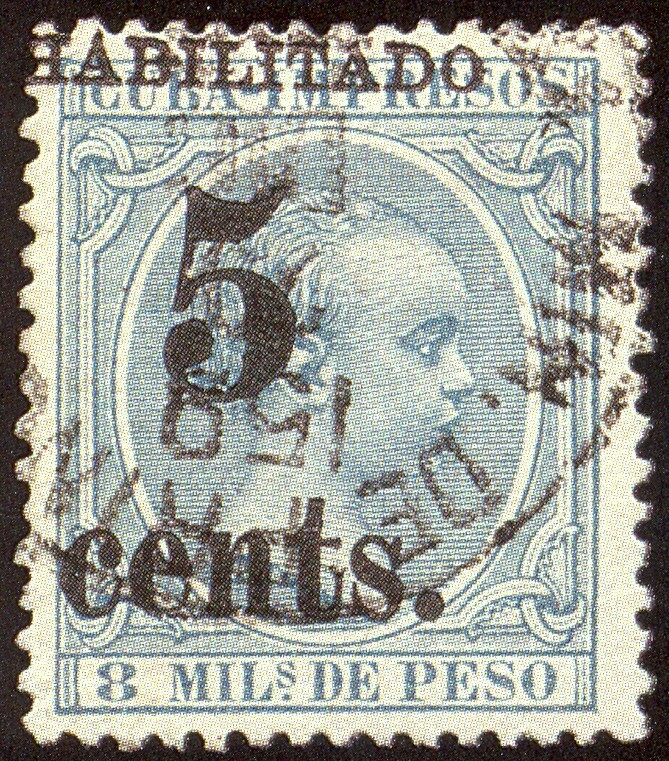 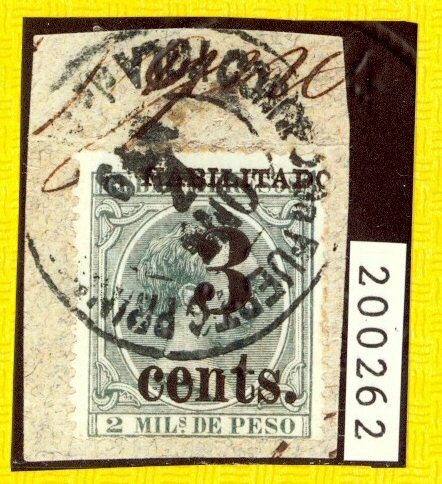 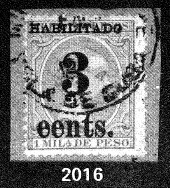 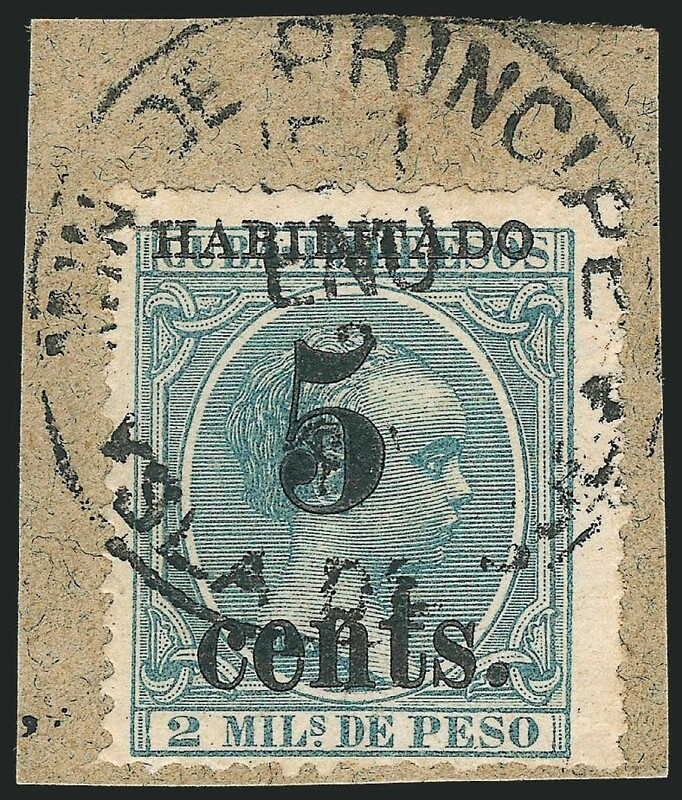 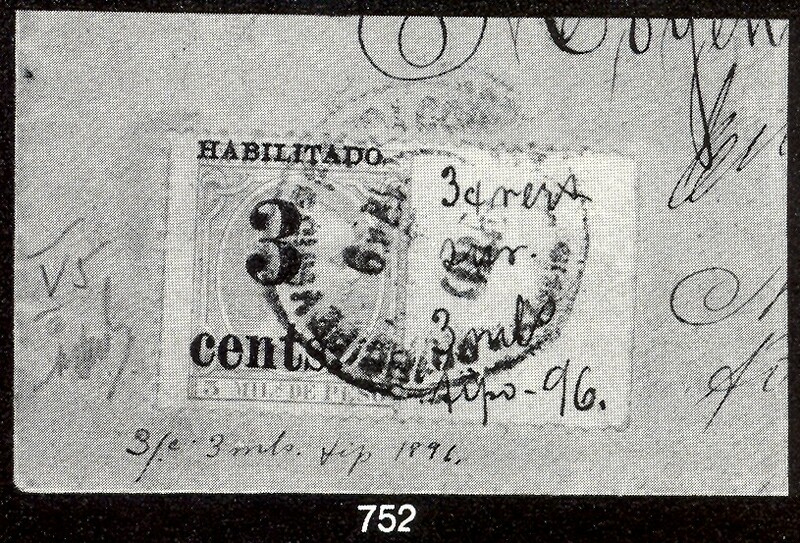 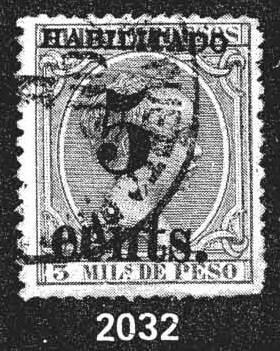 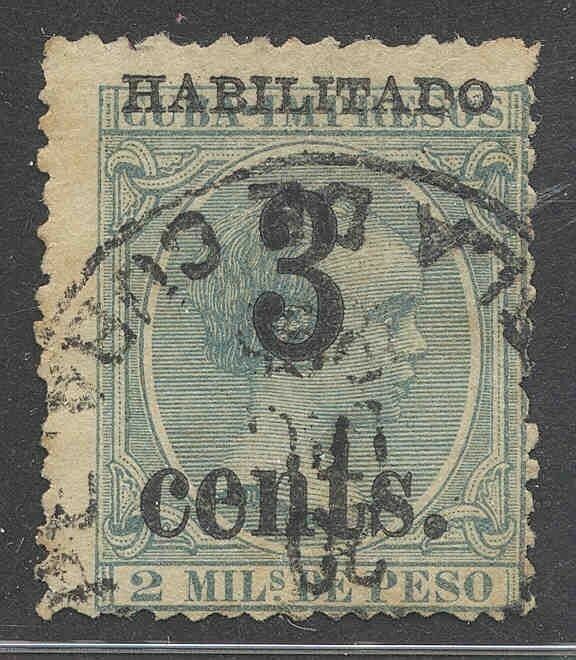 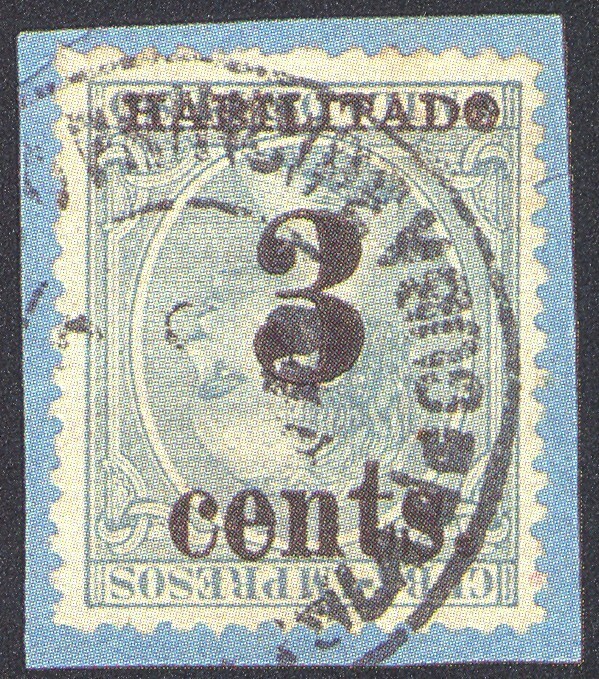 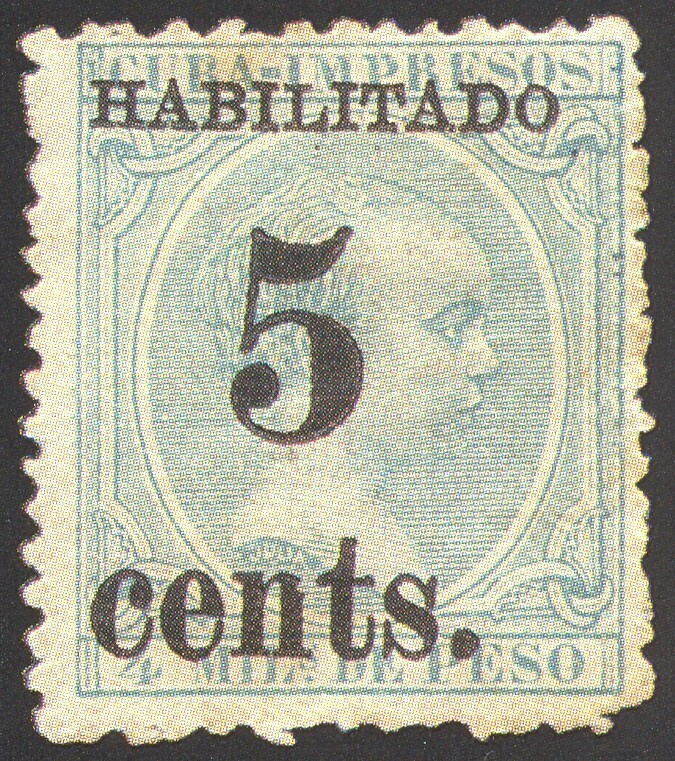 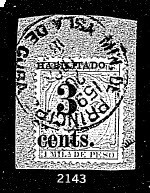 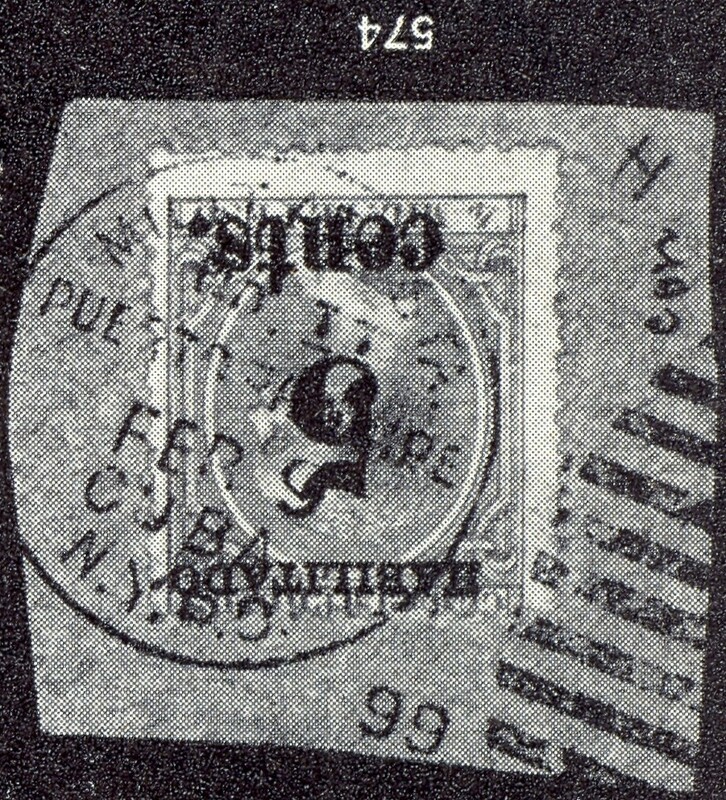 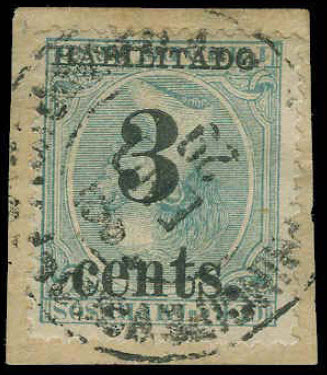 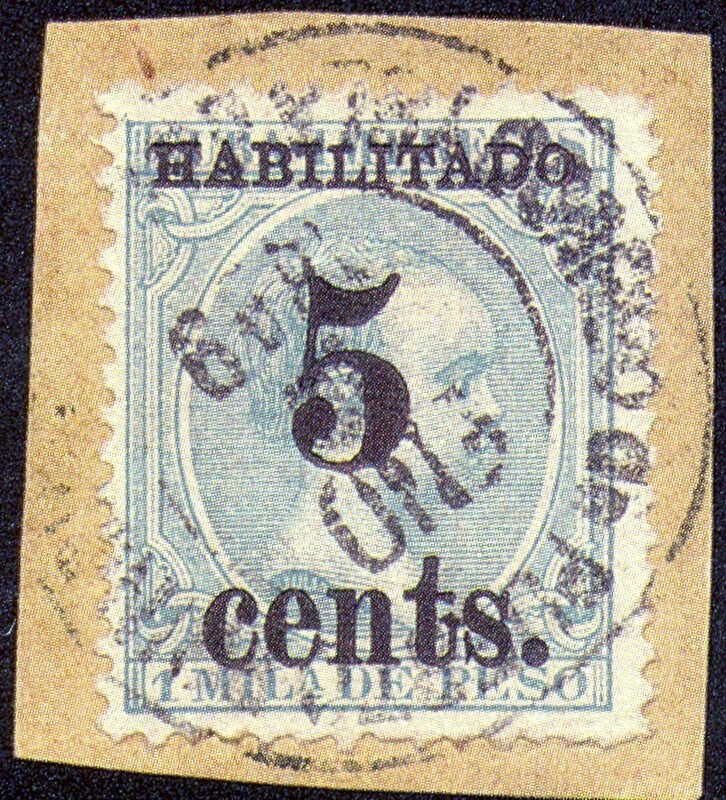 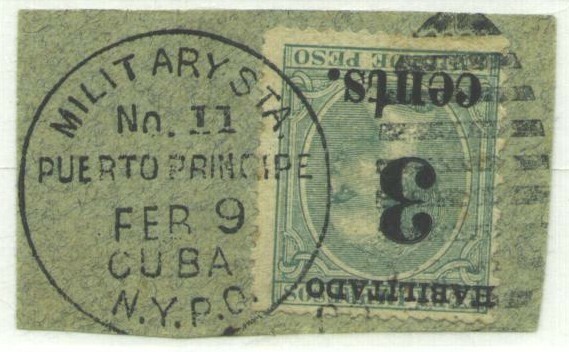 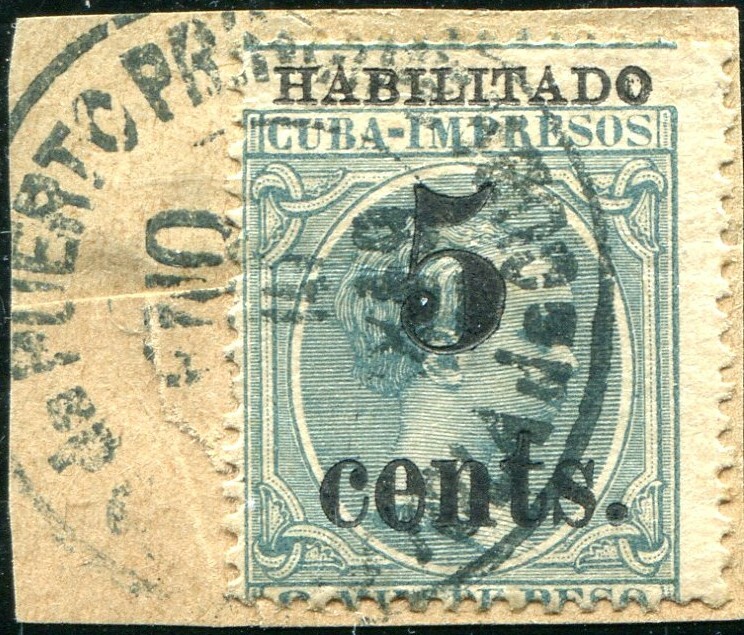 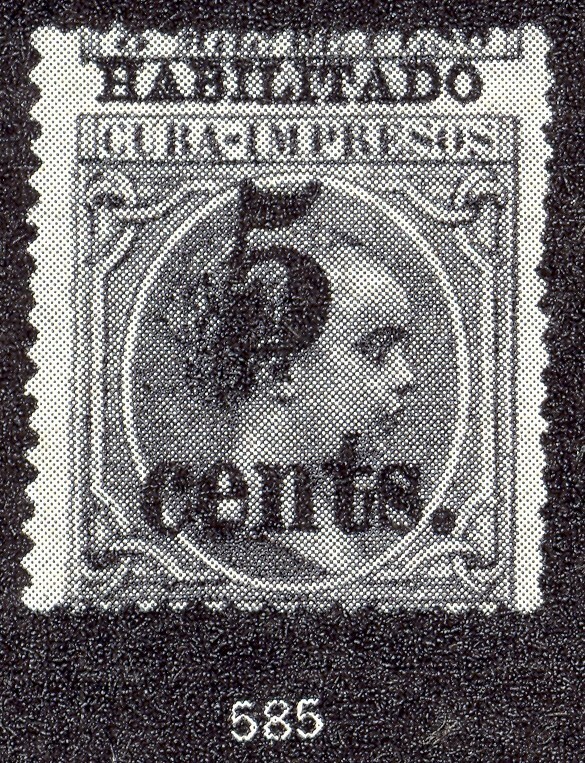 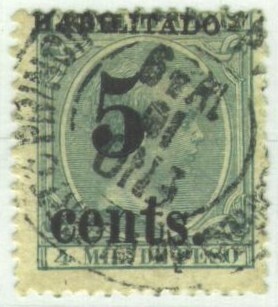 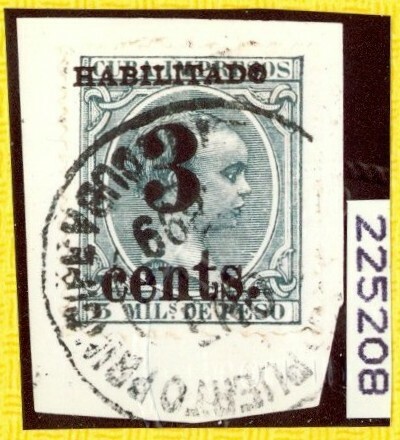 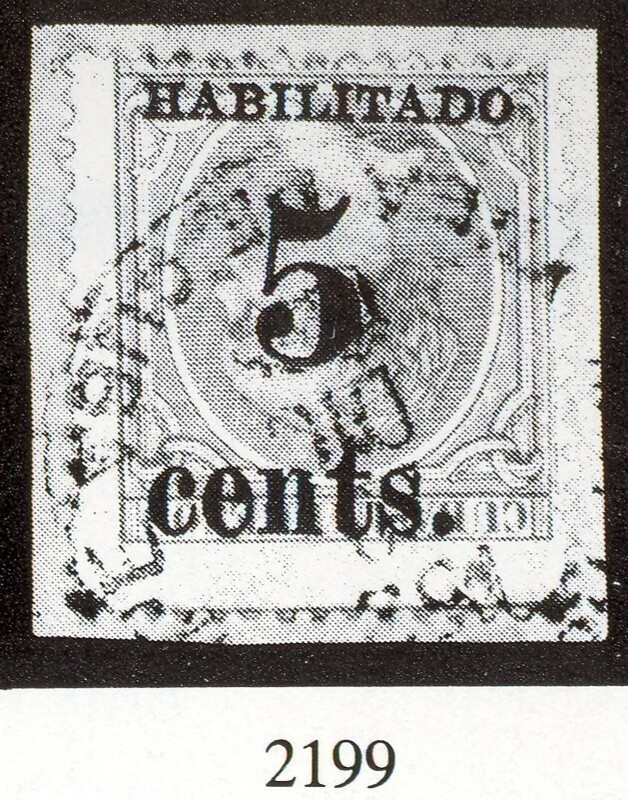 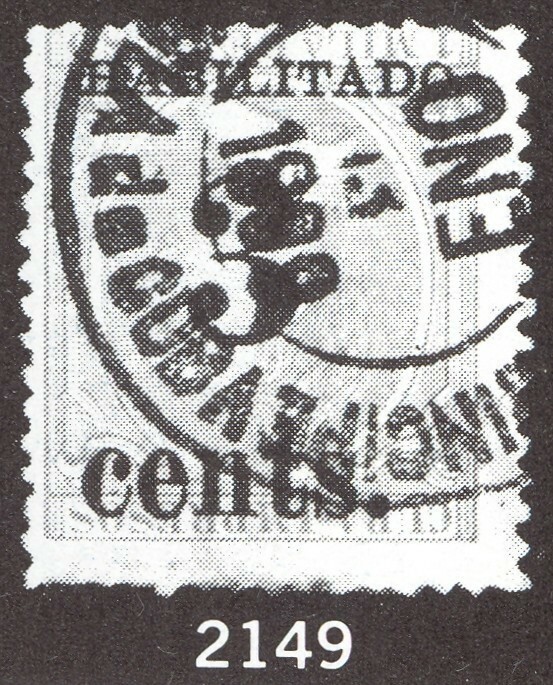 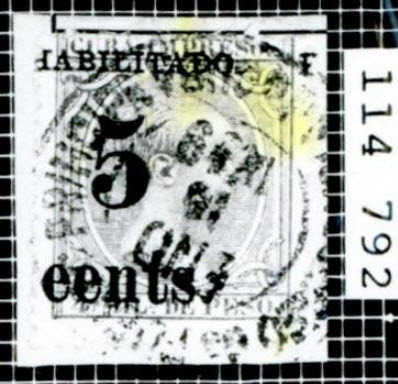 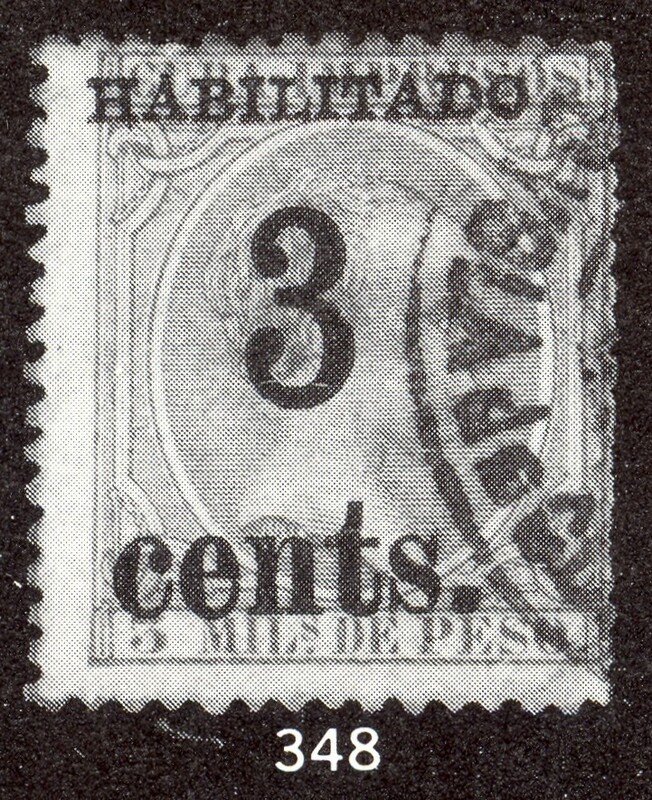 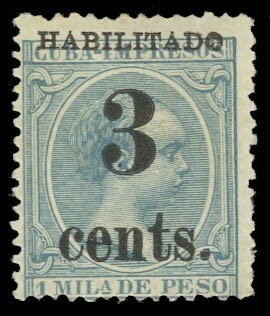 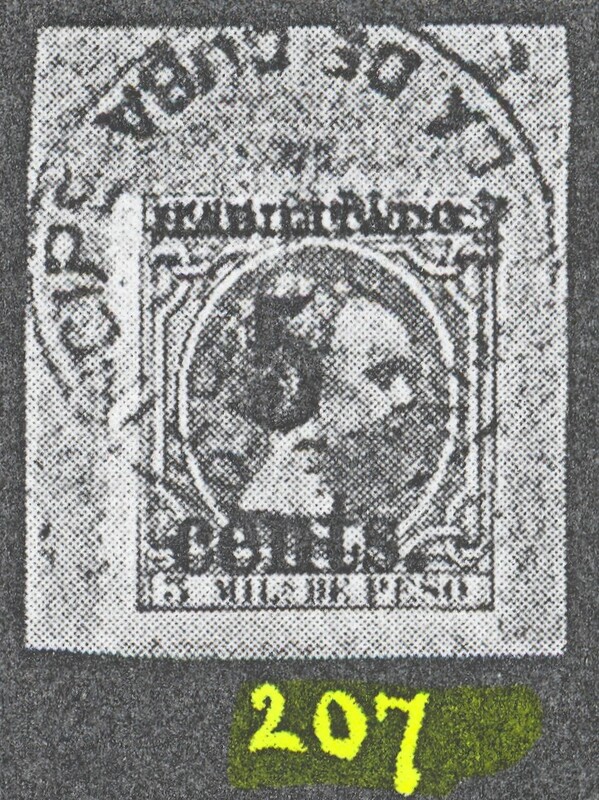 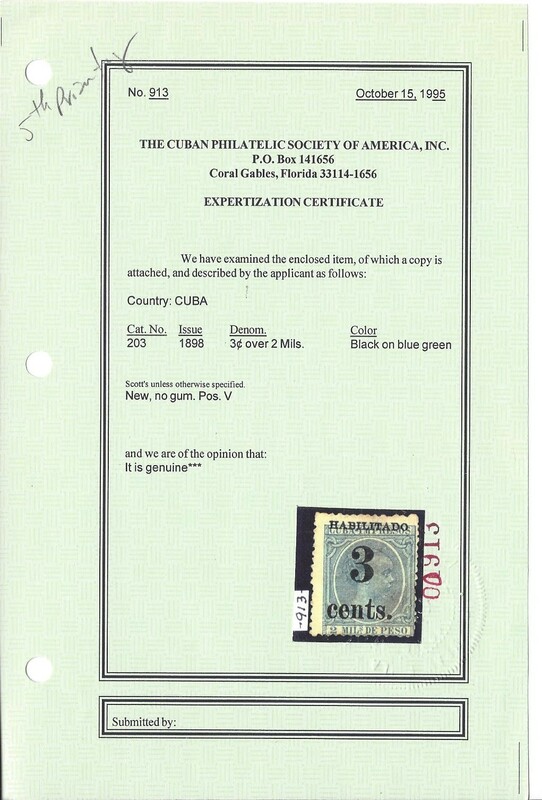 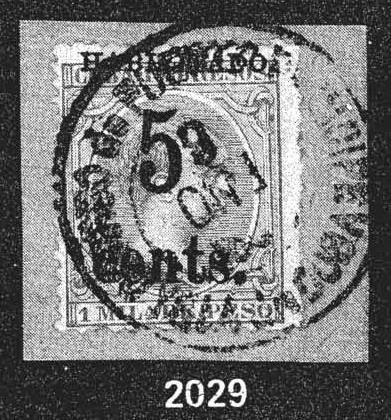 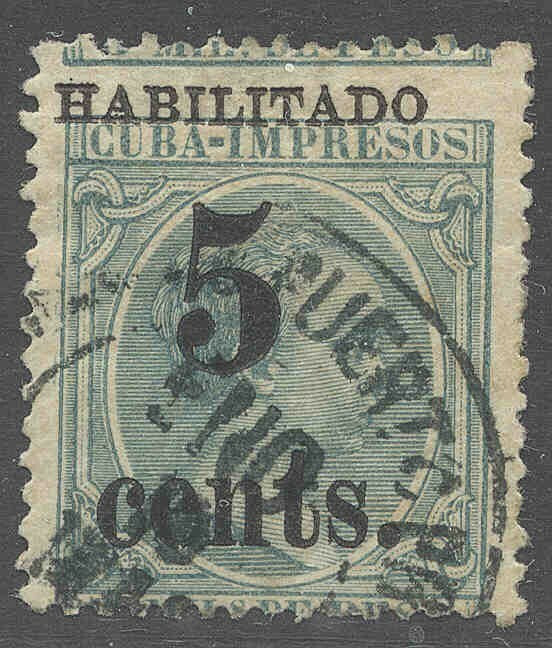 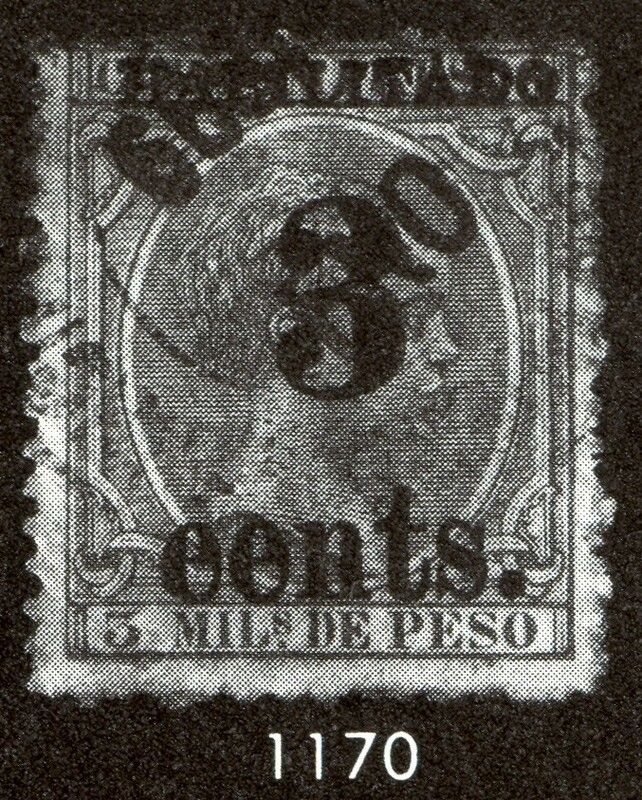 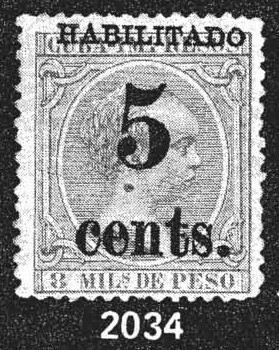 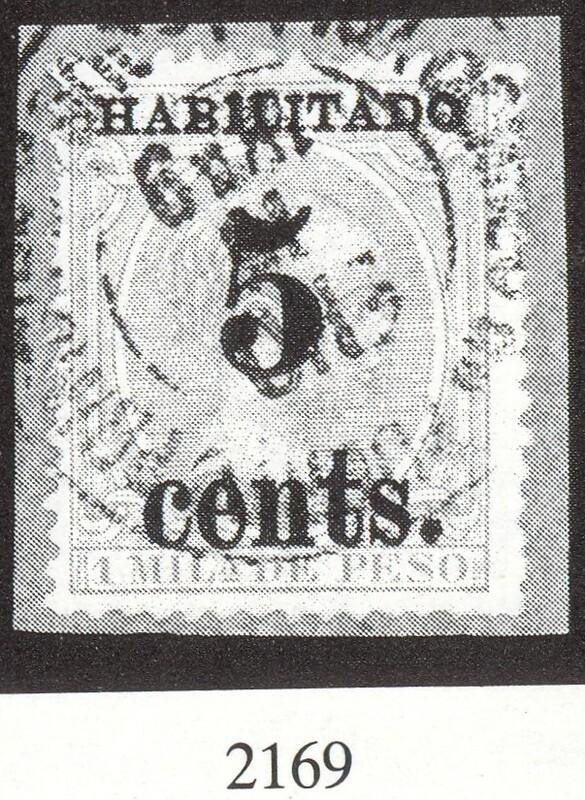 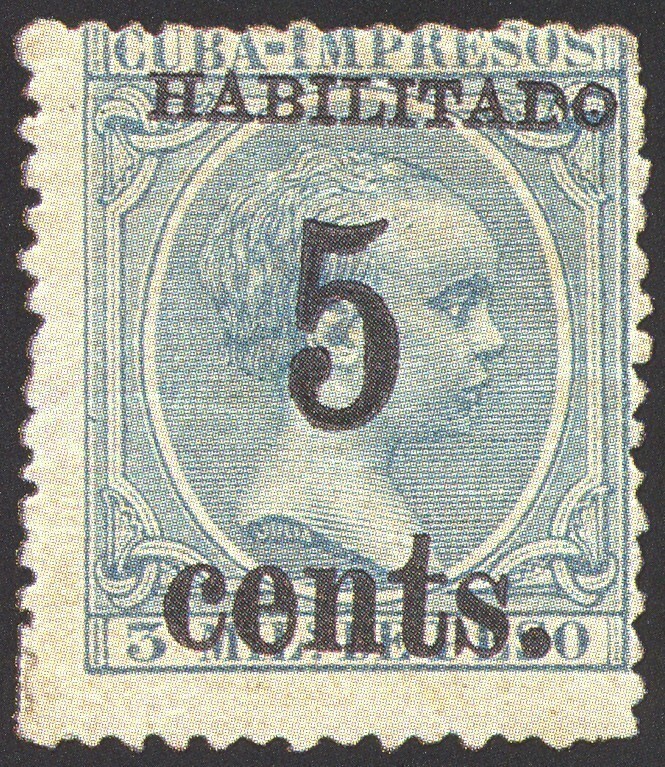 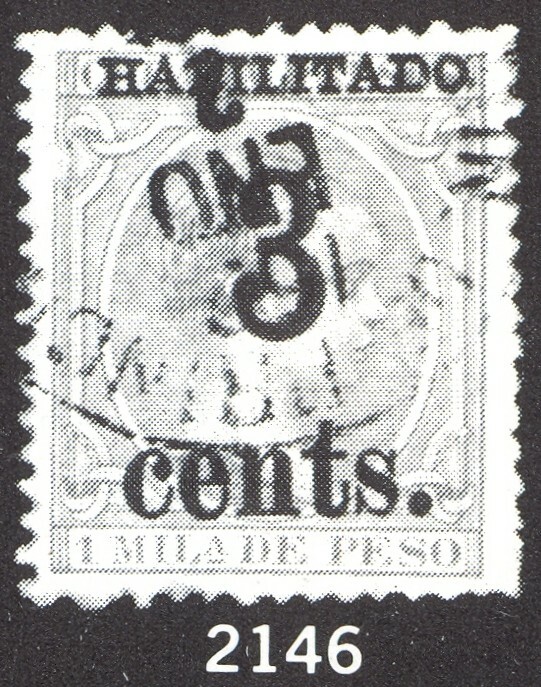 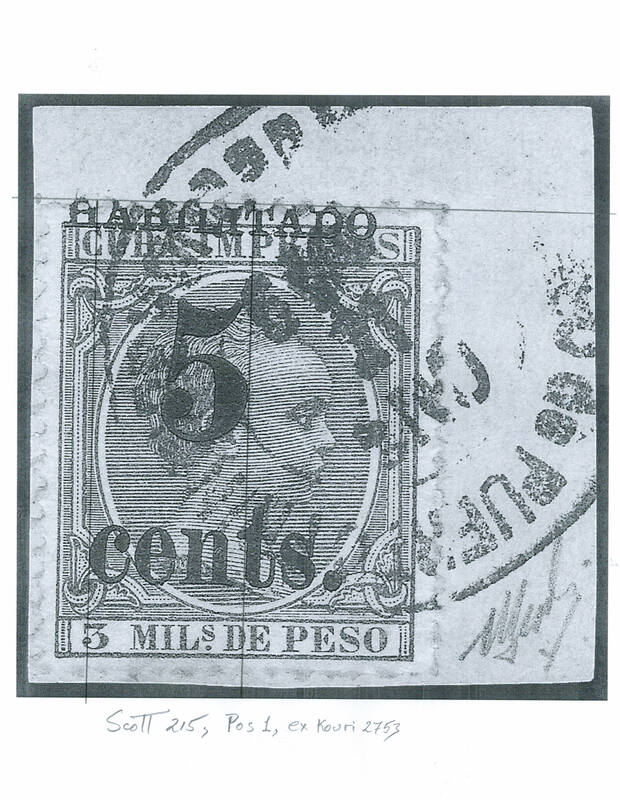 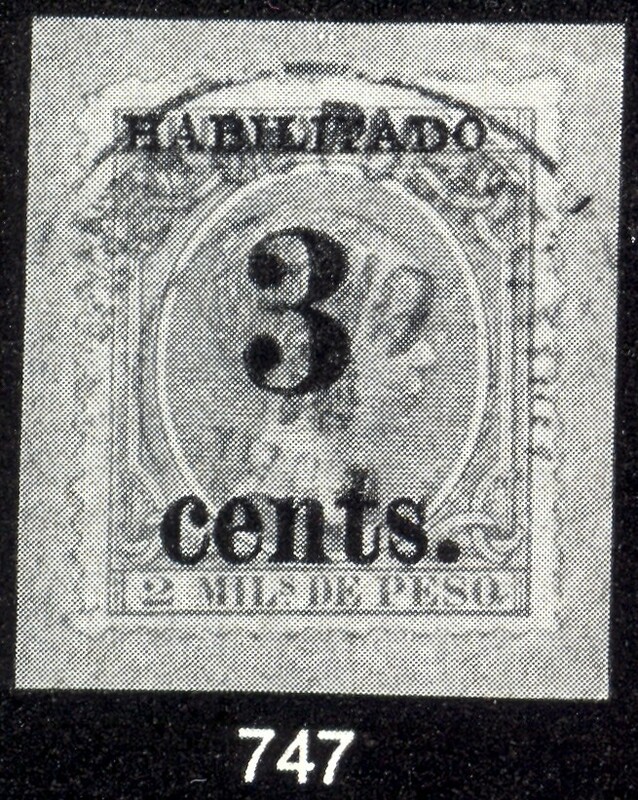 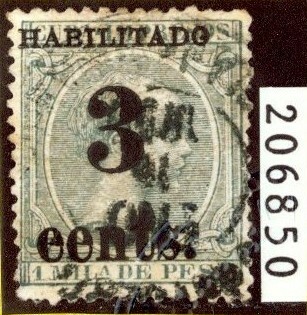 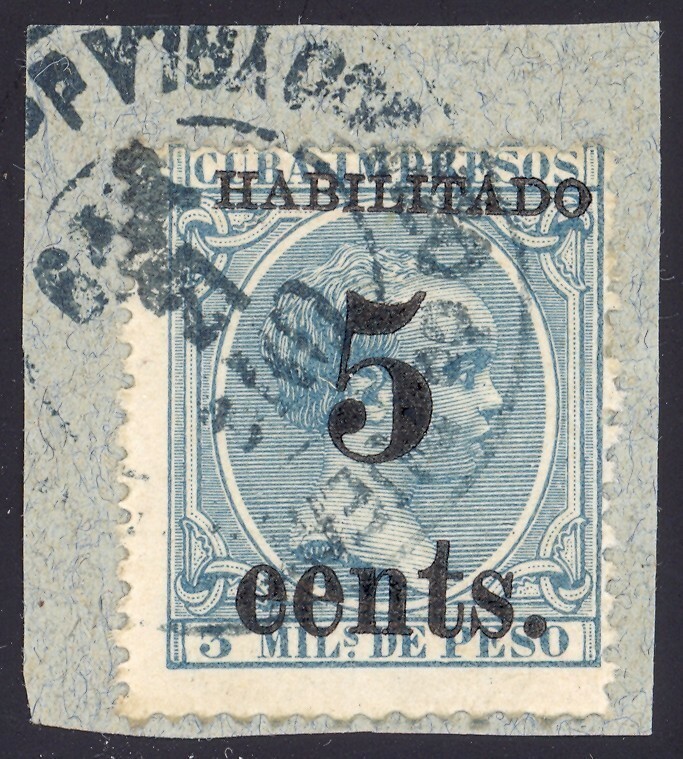 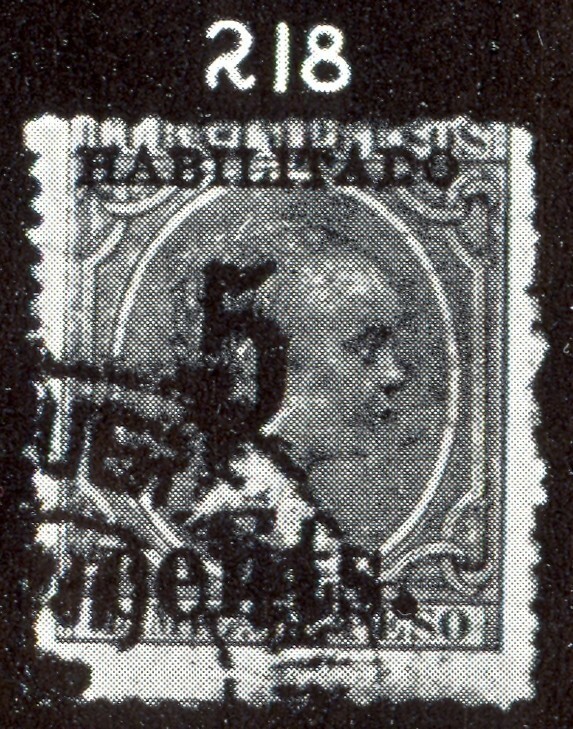 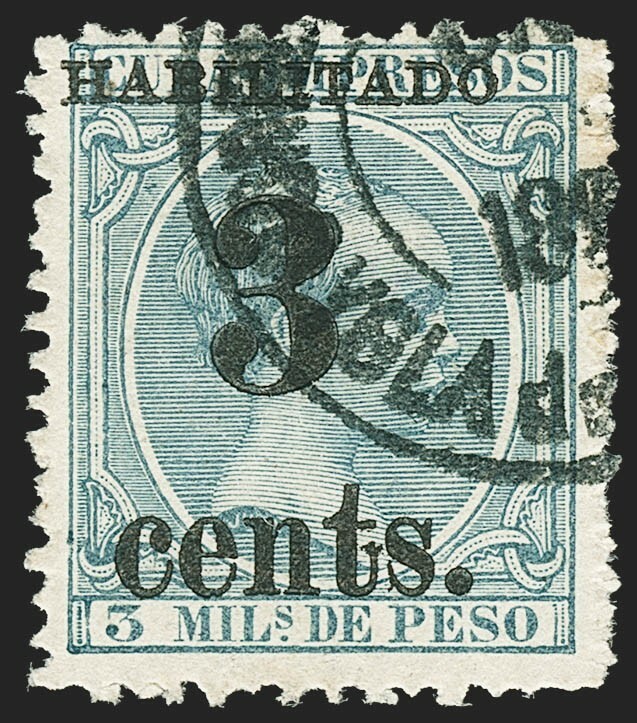 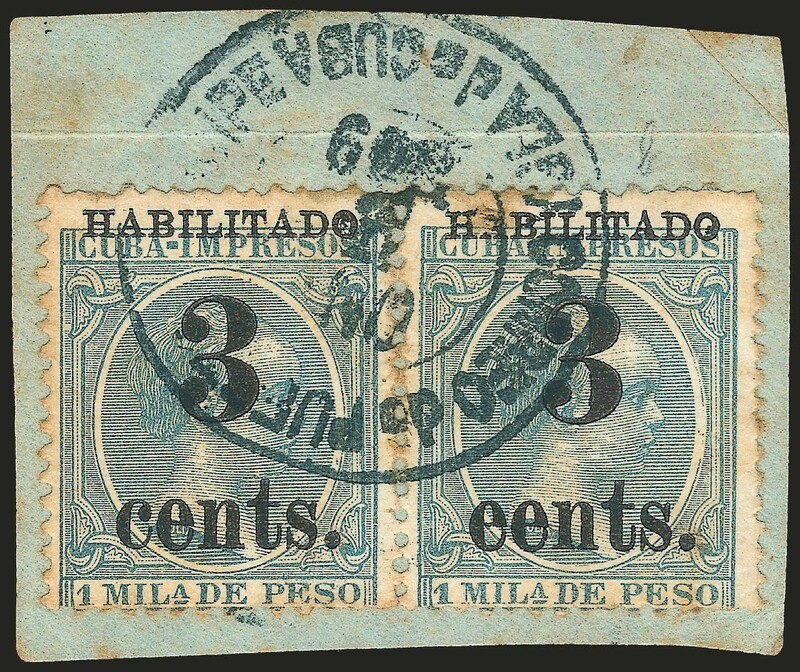 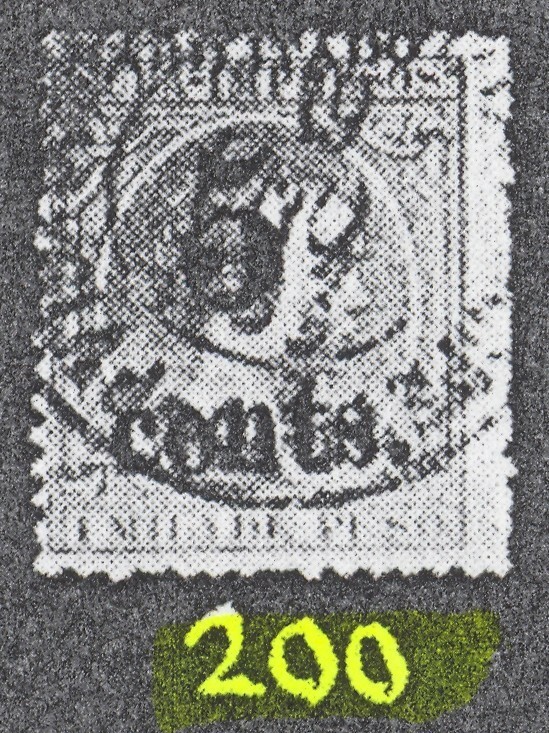 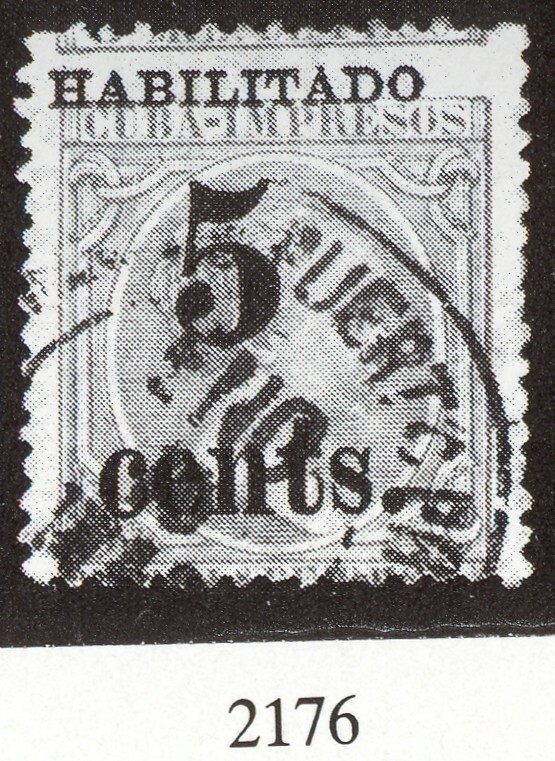 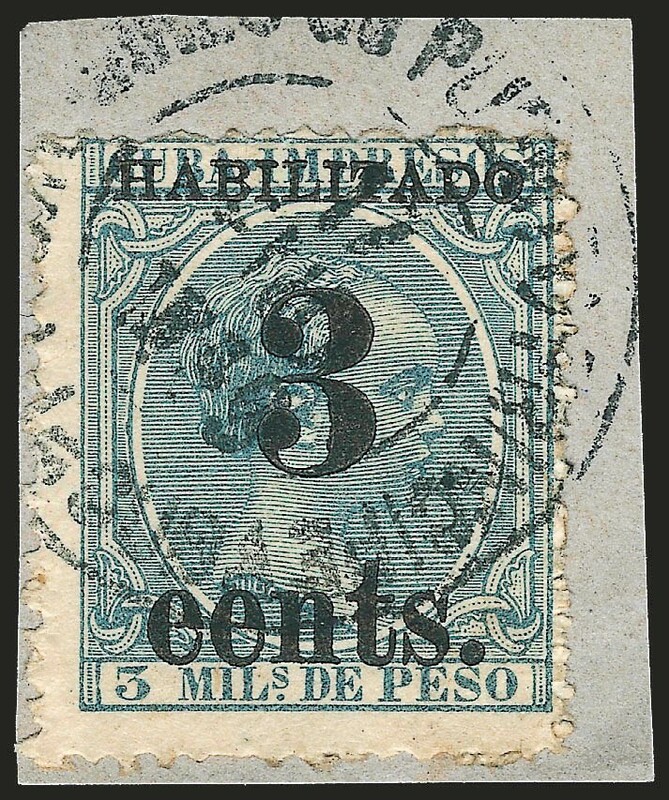 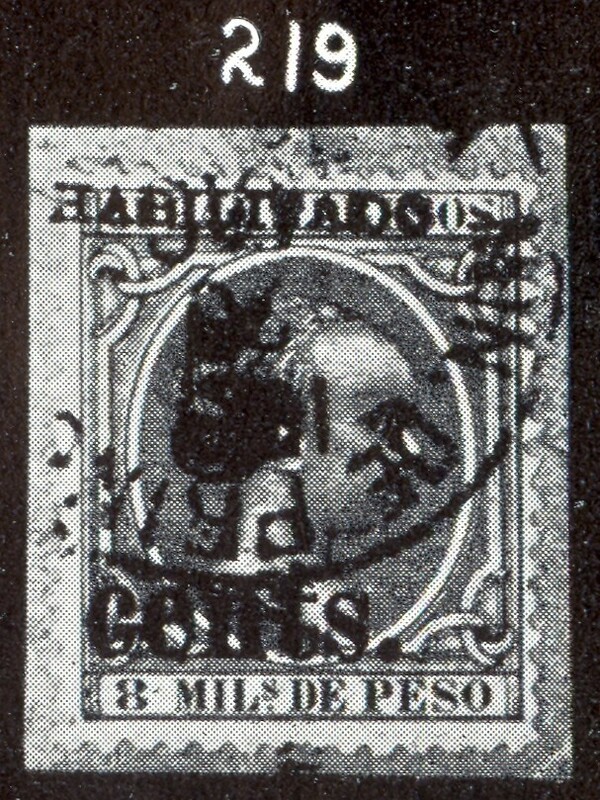 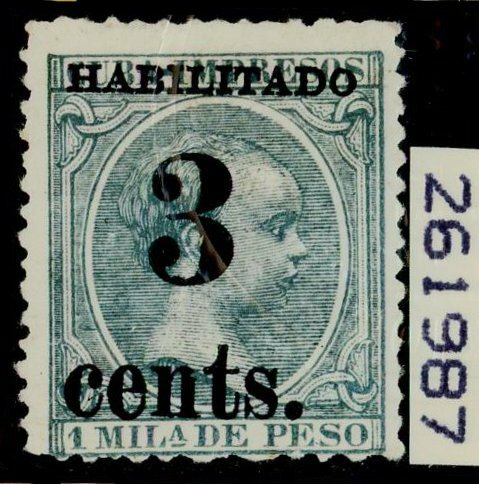 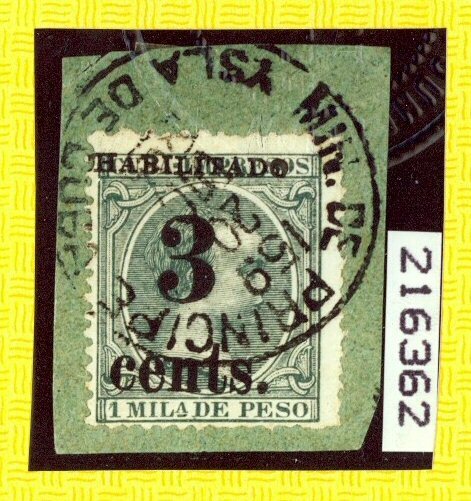 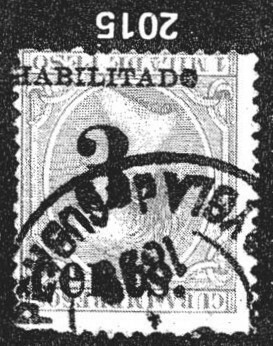 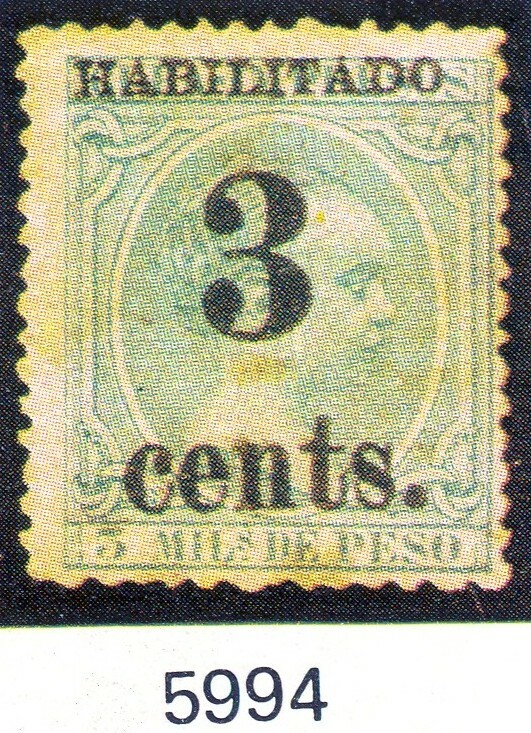 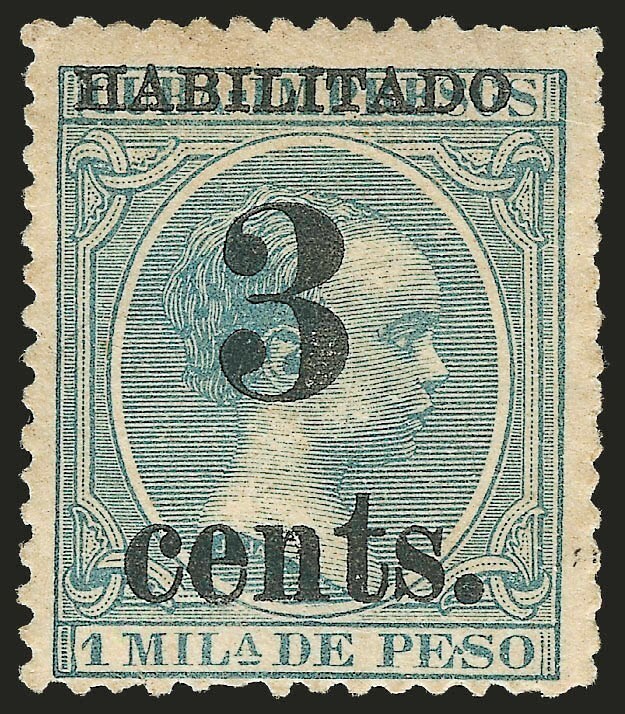 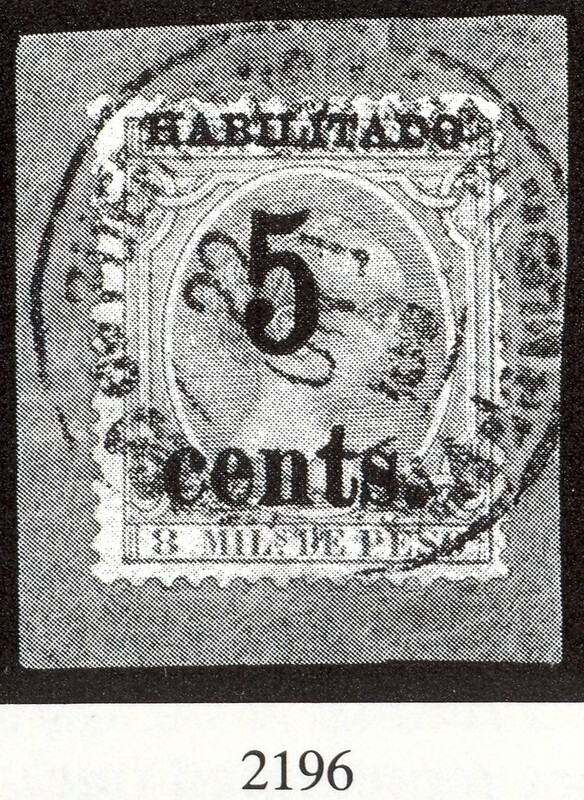 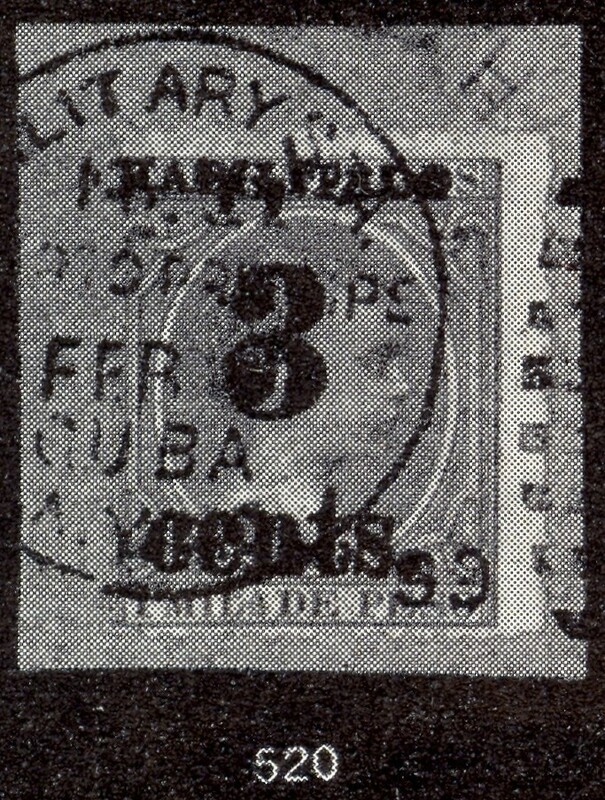 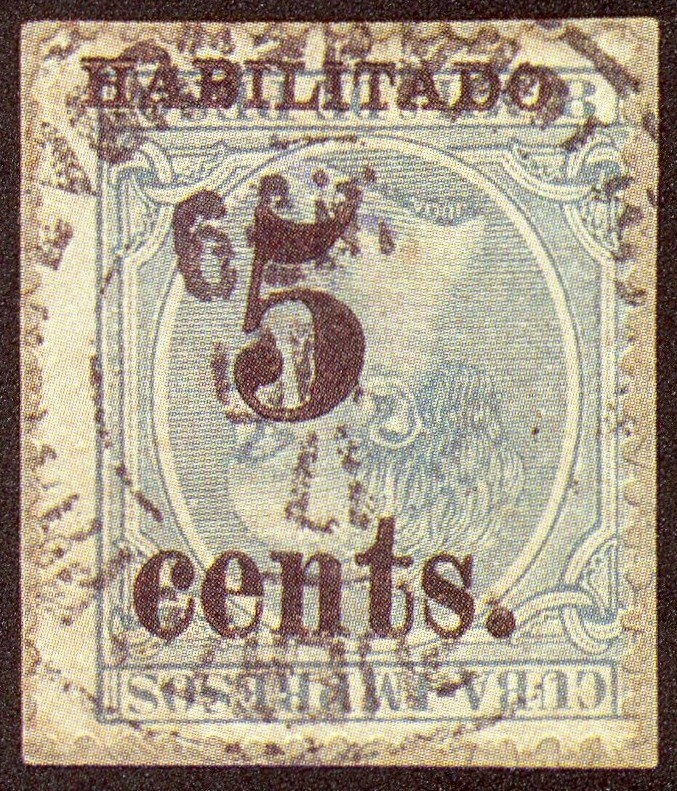 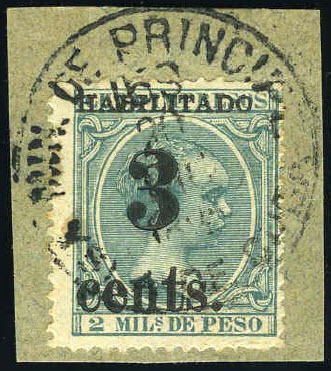 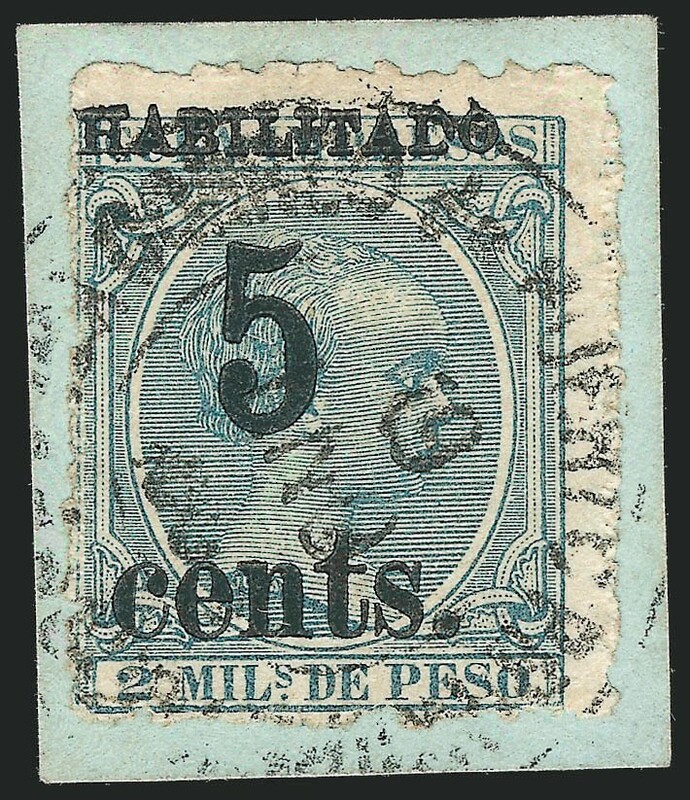 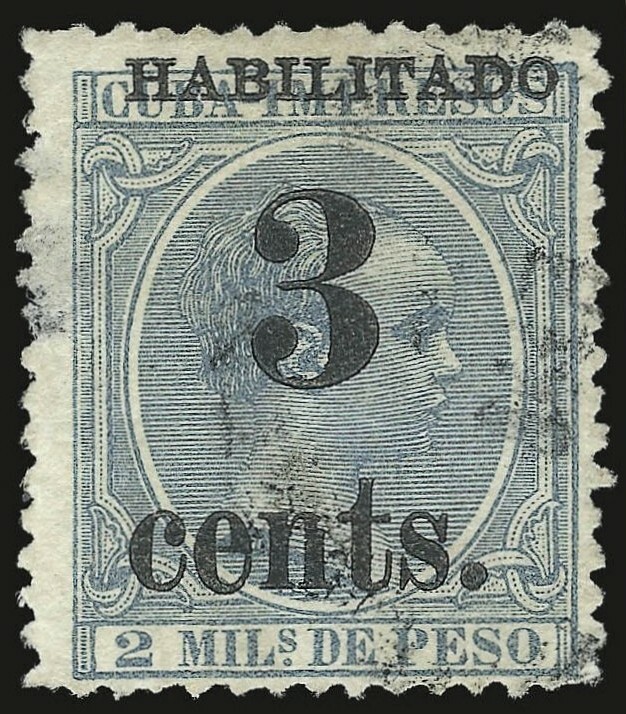 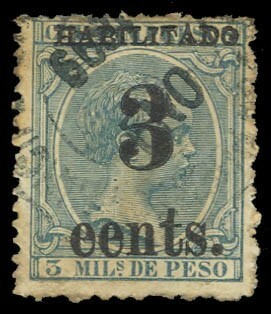 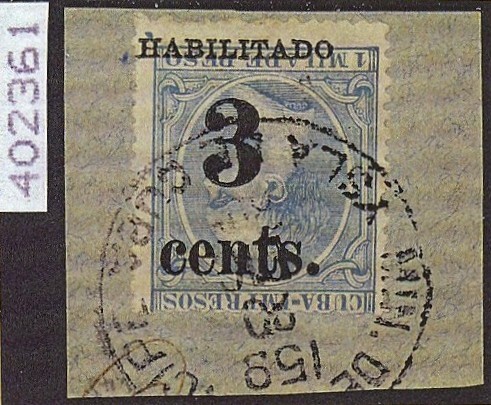 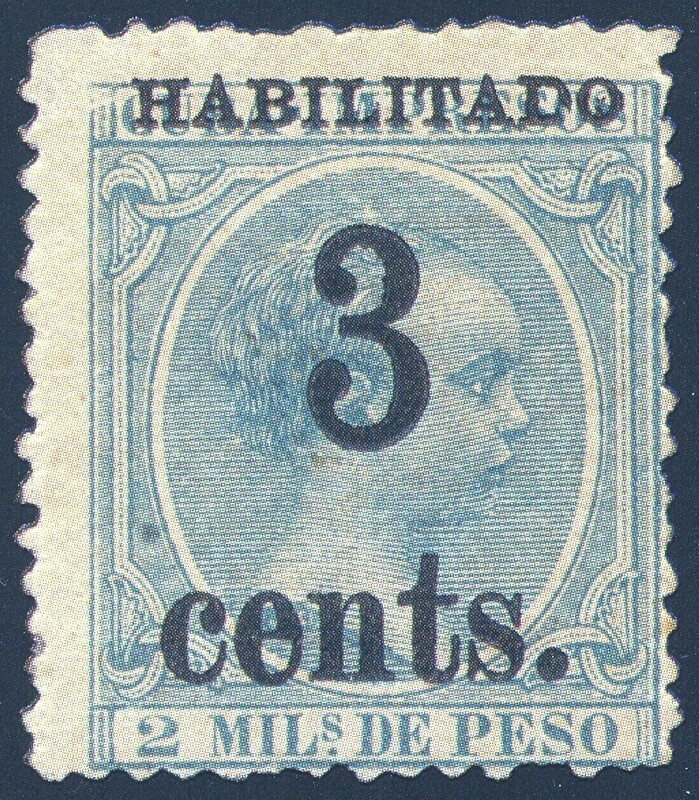 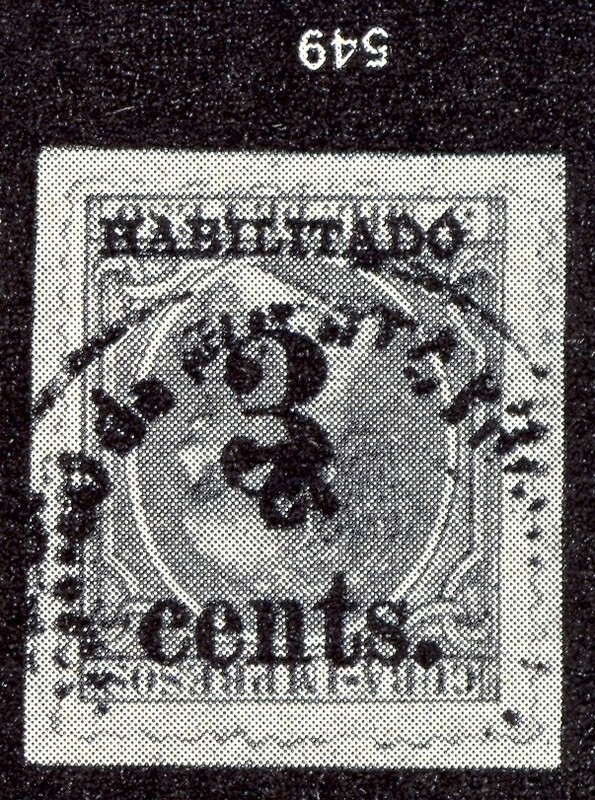 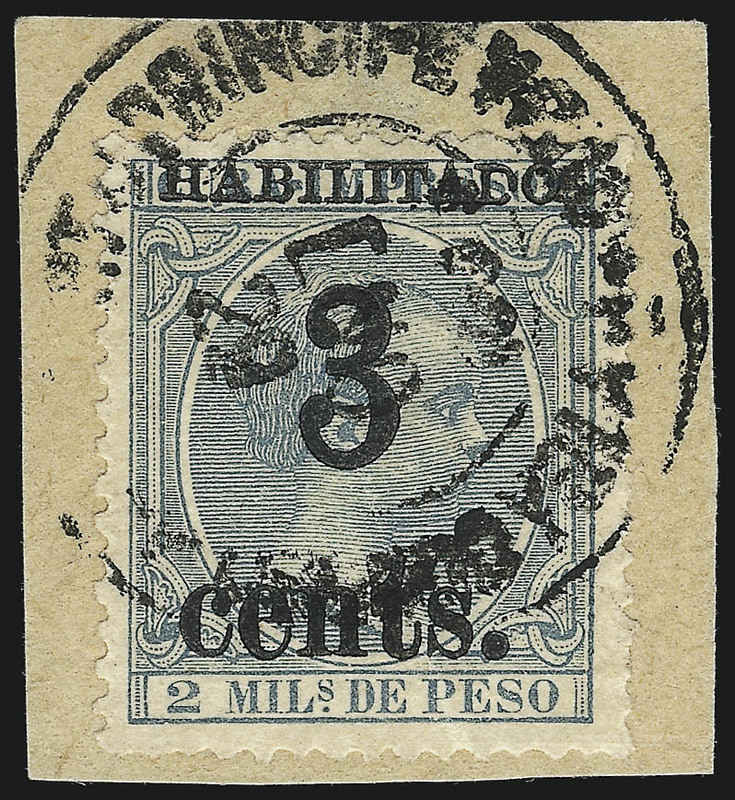 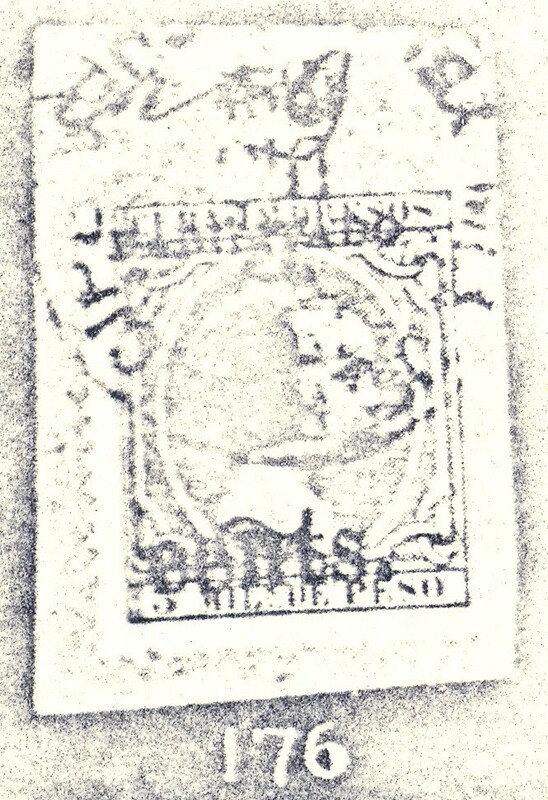 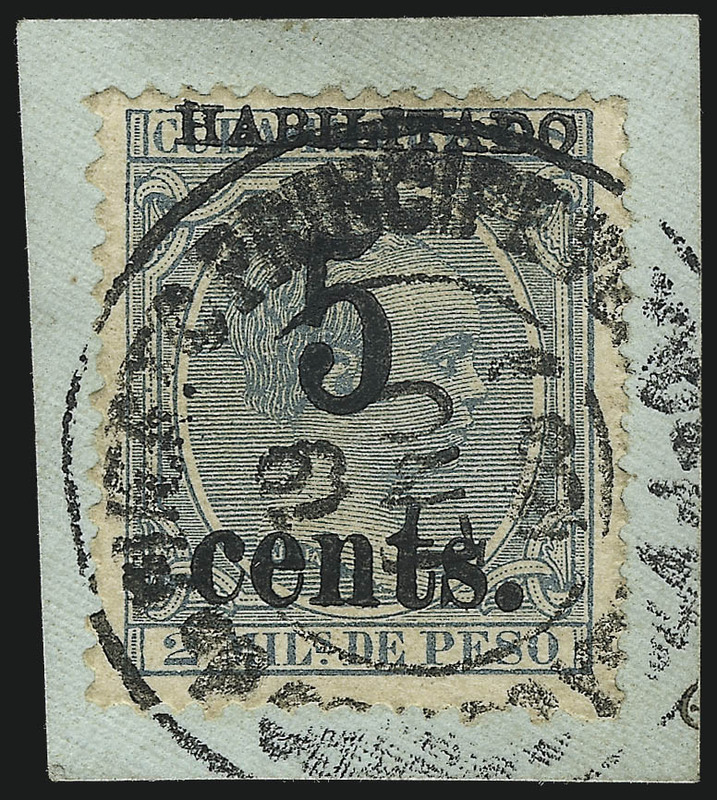 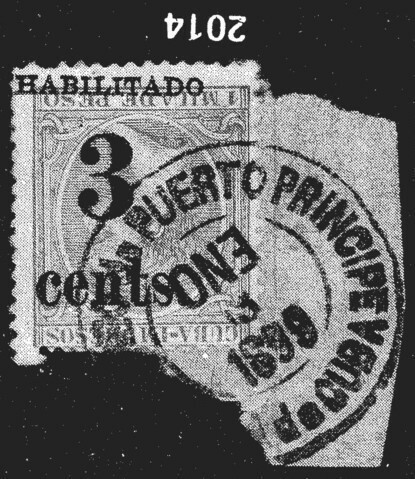 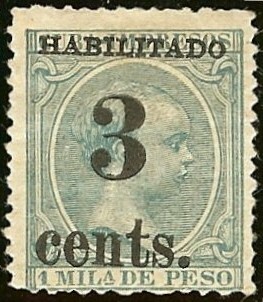 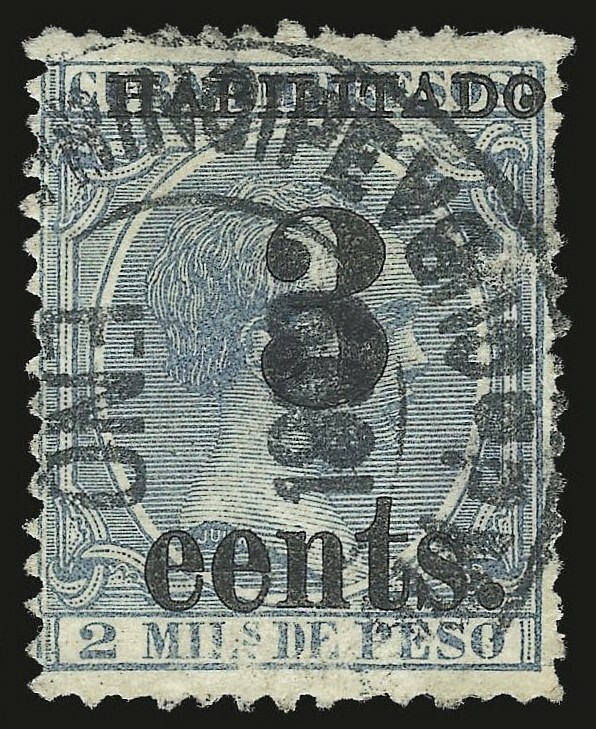 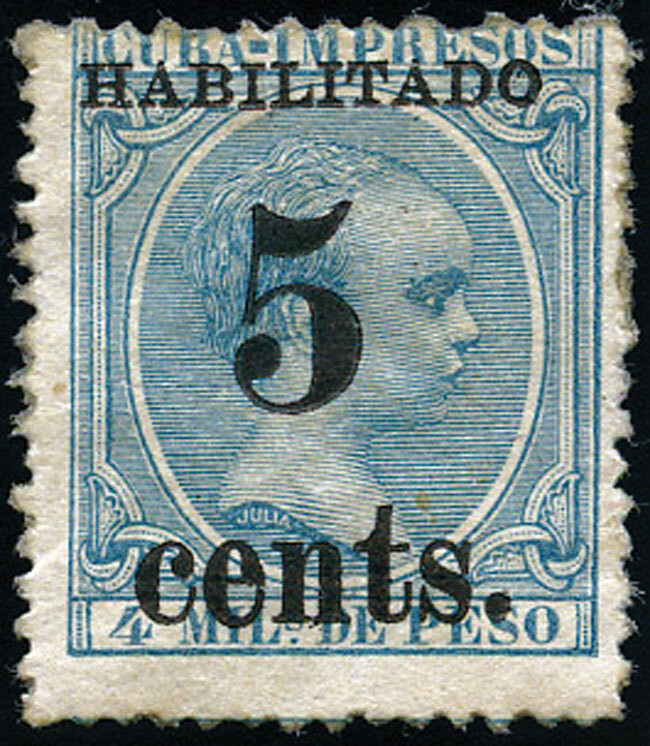 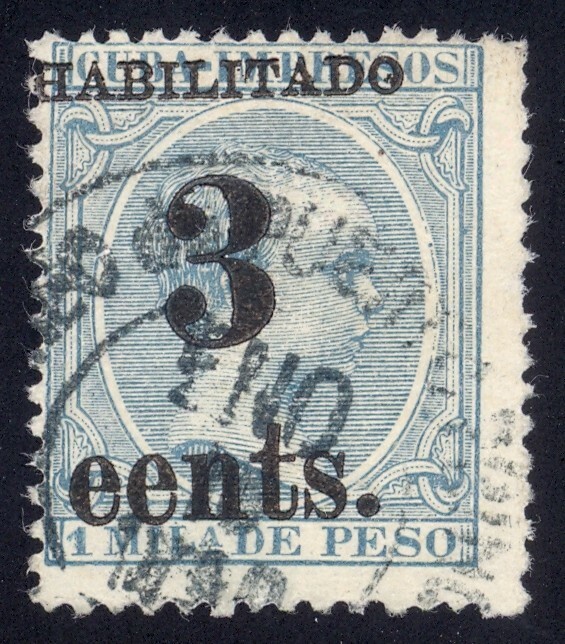 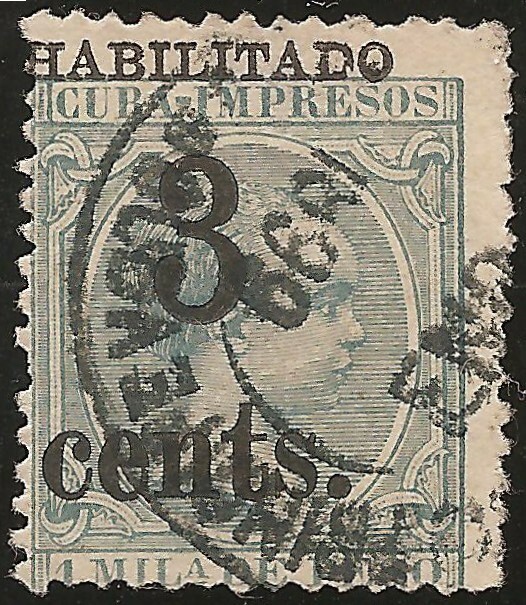 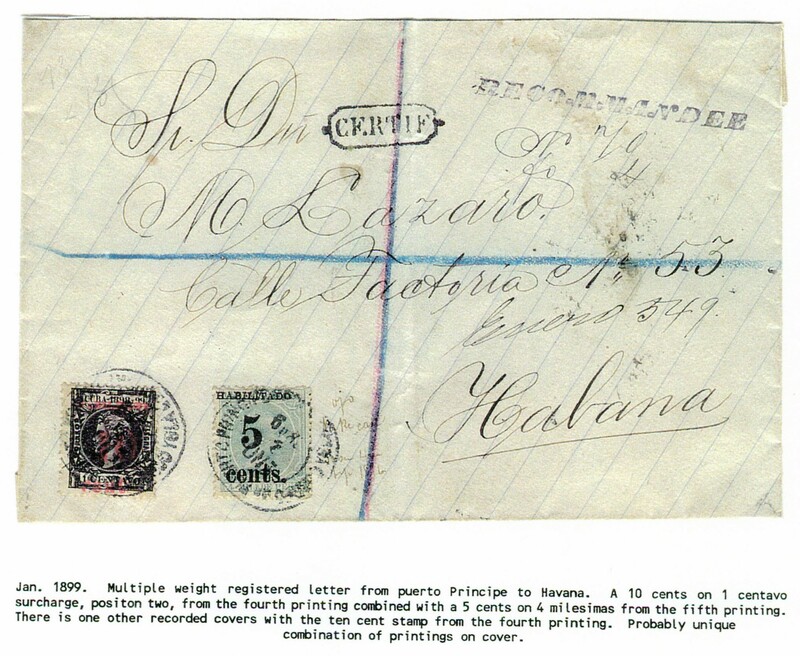 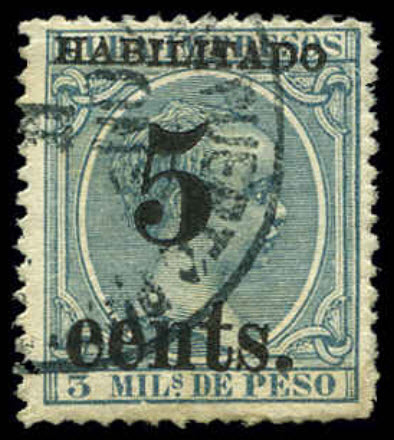 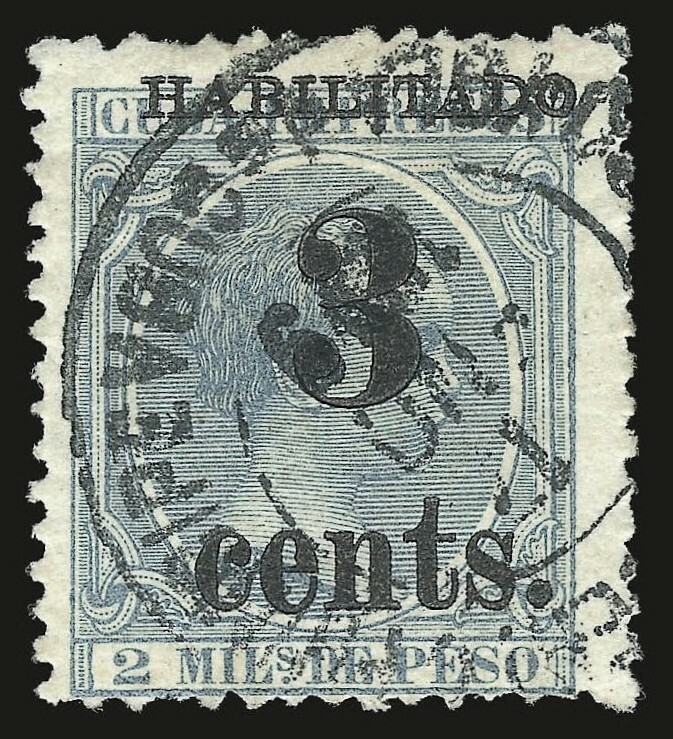 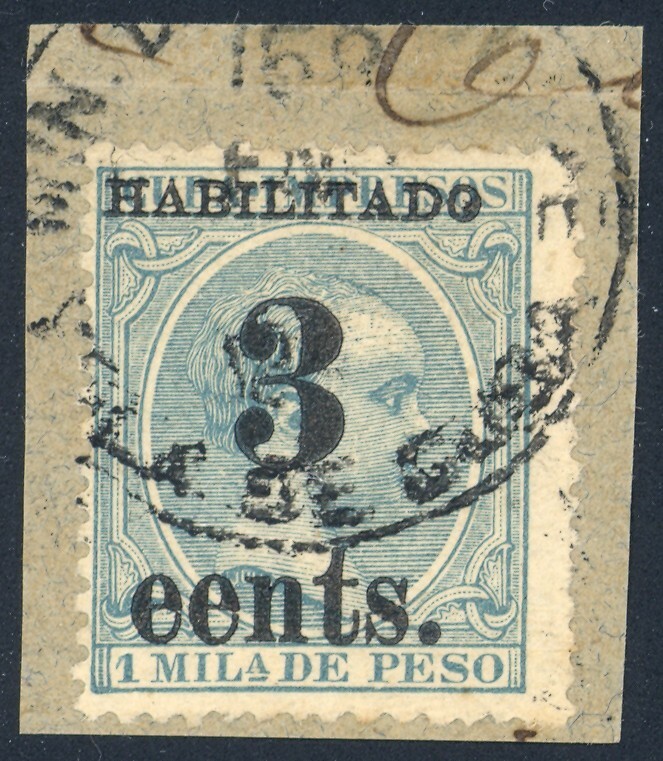 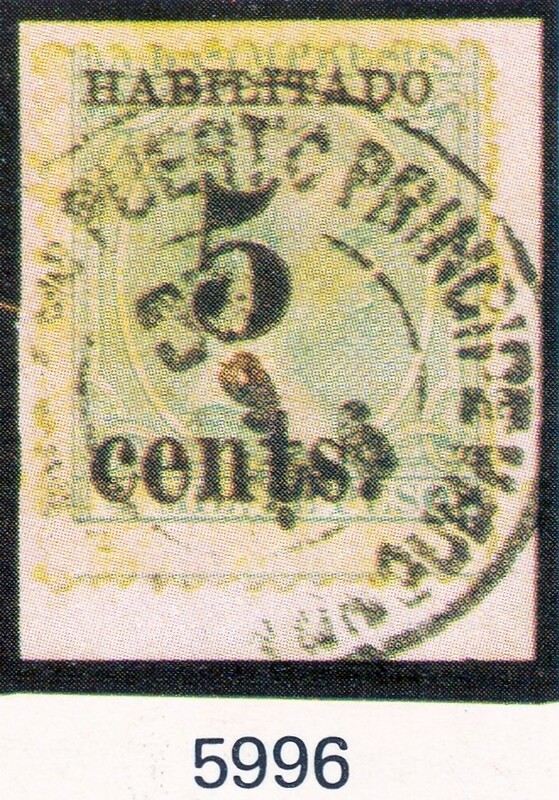 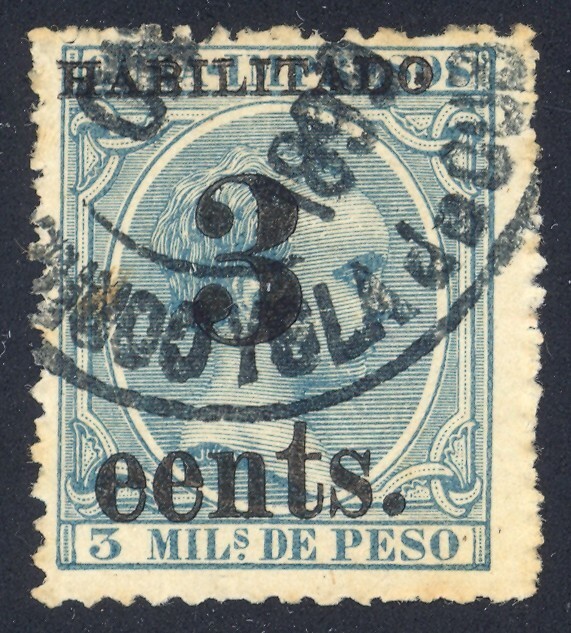 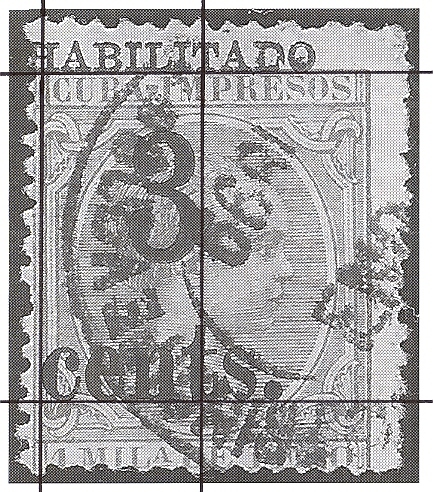 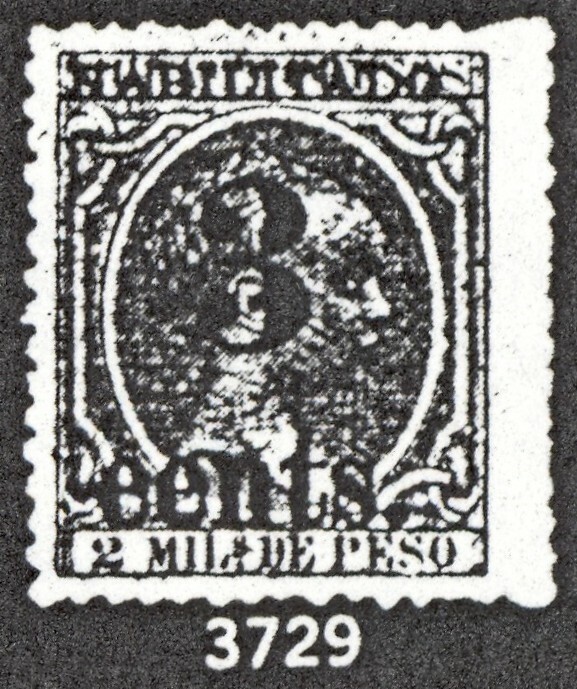 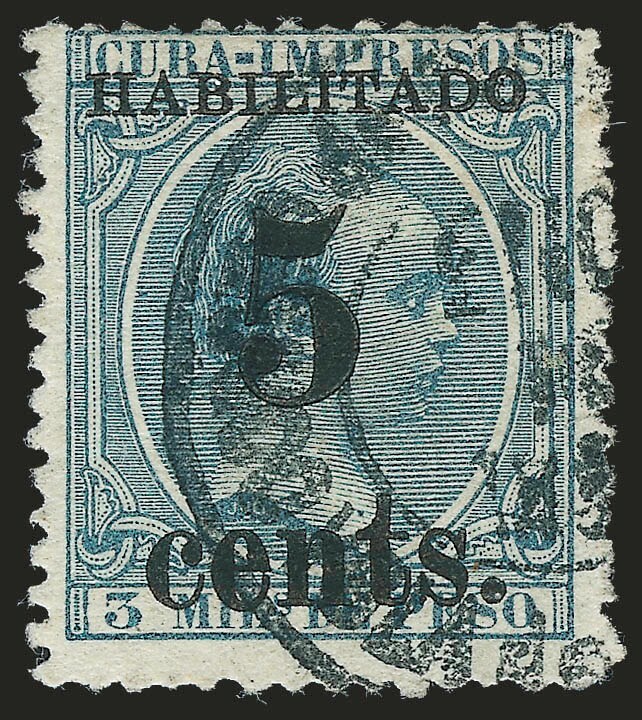 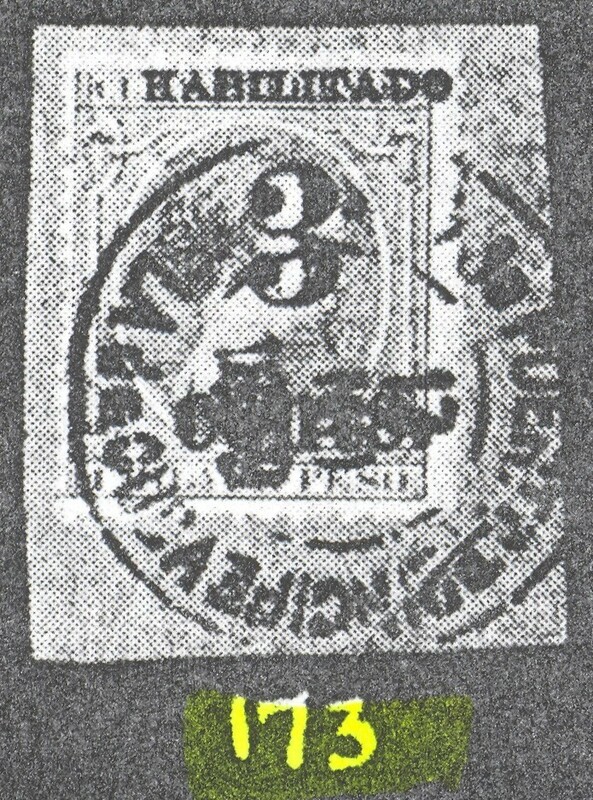 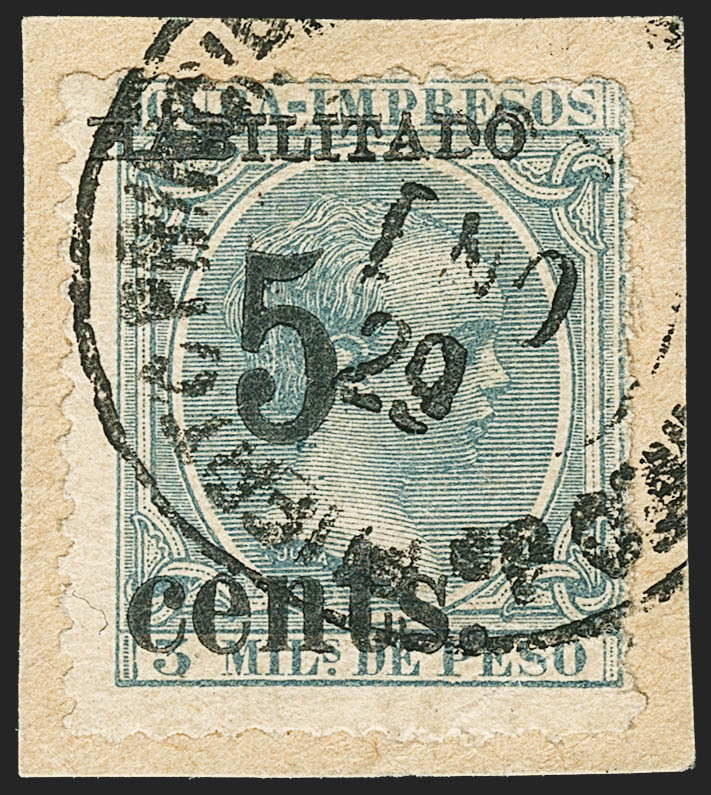 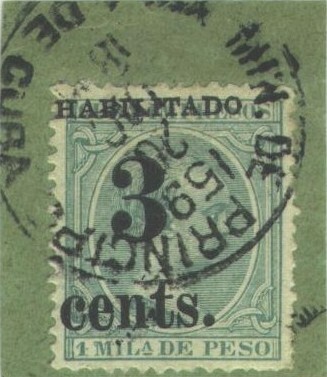 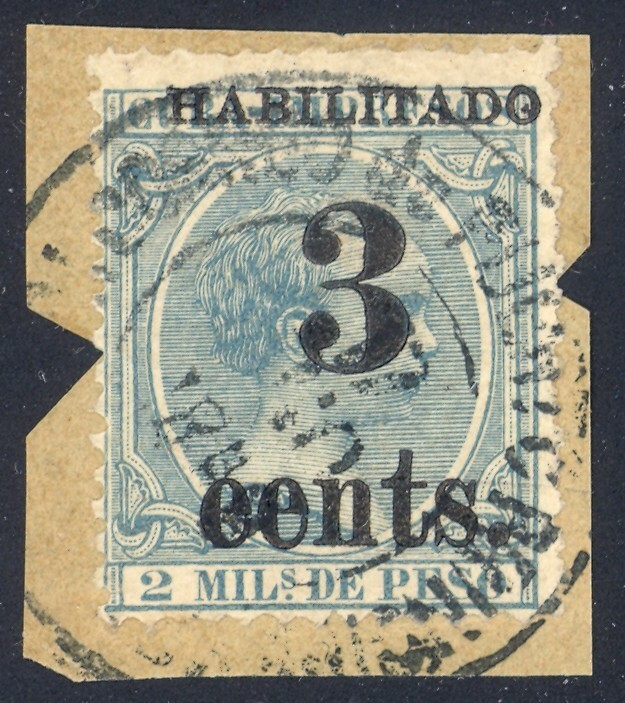 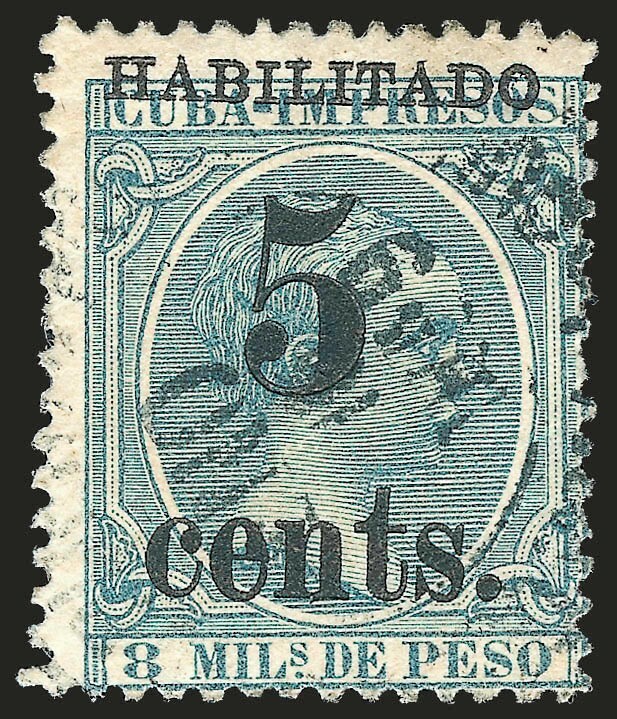 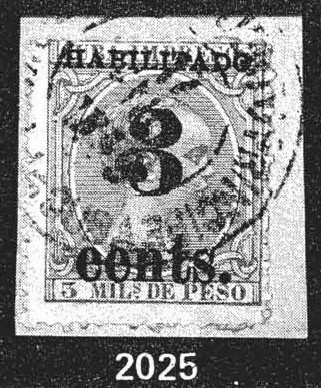 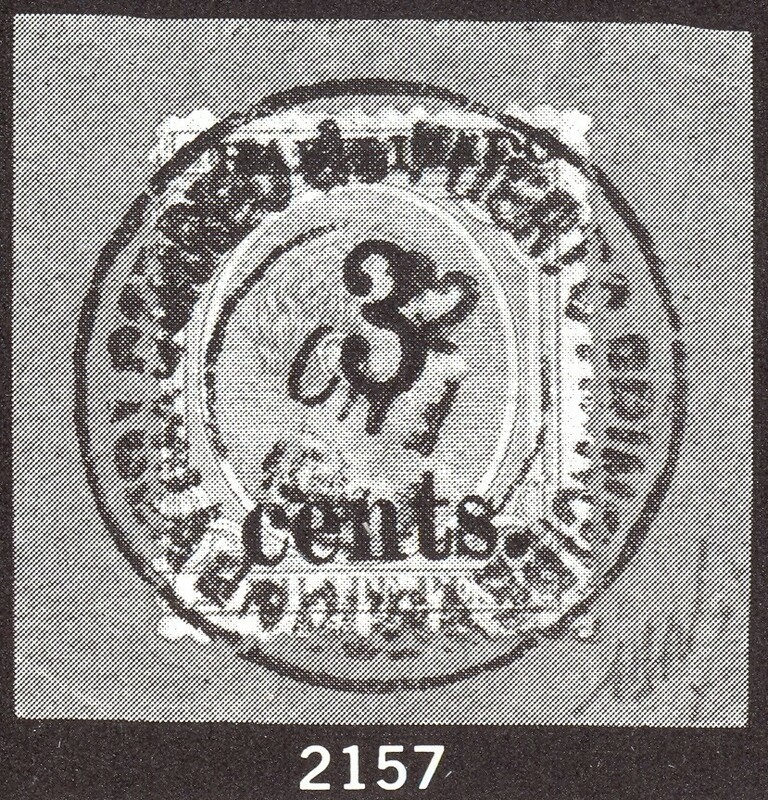 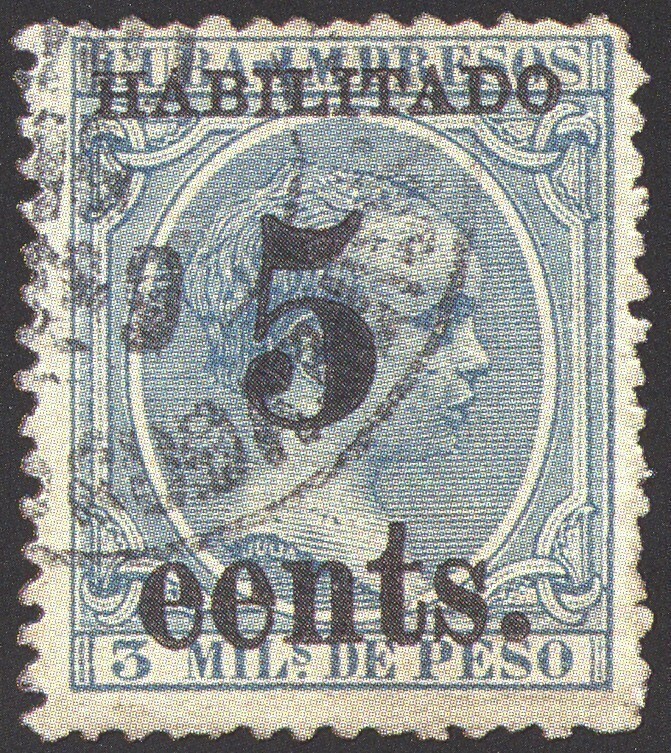 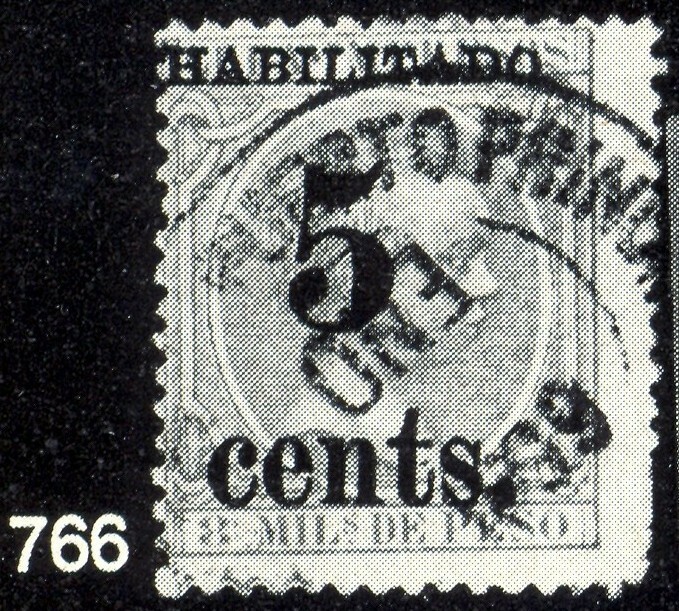 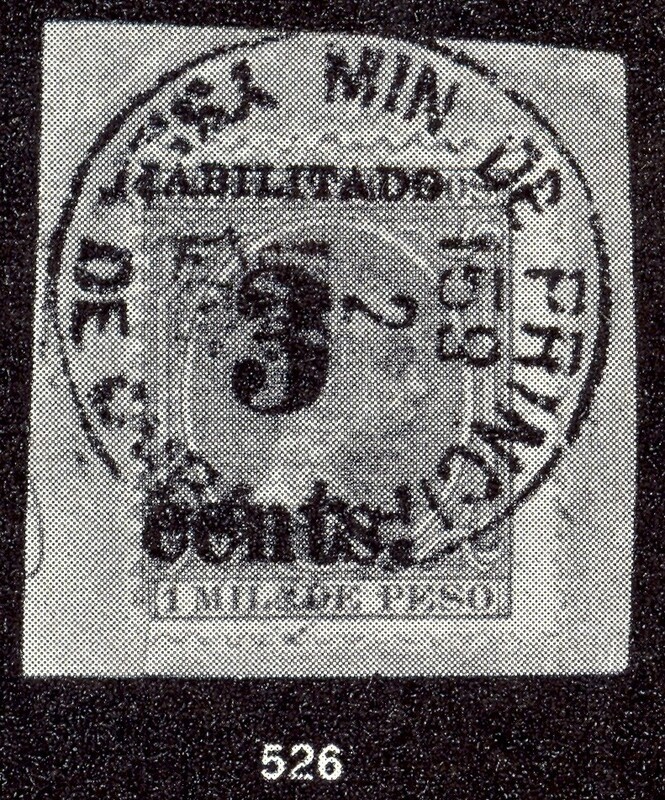 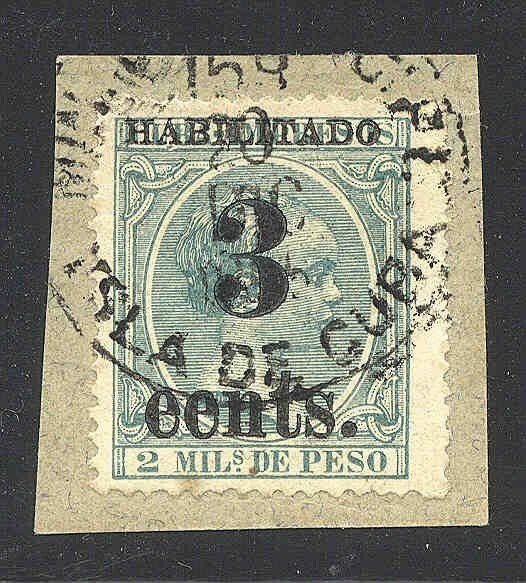 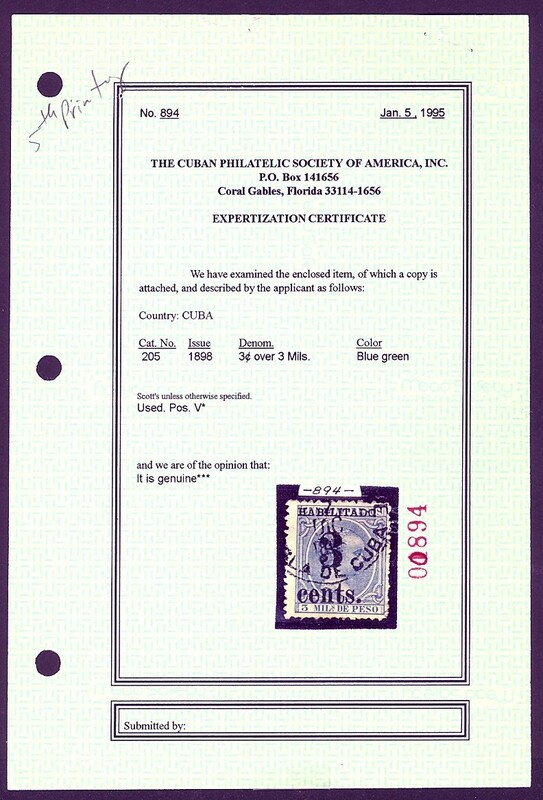 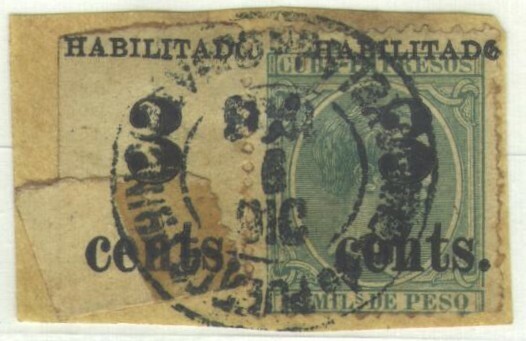 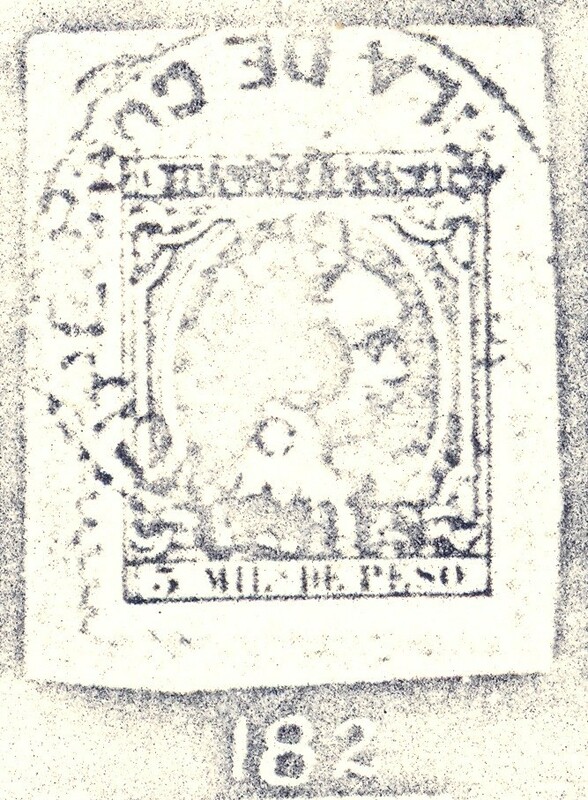 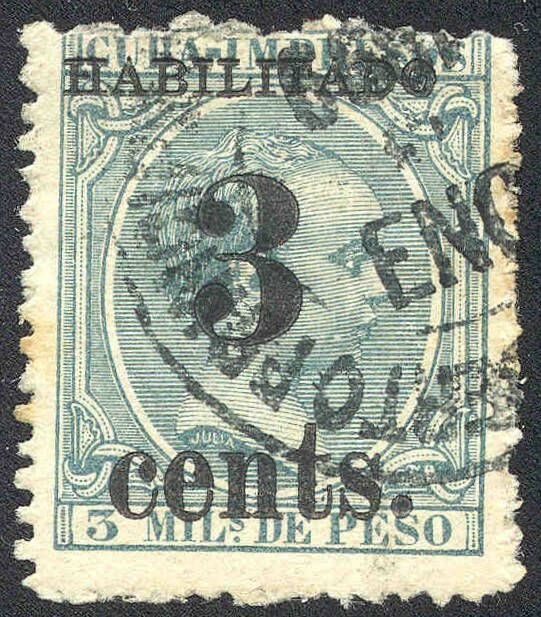 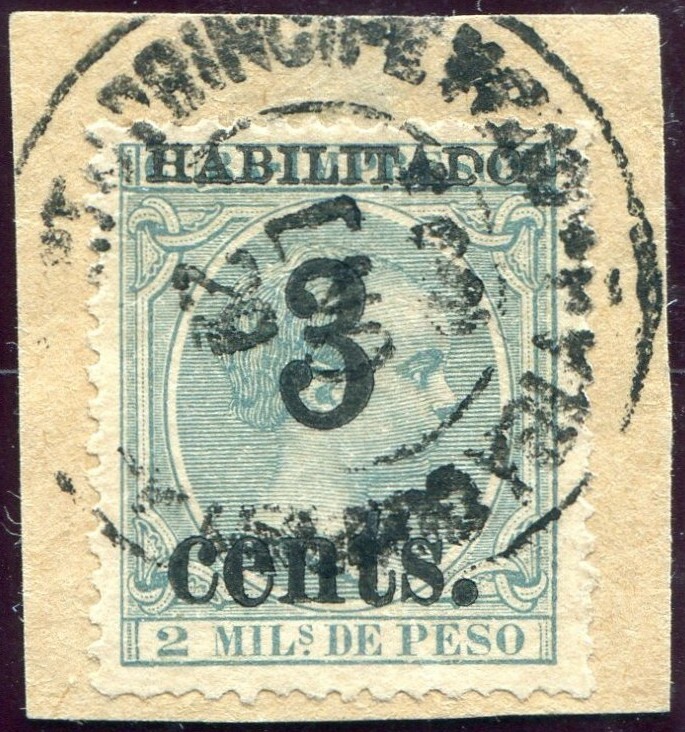 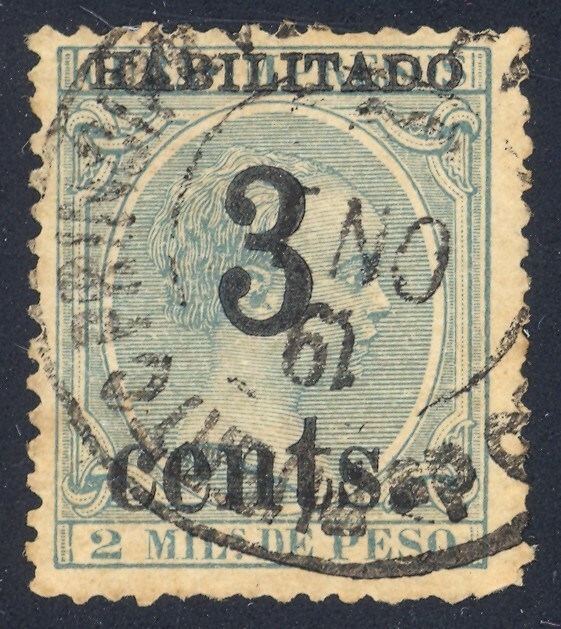 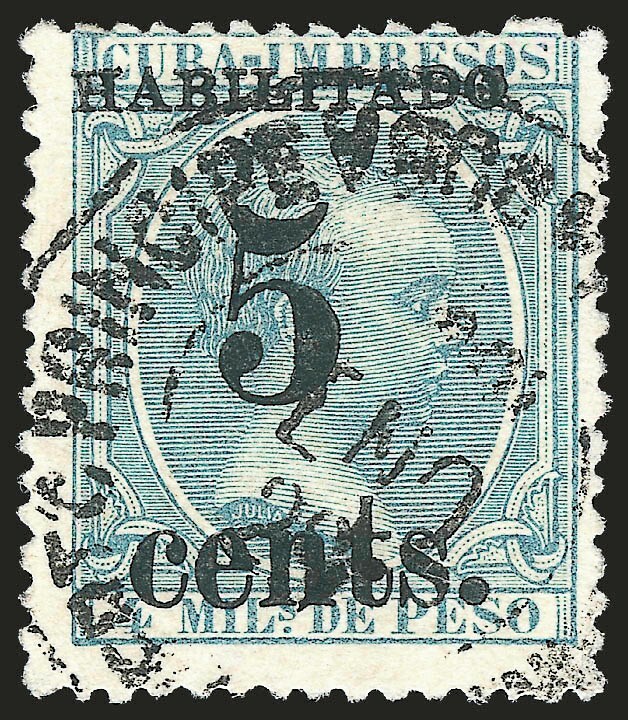 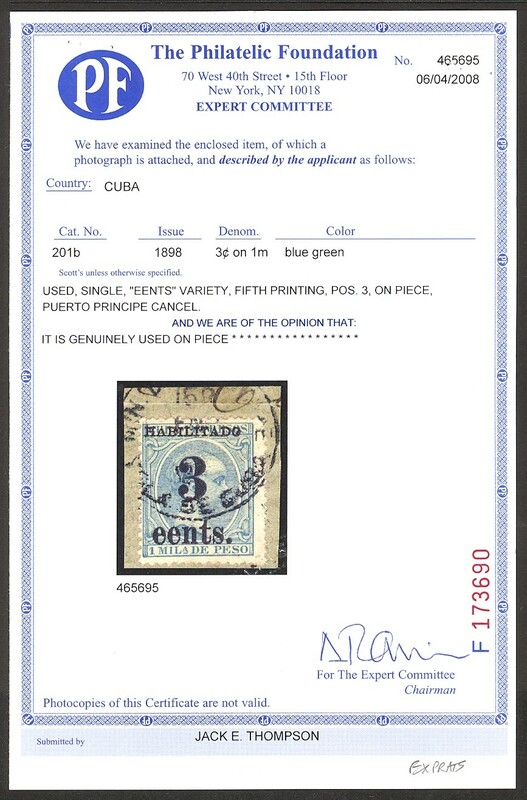 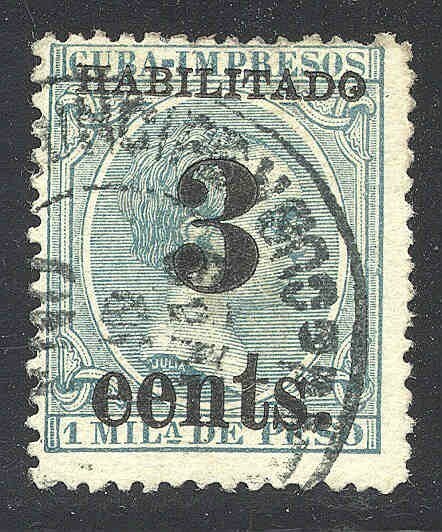 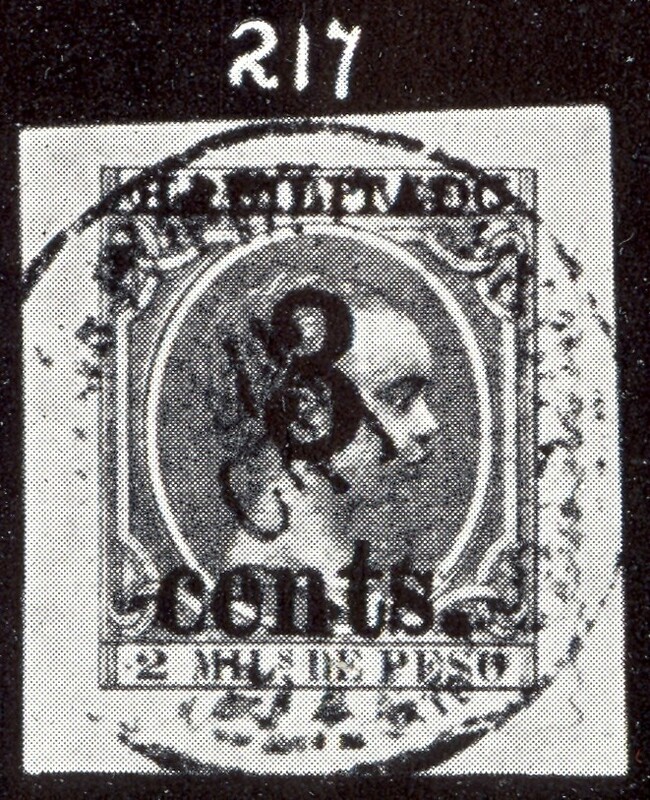 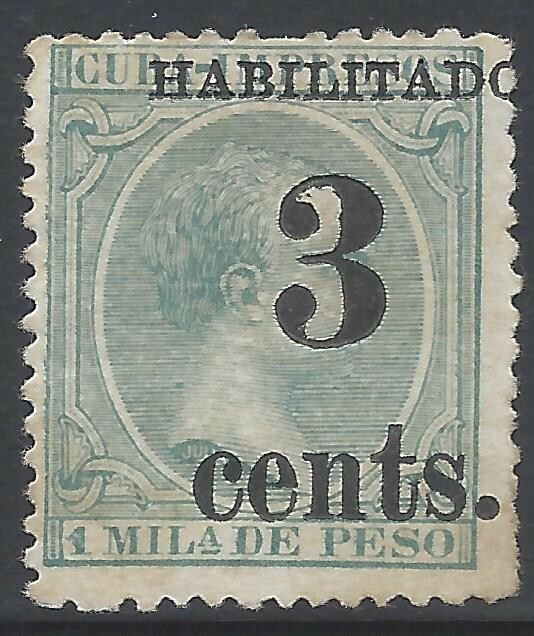 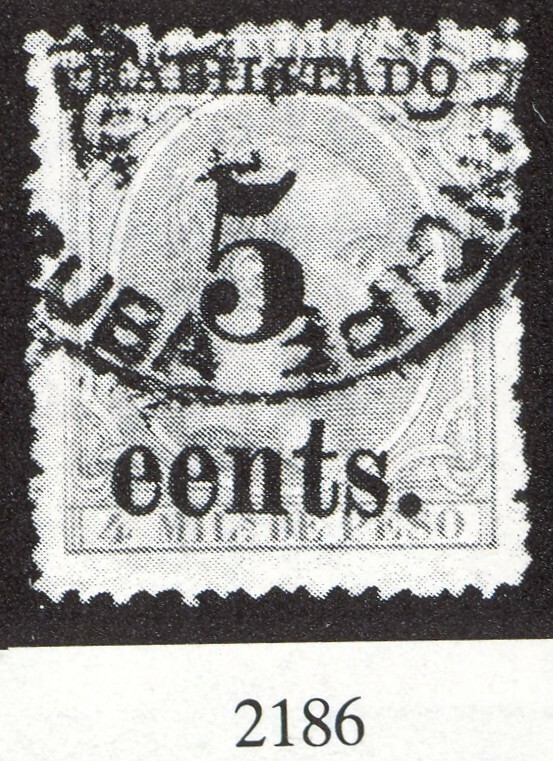 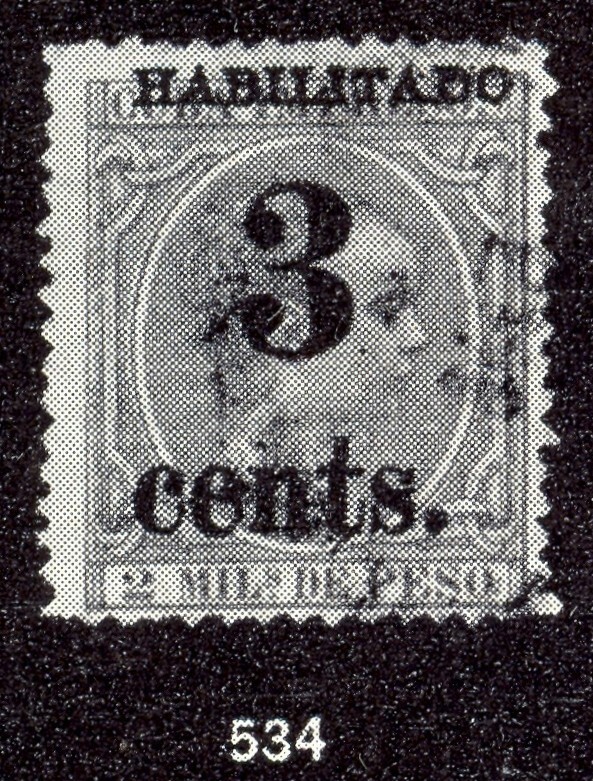 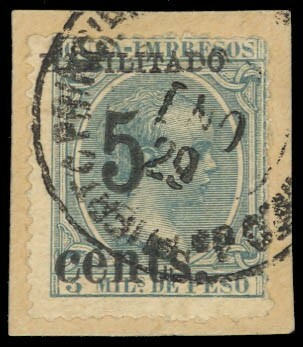 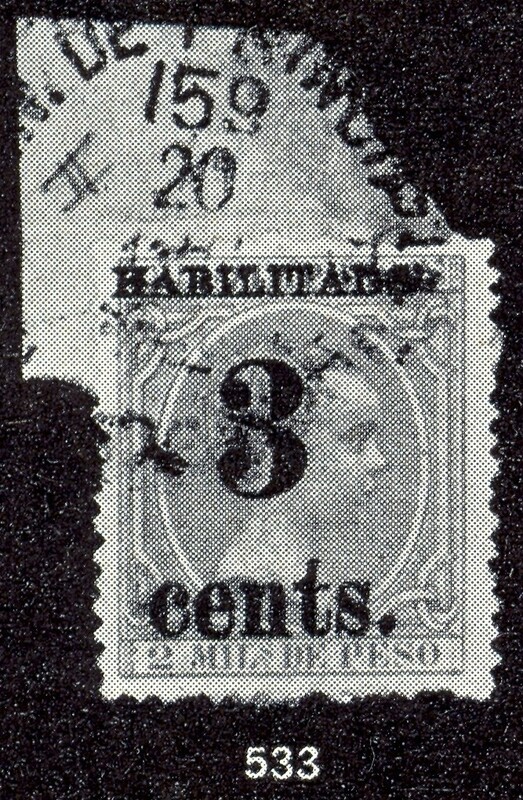 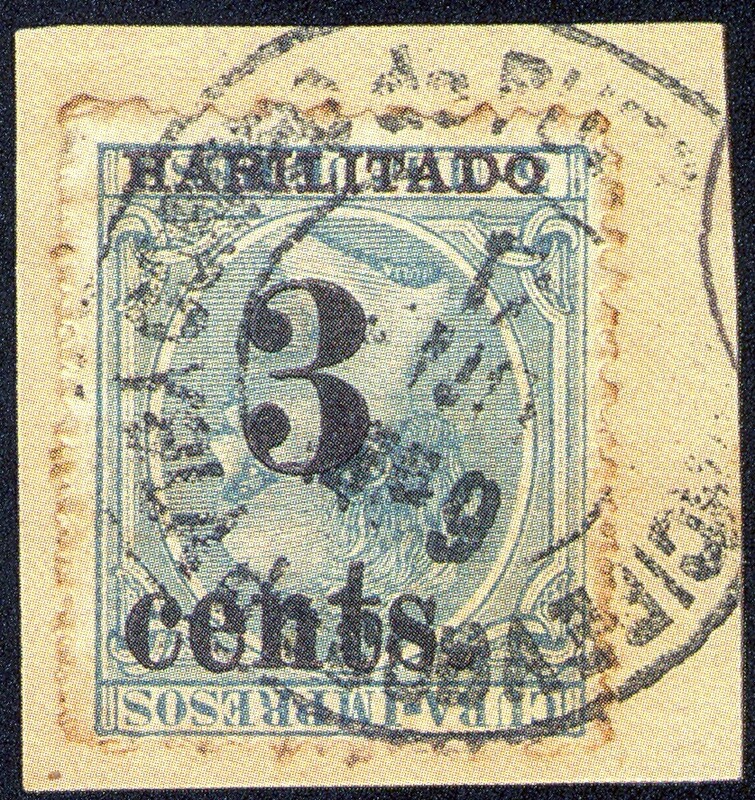 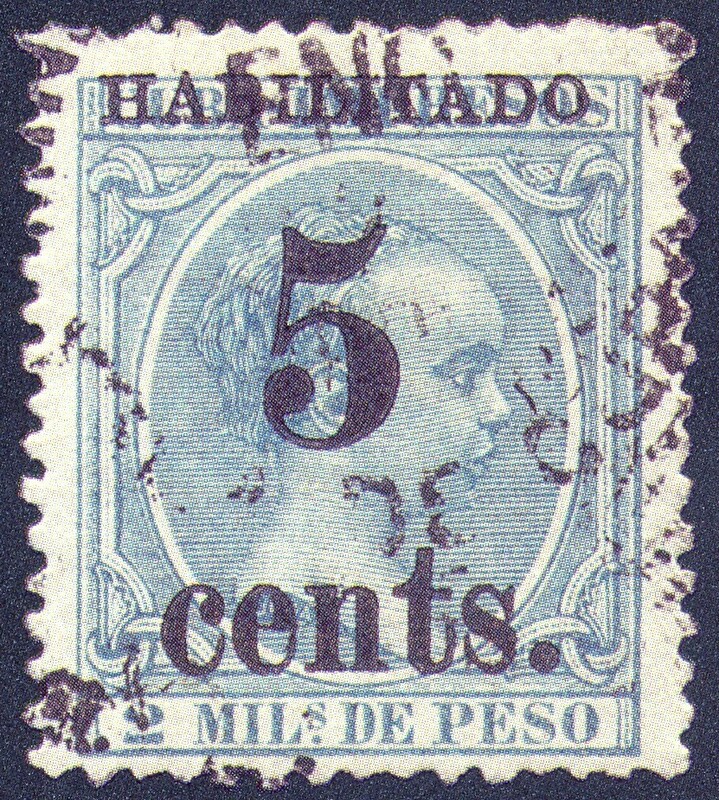 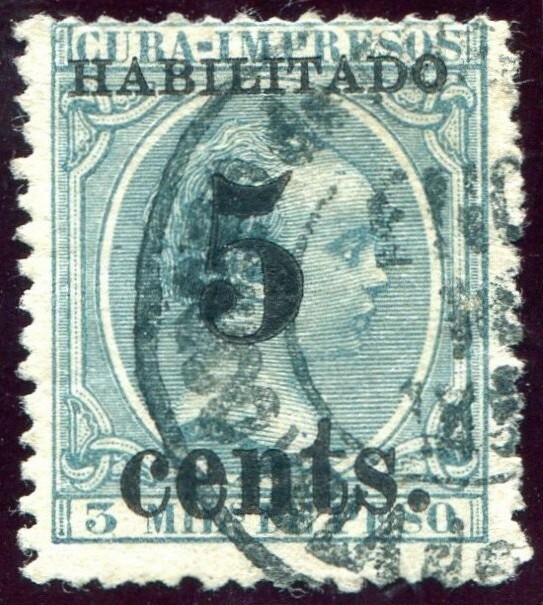 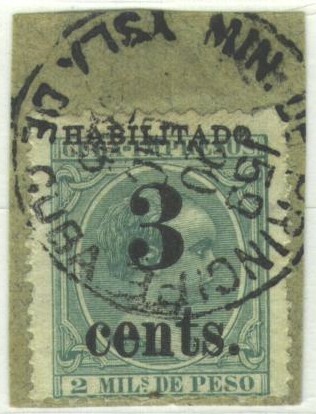 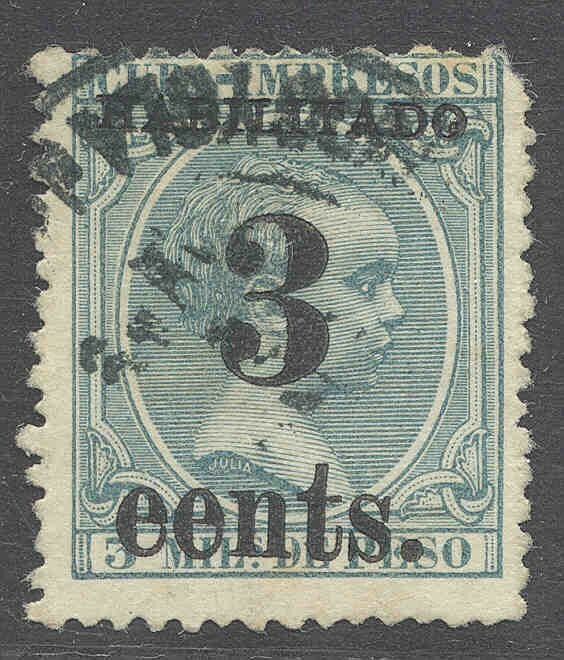 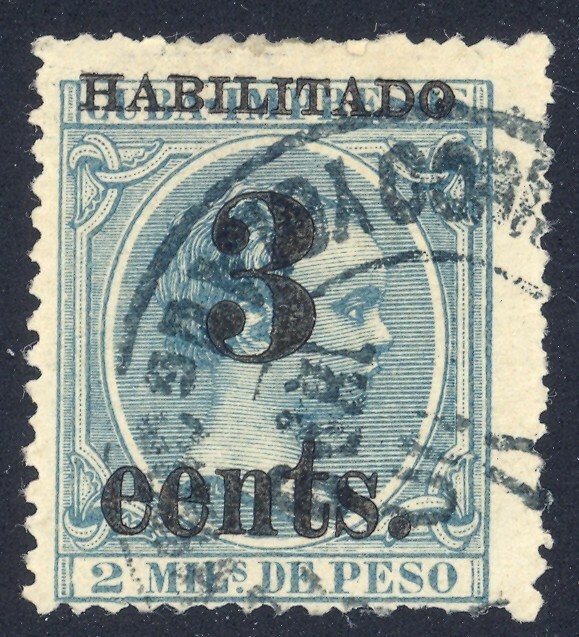 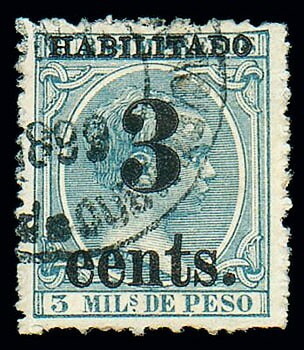 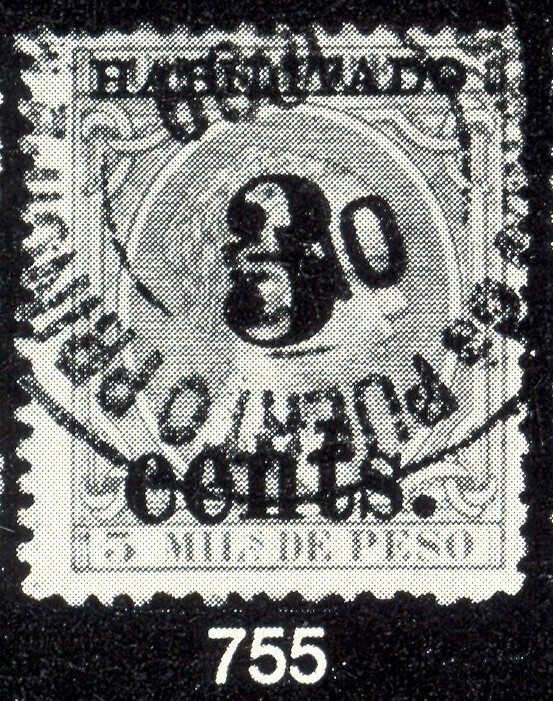 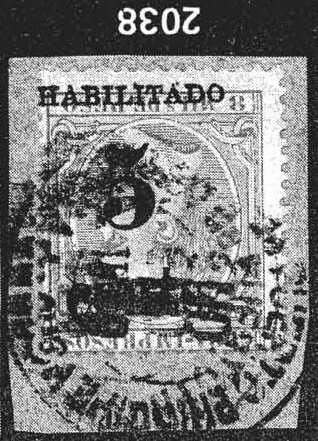 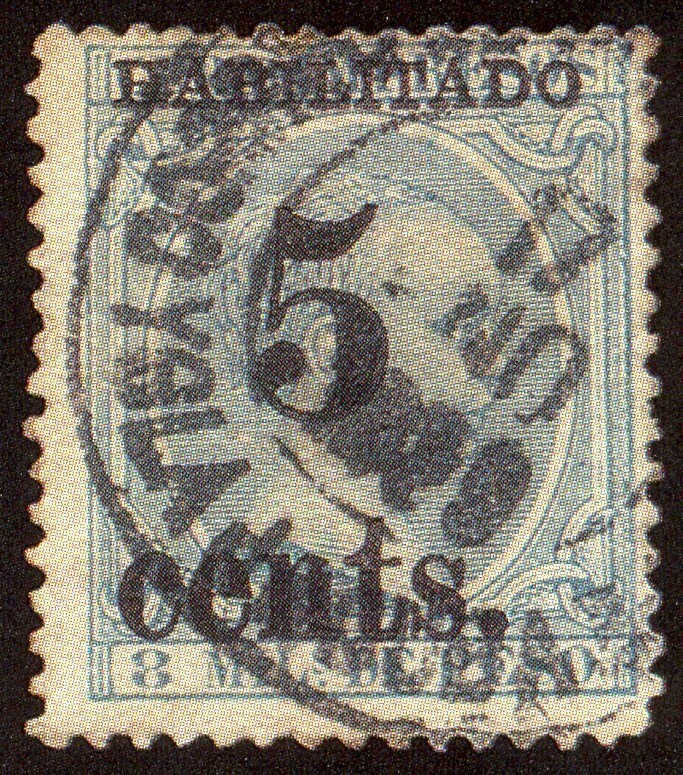 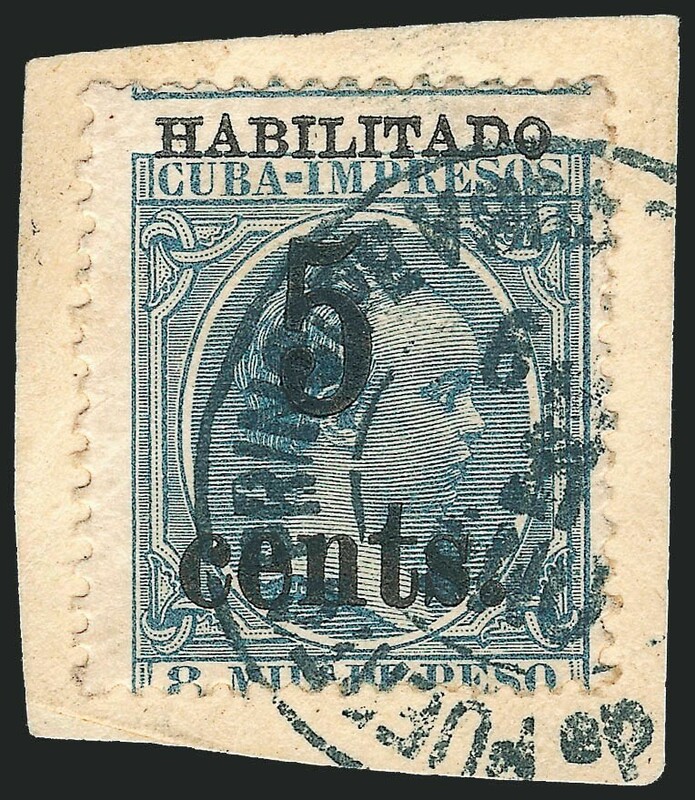 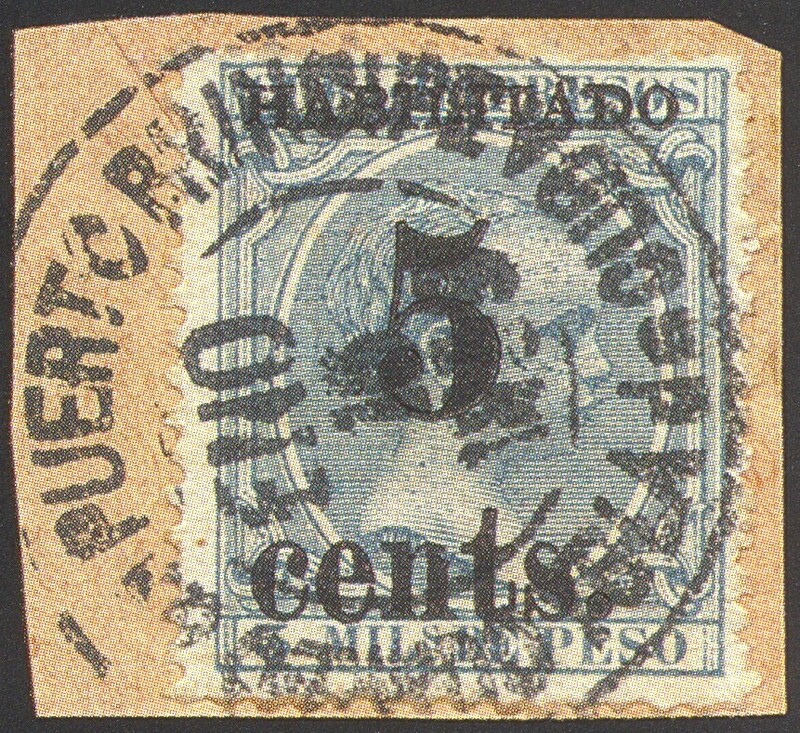 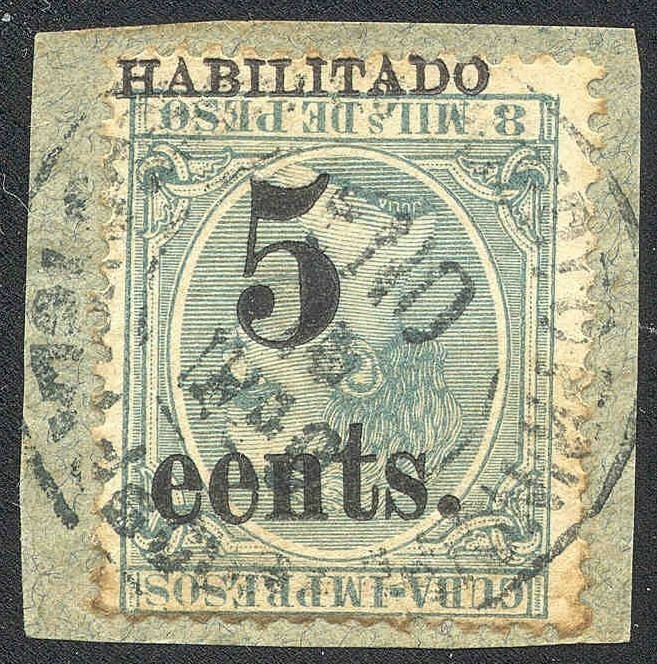 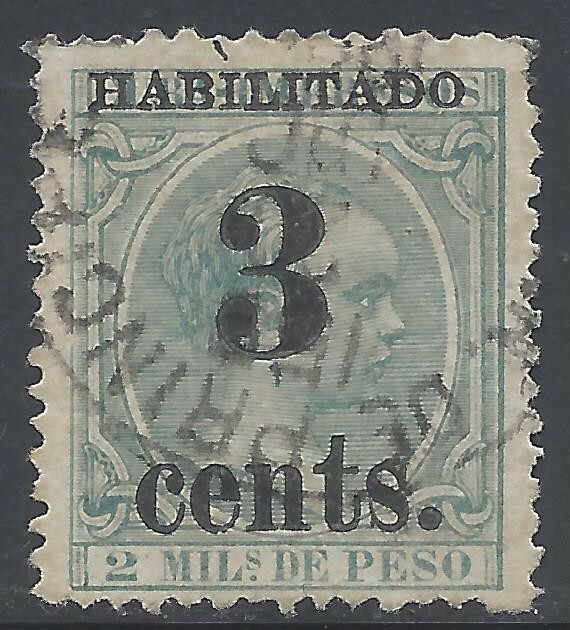 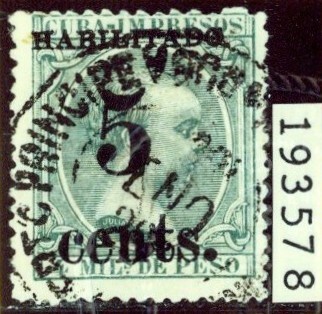 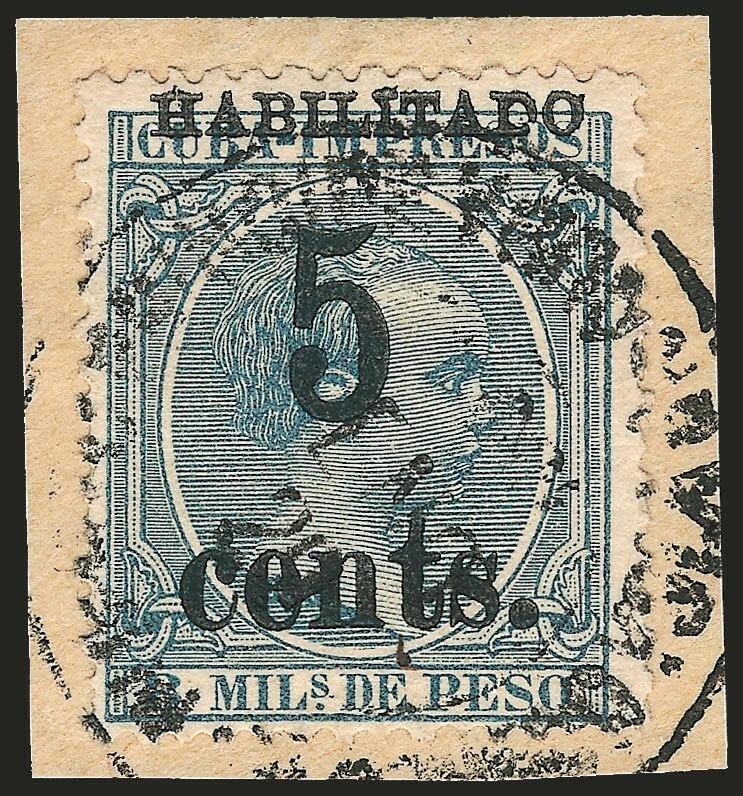 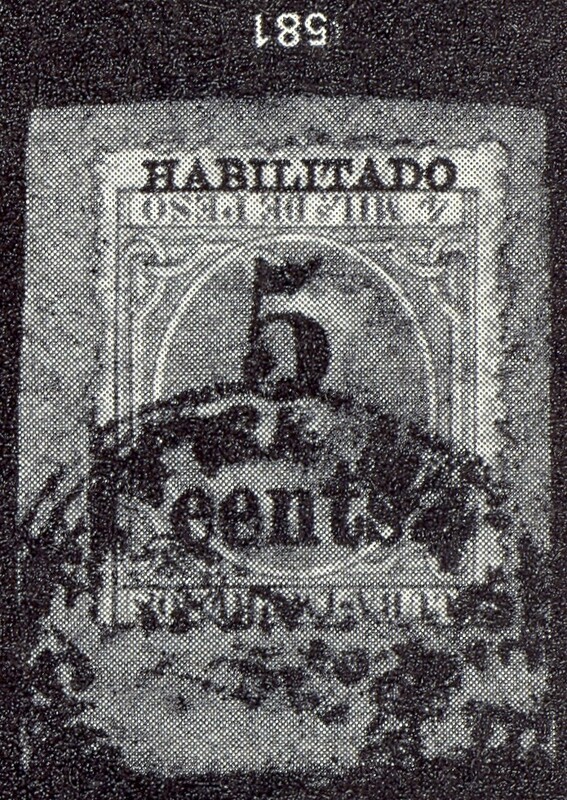 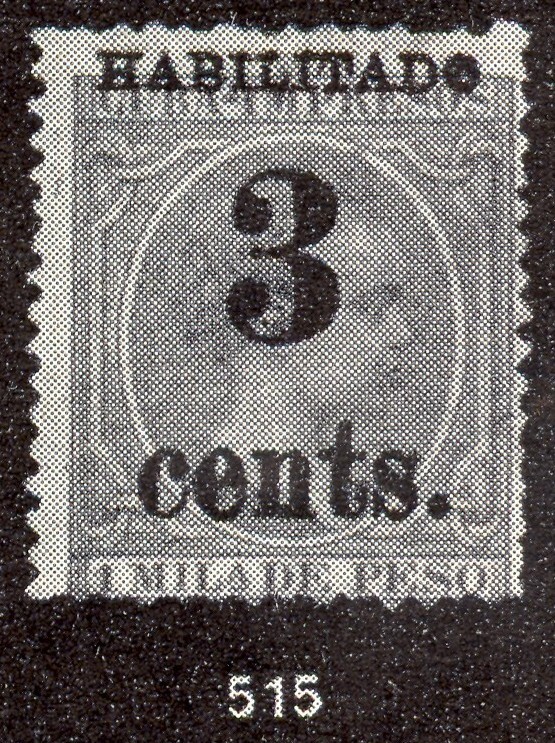 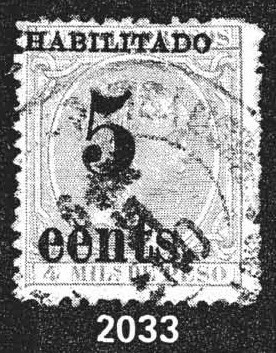 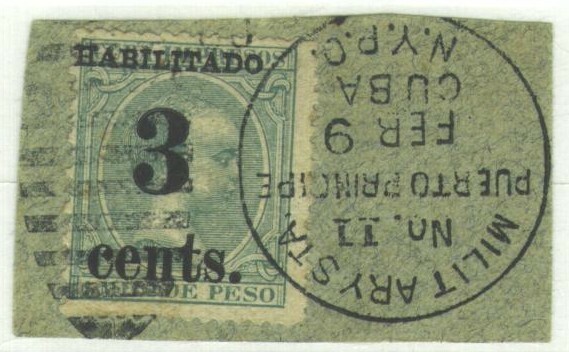 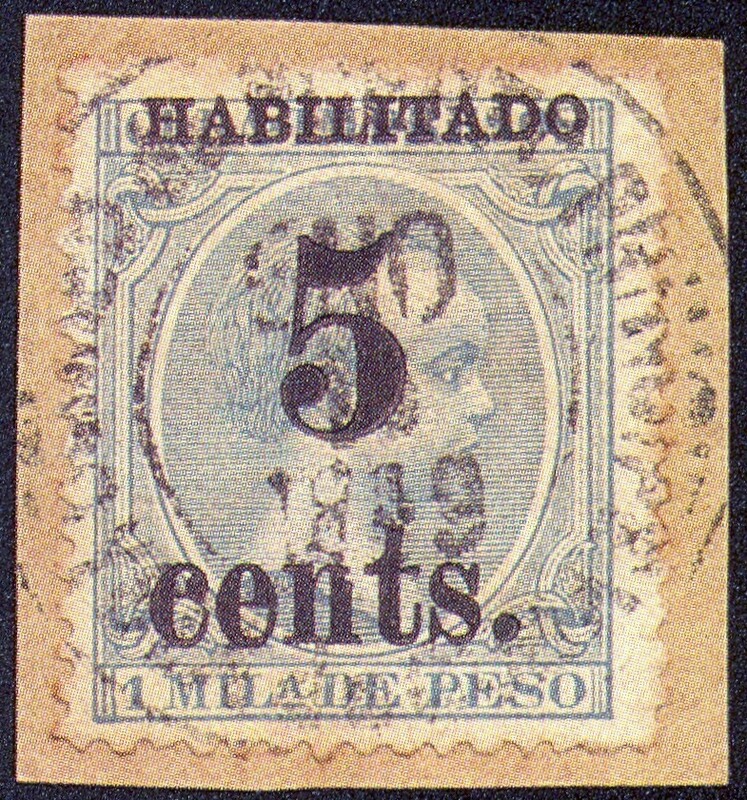 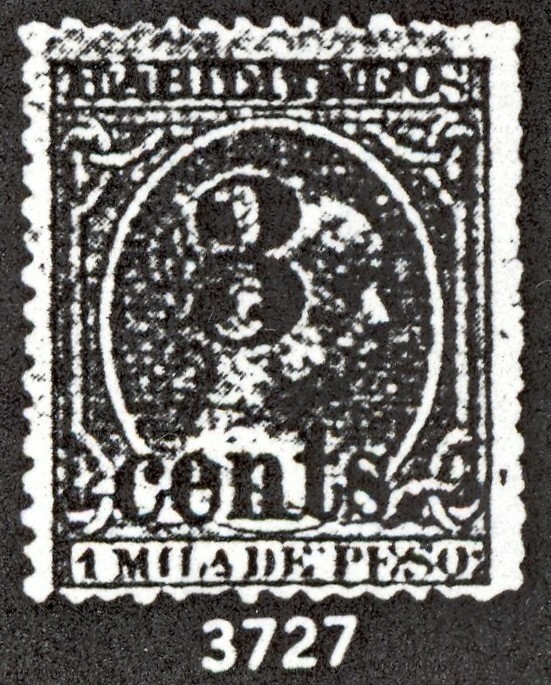 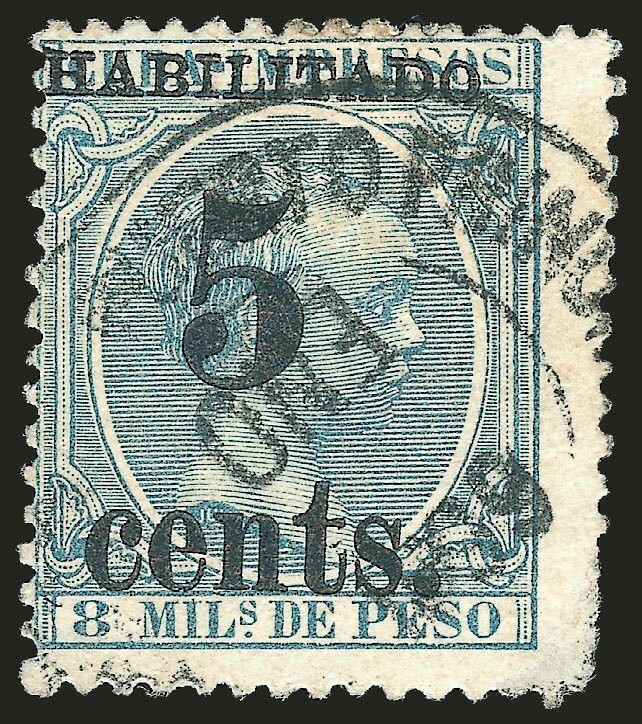 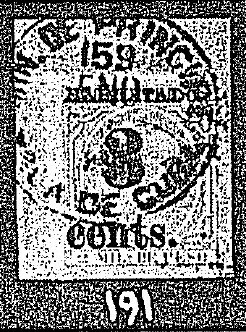 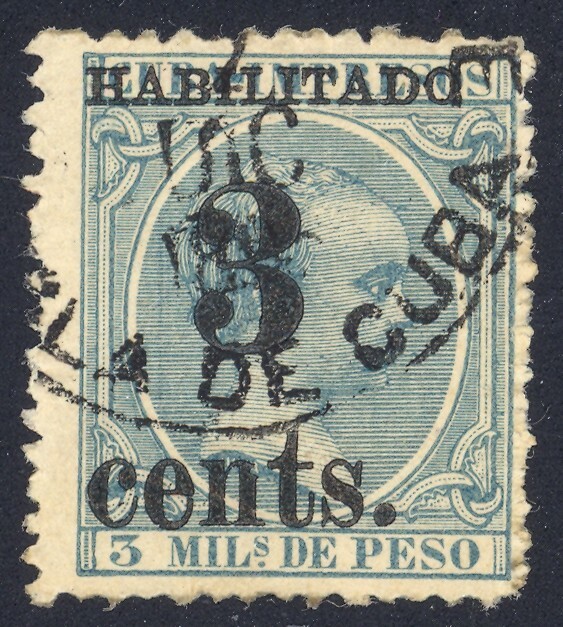 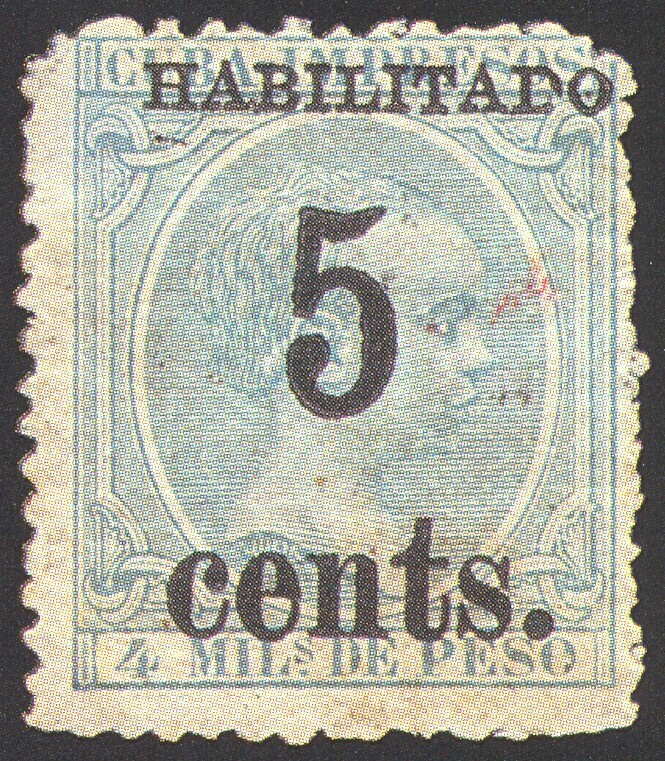 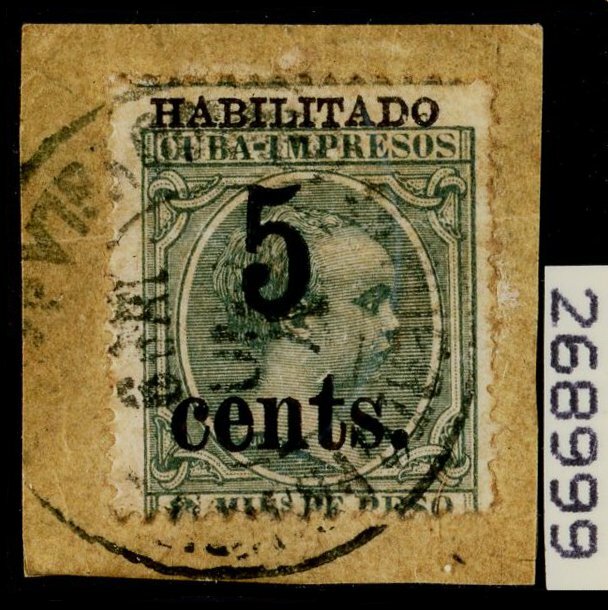 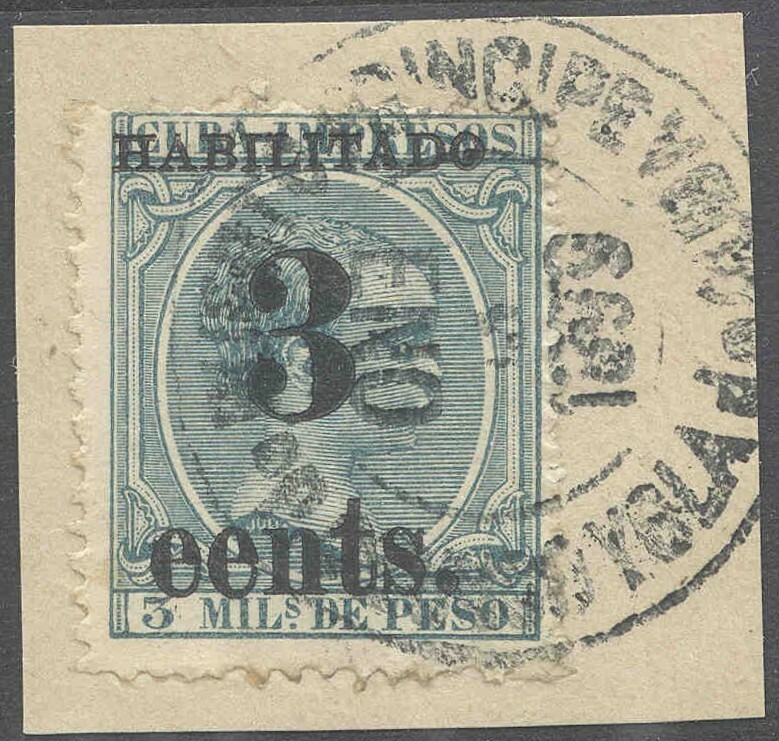 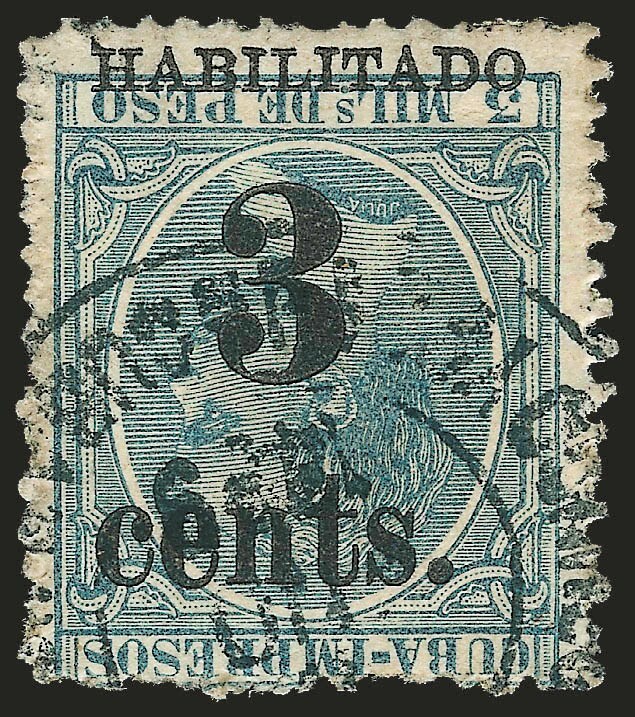 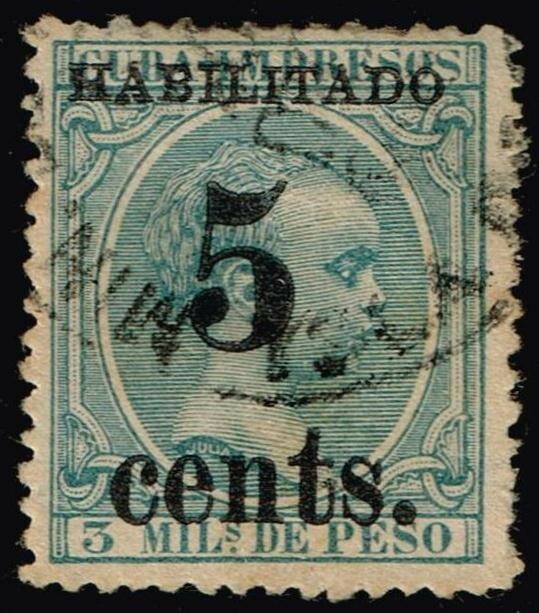 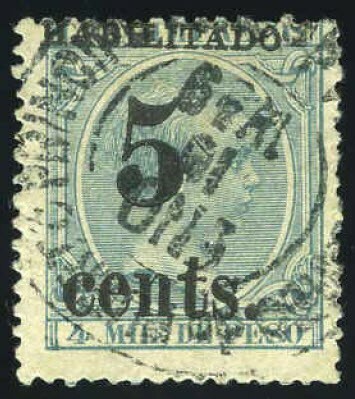 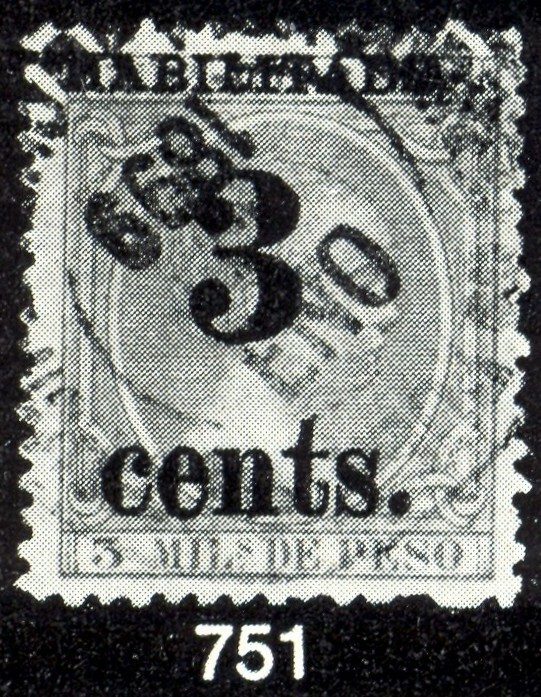 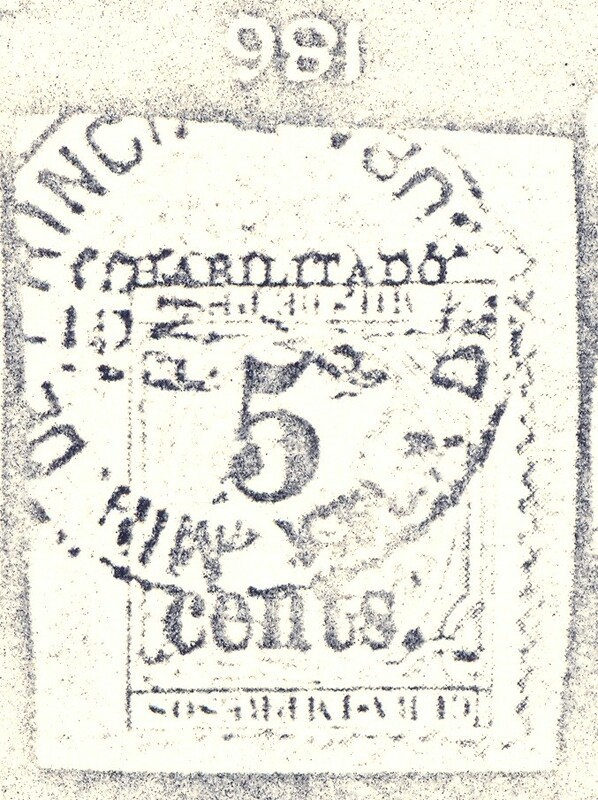 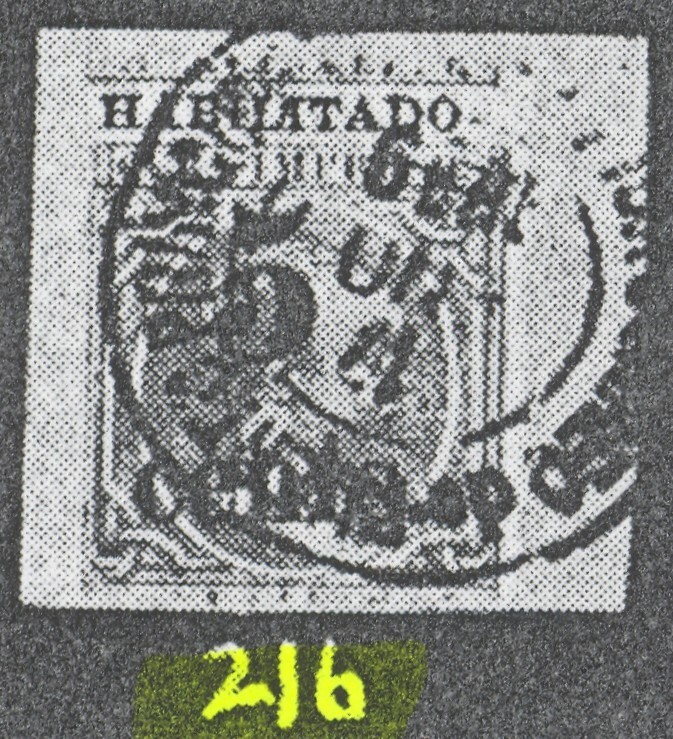 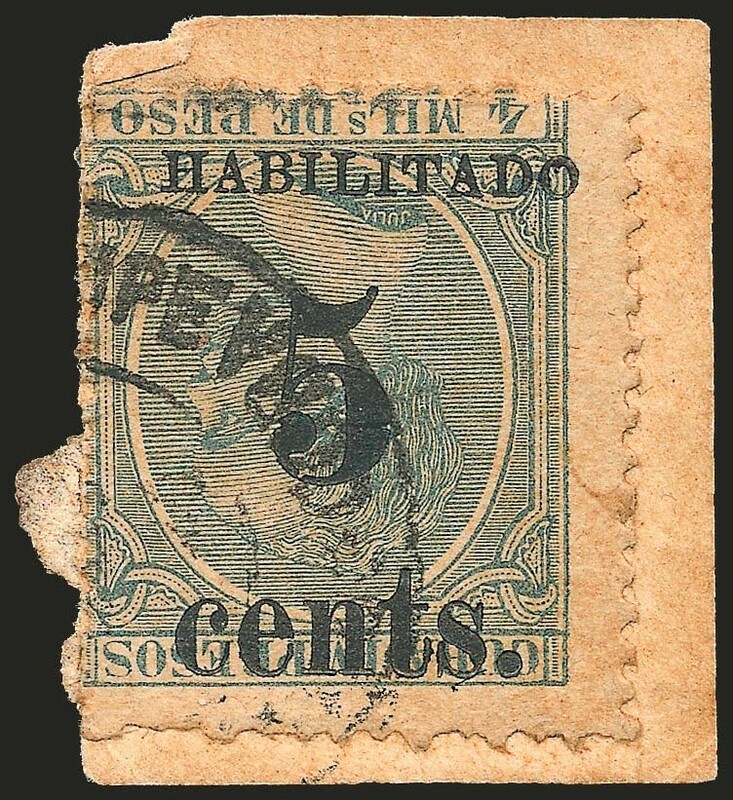 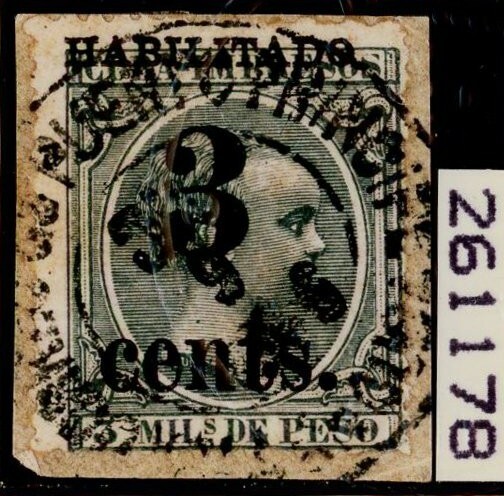 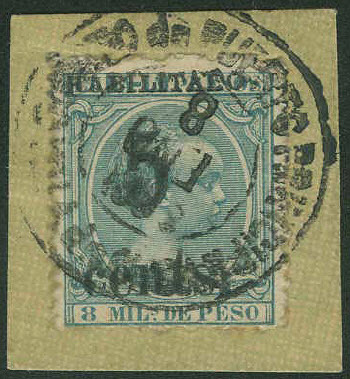 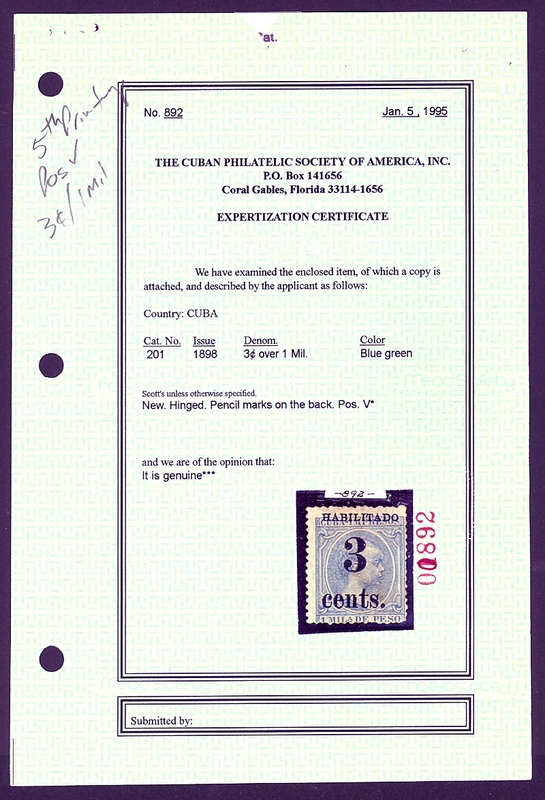 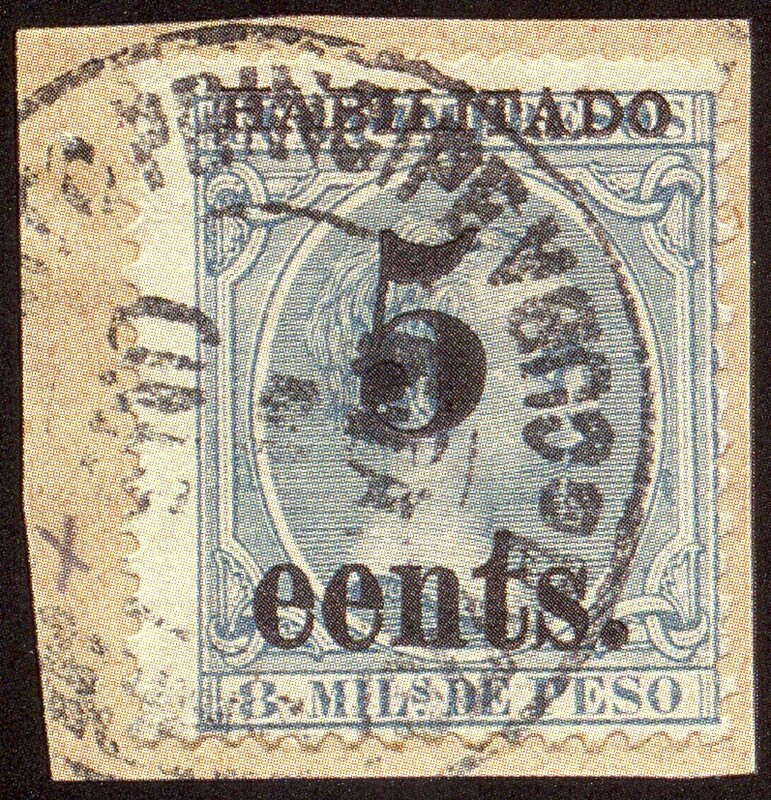 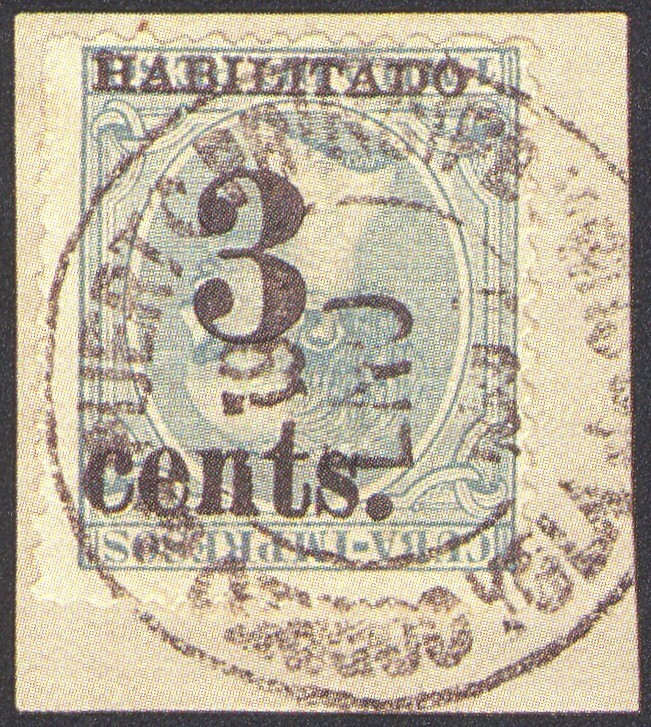 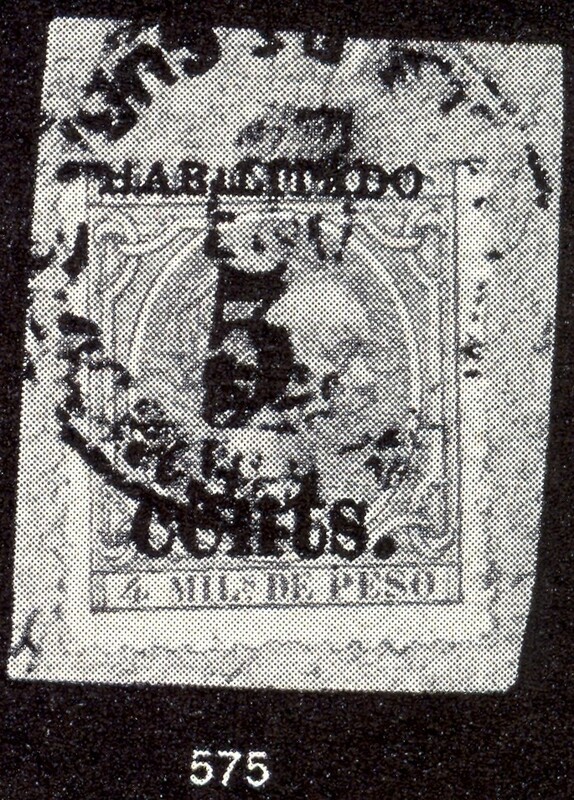 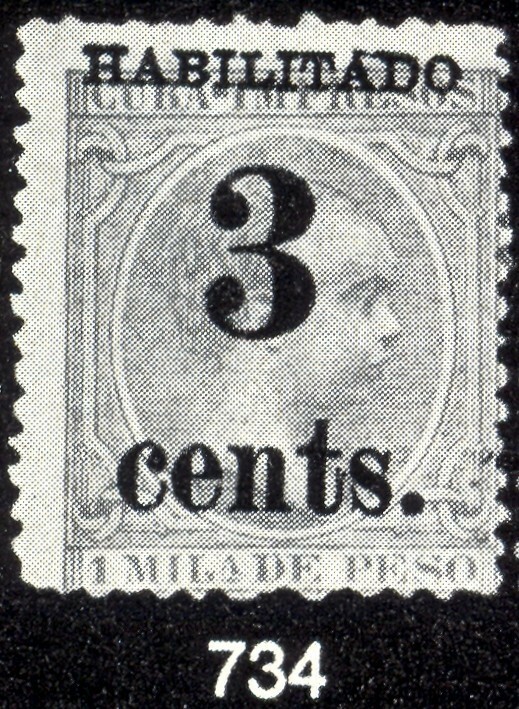 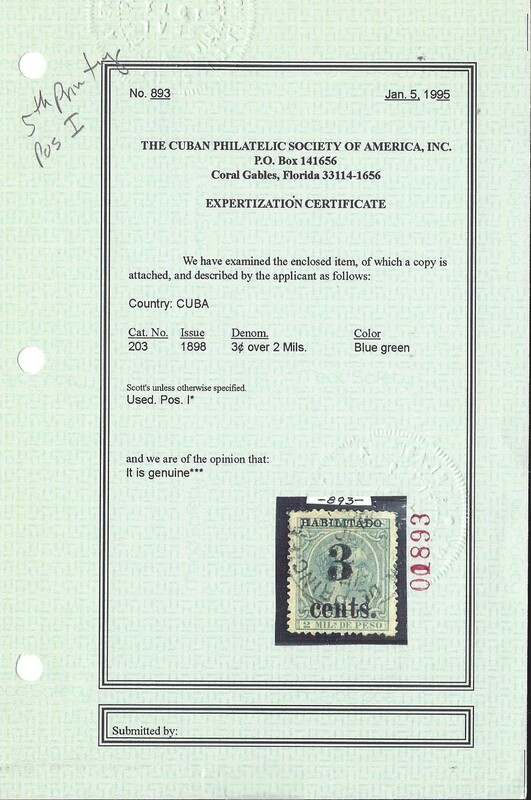 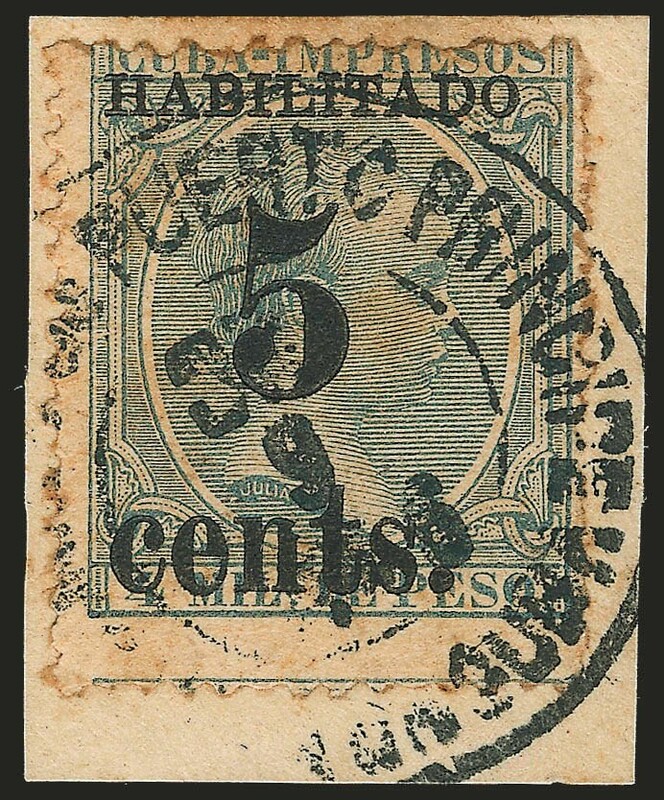 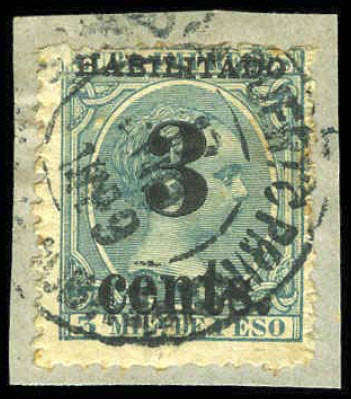 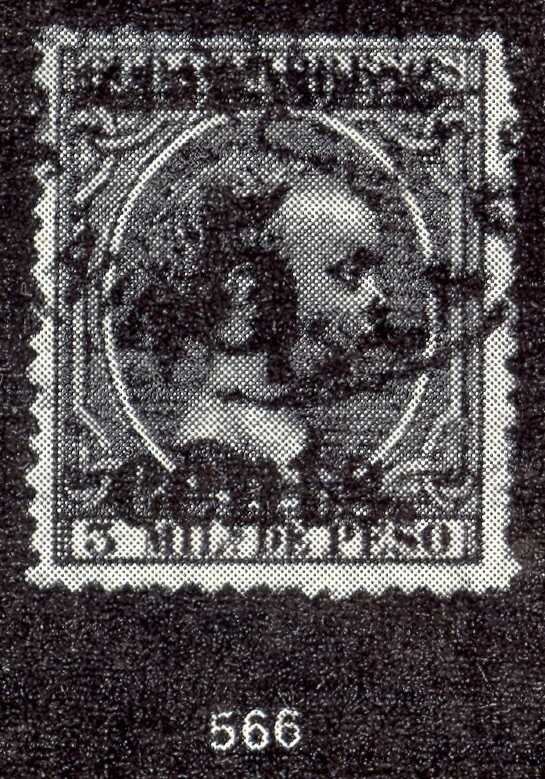 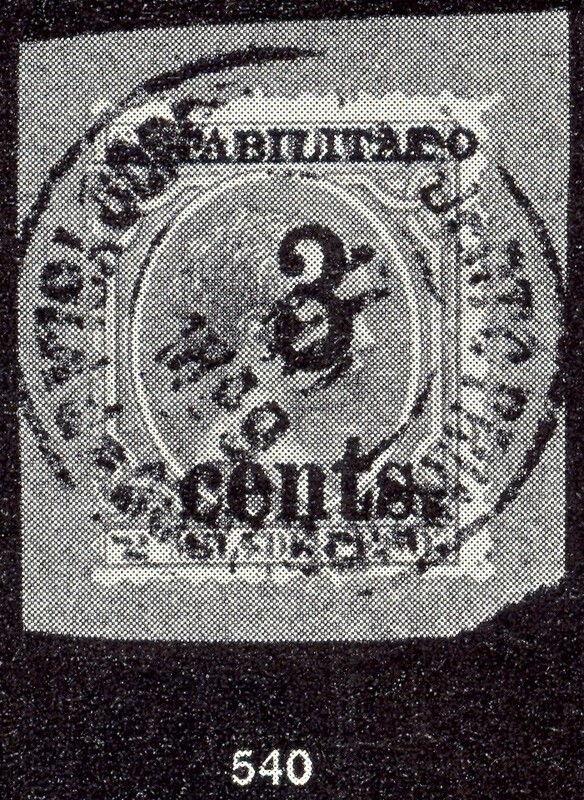 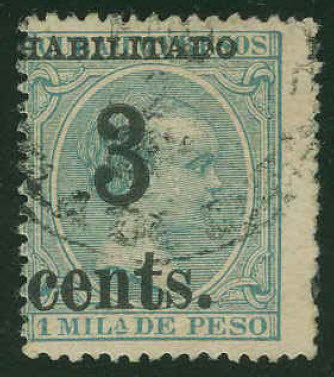 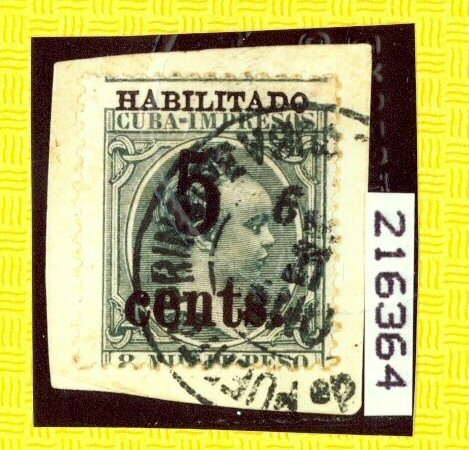 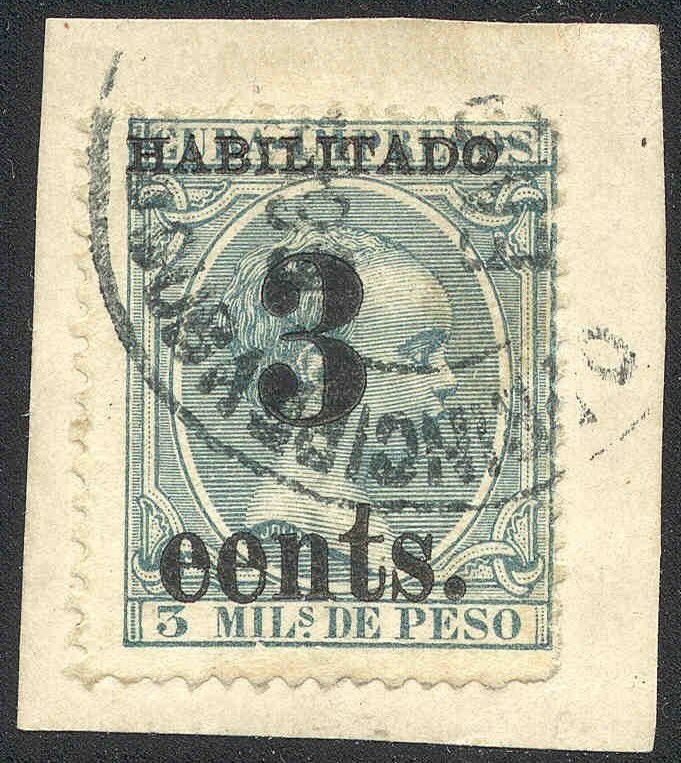 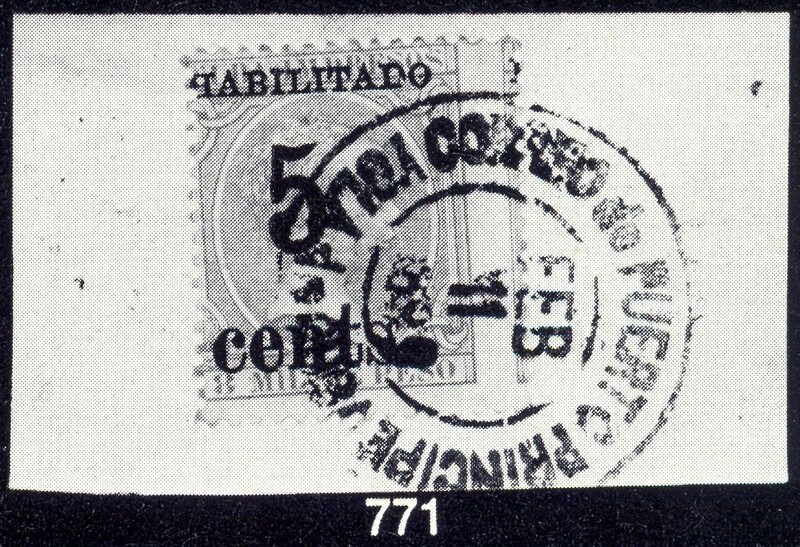 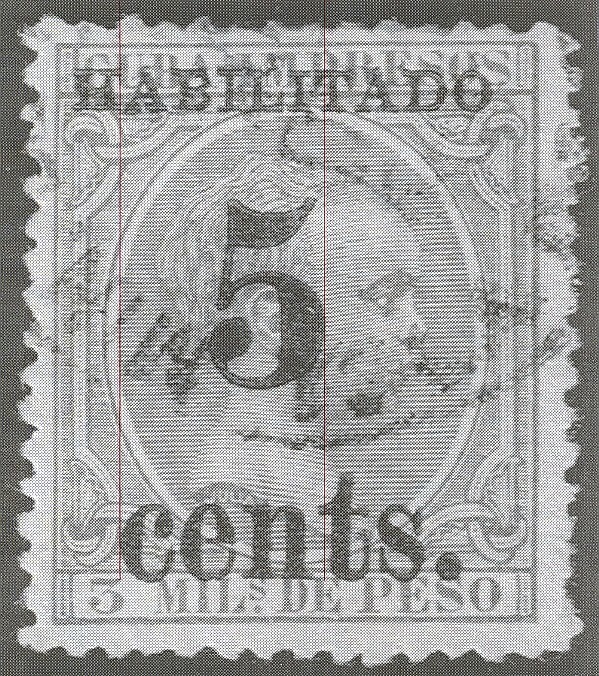 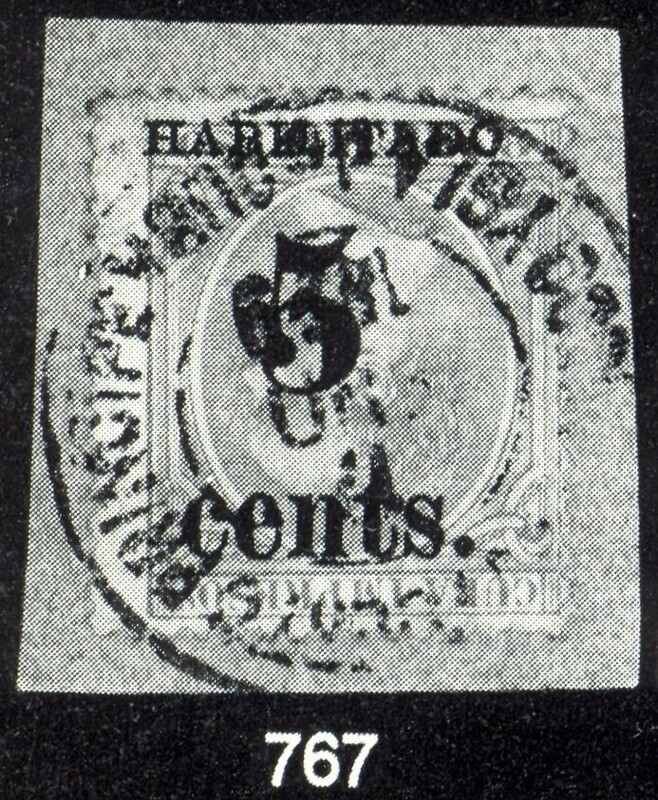 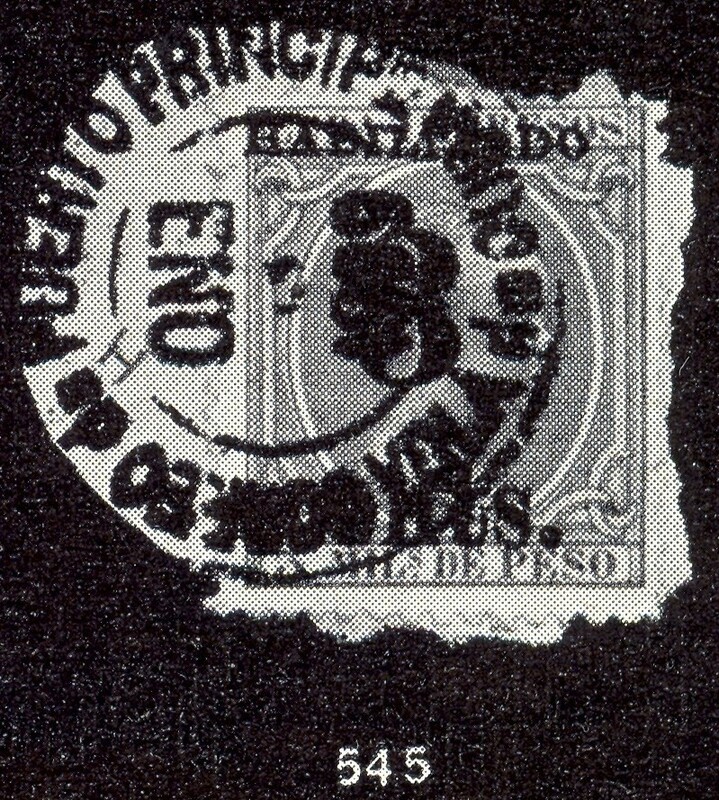 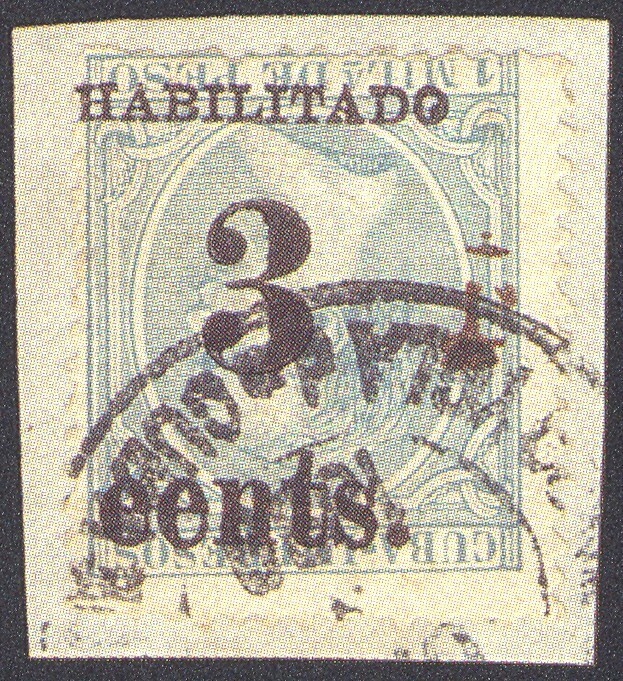 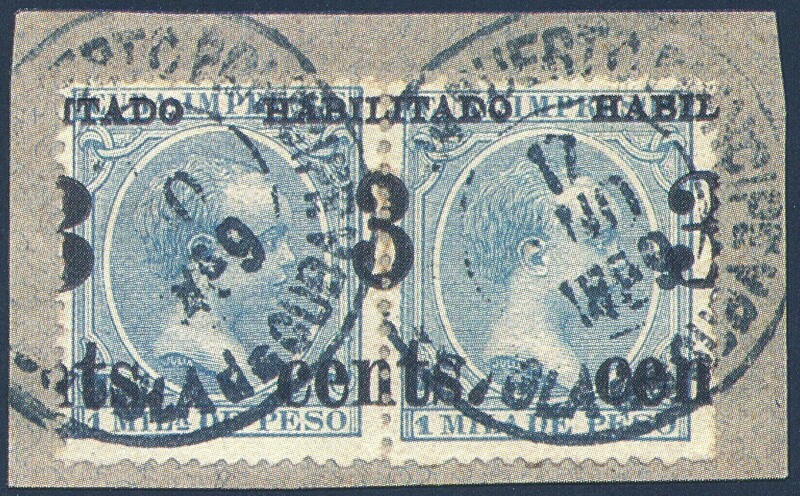 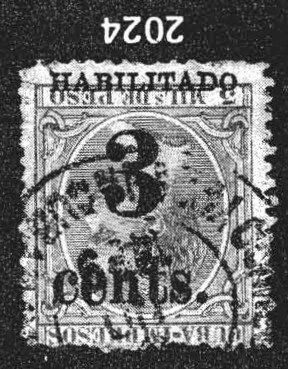 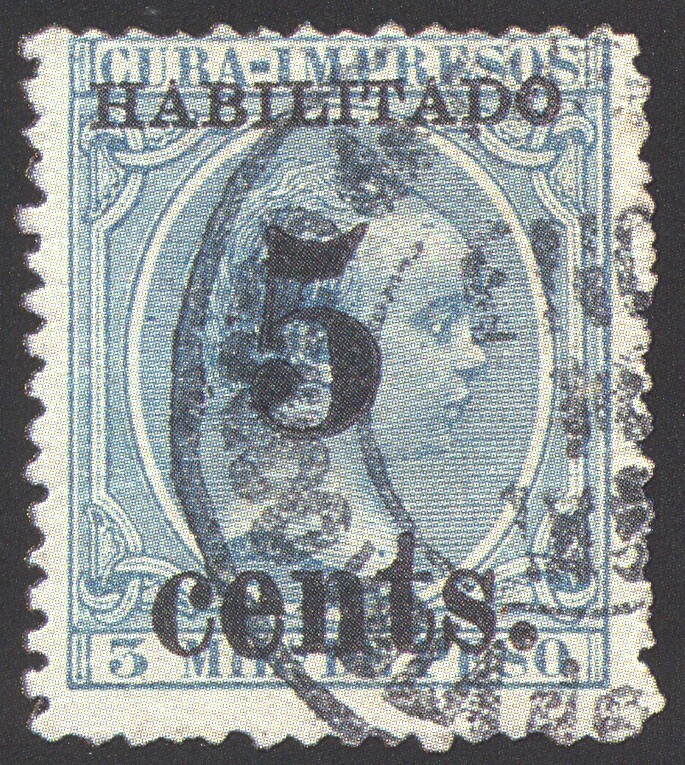 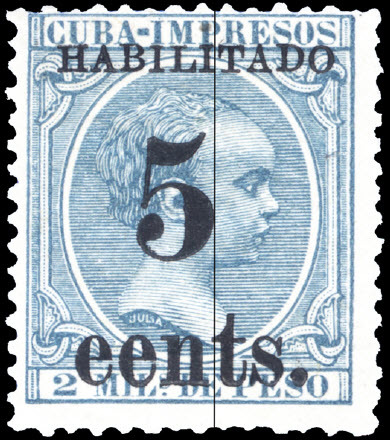 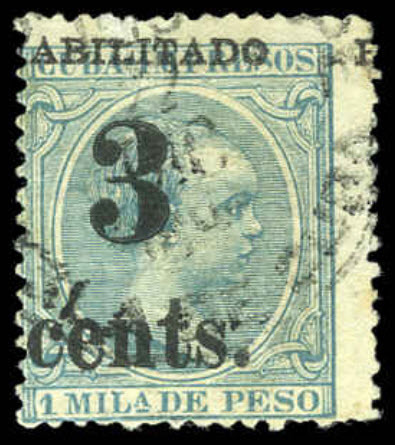 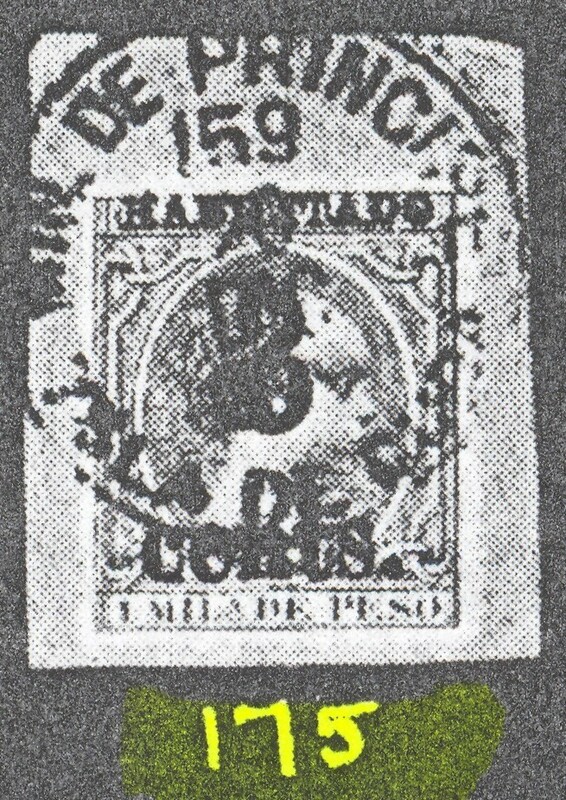 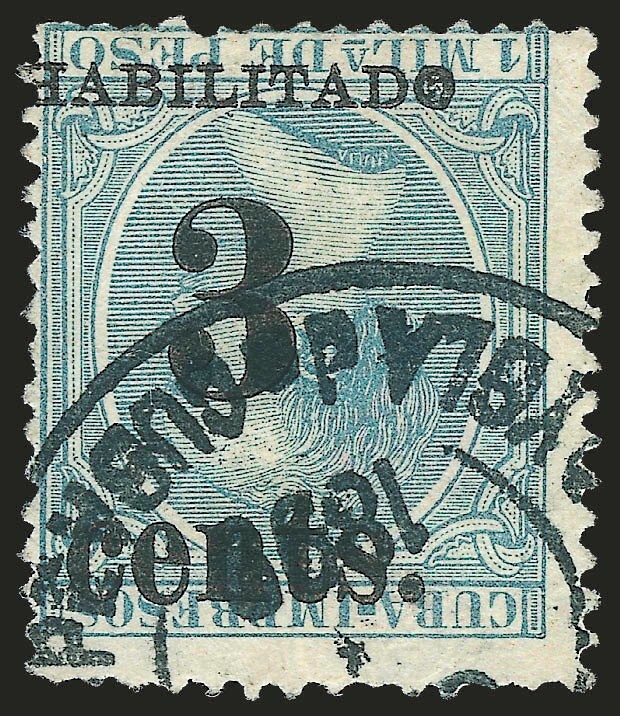 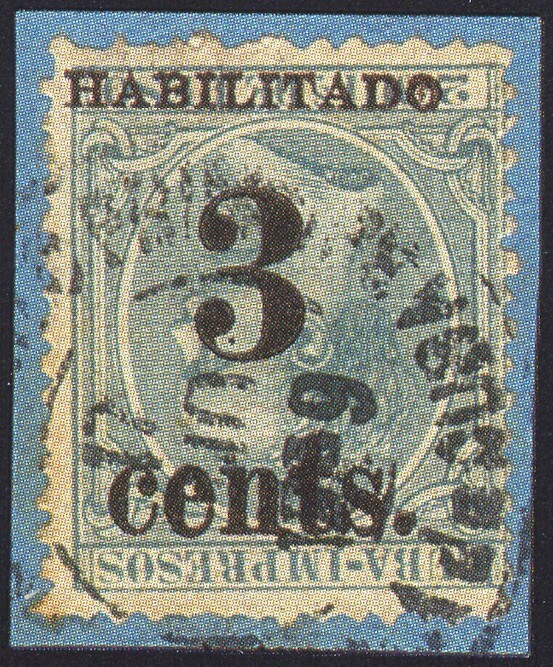 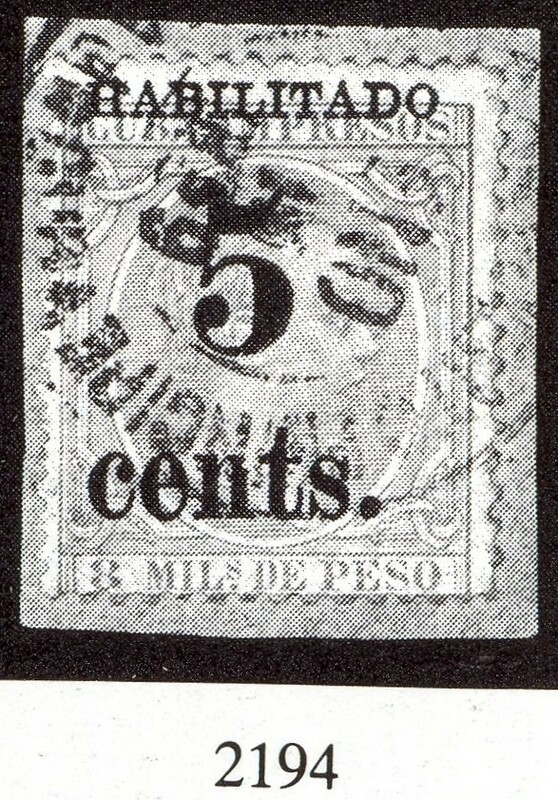 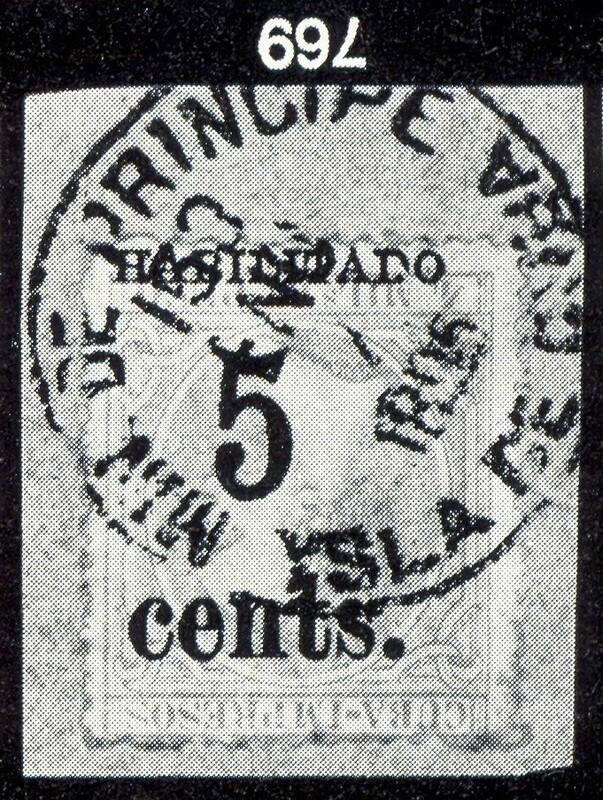 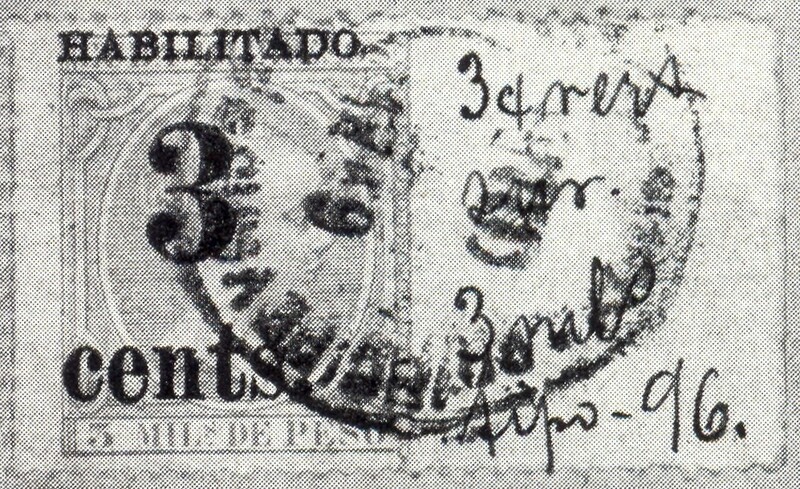 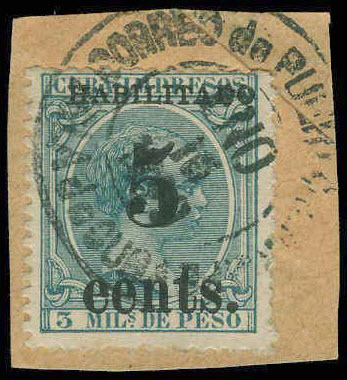 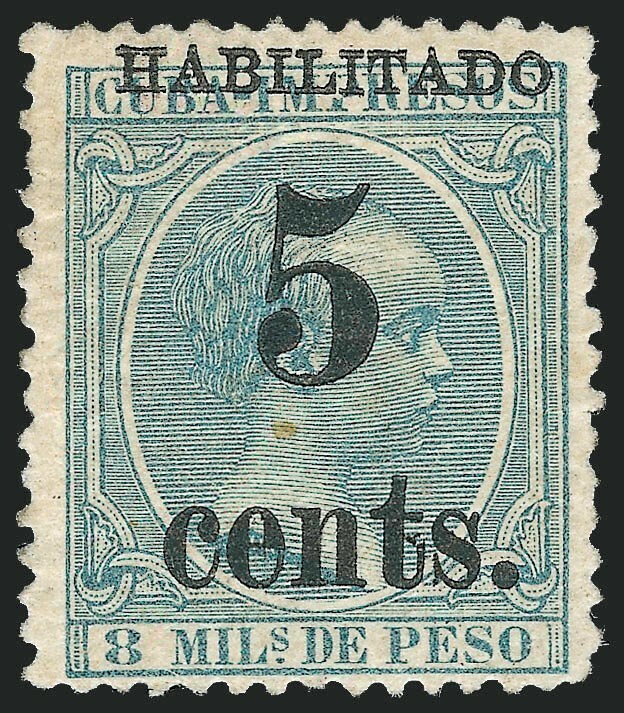 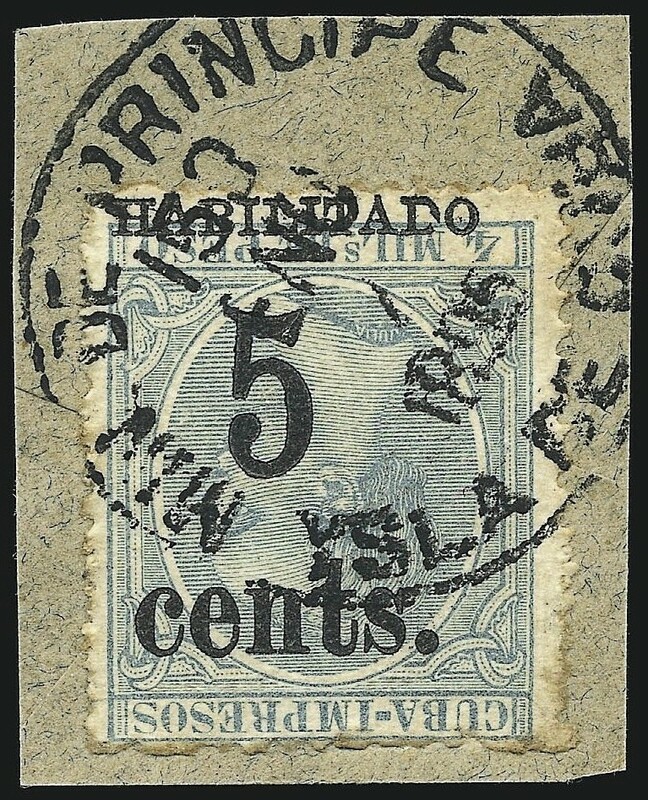 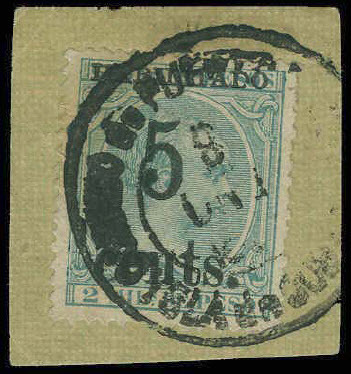 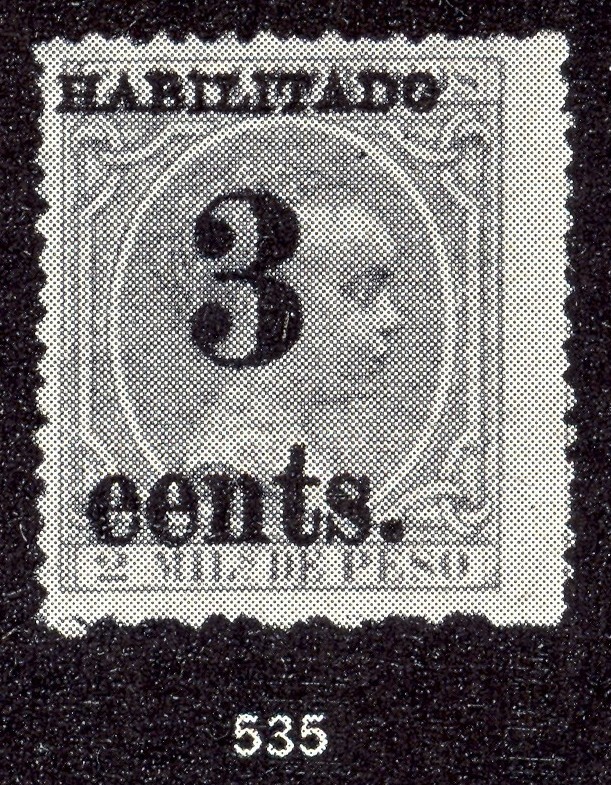 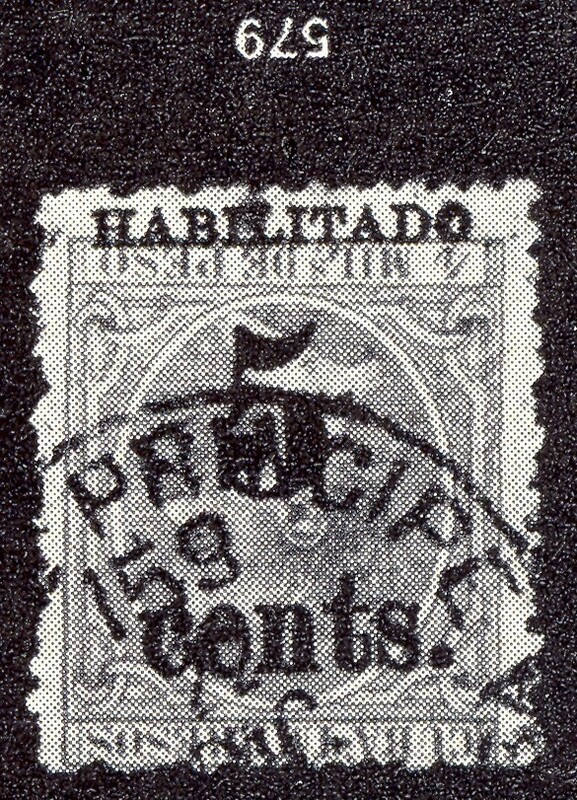 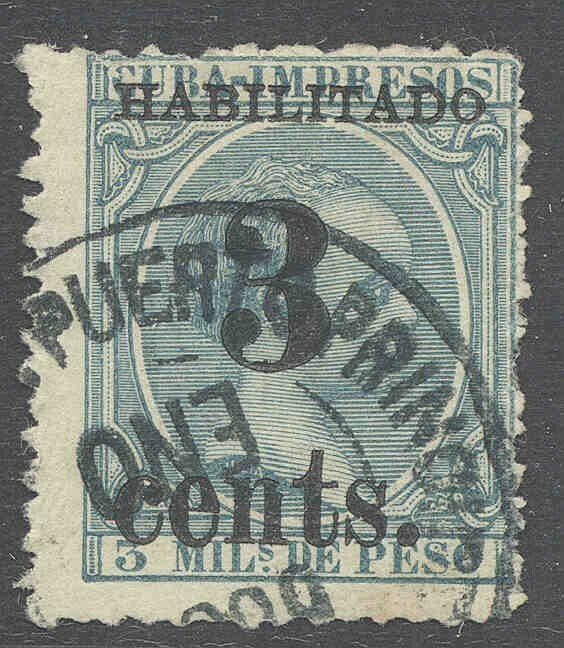 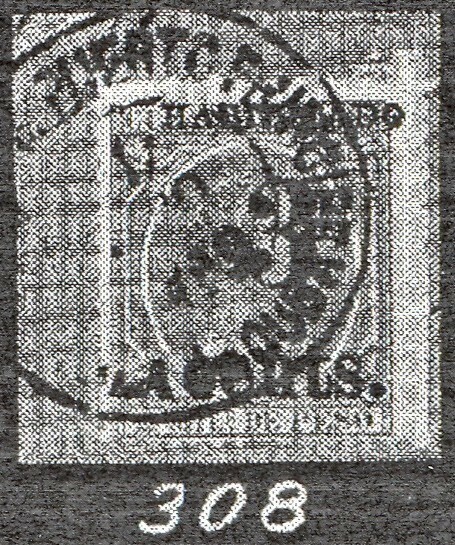 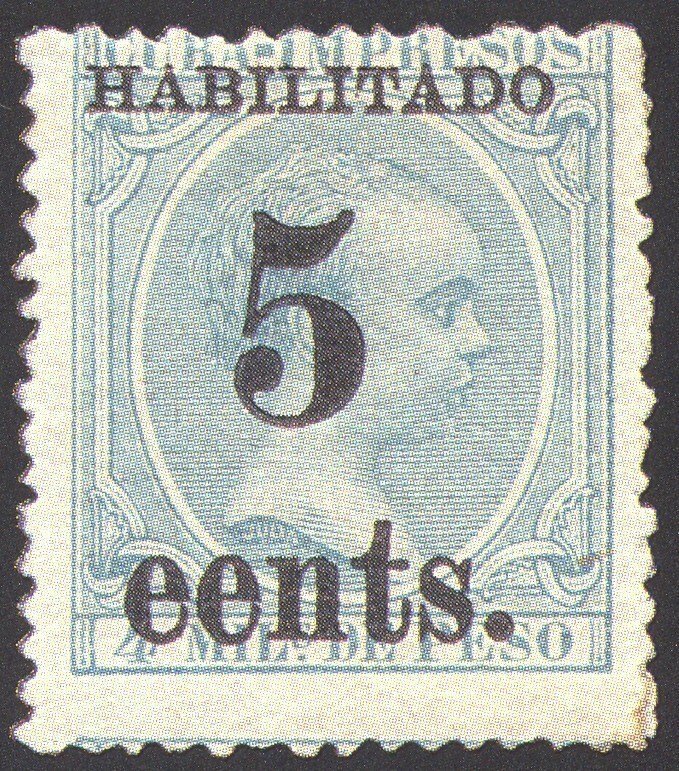 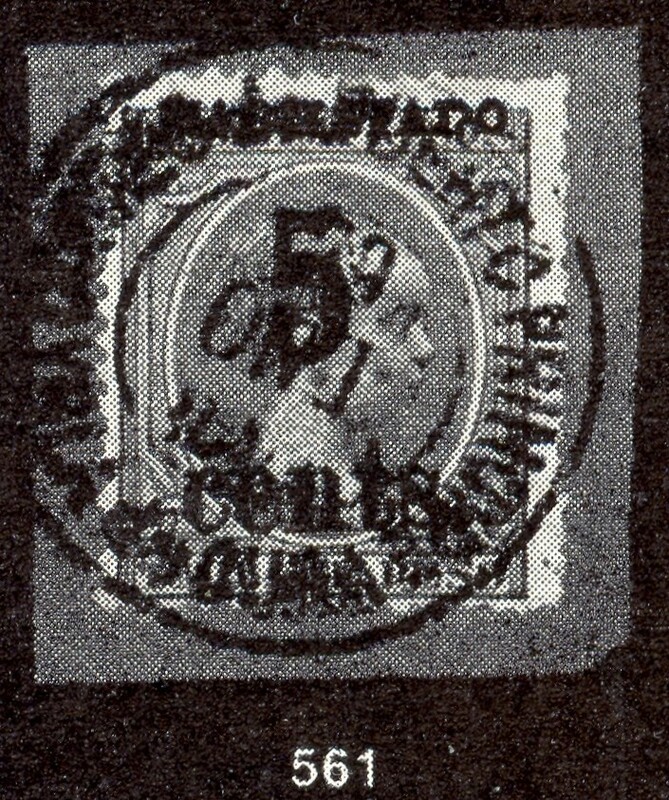 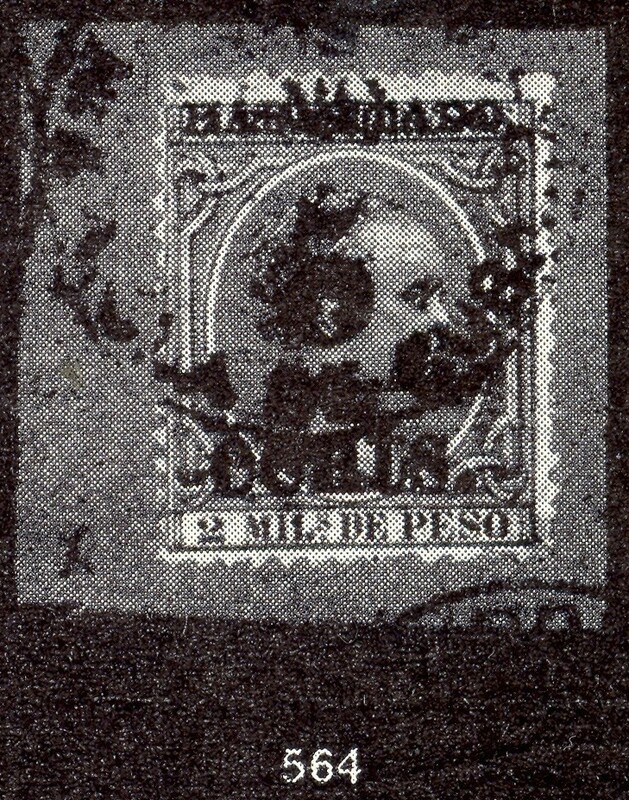 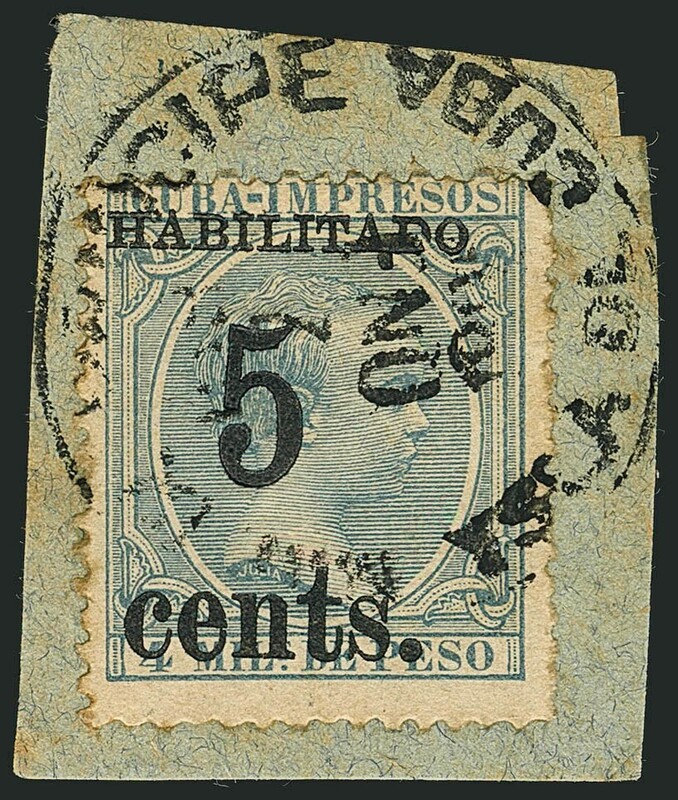 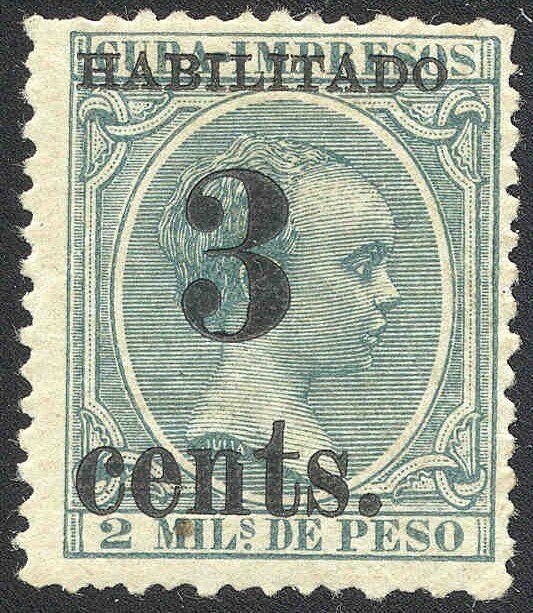 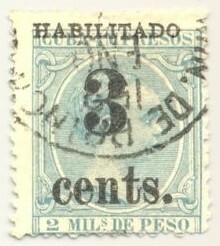 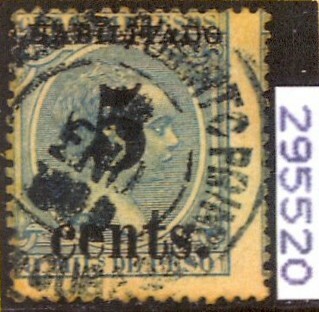 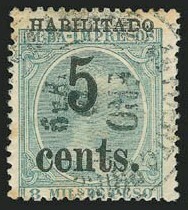 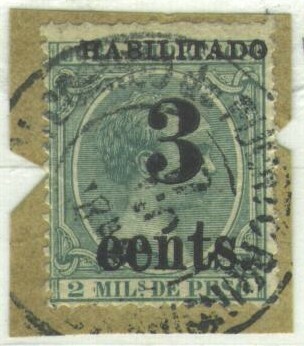 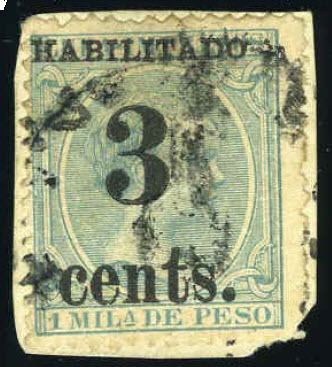 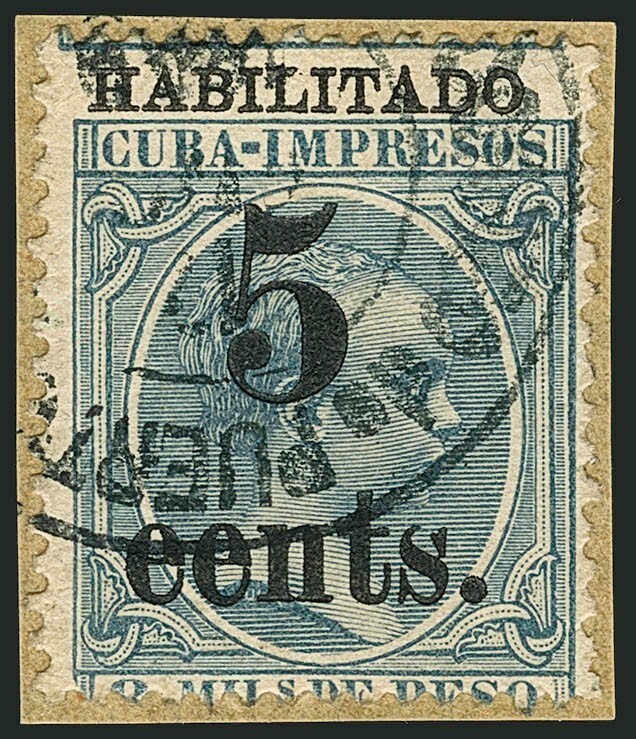 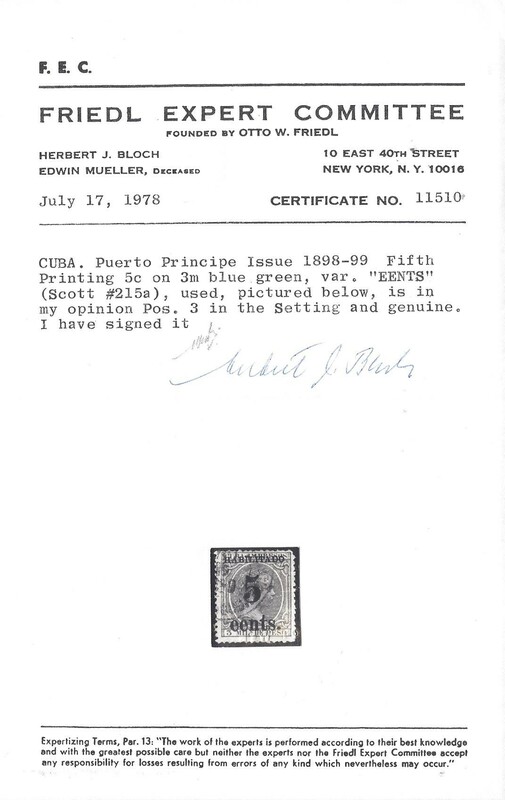 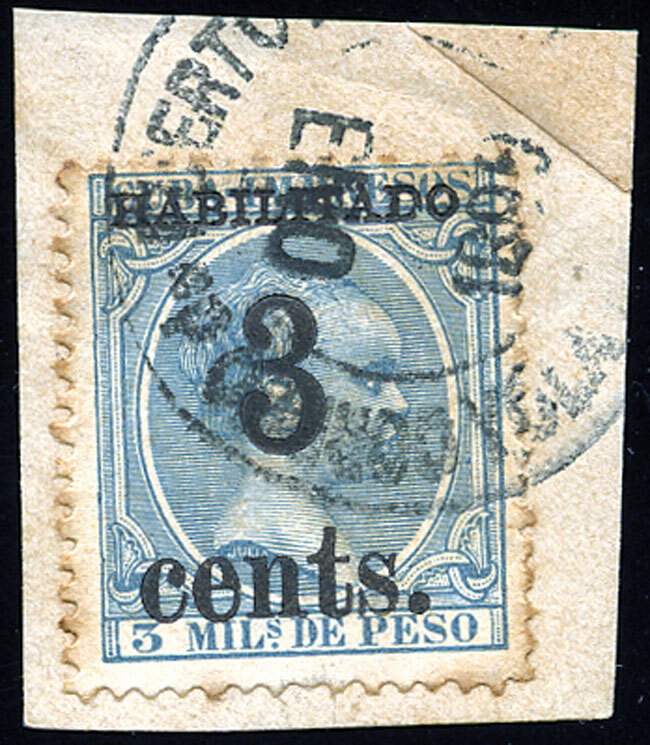 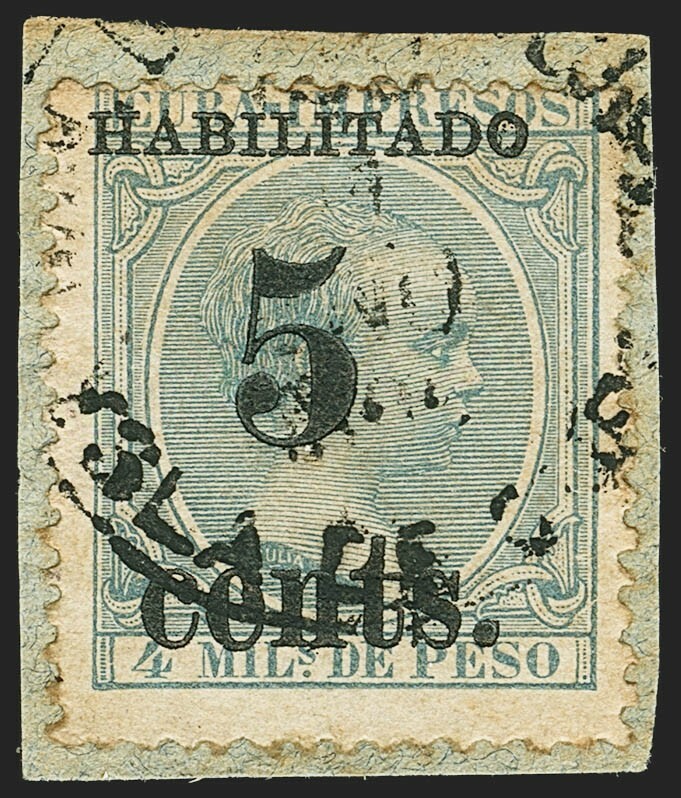 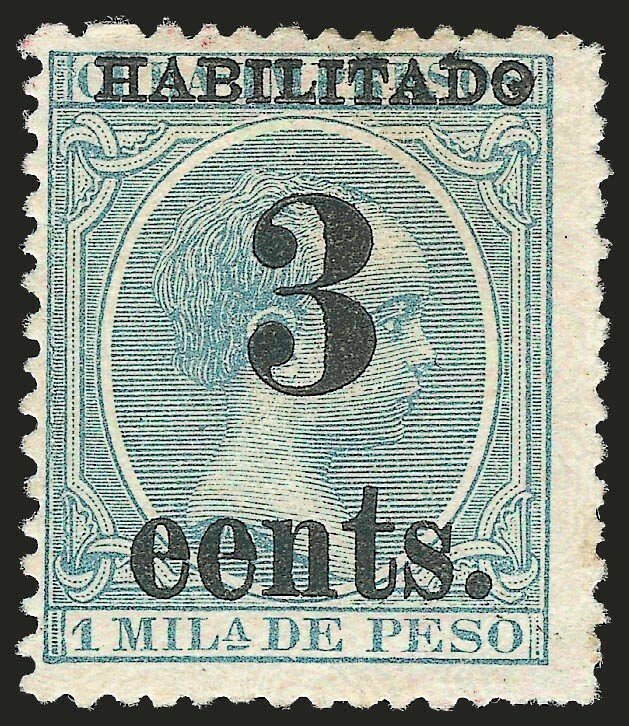 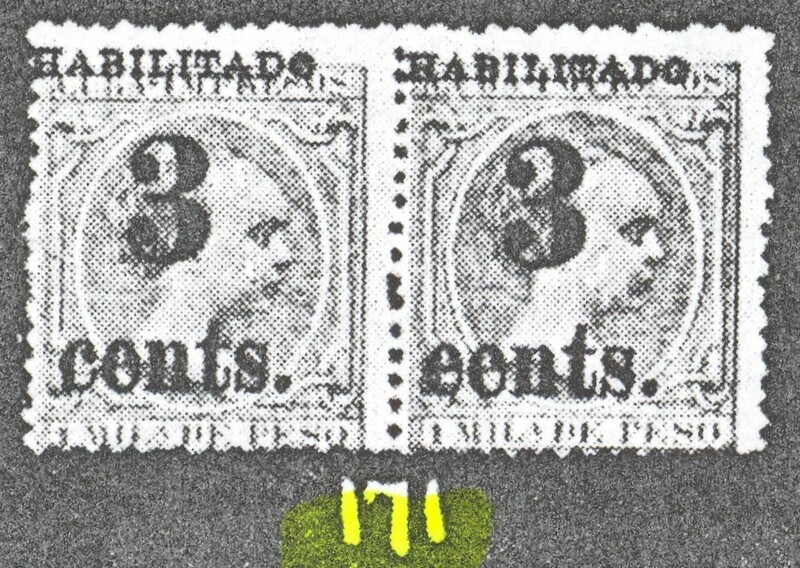 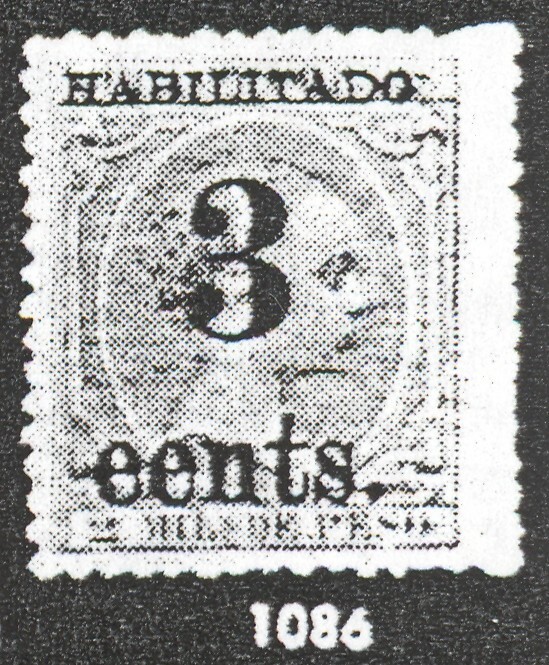 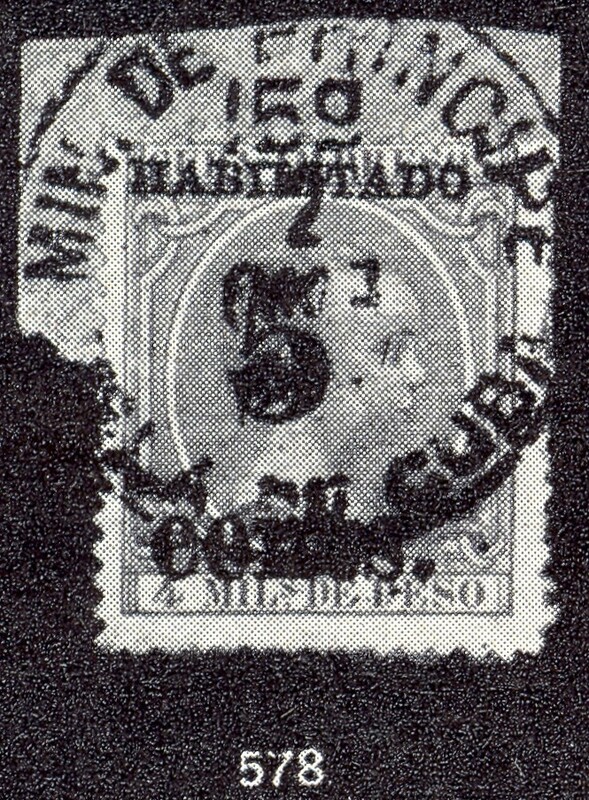 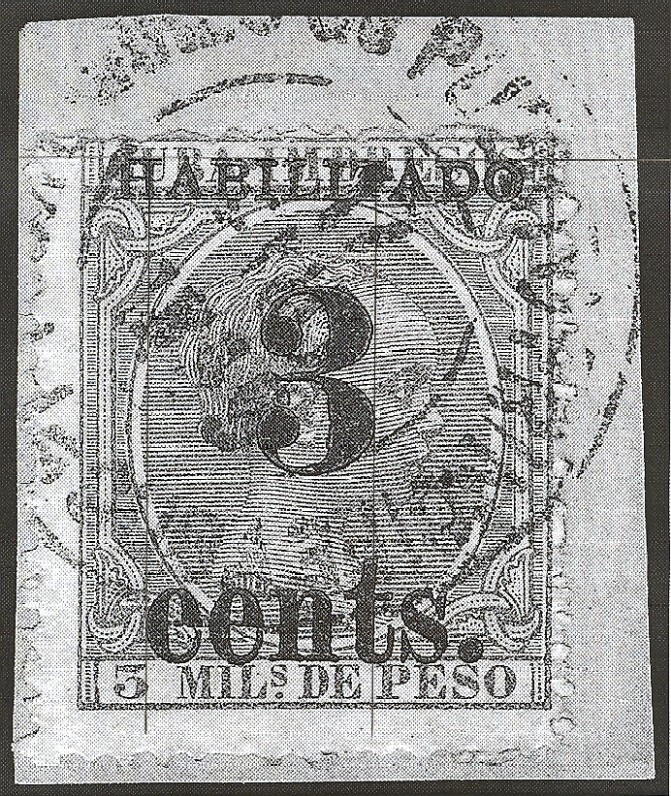 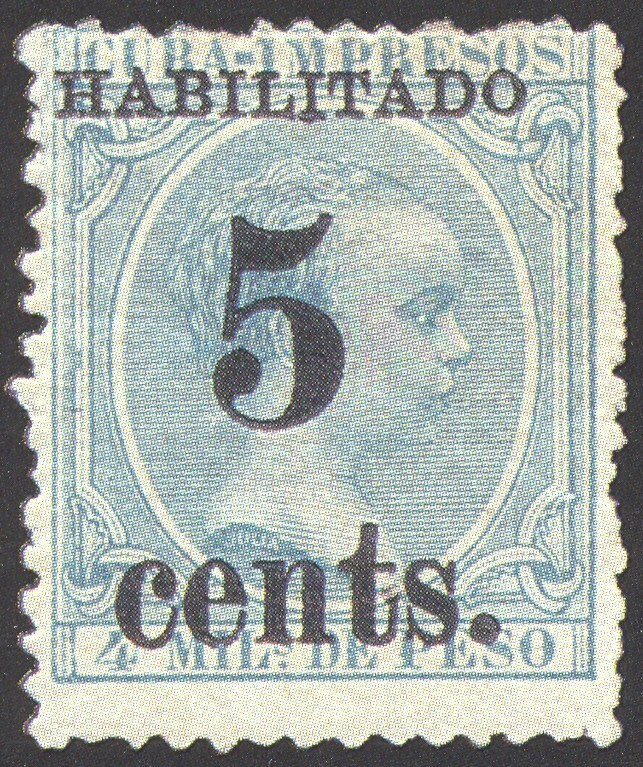 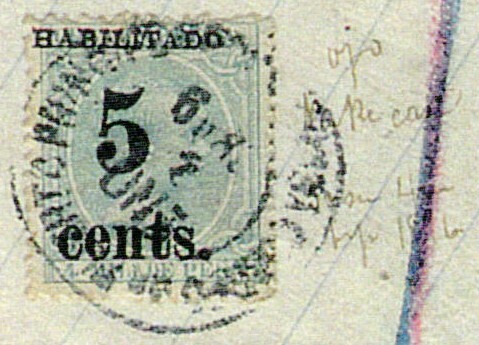 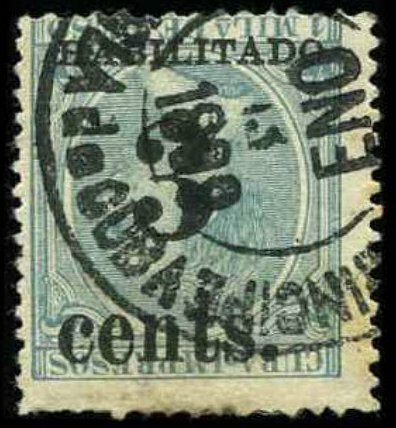 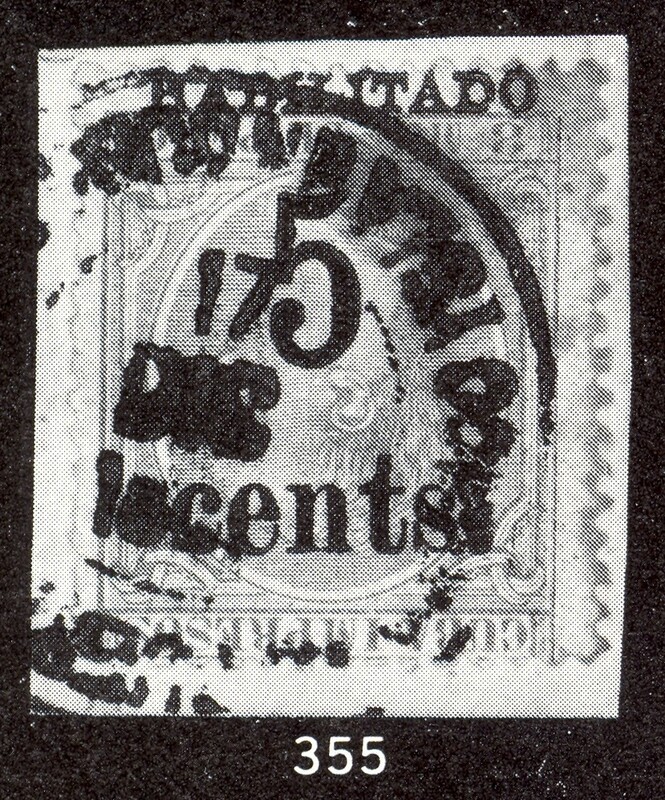 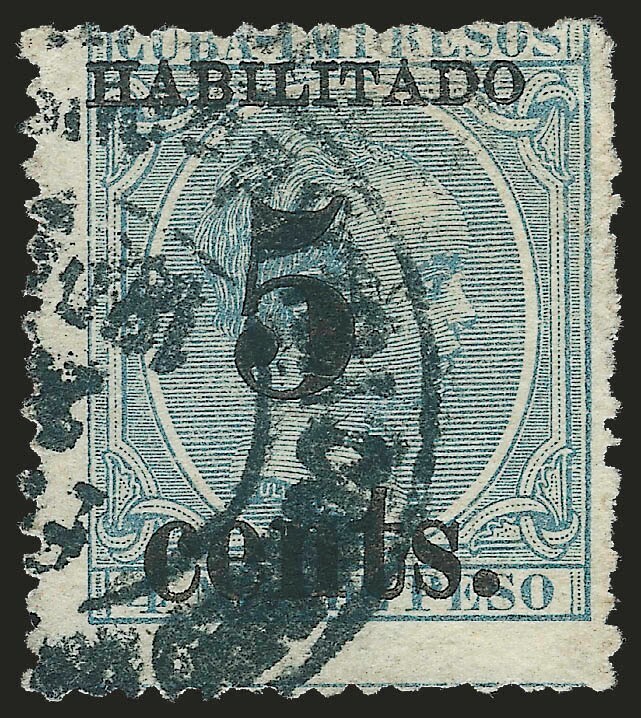 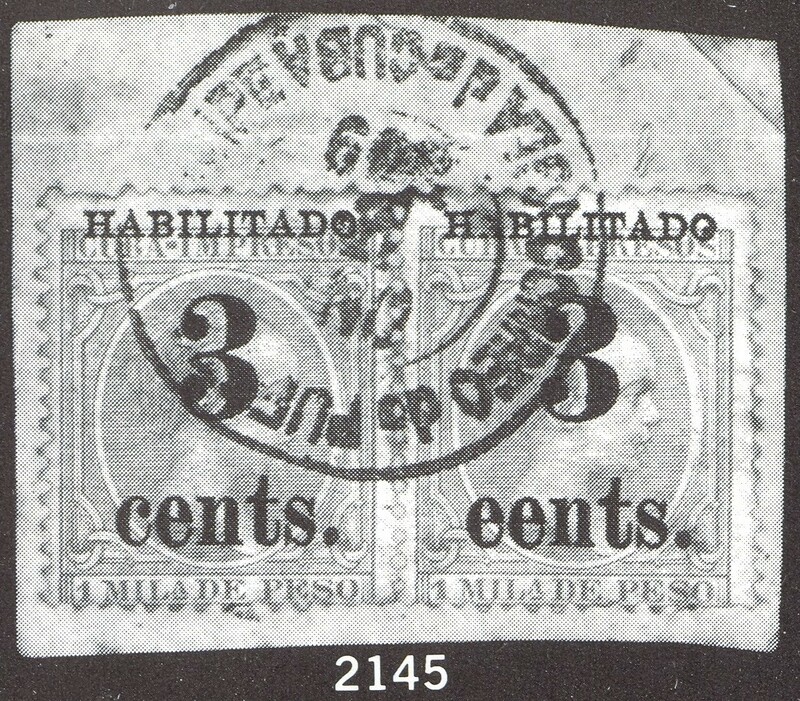 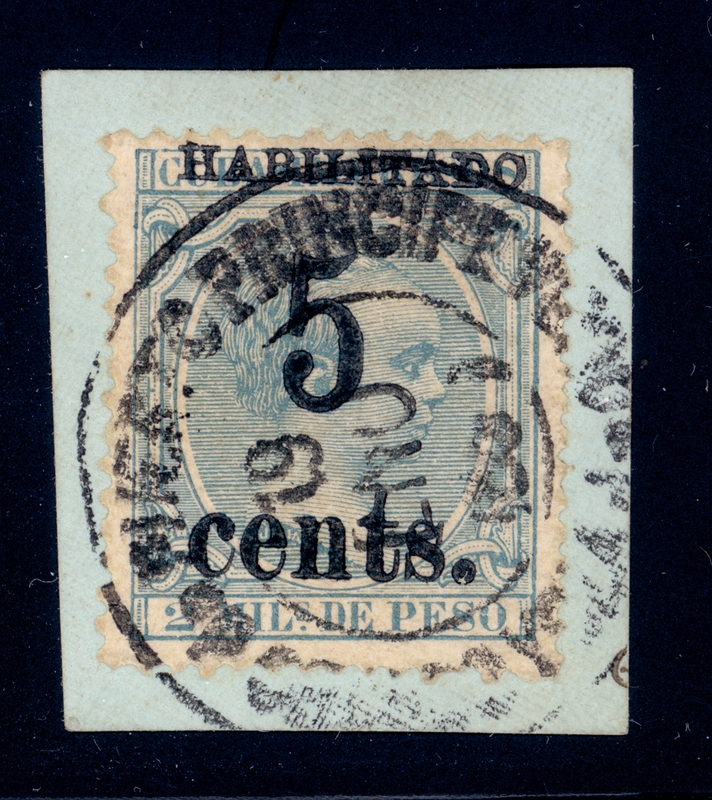 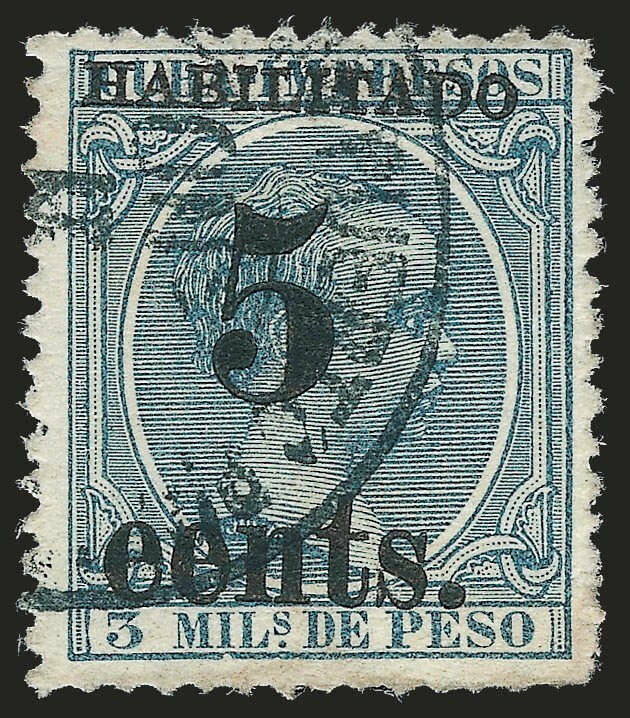 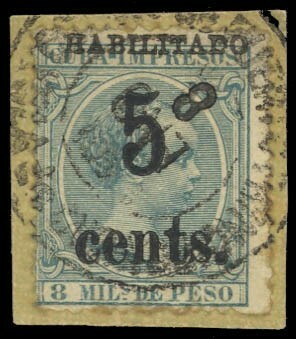 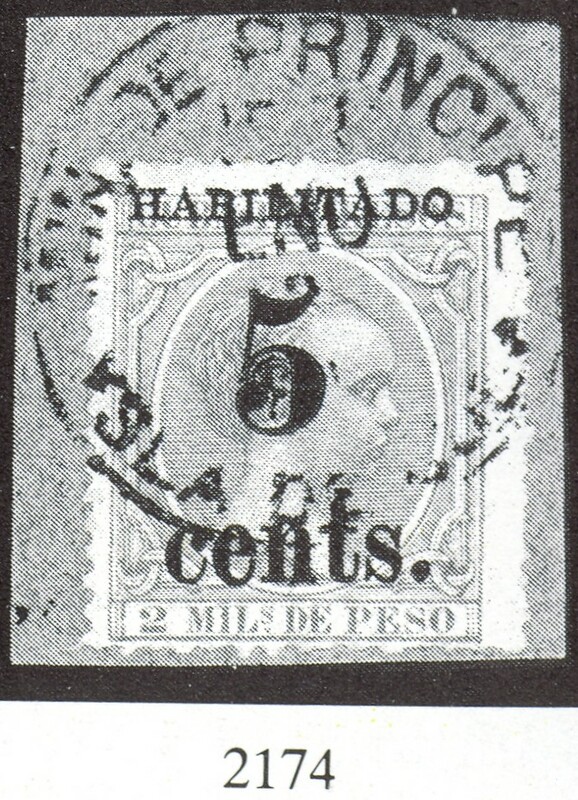 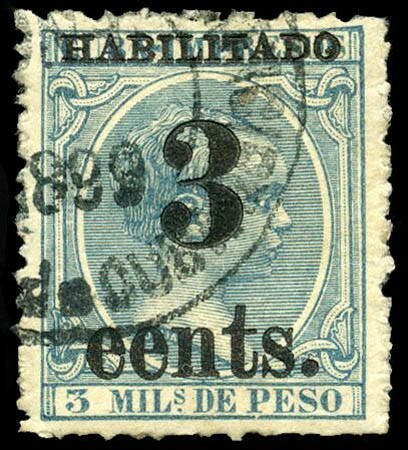 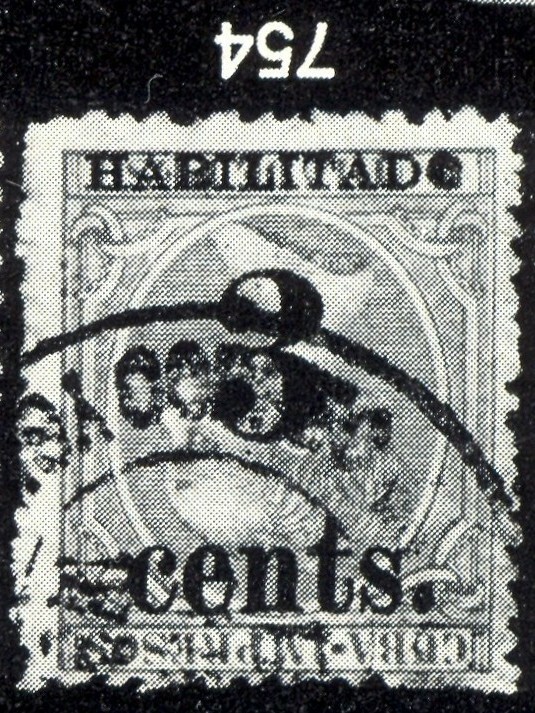 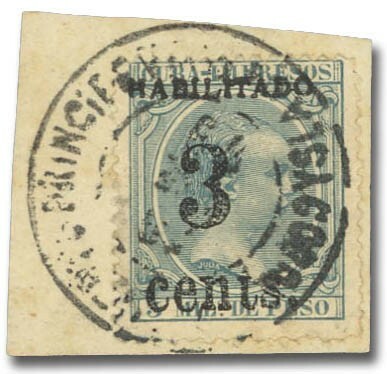 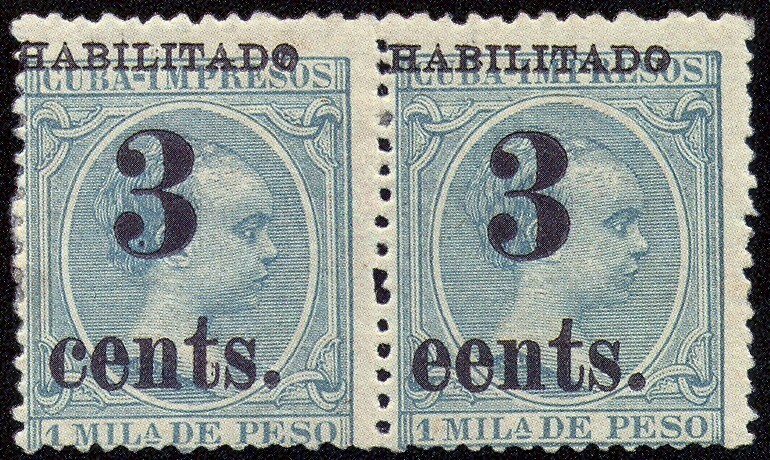 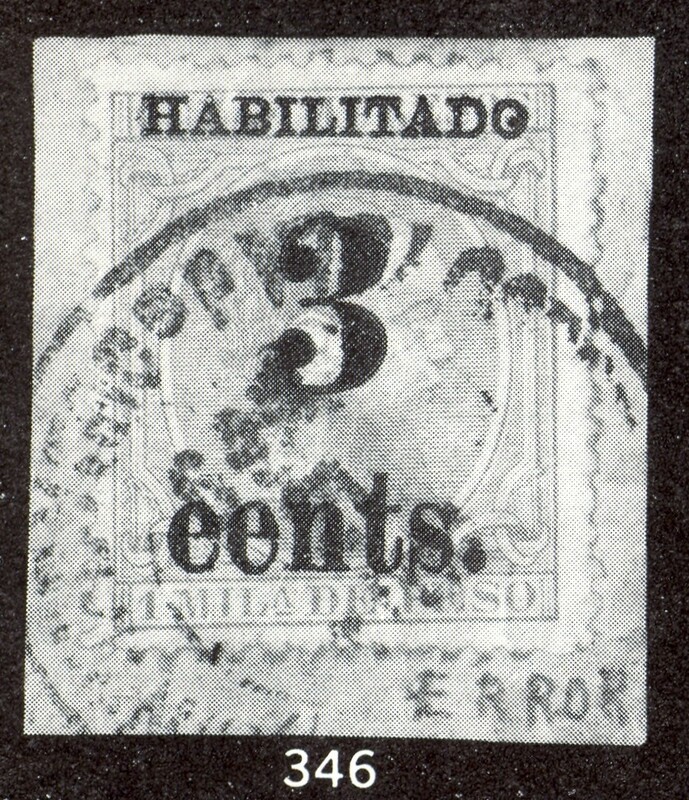 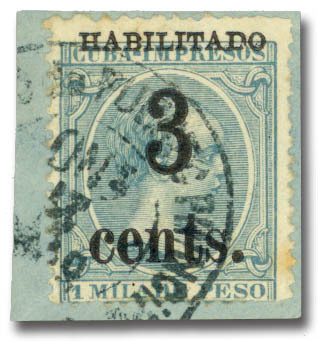 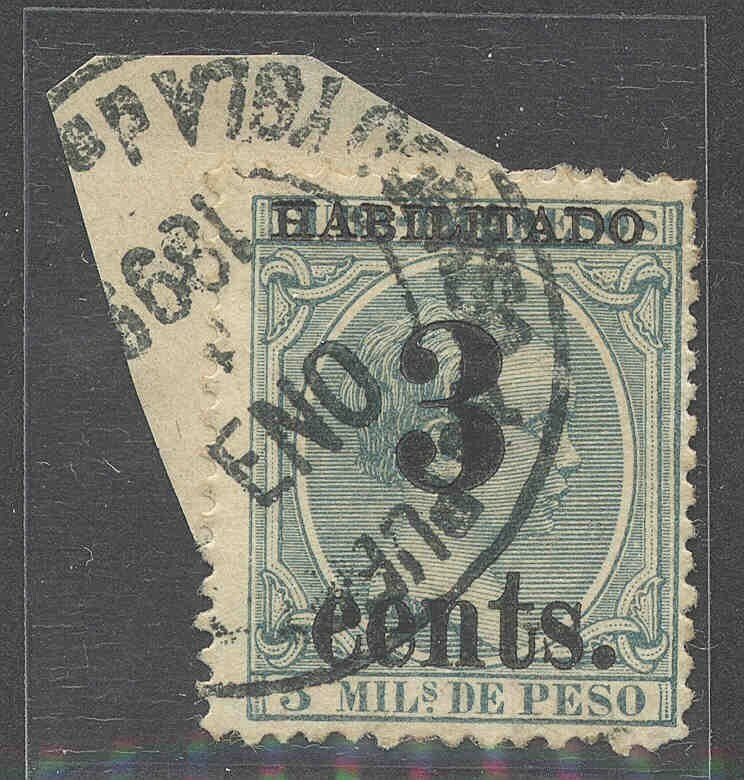 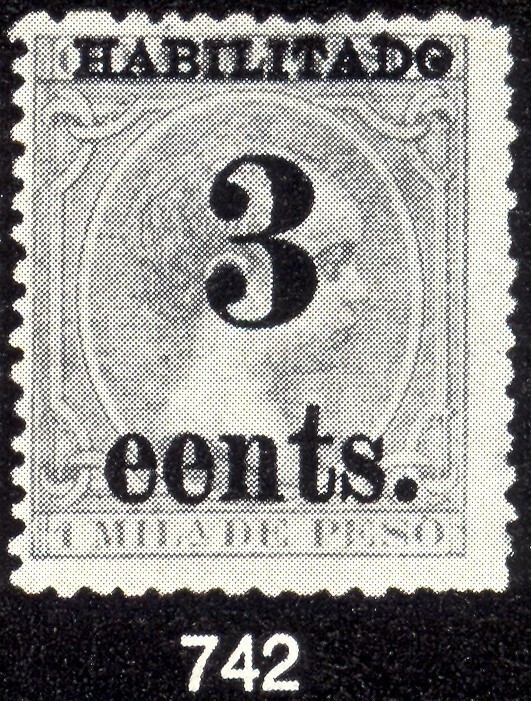 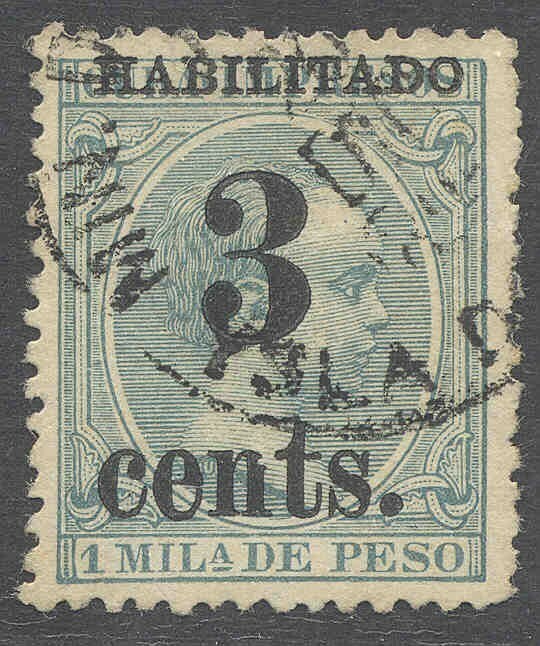 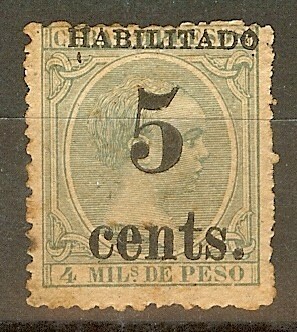 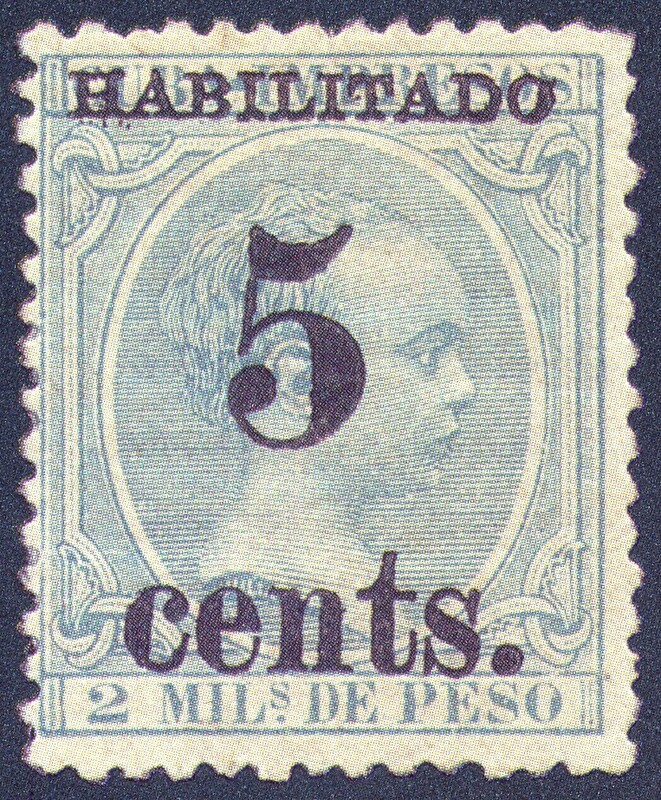 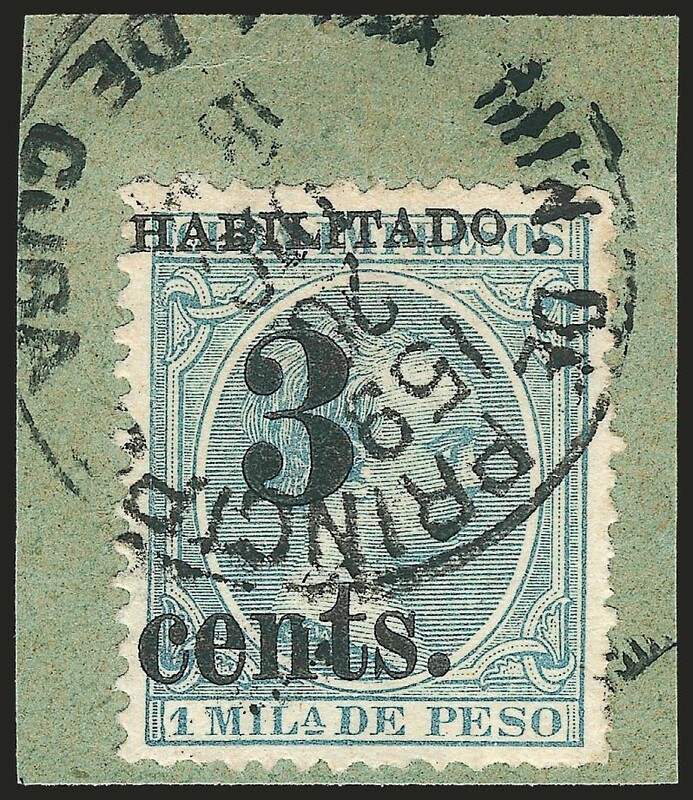 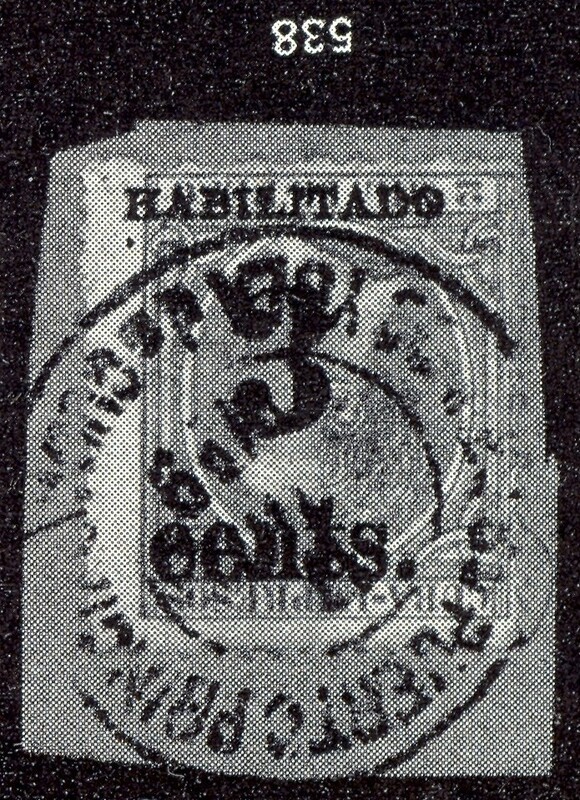 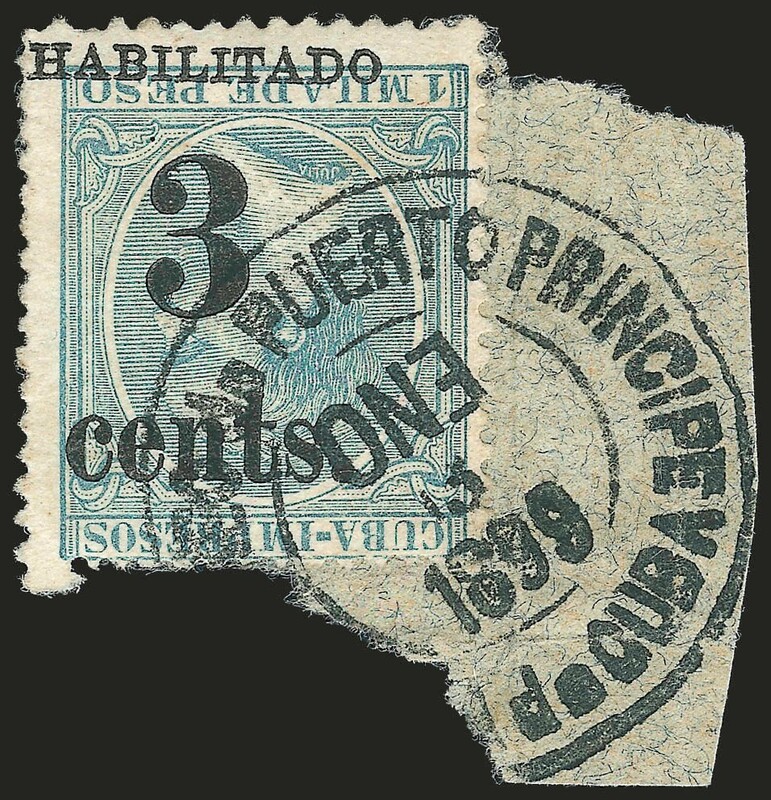 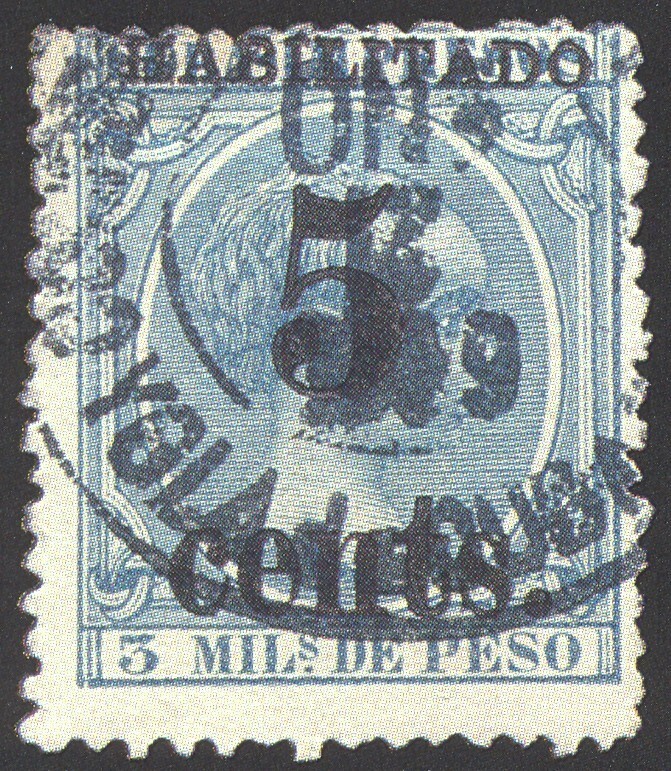 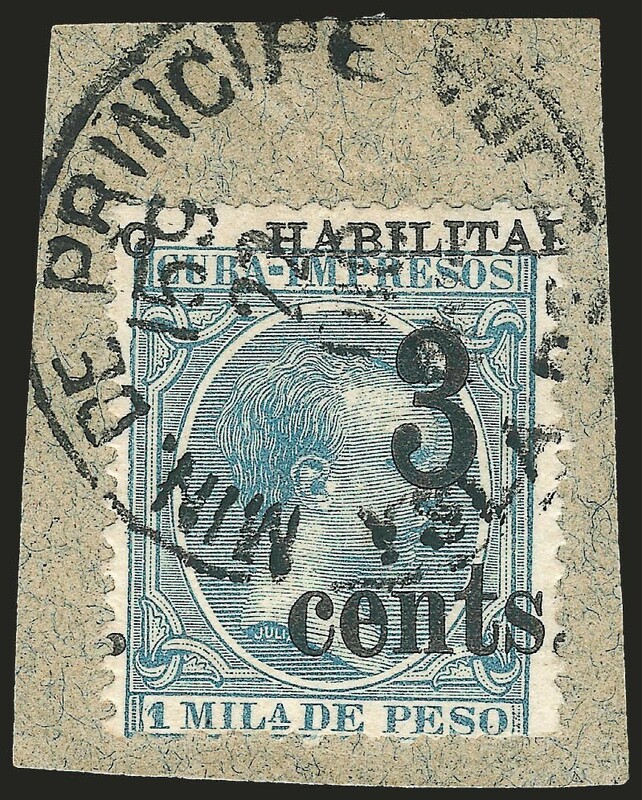 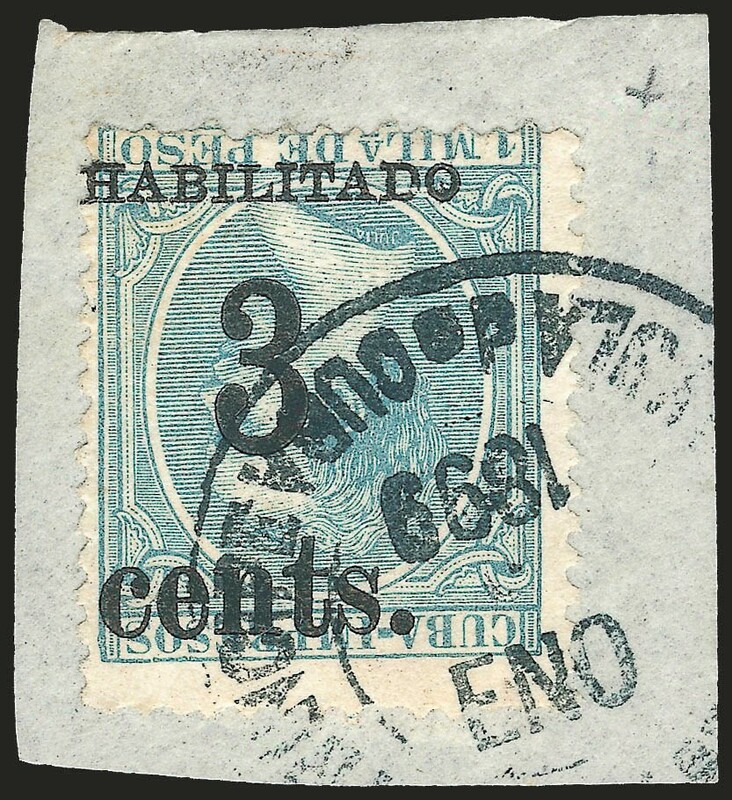 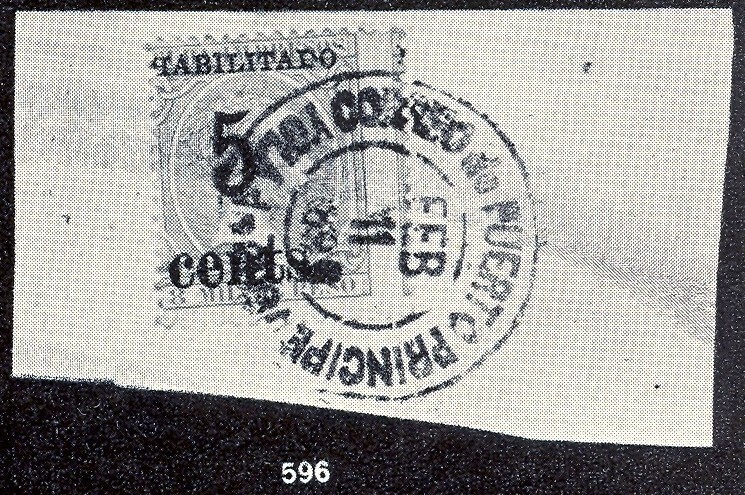 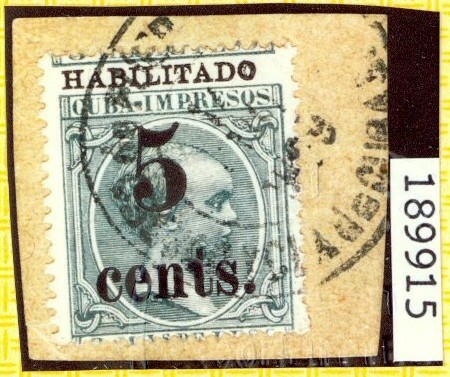 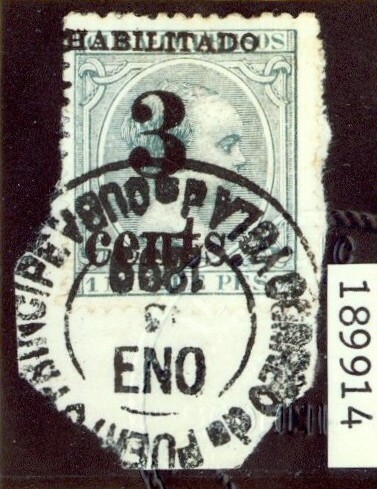 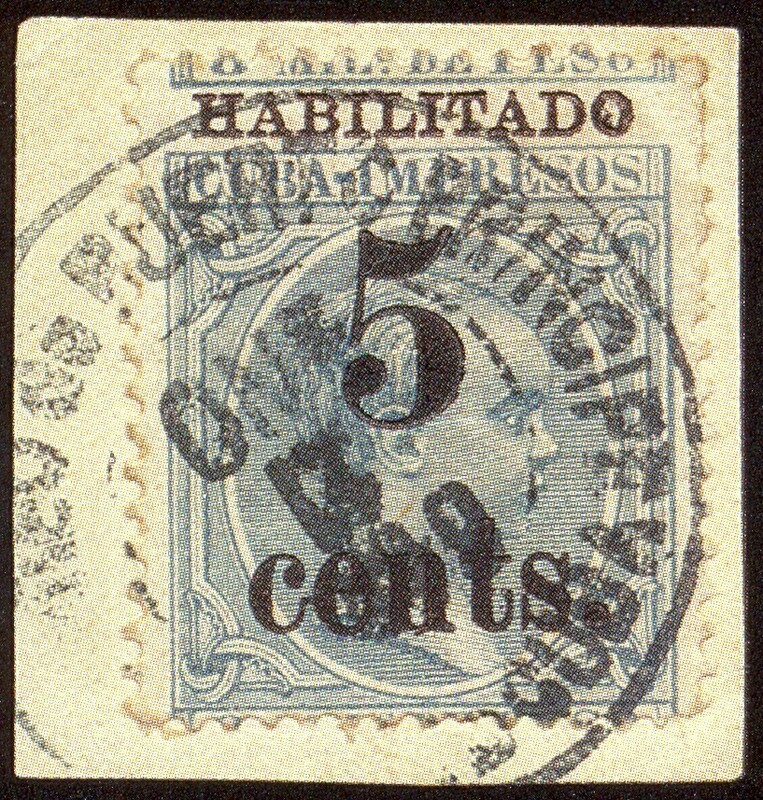 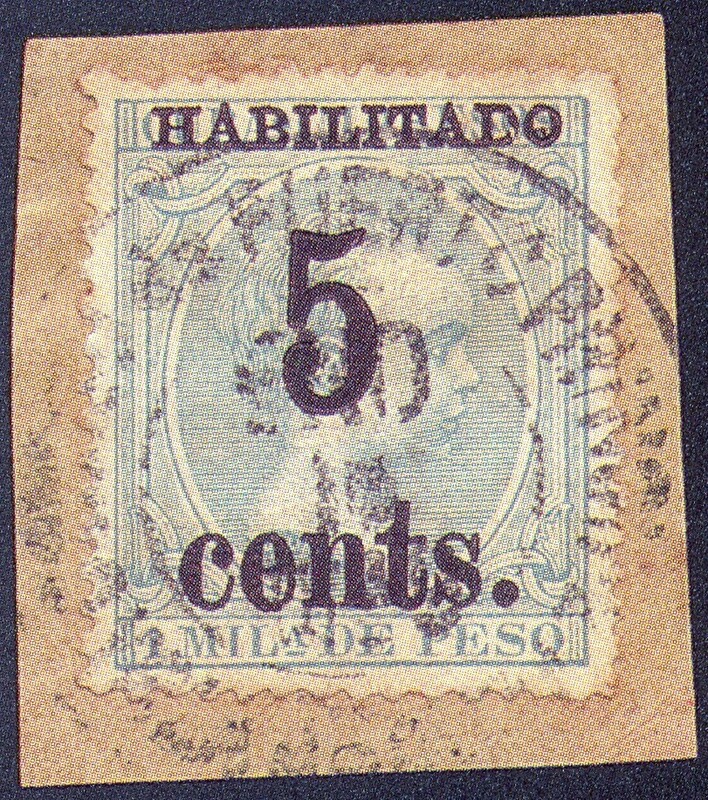 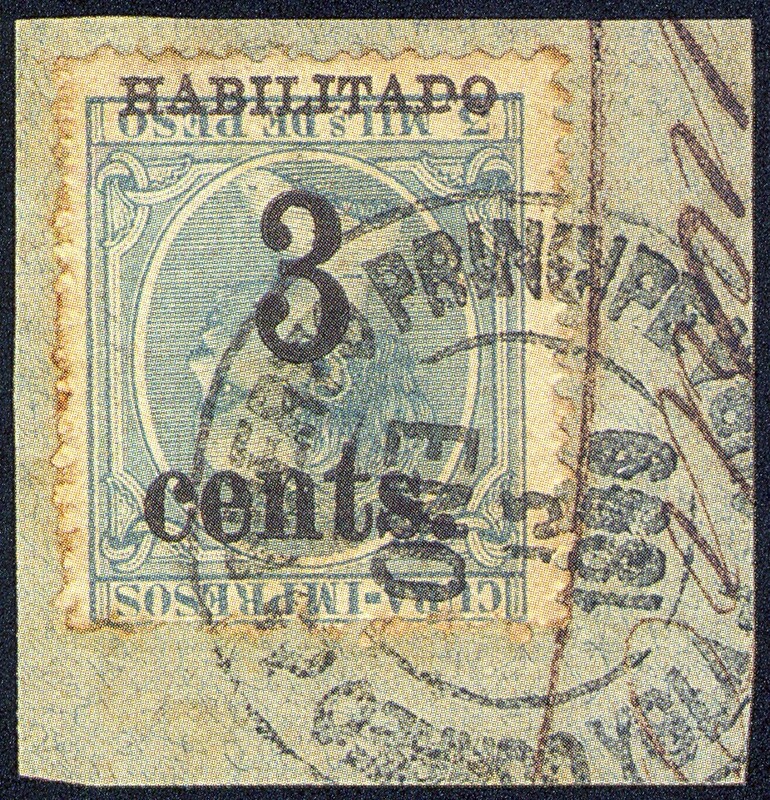 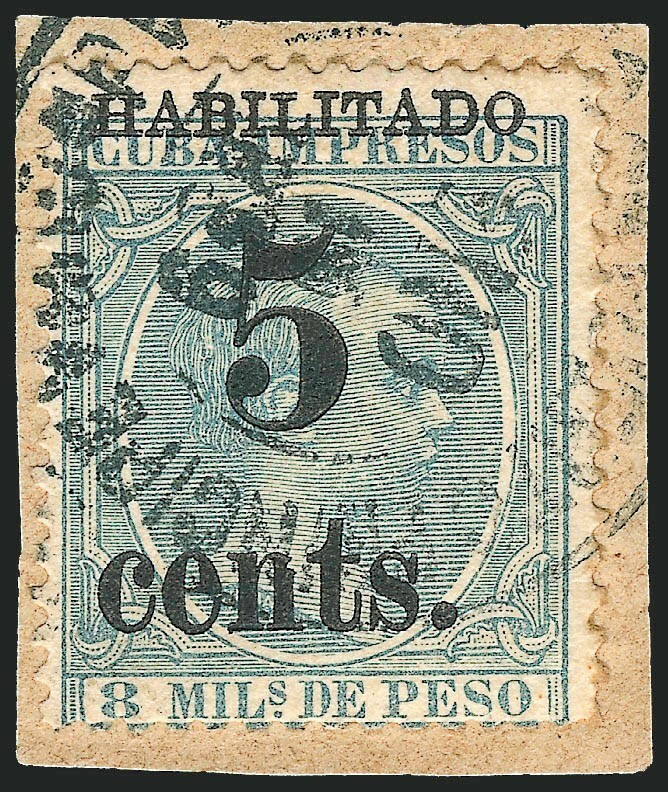 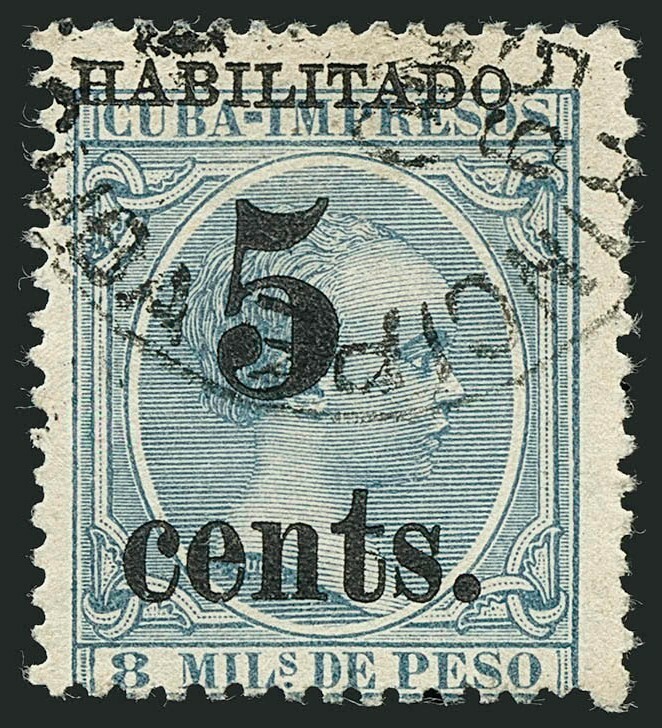 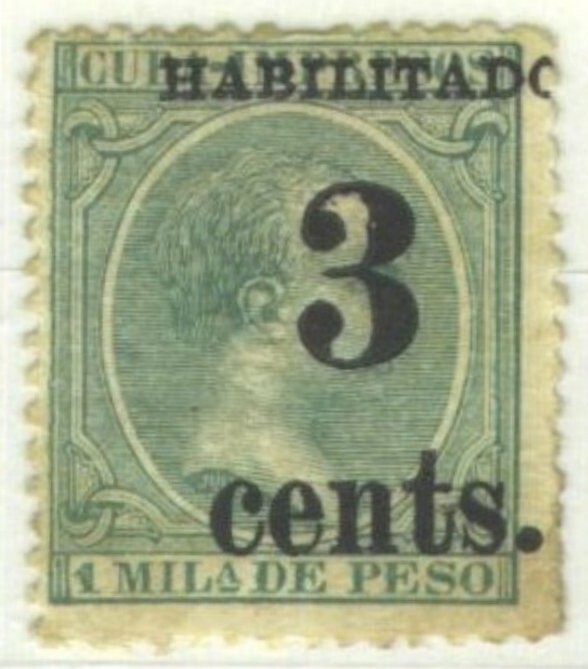 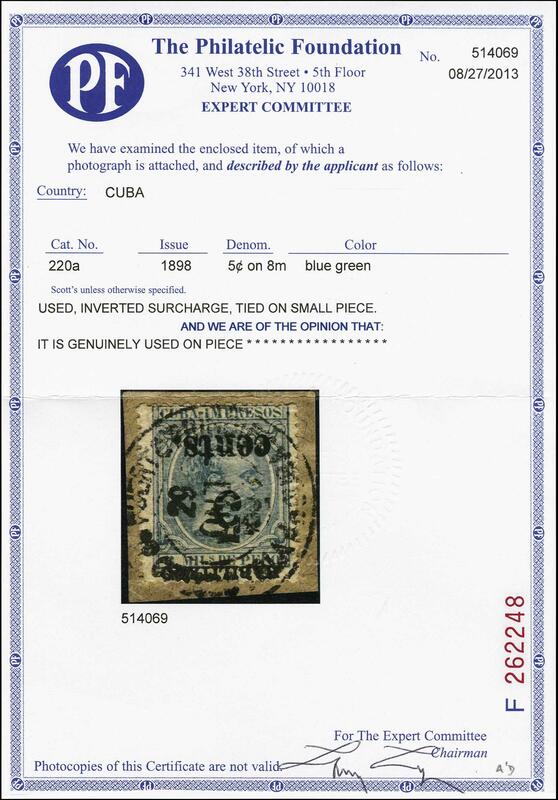 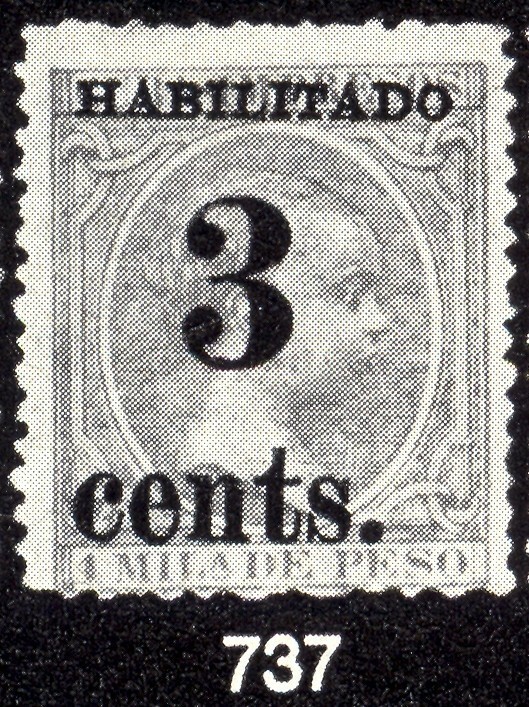 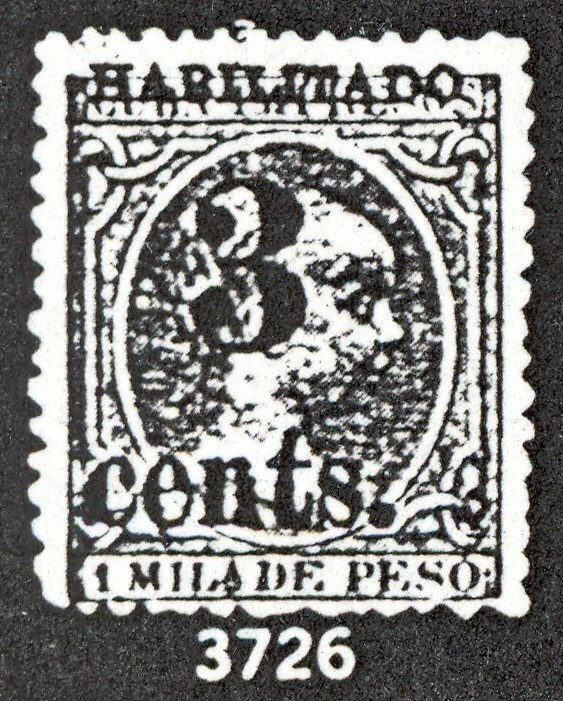 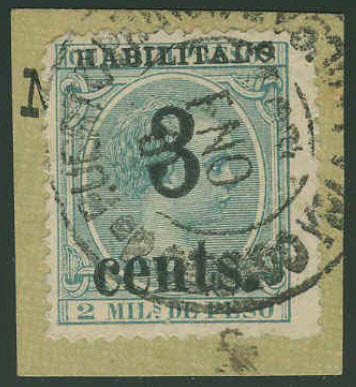 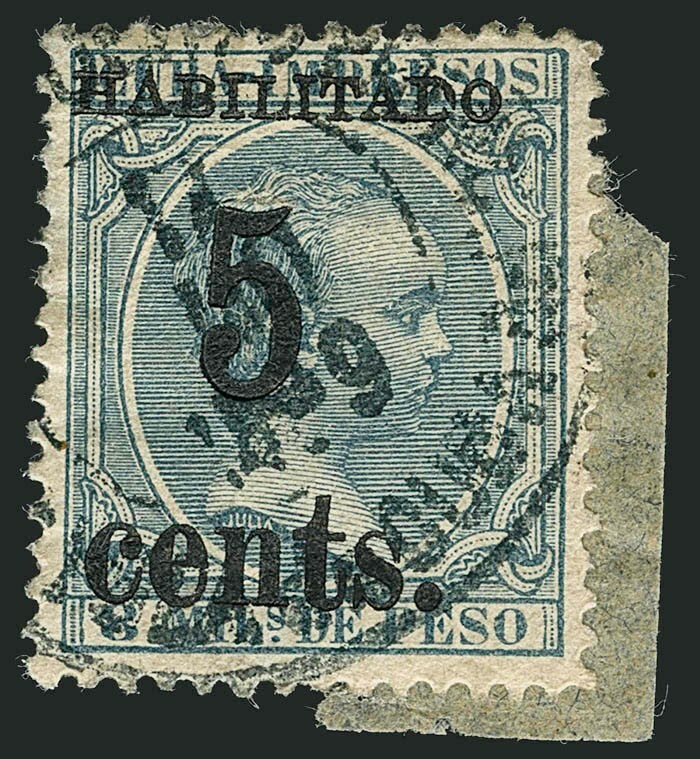 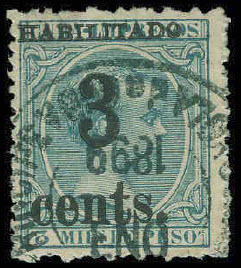 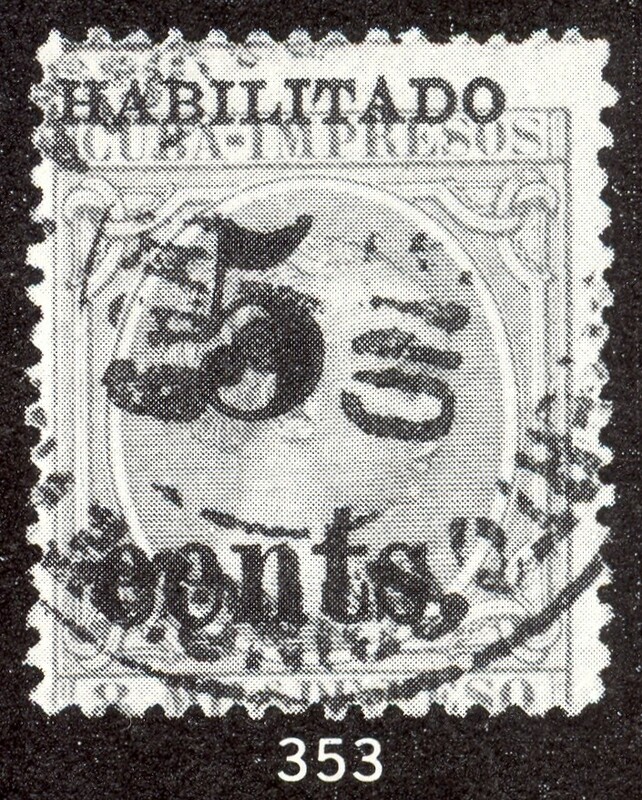 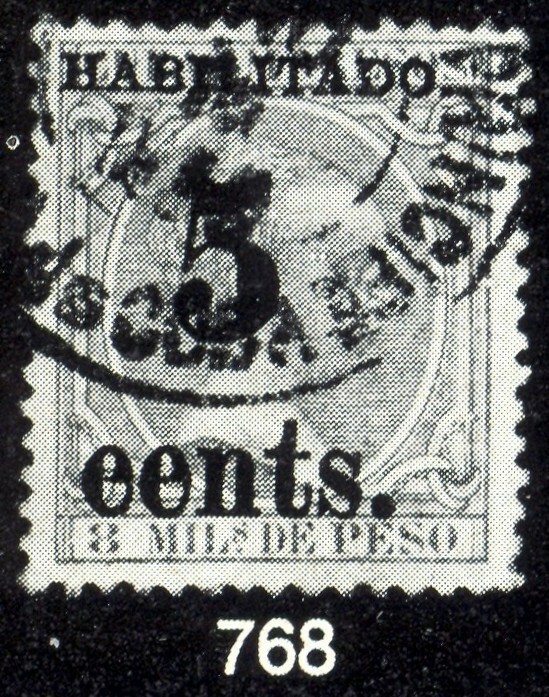 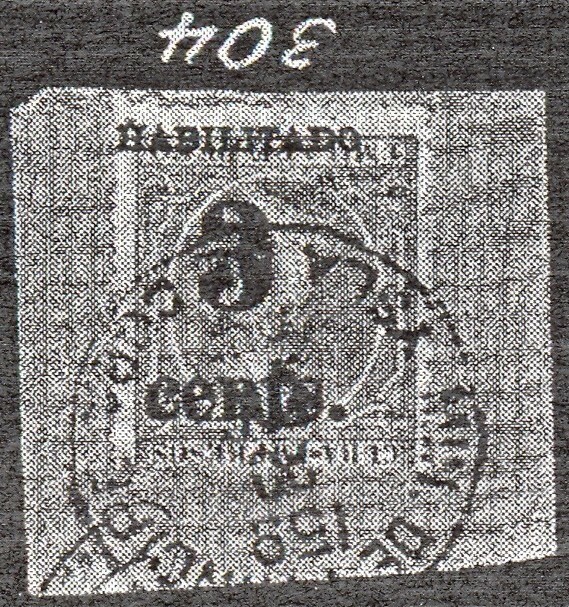 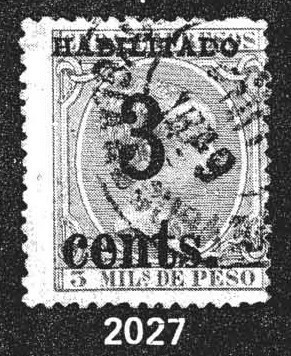 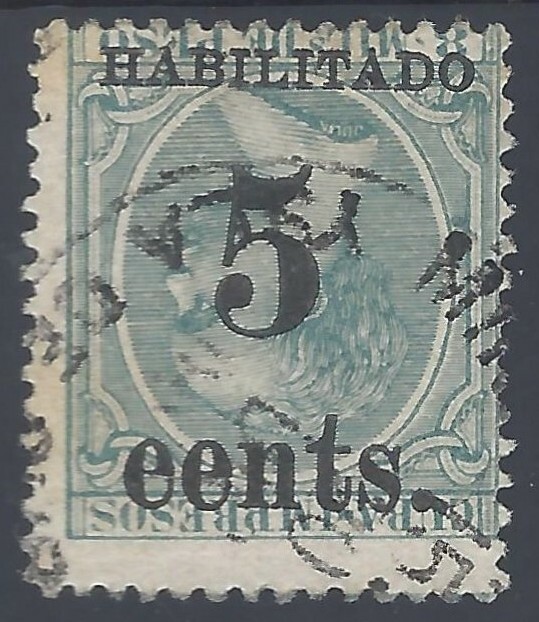 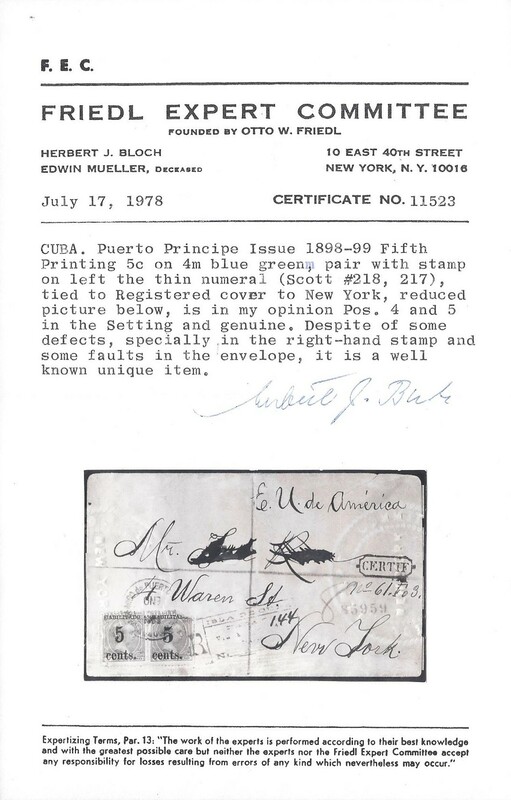 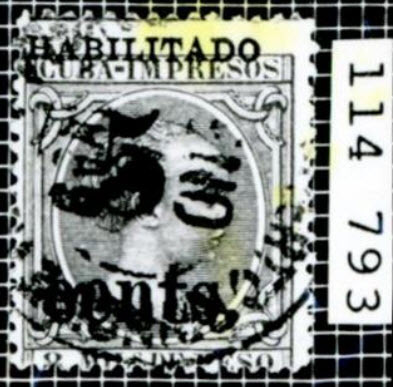 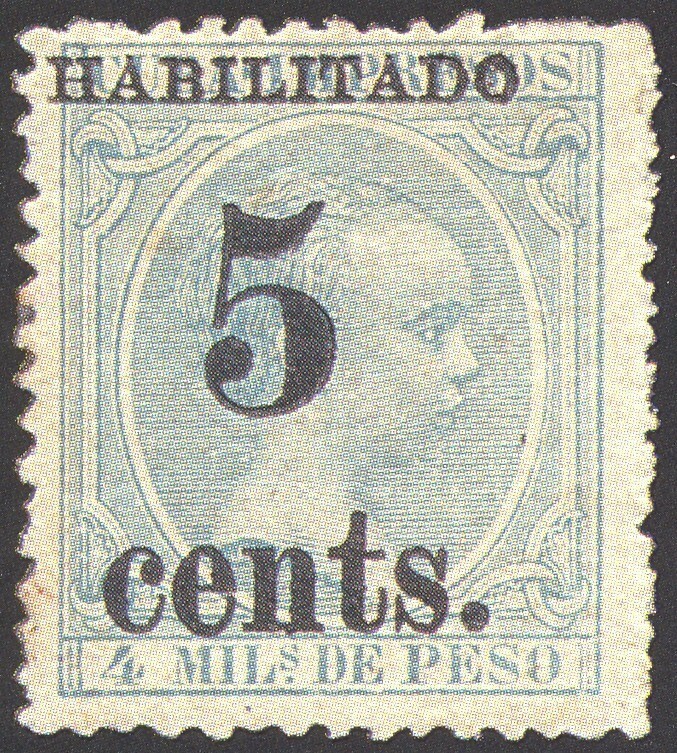 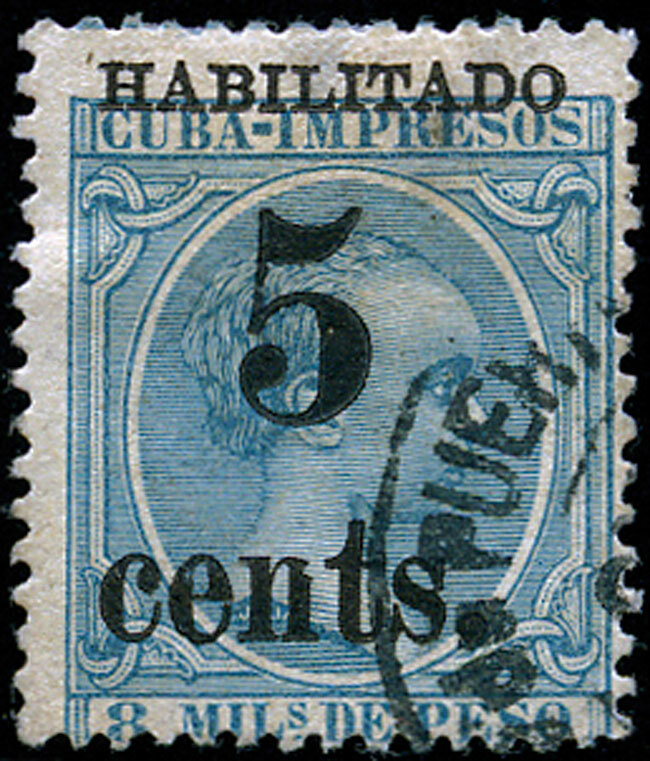 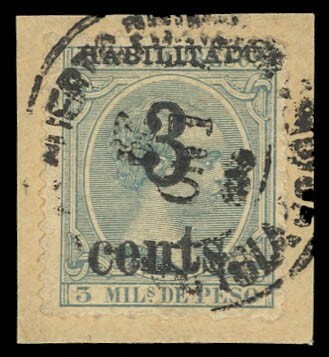 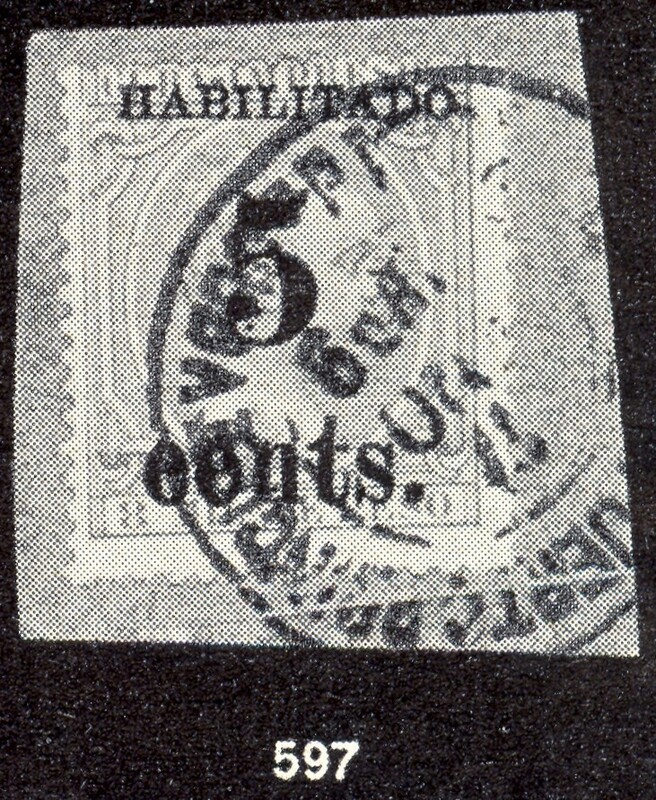 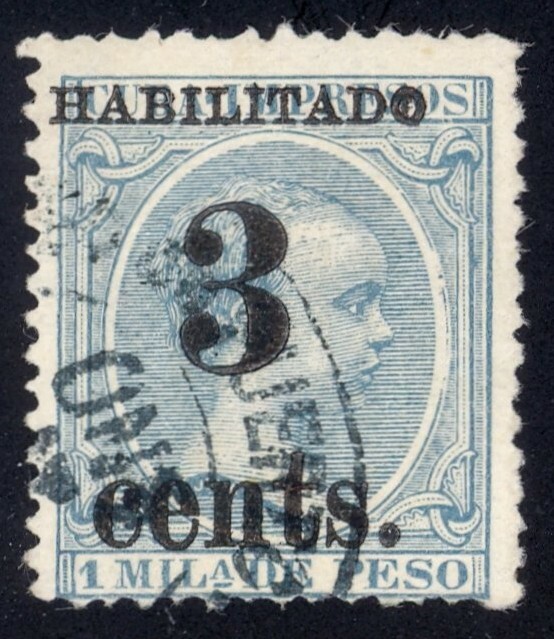 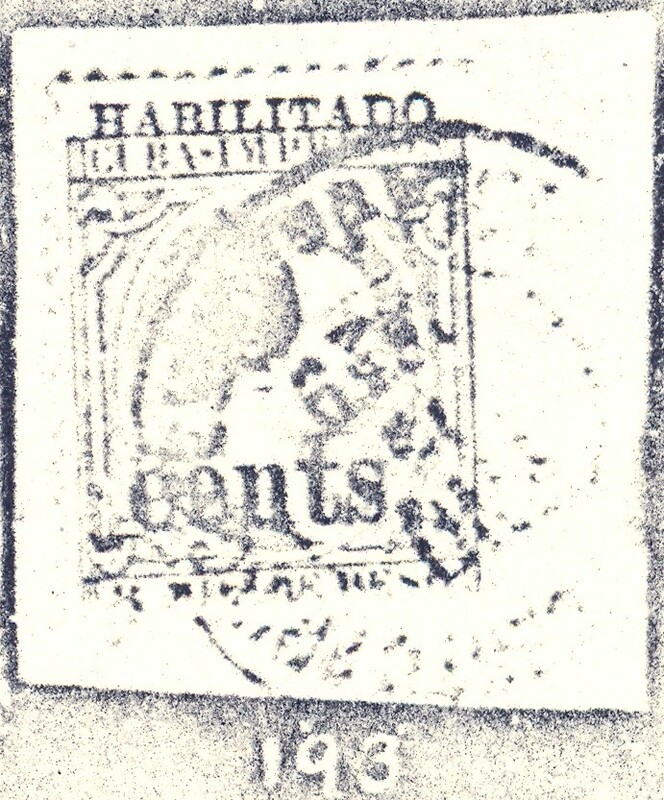 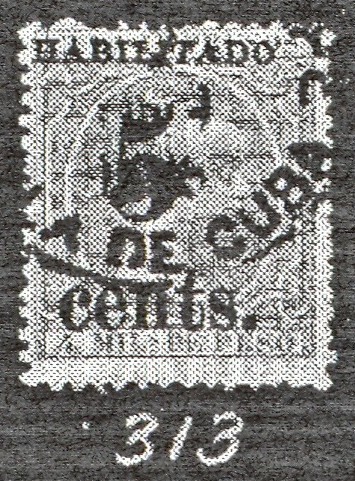 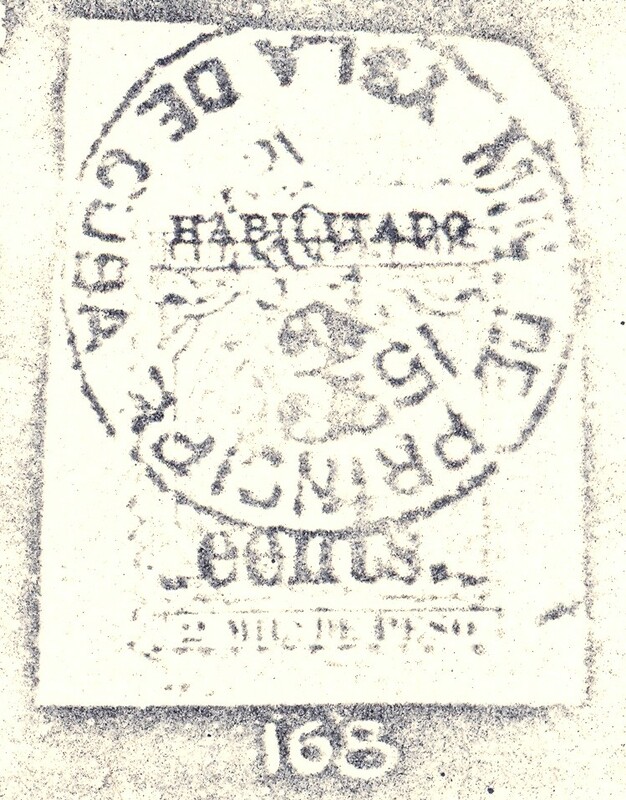 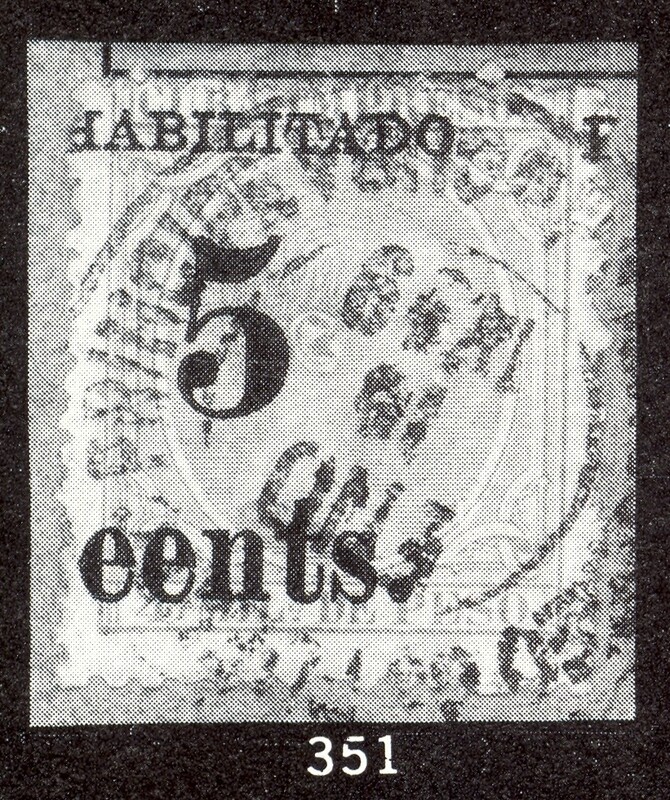 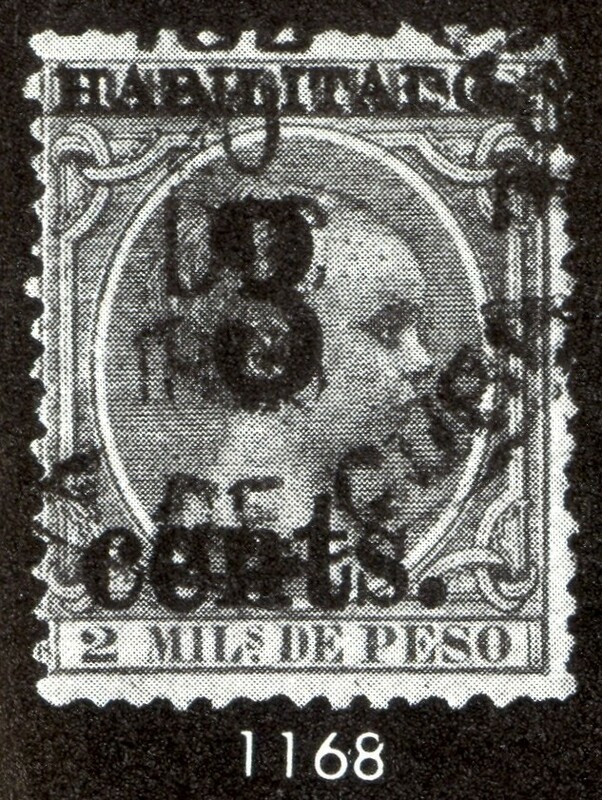 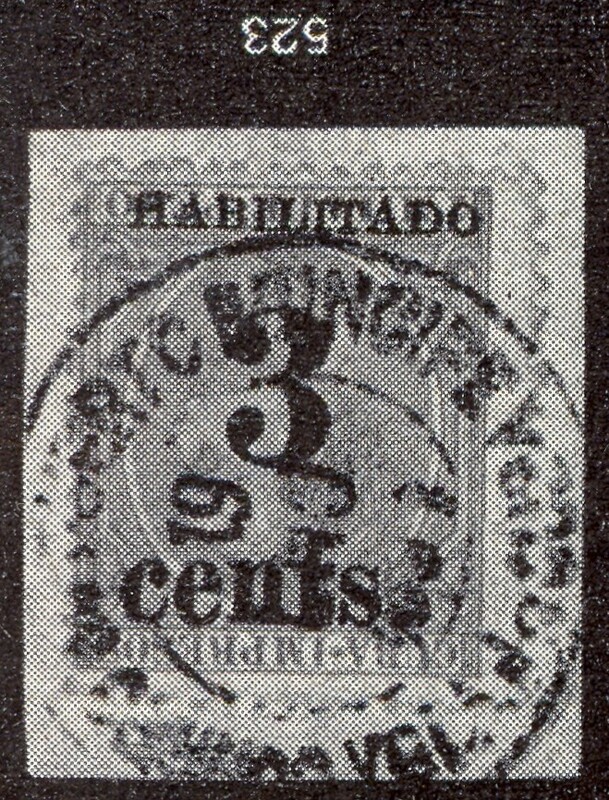 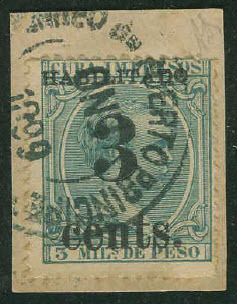 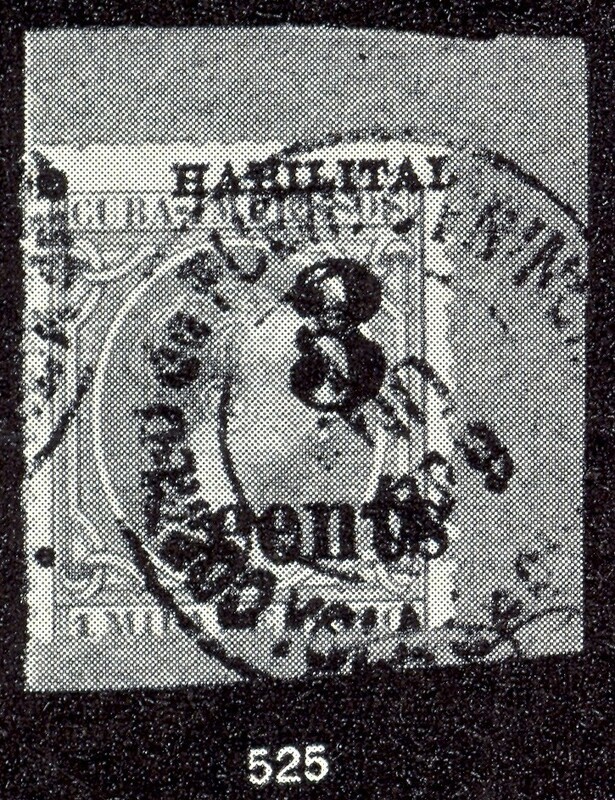 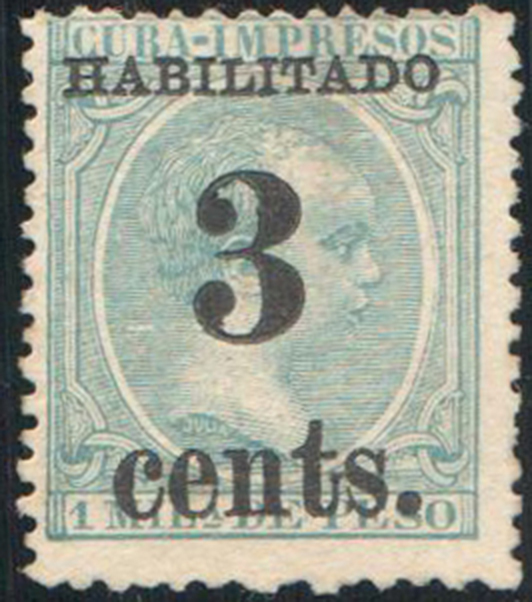 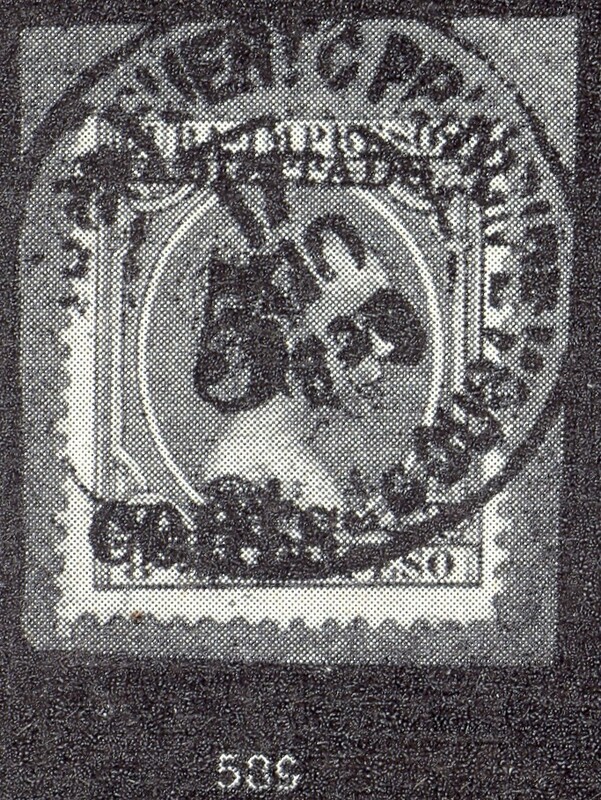 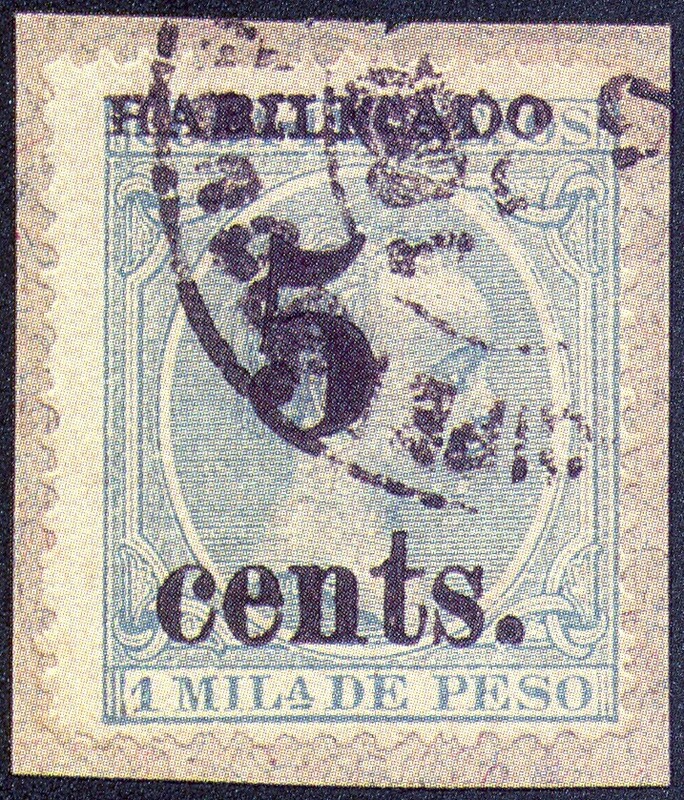 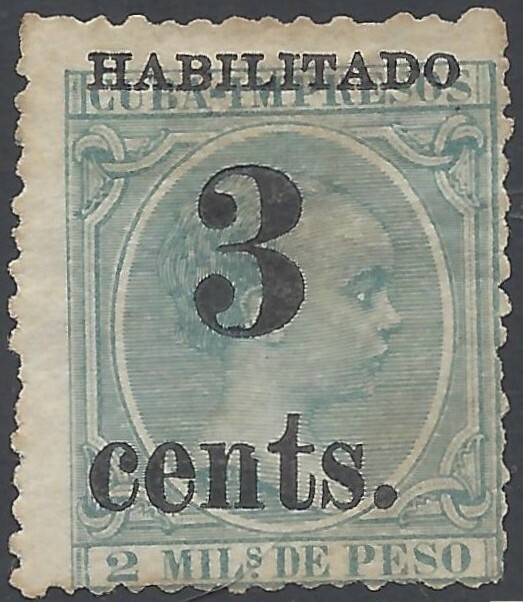 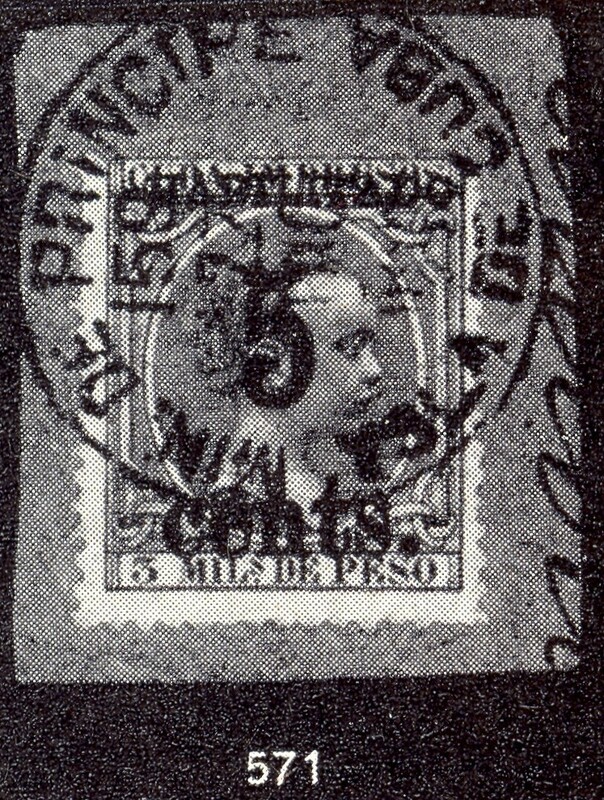 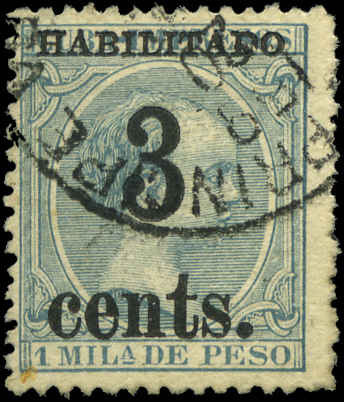 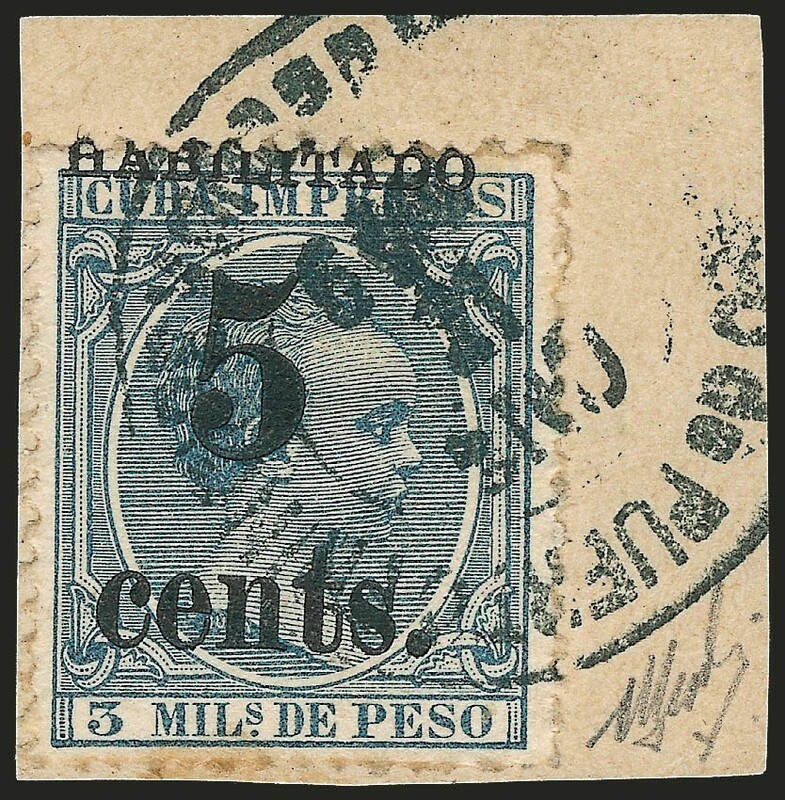 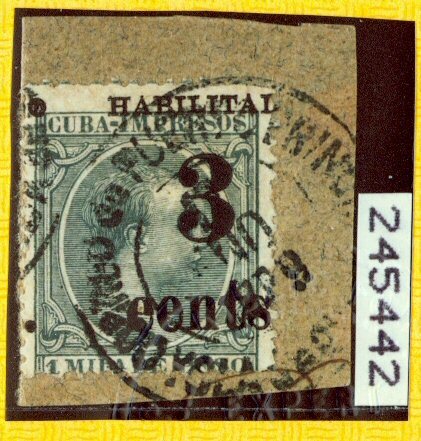 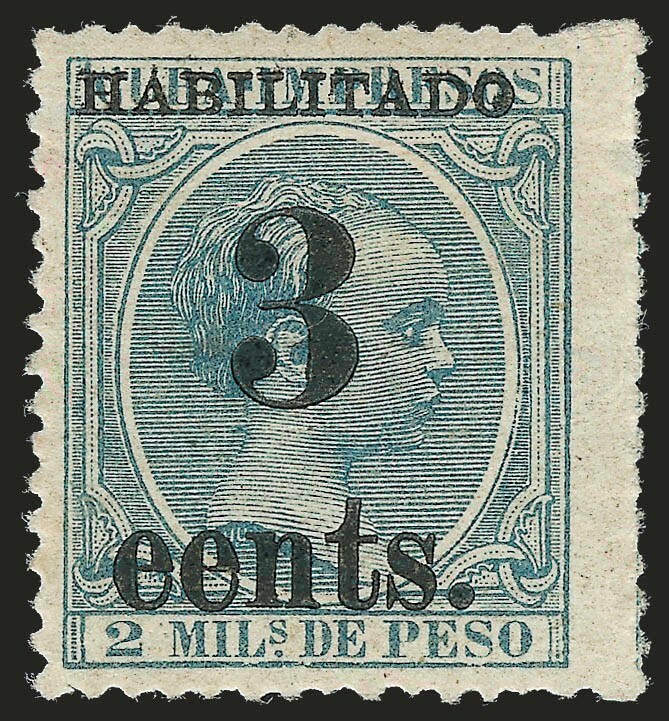 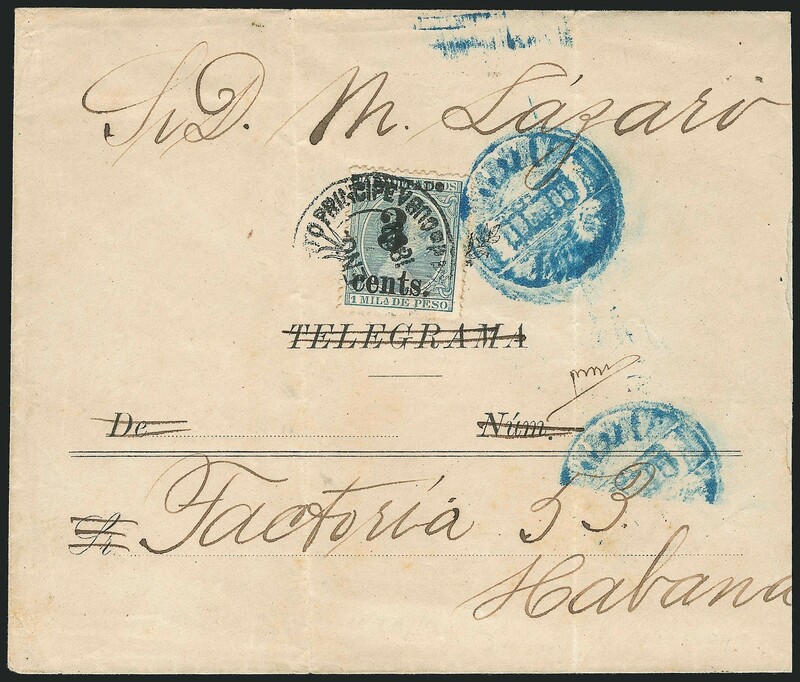 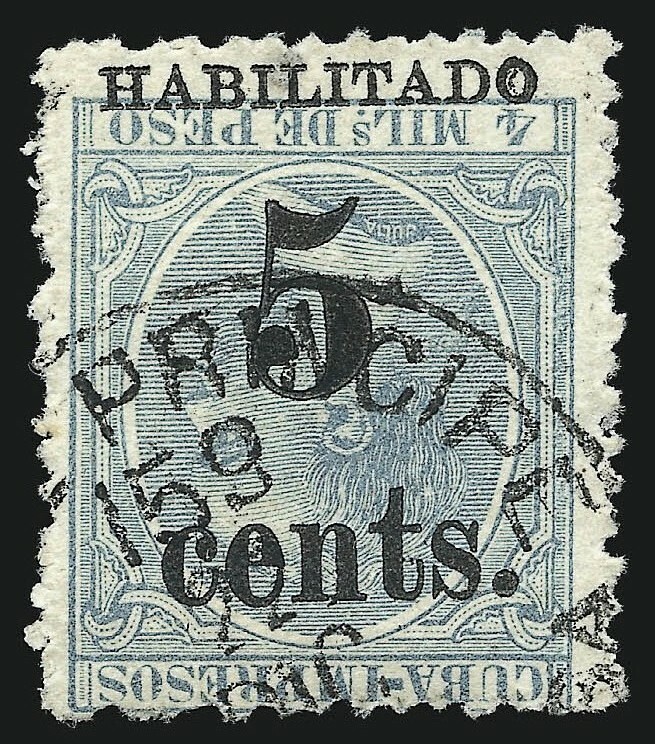 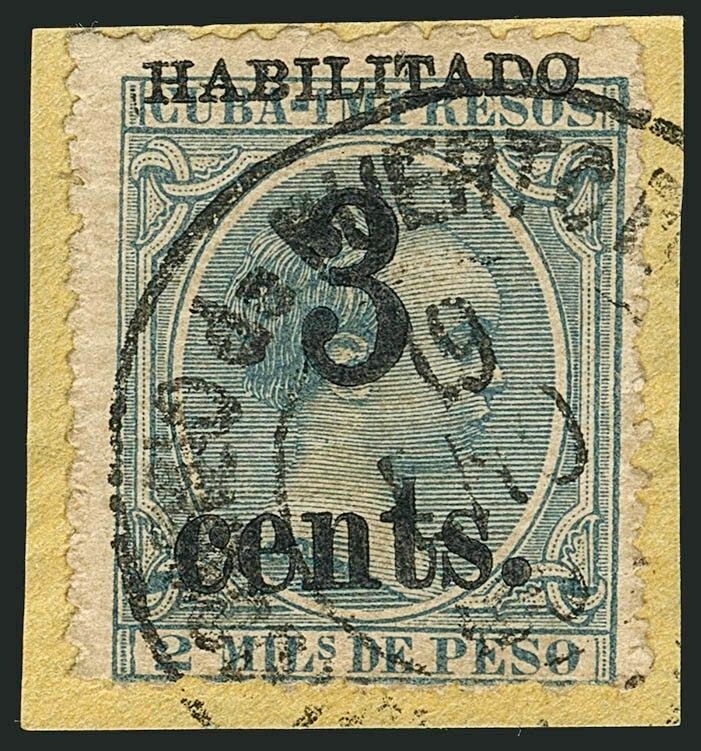 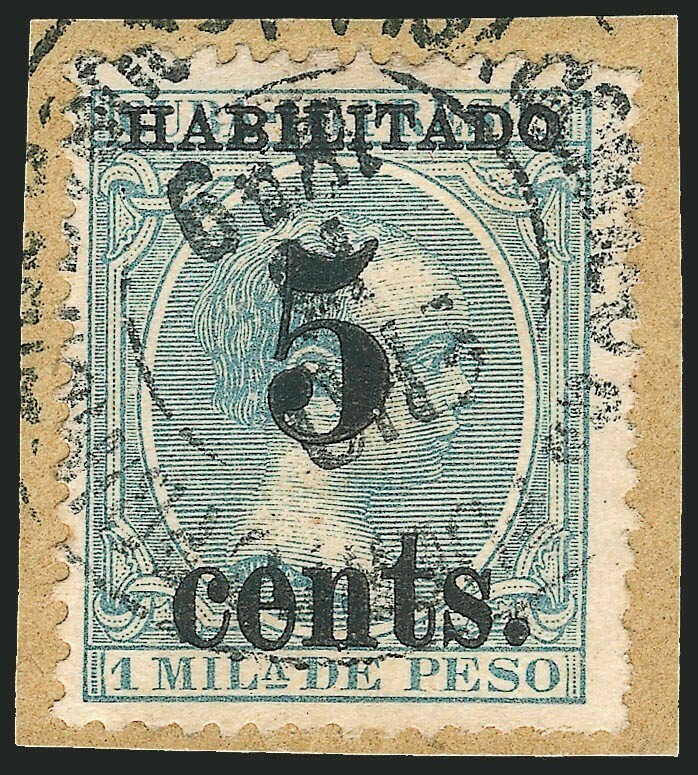 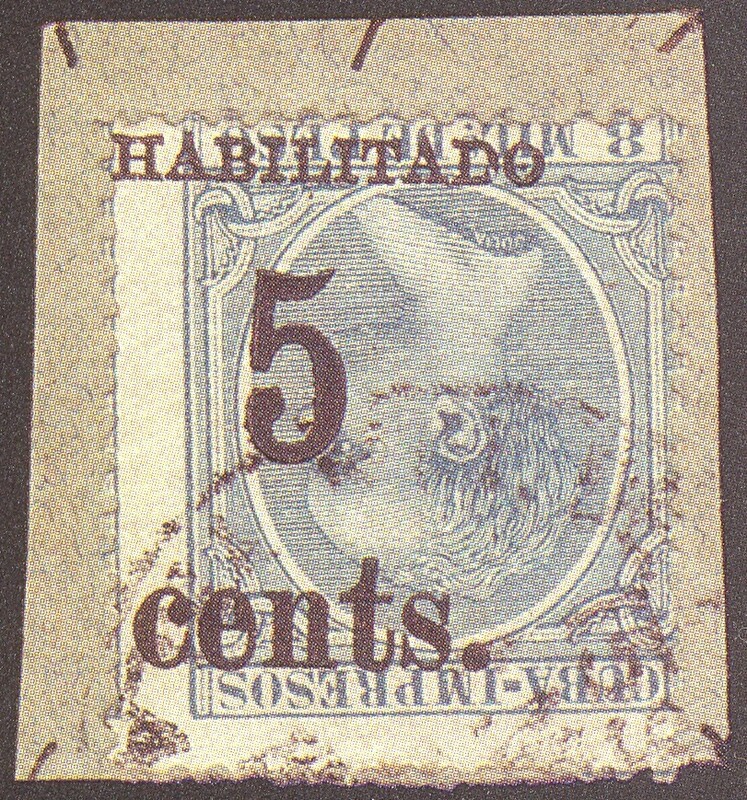 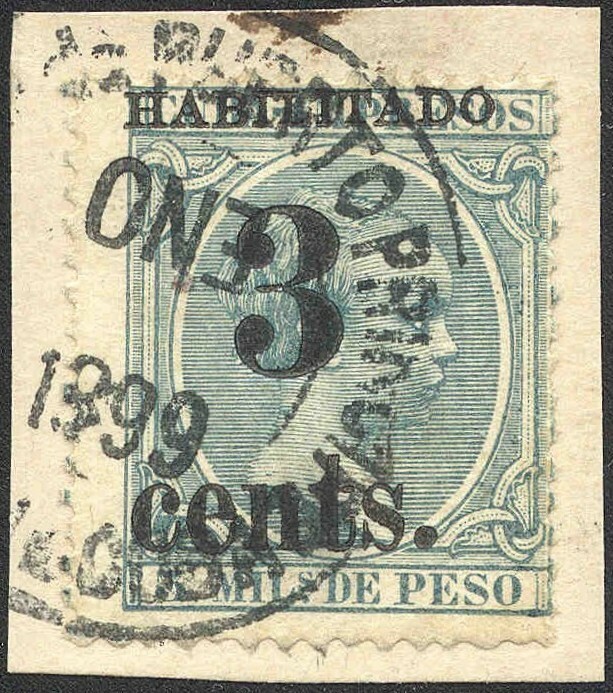 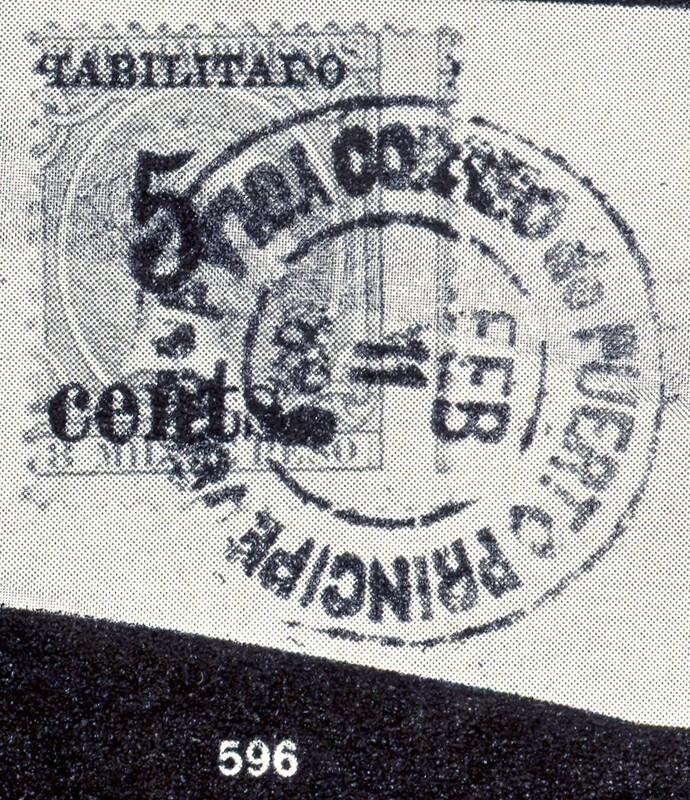 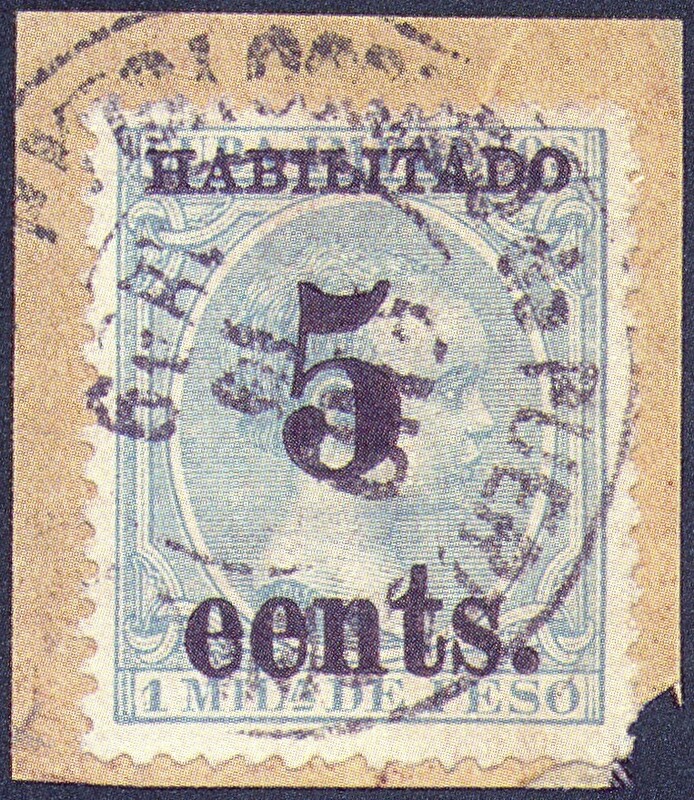 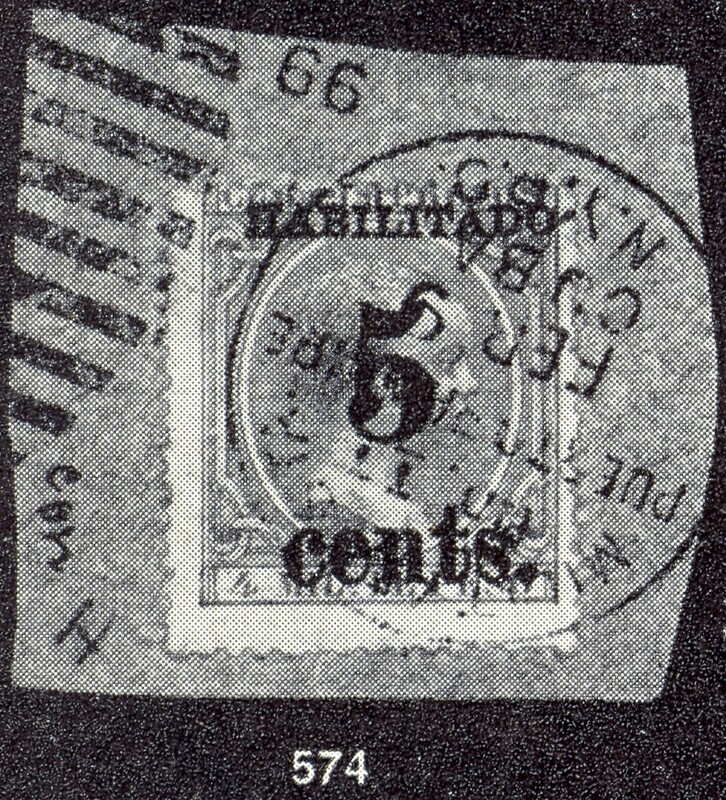 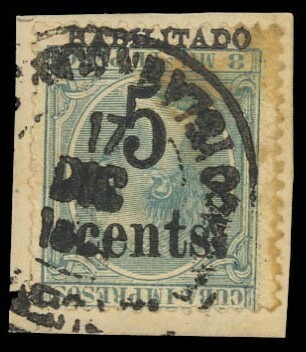 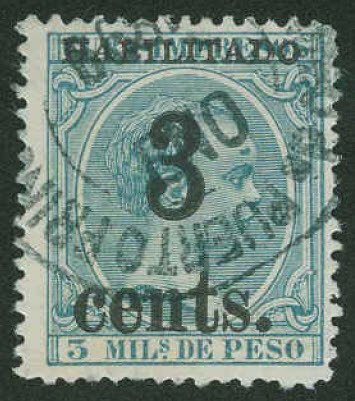 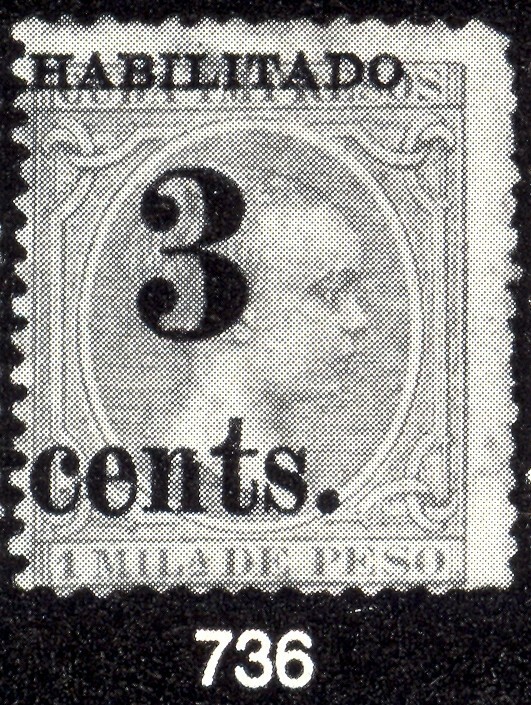 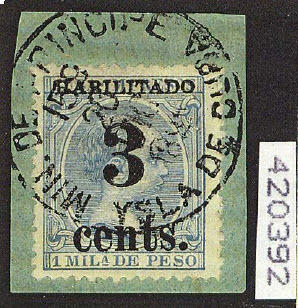 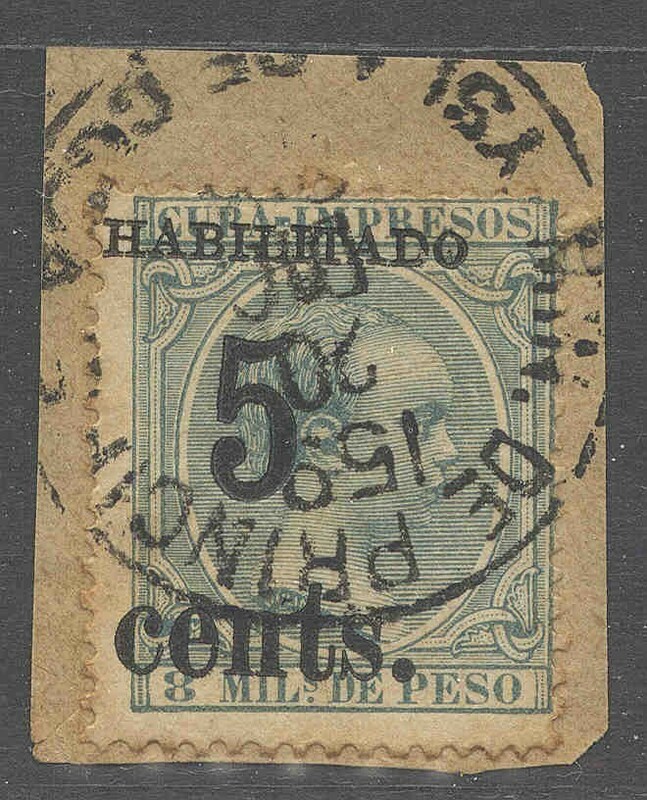 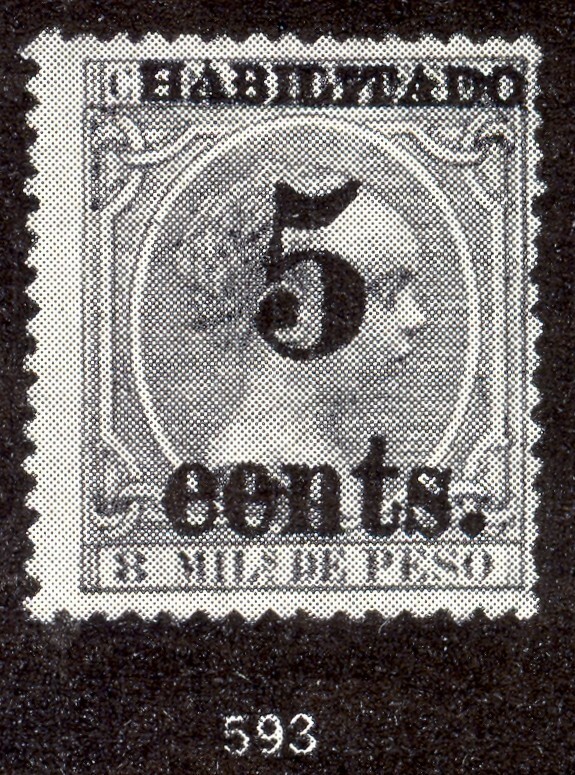 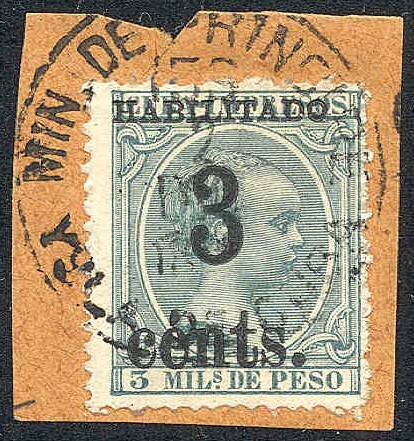 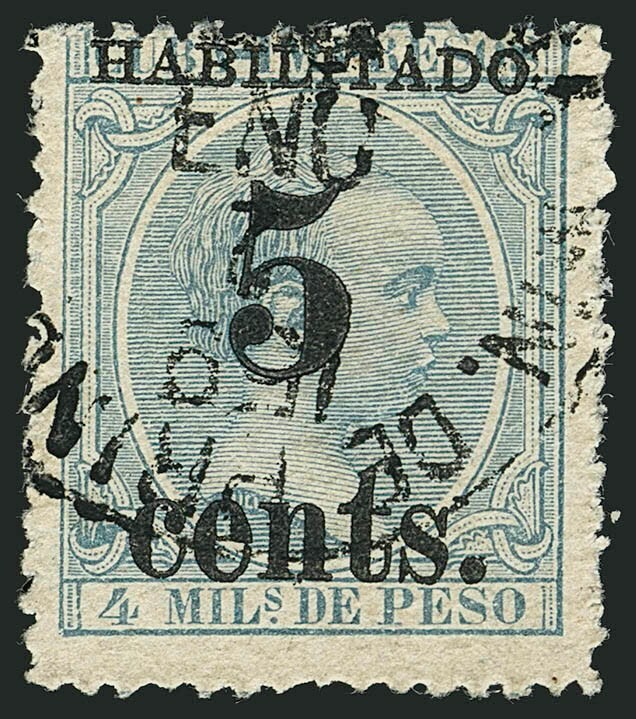 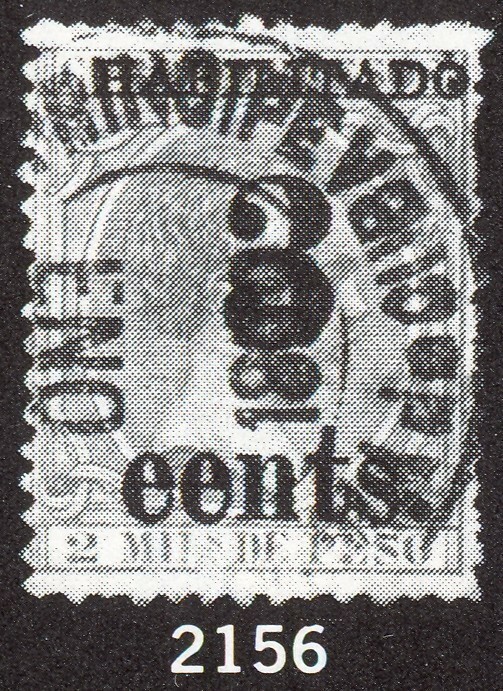 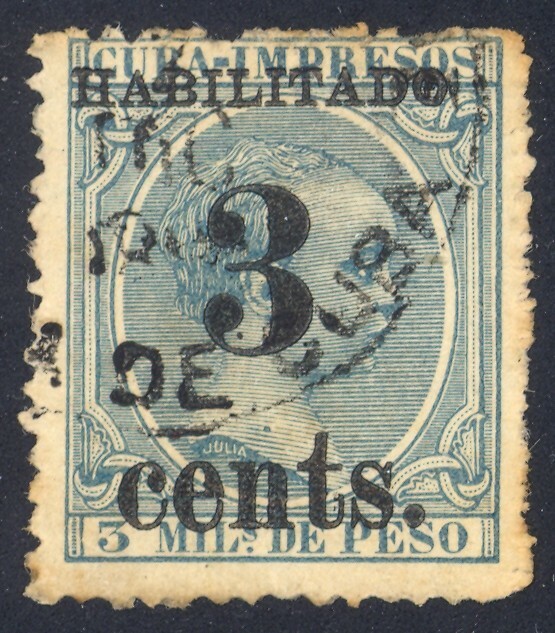 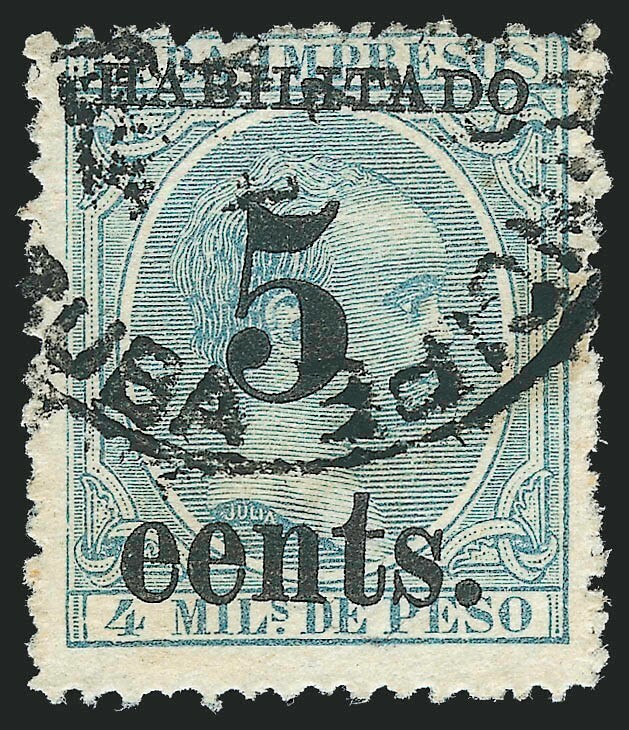 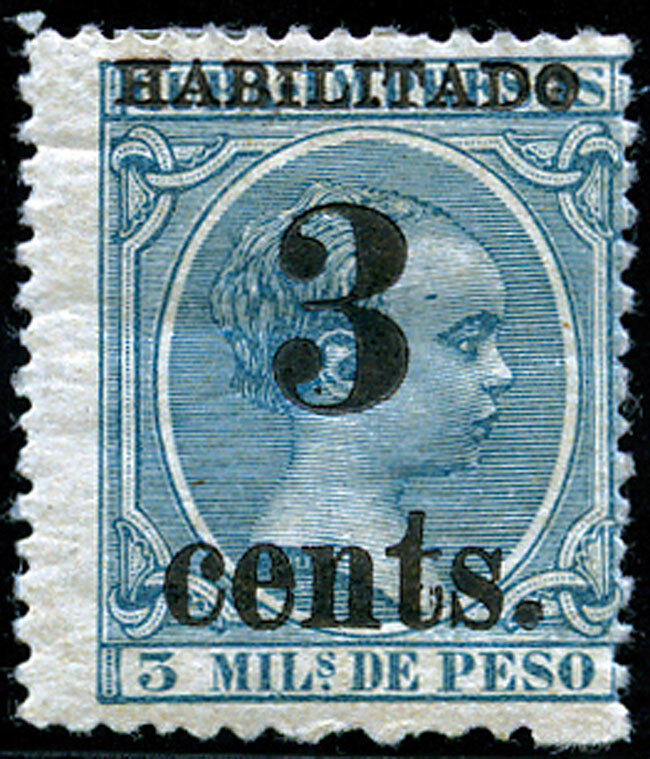 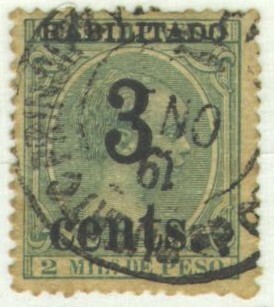 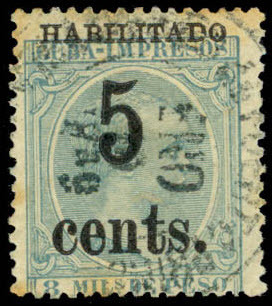 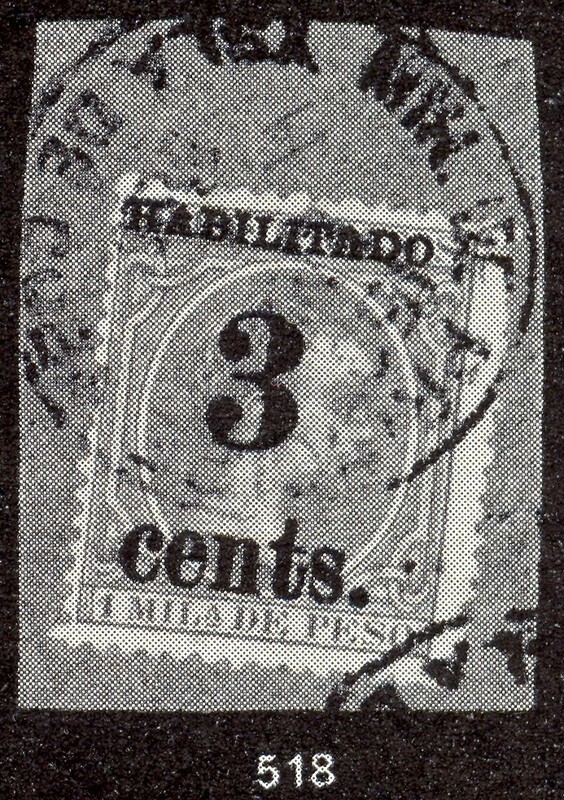 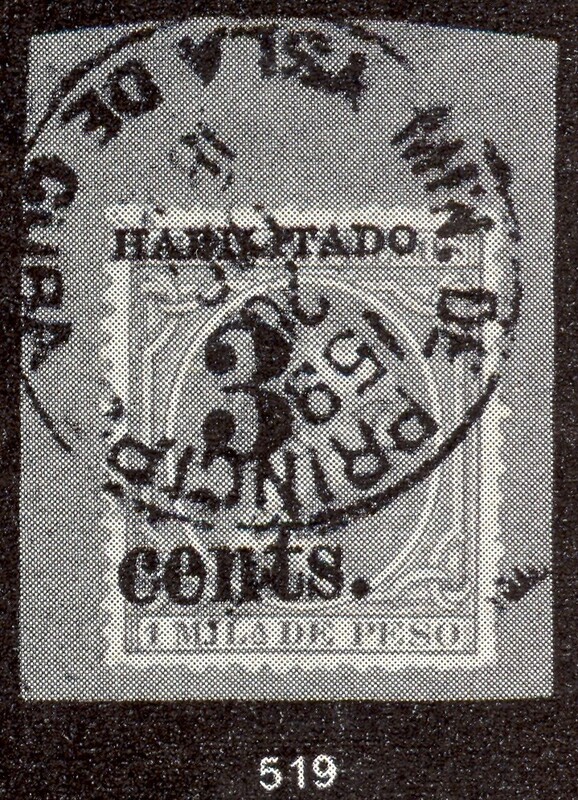 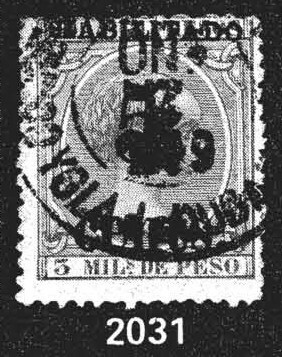 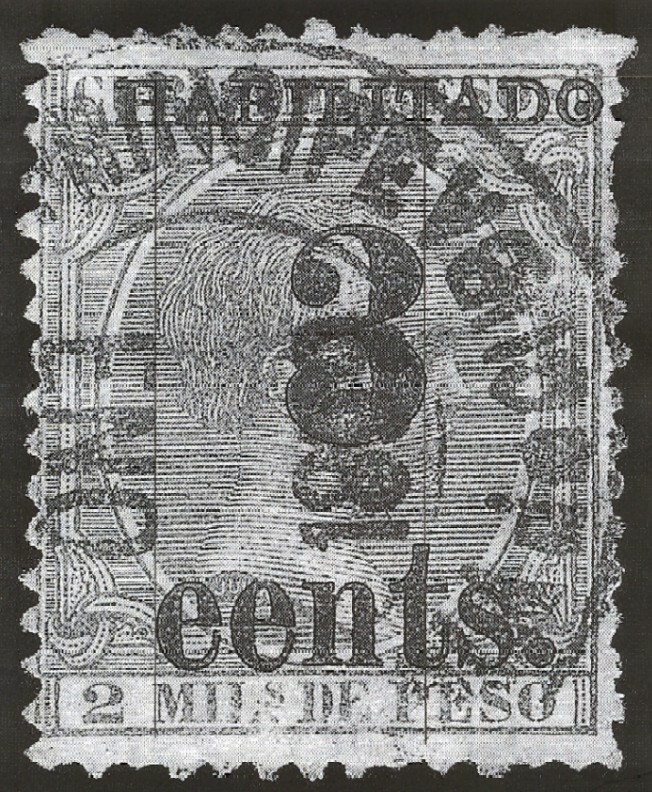 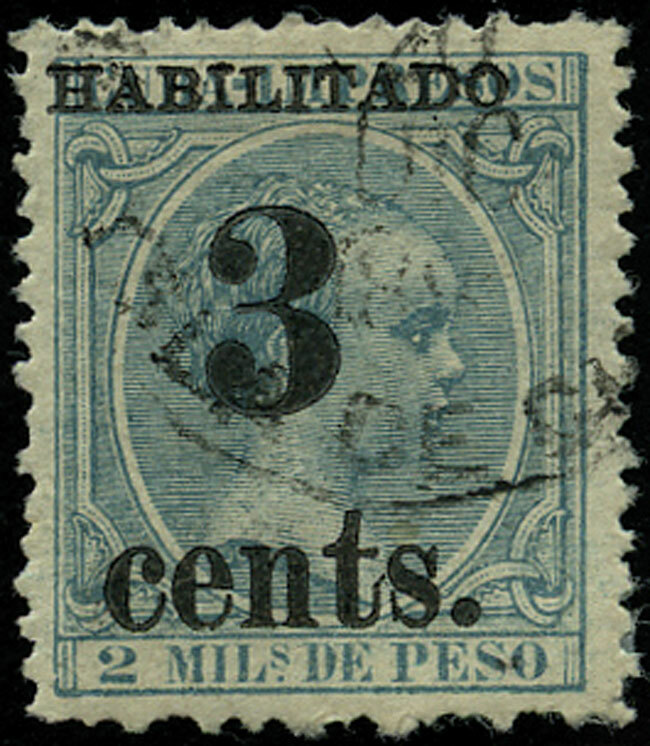 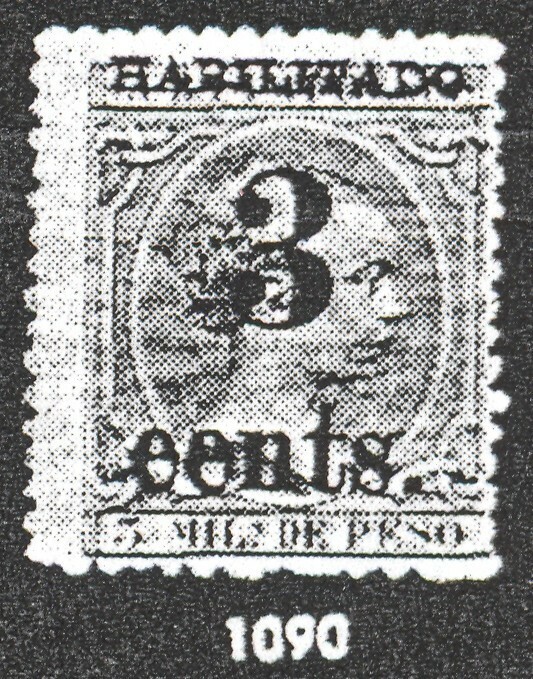 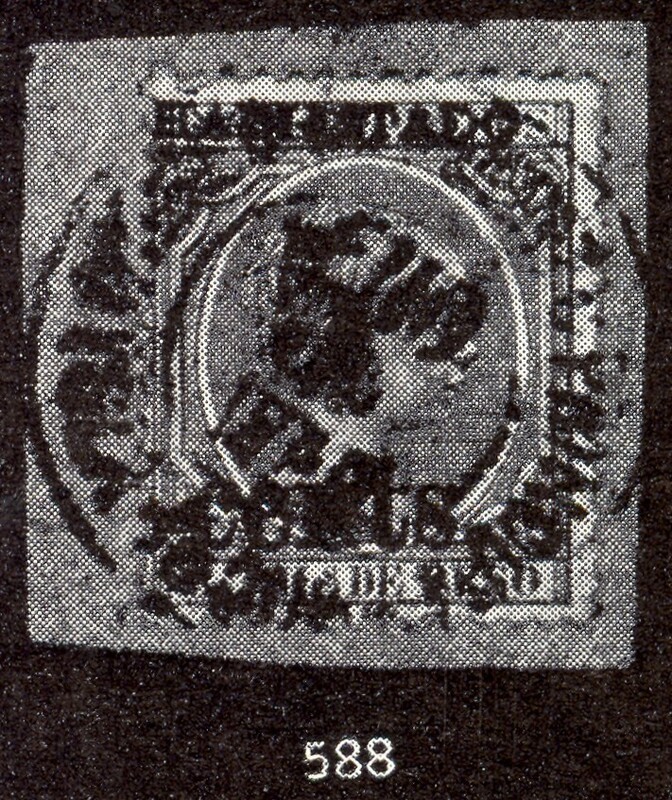 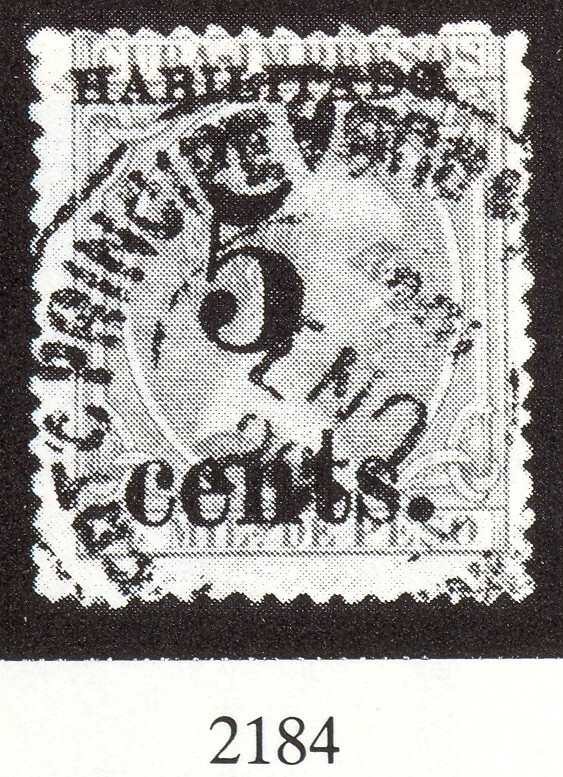 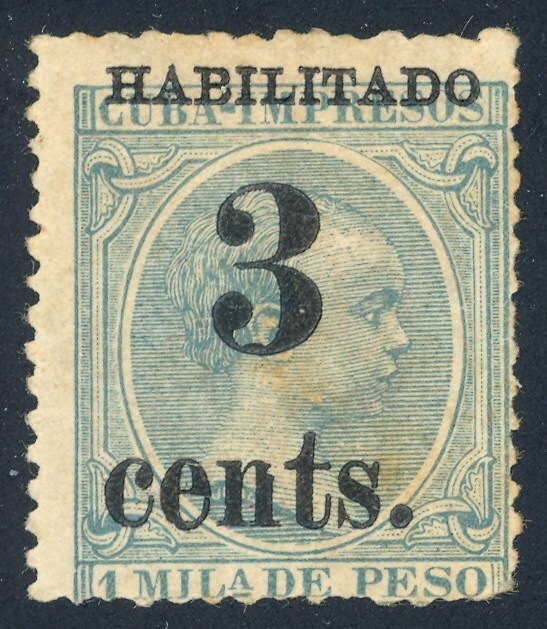 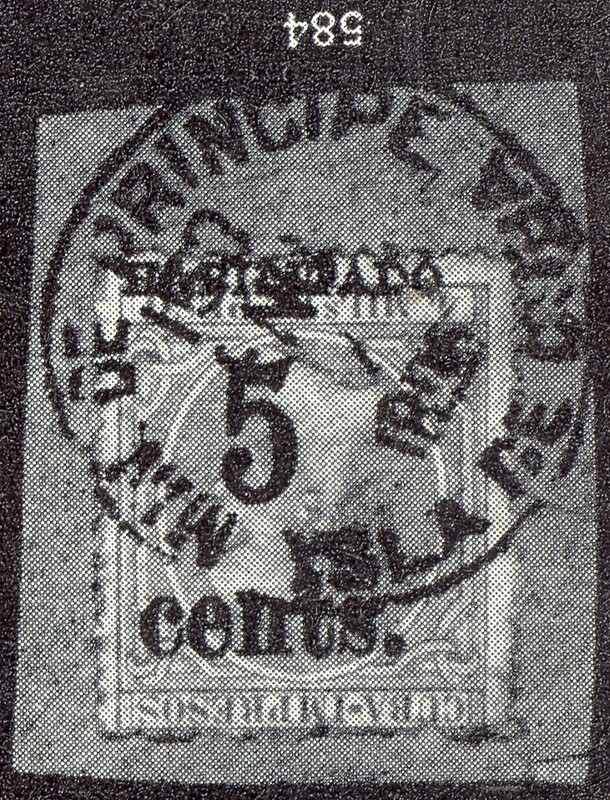 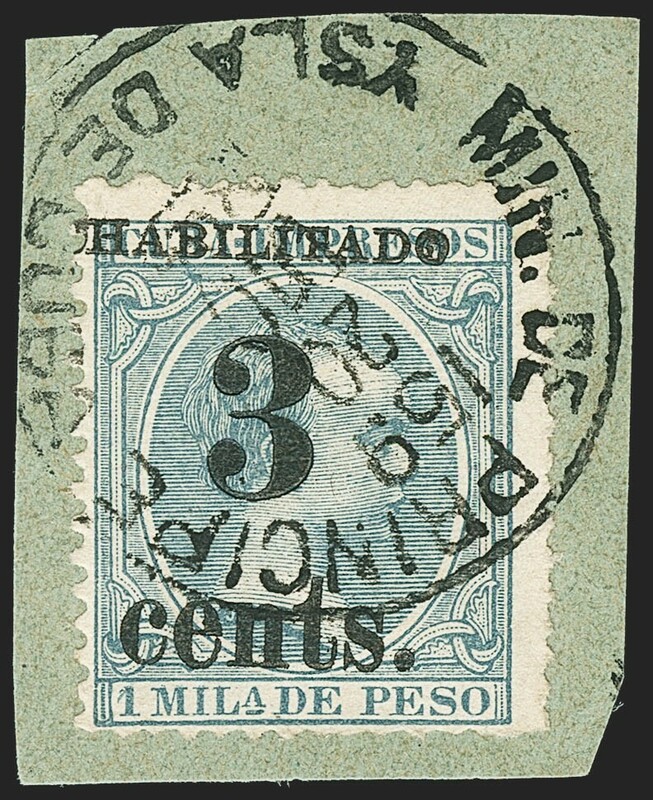 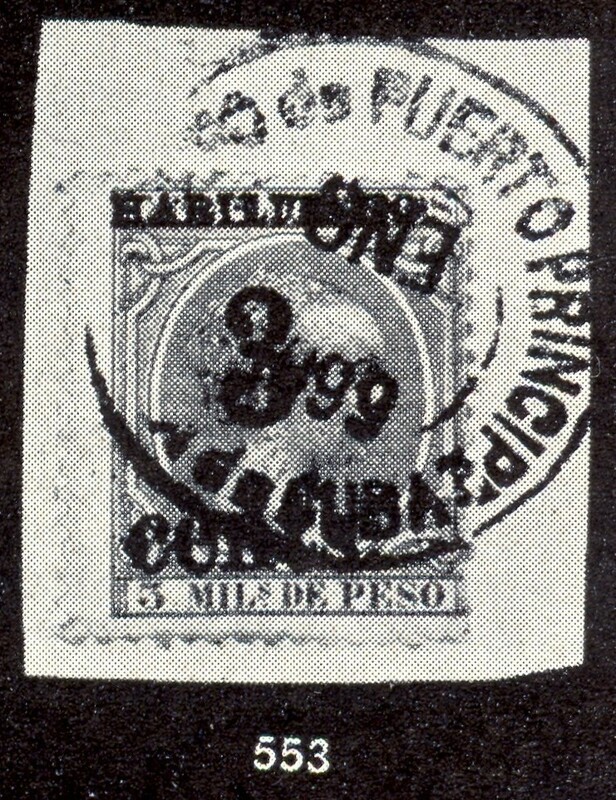 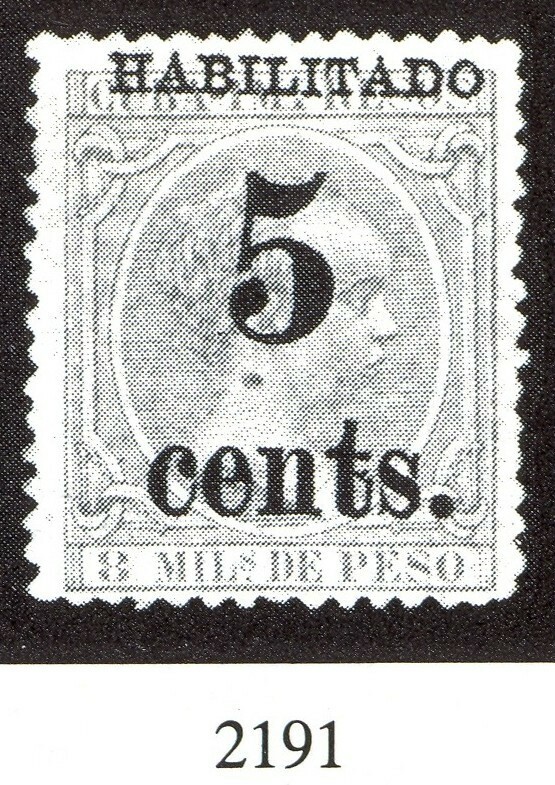 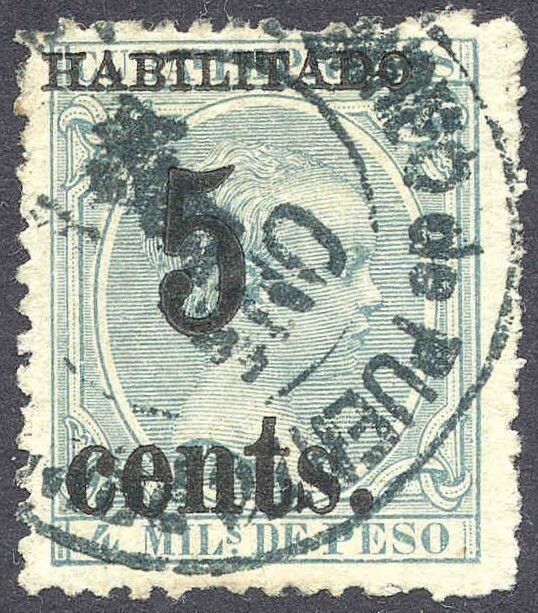 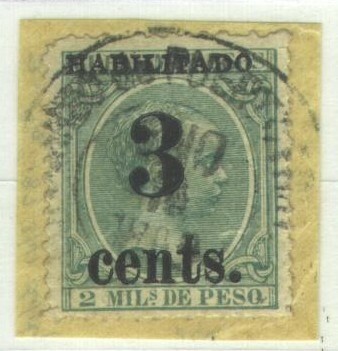 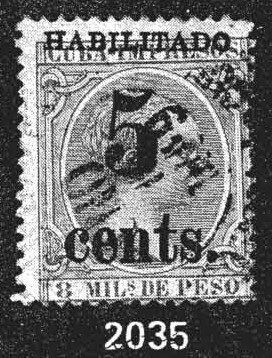 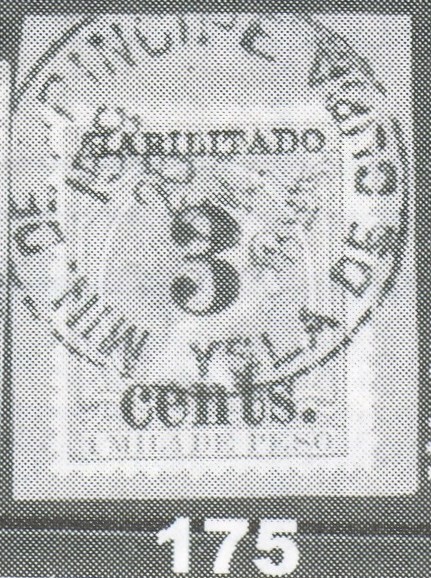 One example from Position 1 existed in the Ignacio Prats collection of Puerto Príncipe surcharged issues that was sold by Greg Manning Auctions on 24 June 2006 as part of lot 2; the stamp appears at the bottom of page 54 of the auction catalog. 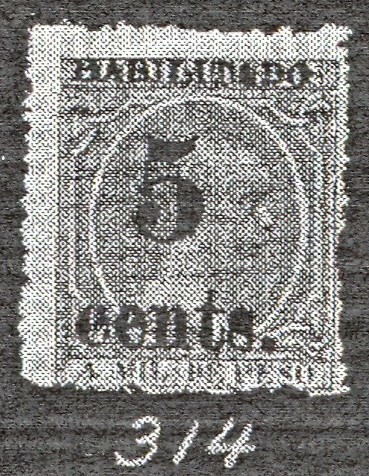 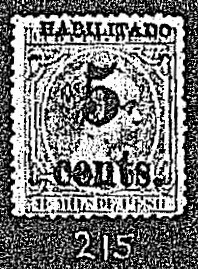 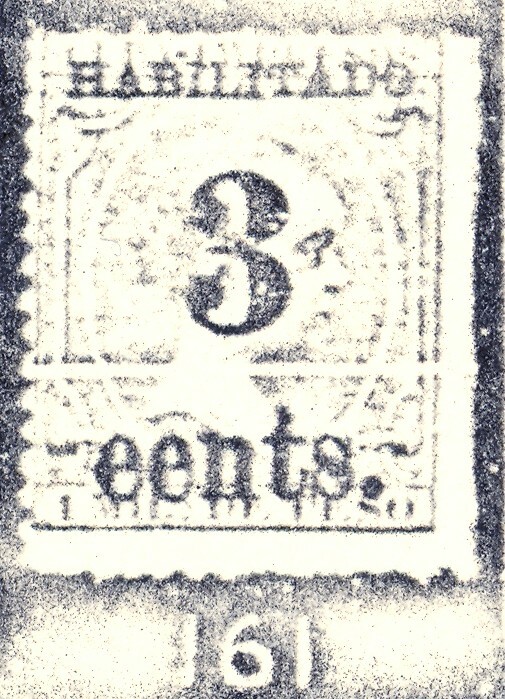 This stamp was at one time listed by Scott as No. 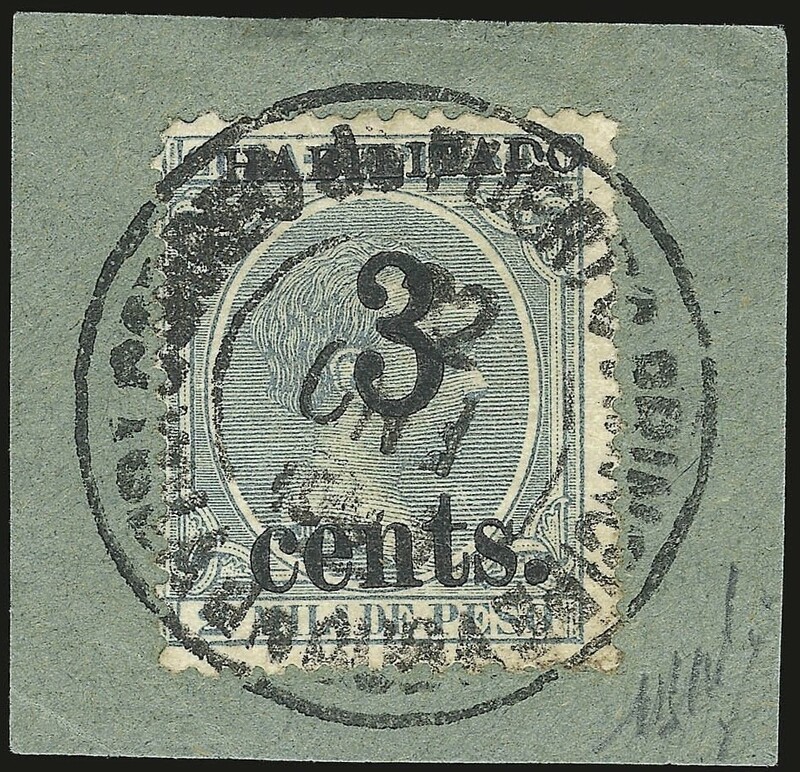 183B, but has since been delisted for unkown reasons. 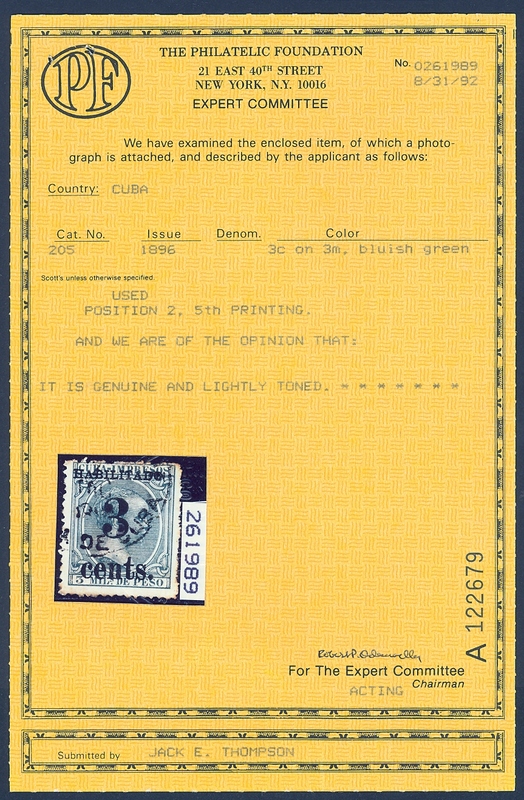 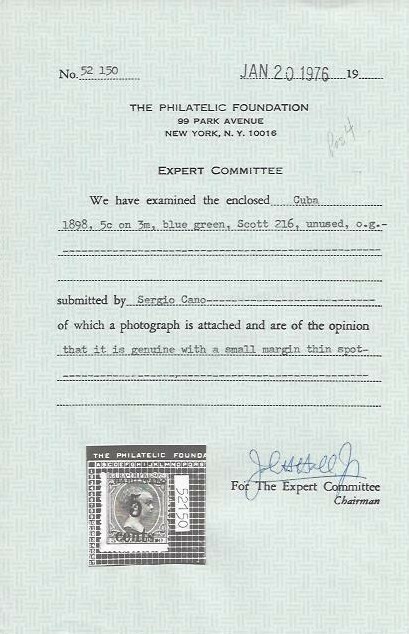 Another example of this printing from Position 4 appeared in the Dr. Yamil H.Kourí collection as Lot 2751 in the Robert A. Siegel auction of June 24-25, 2010. 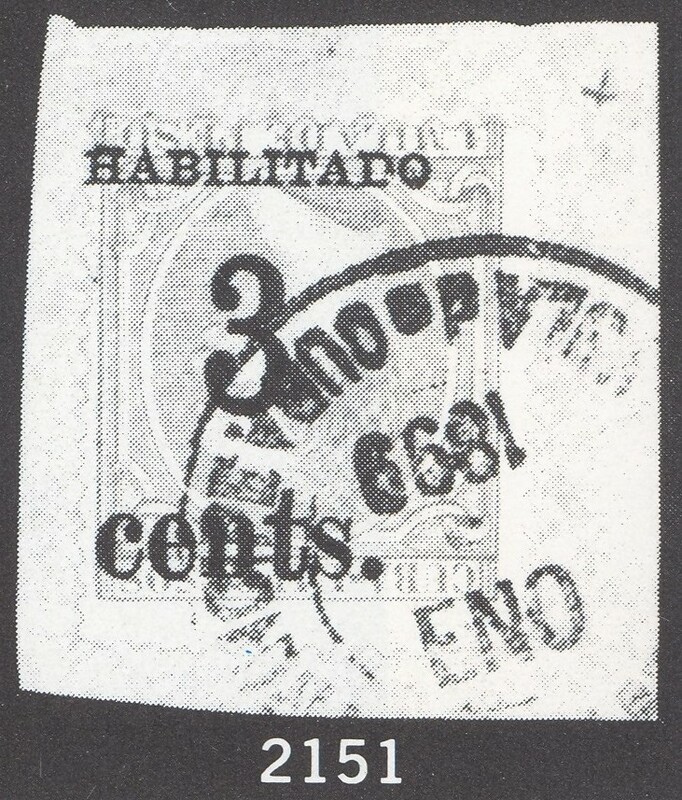 We have listed these two stamps here as Nos. 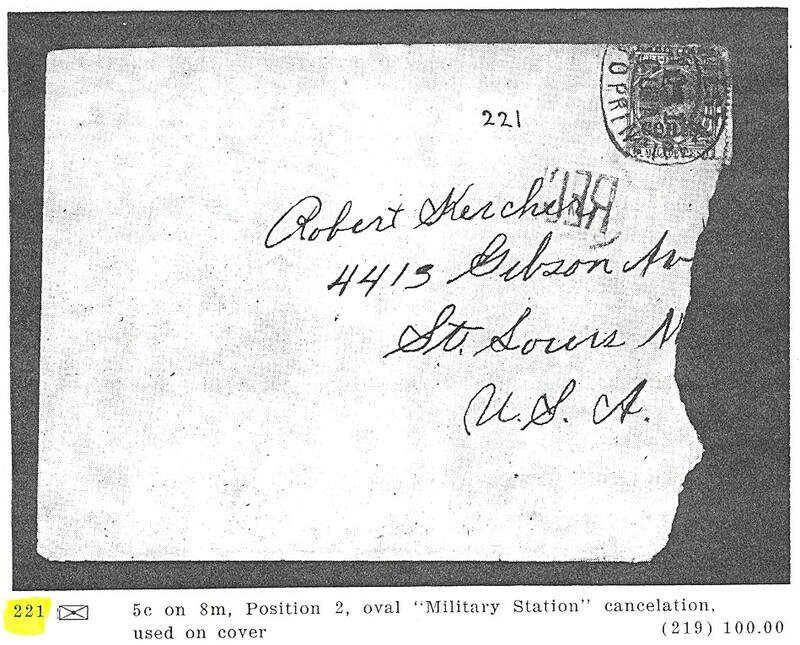 211A and 211B respectively because of their close correspondence to Scott Nos. 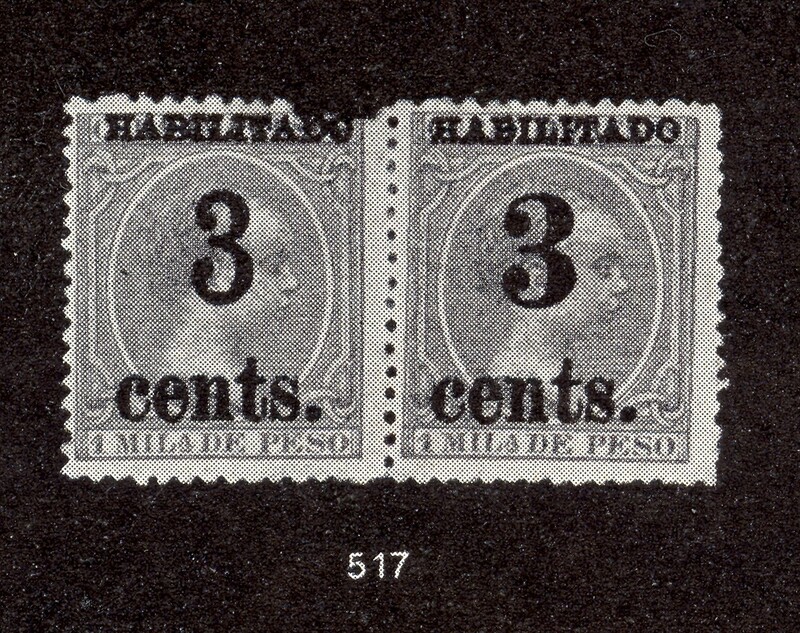 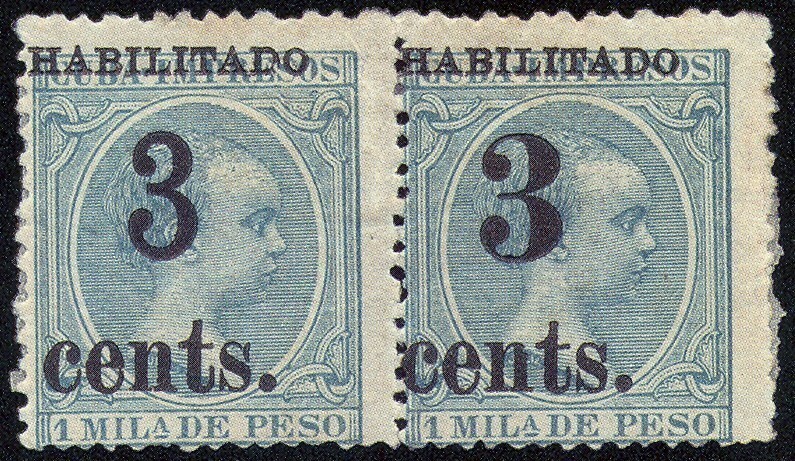 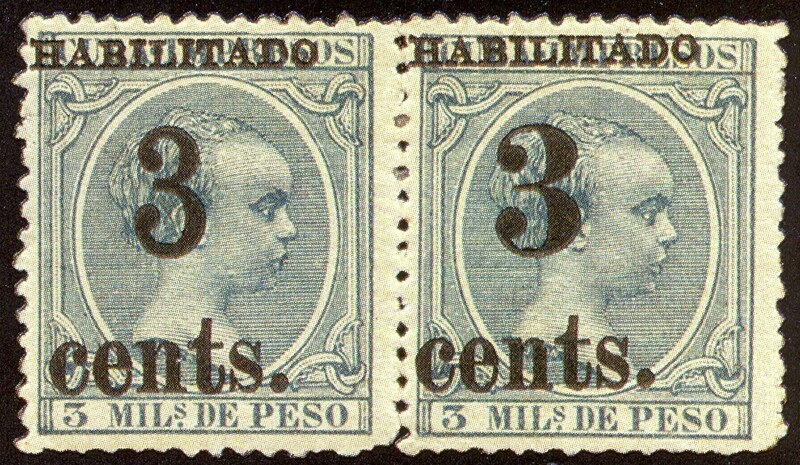 211 and 212—the only other 19½ mm high 5¢ surcharges on 1m stamps. 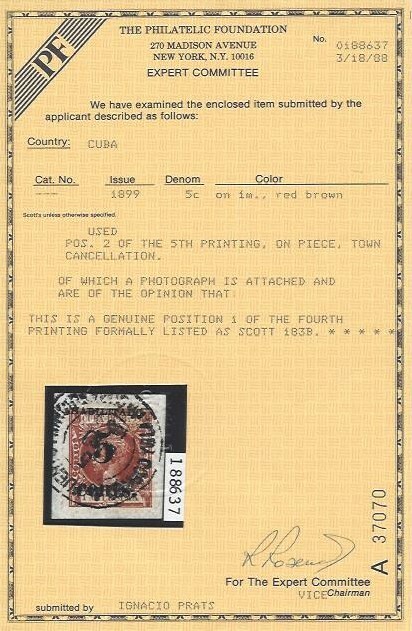 We surmise that some strips of 1m (Scott 156) used to print Scott 177 during the Third Printing may have been left over and used for this printing. 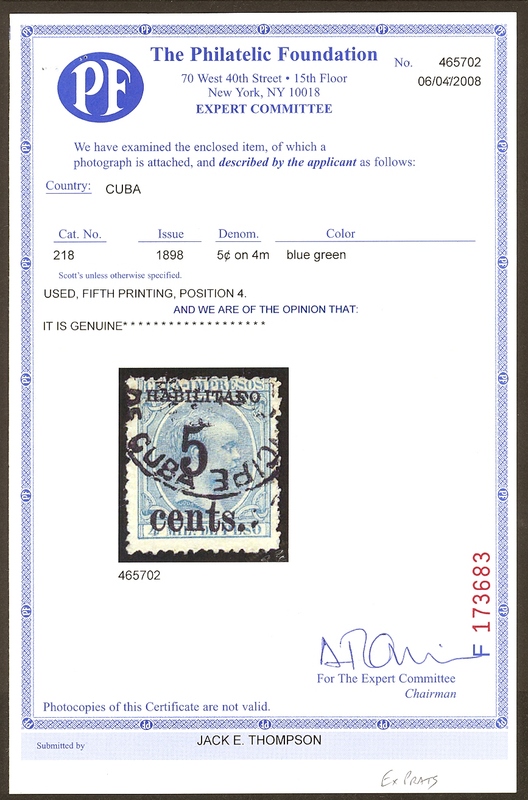 In spite of the Graus certificate I believe this stamp has a fake surcharge. 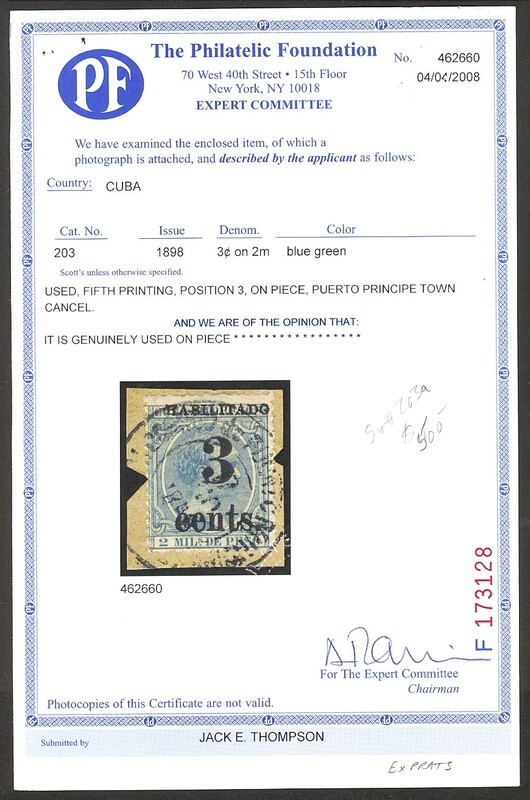 this item was resubmitted to the PF and determined to be a forgery. 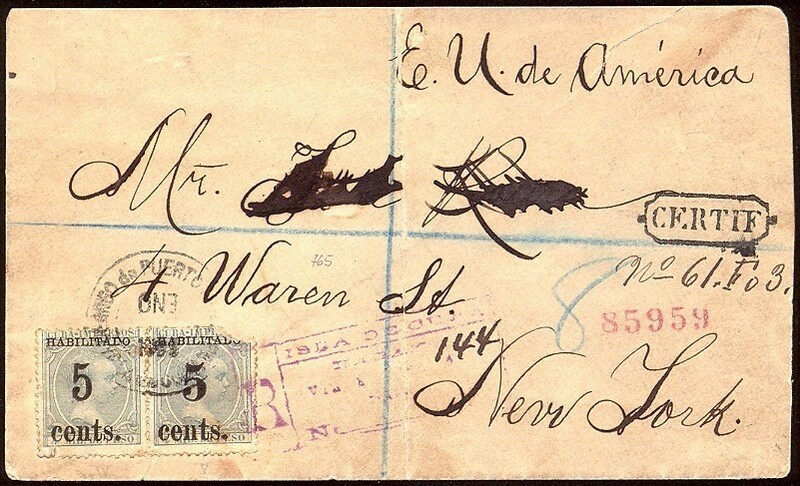 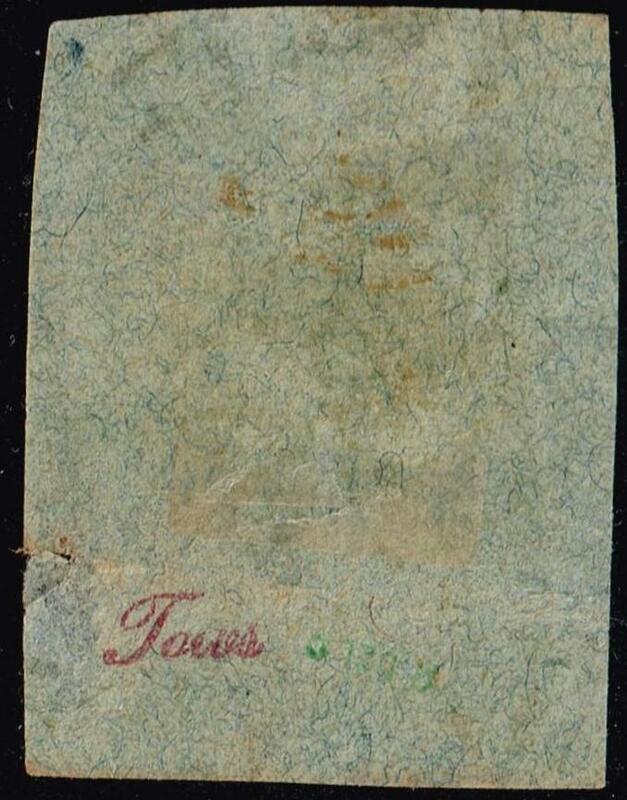 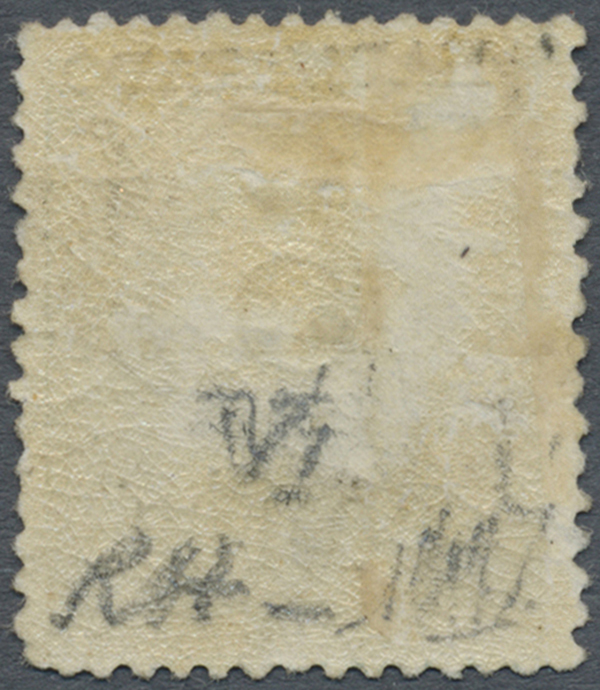 Note stamp was on piece at the Walsh auction and is now off paper. 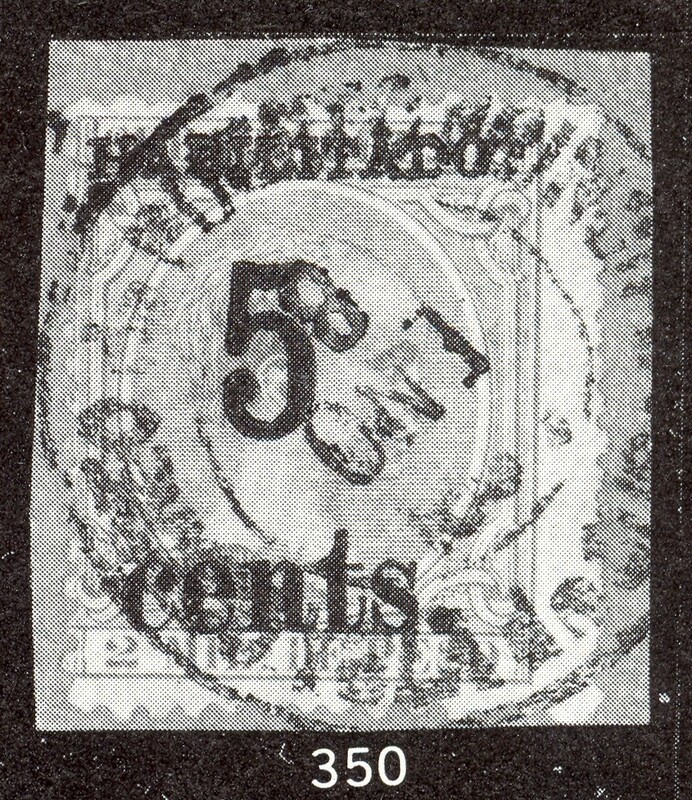 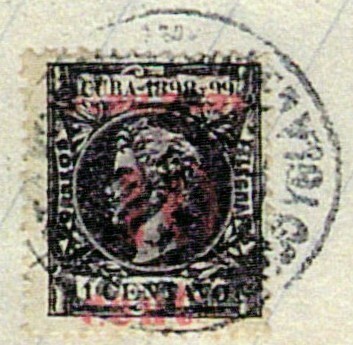 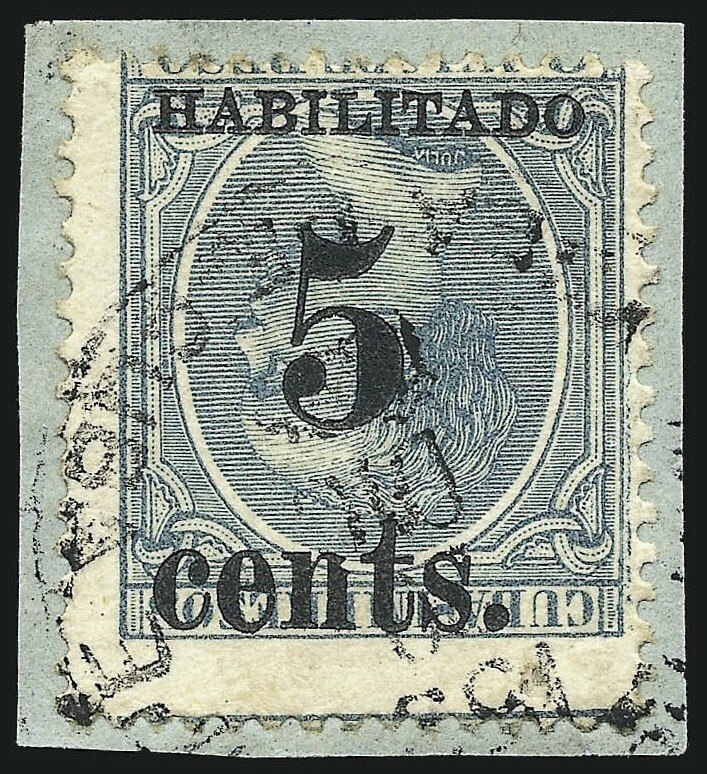 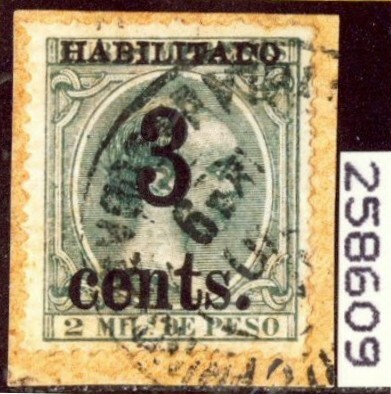 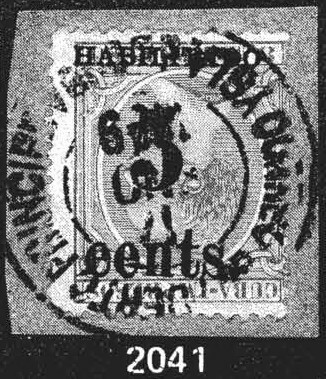 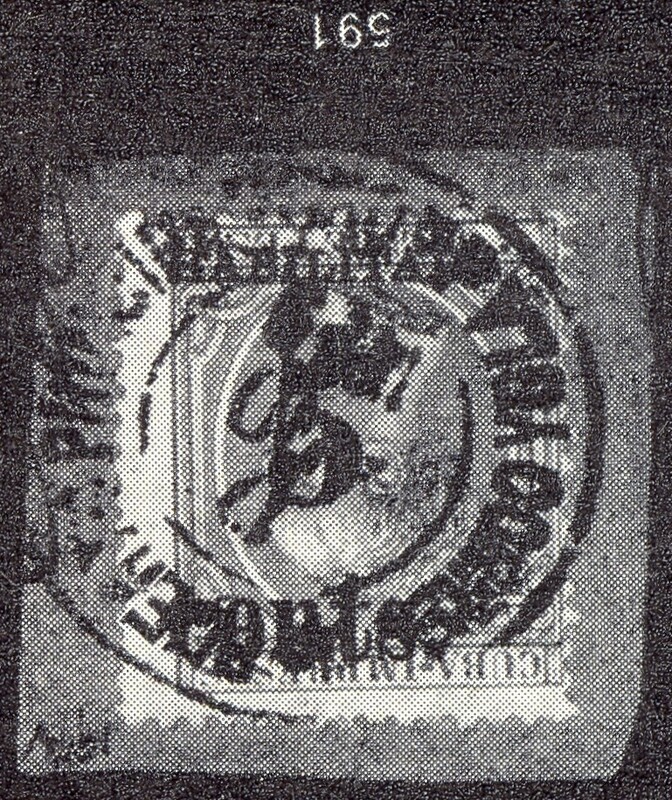 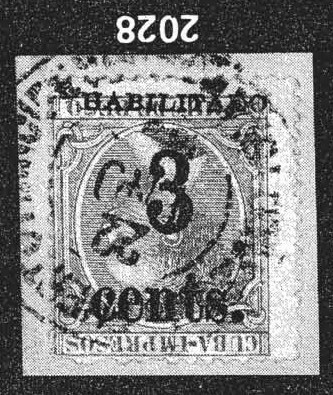 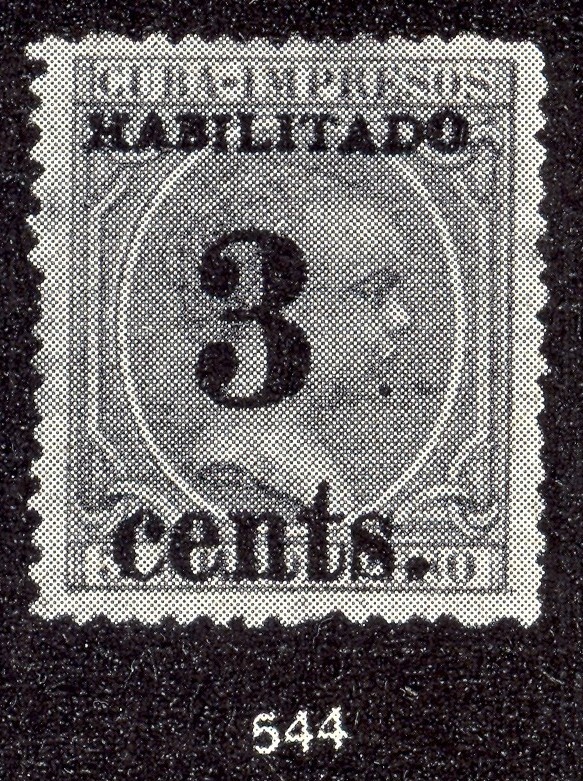 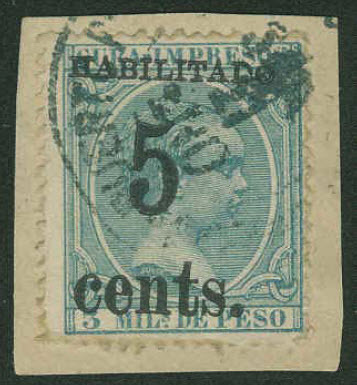 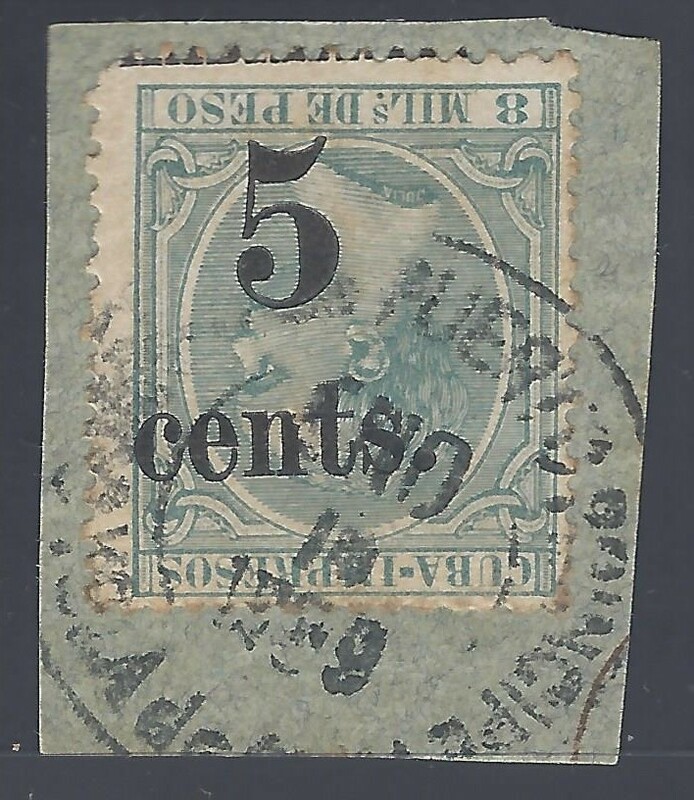 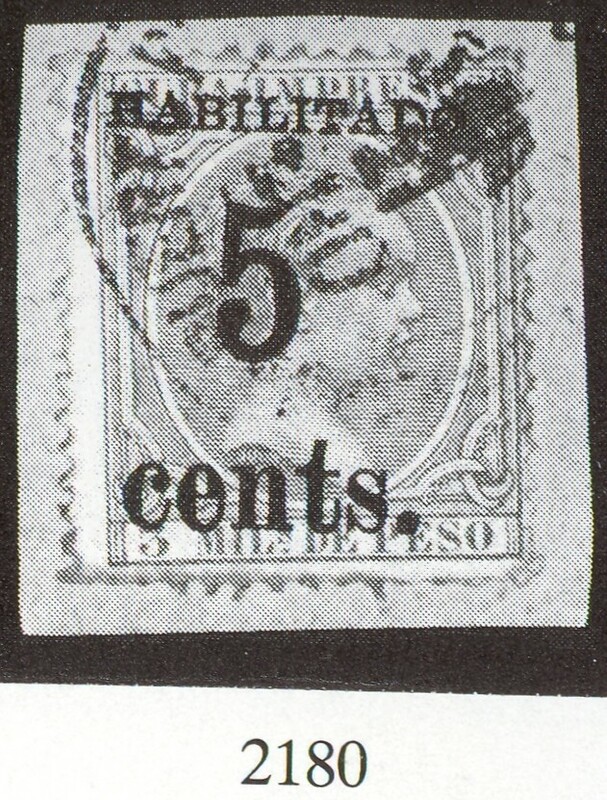 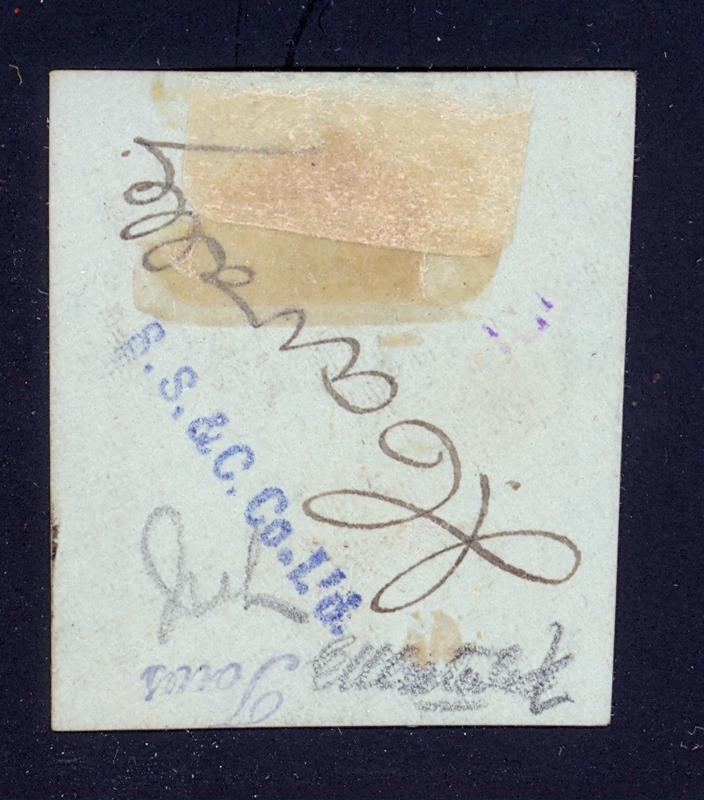 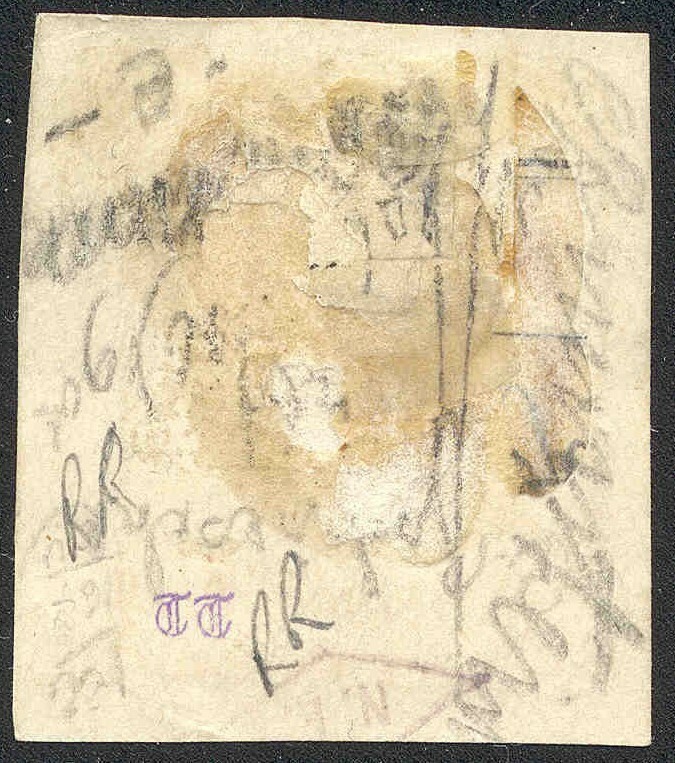 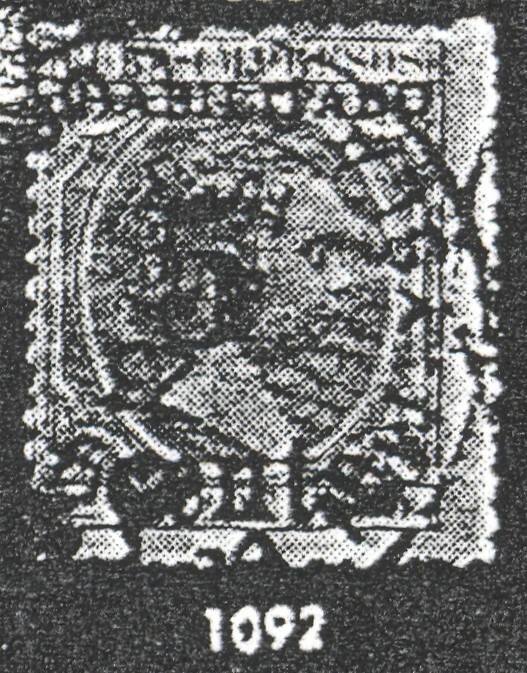 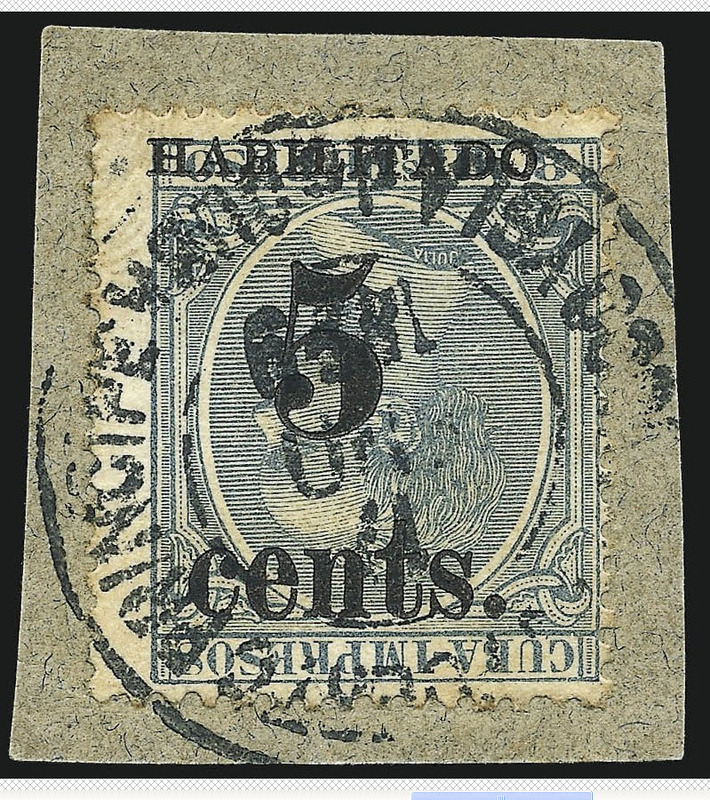 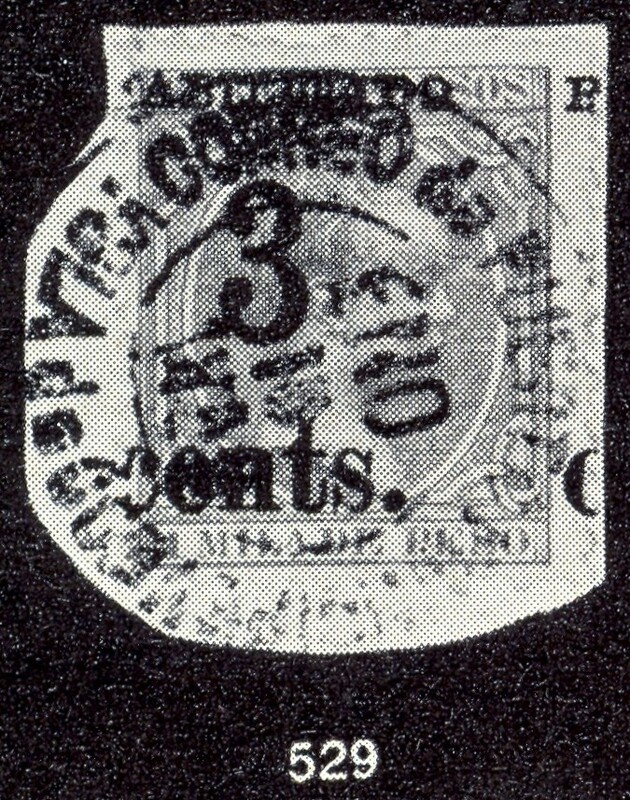 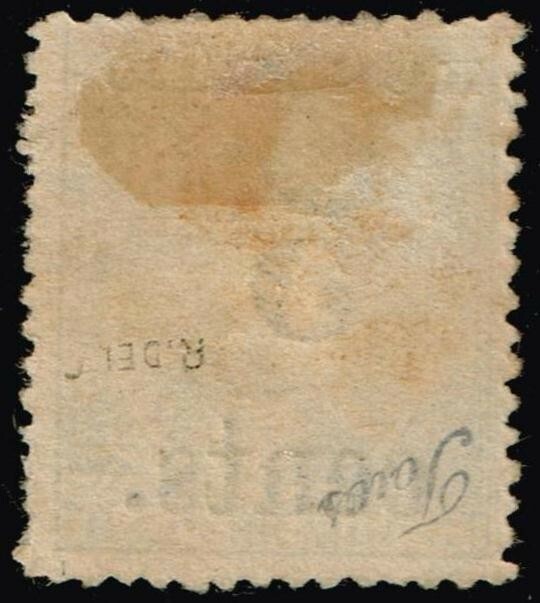 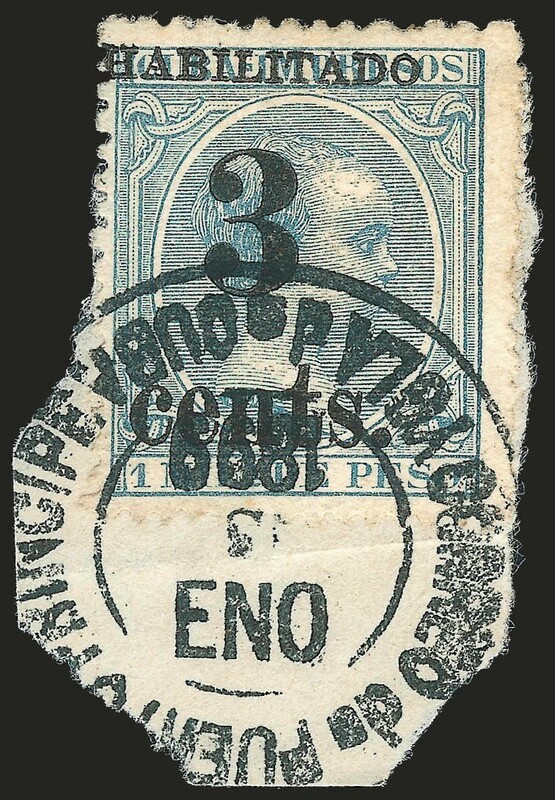 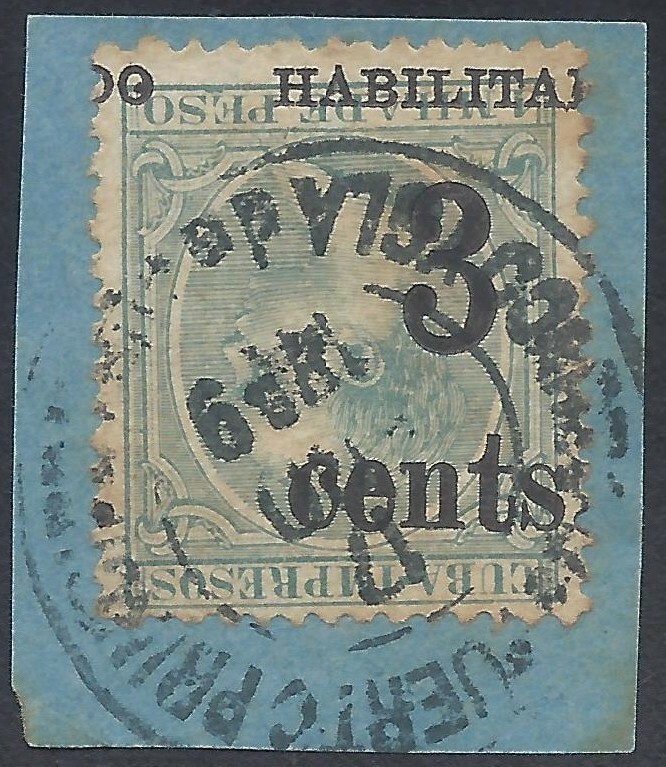 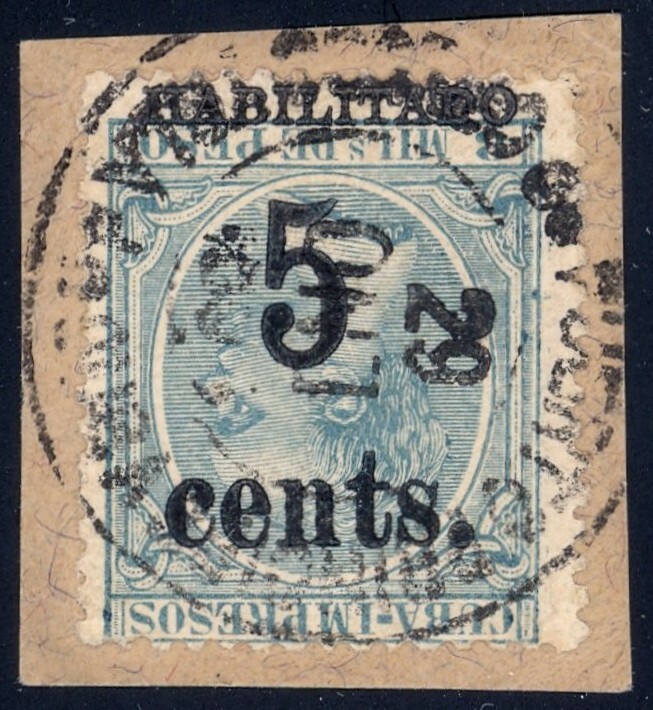 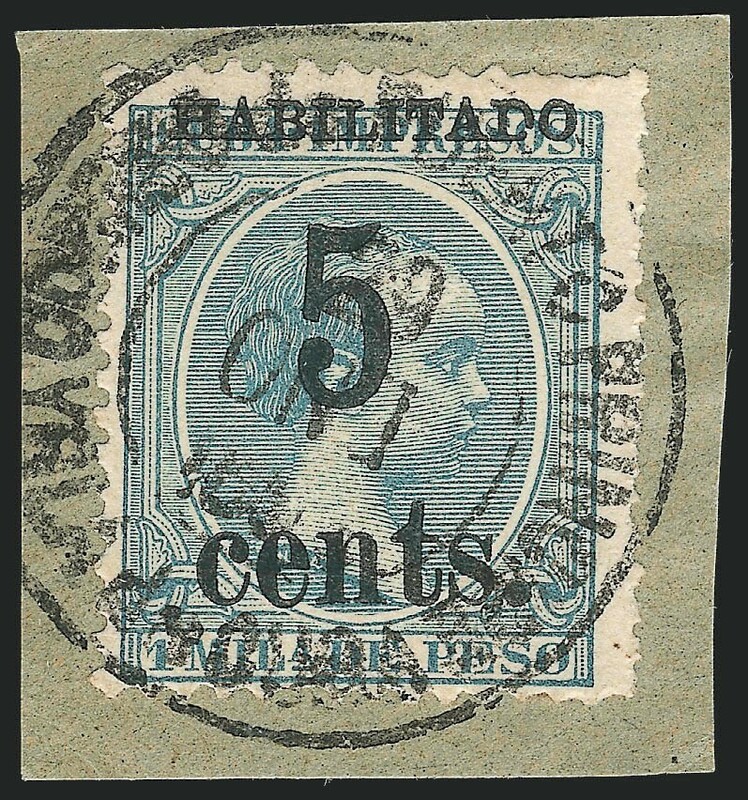 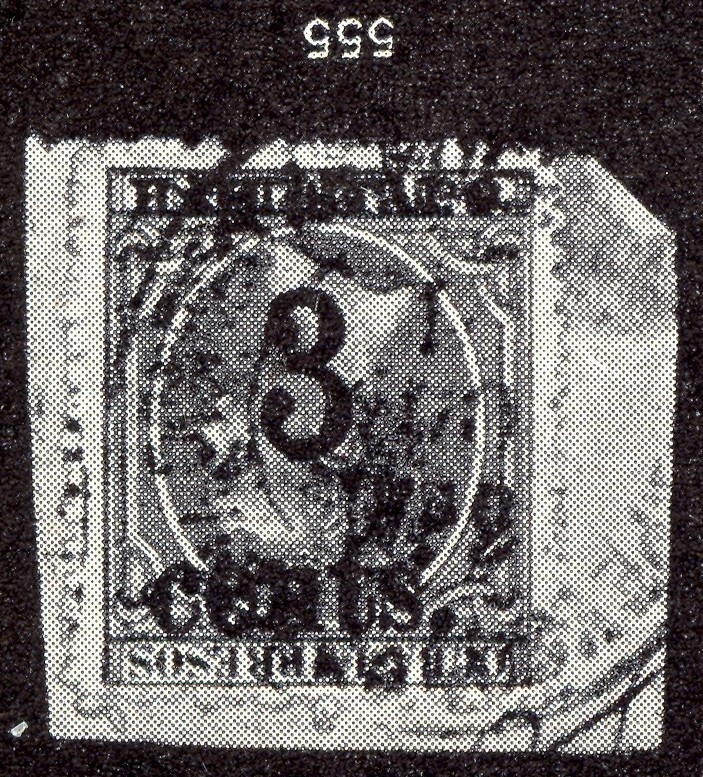 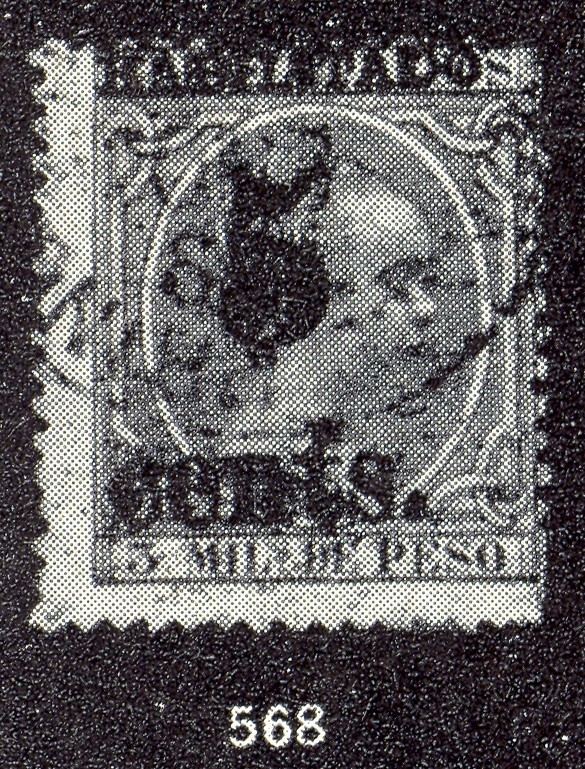 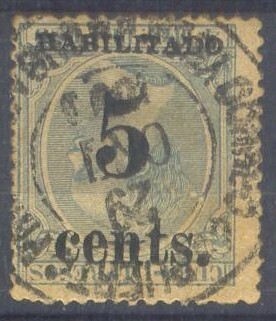 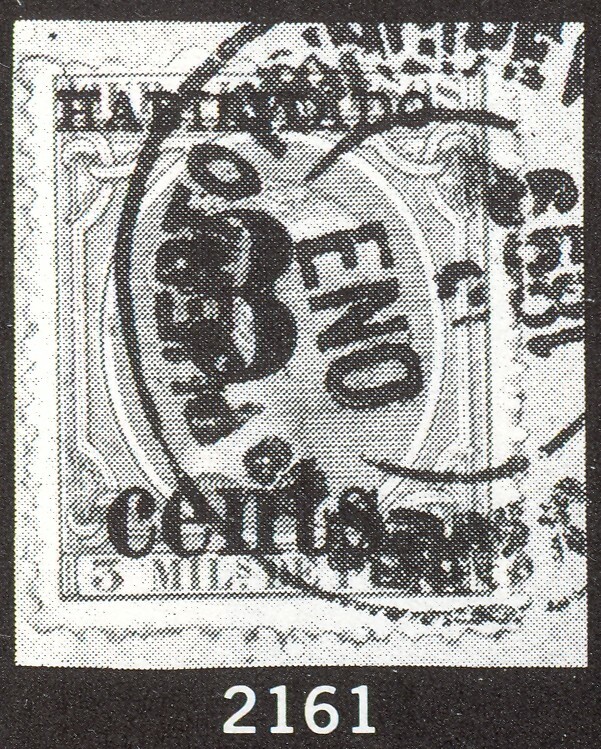 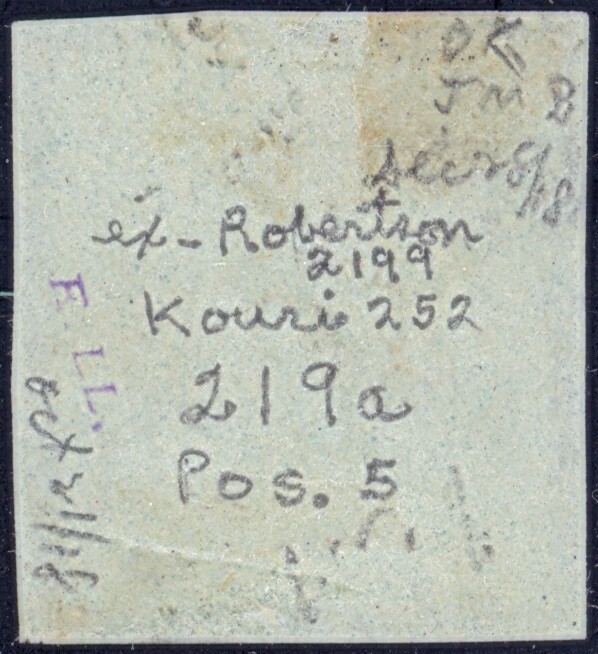 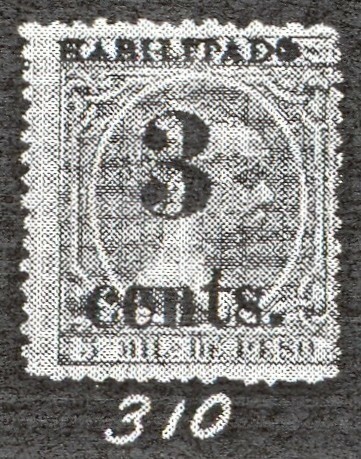 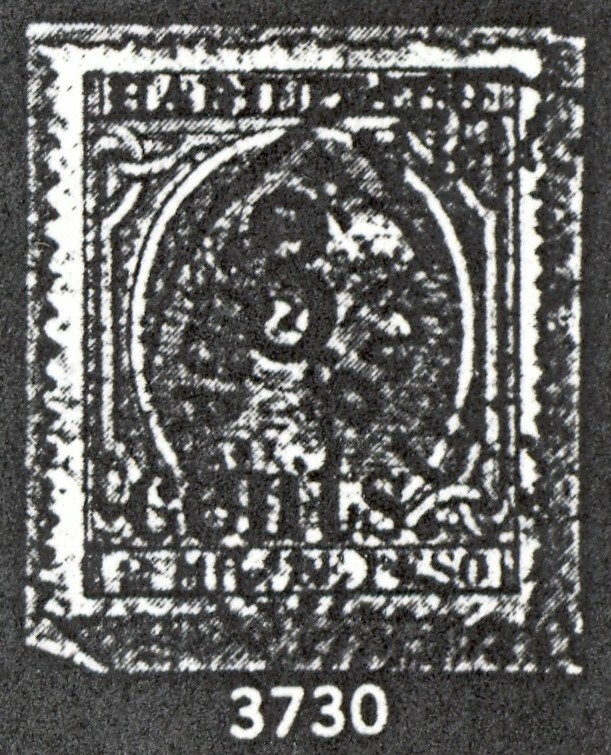 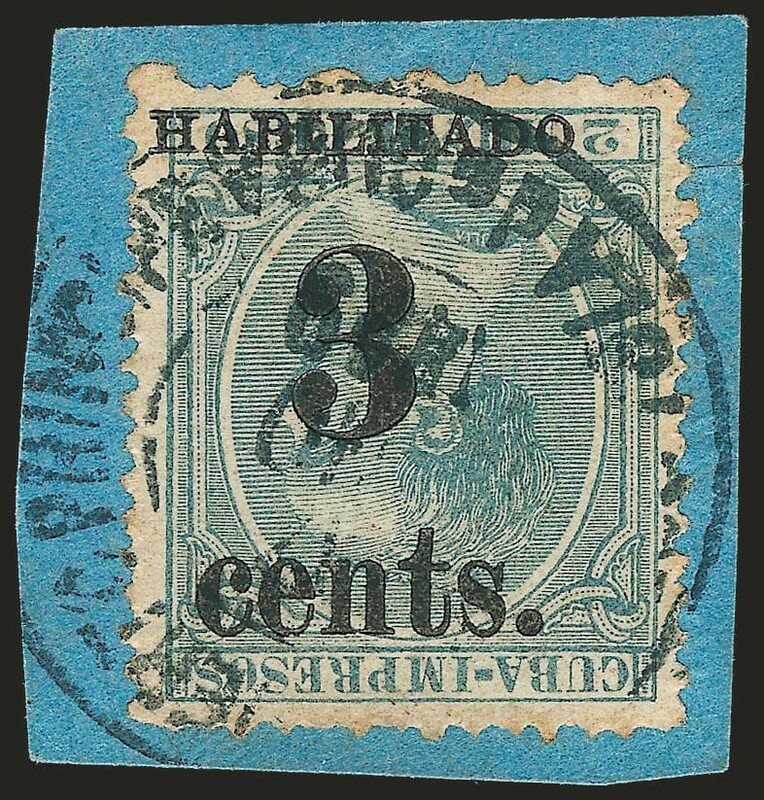 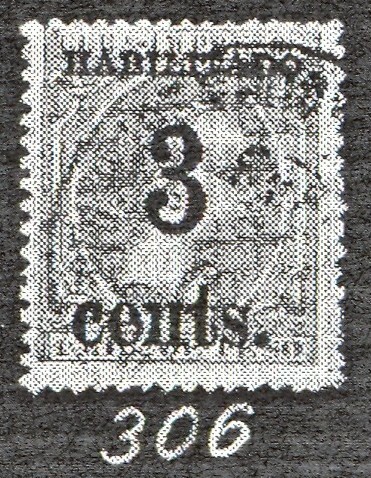 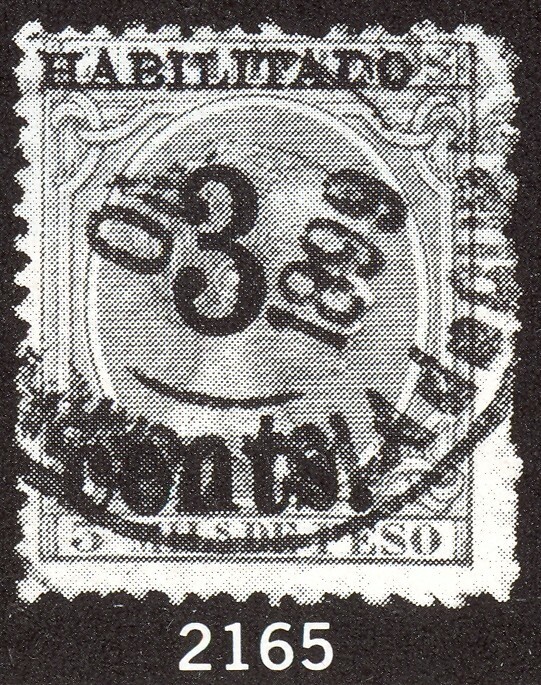 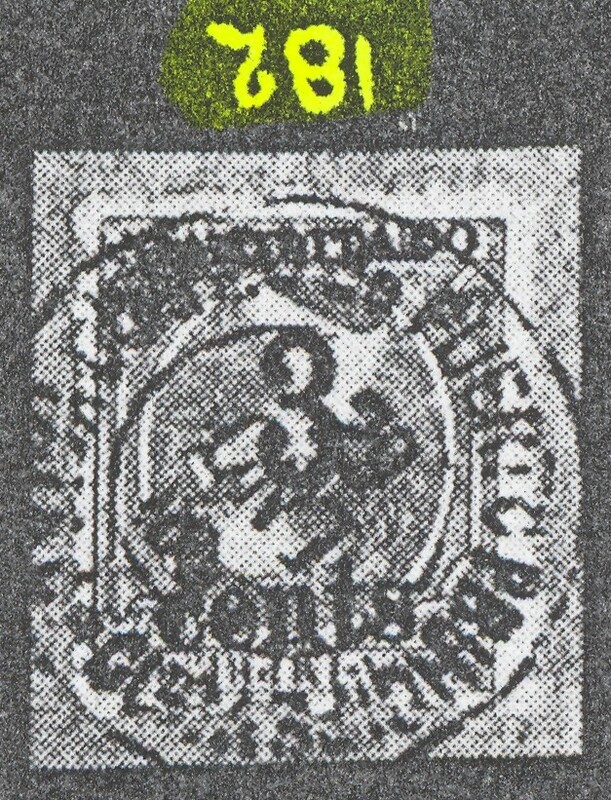 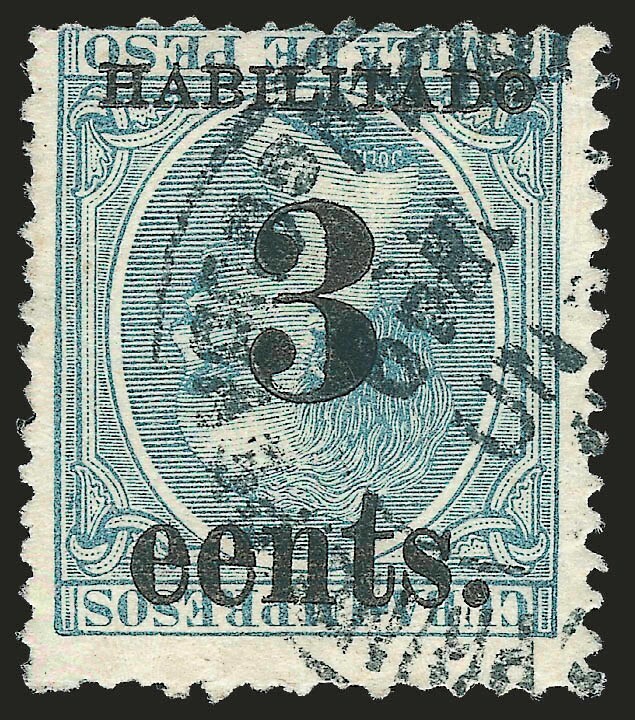 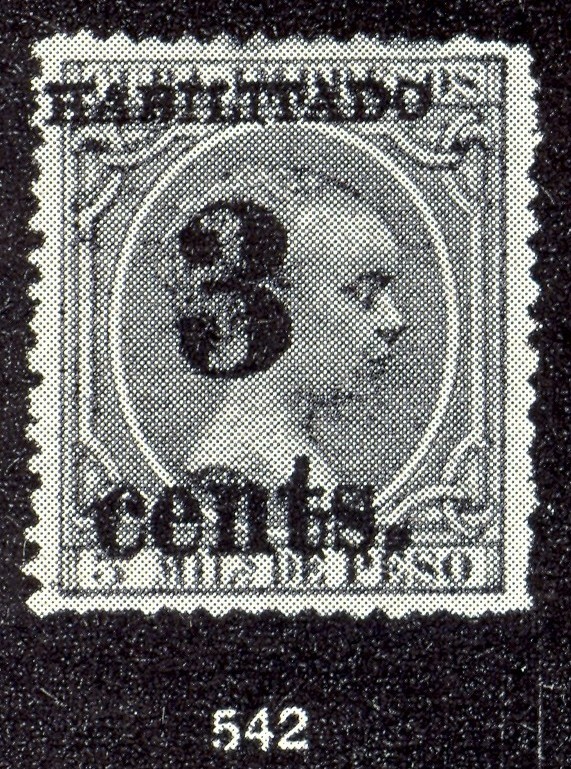 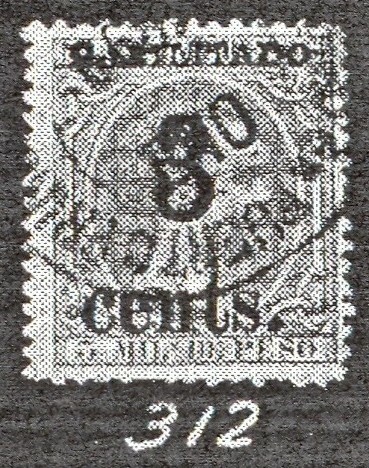 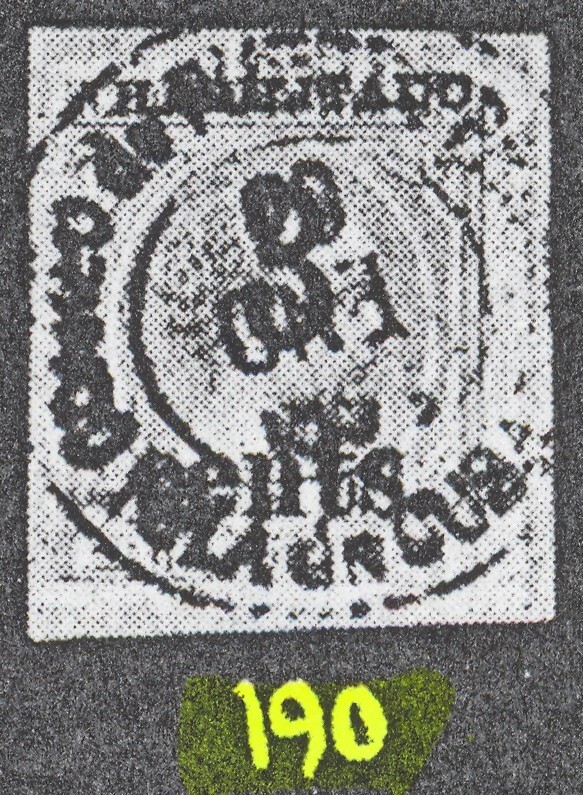 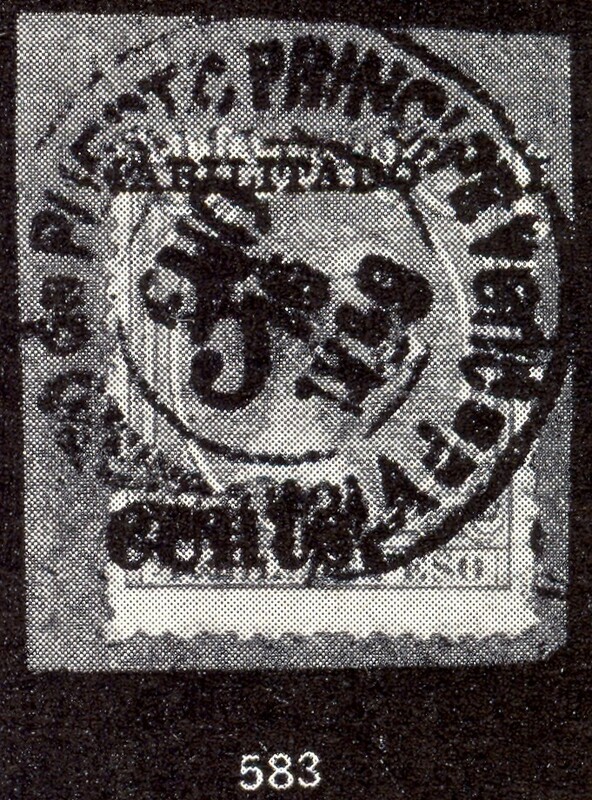 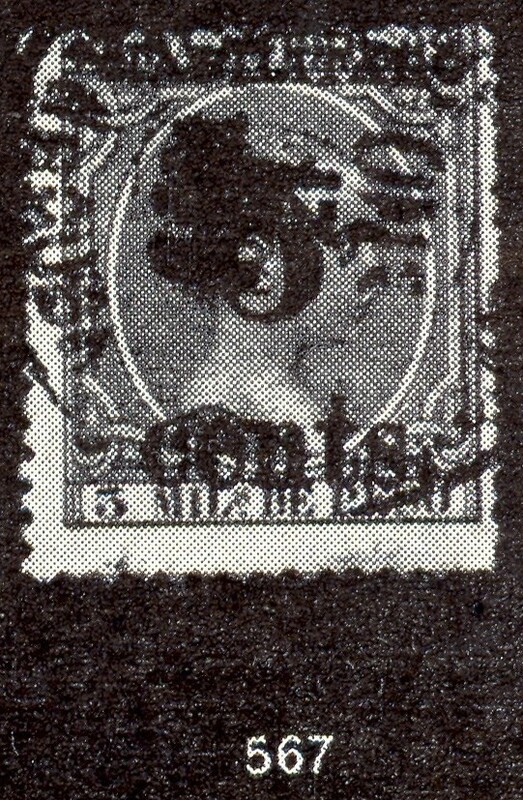 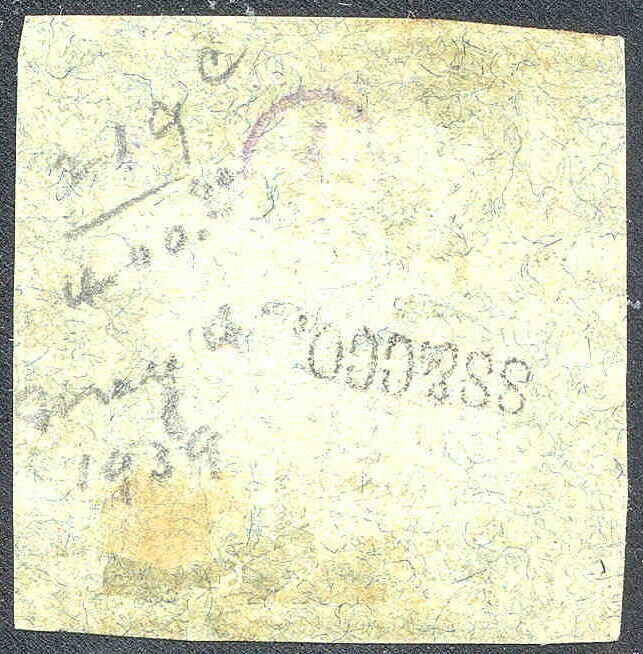 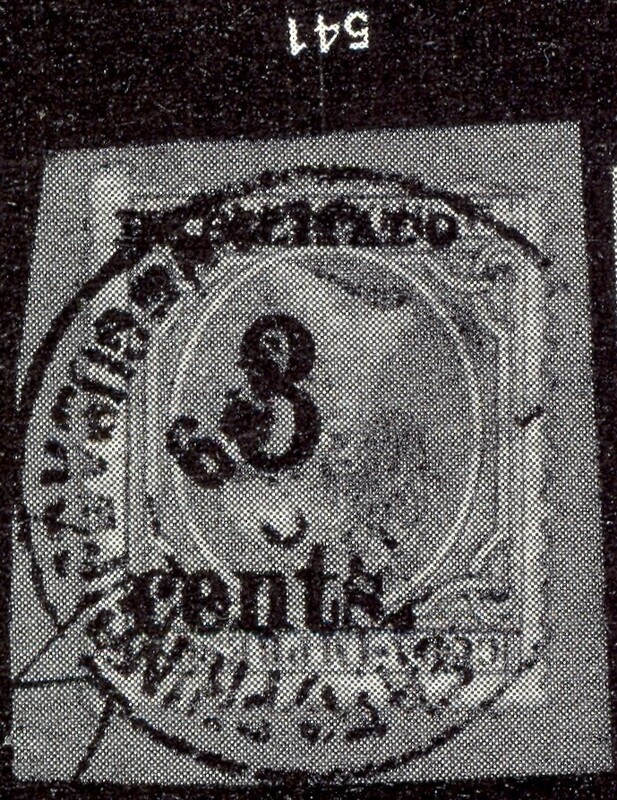 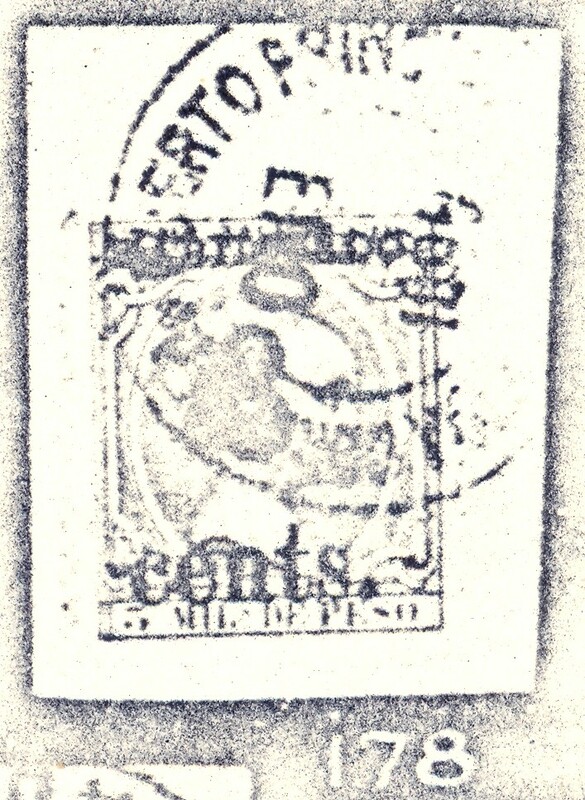 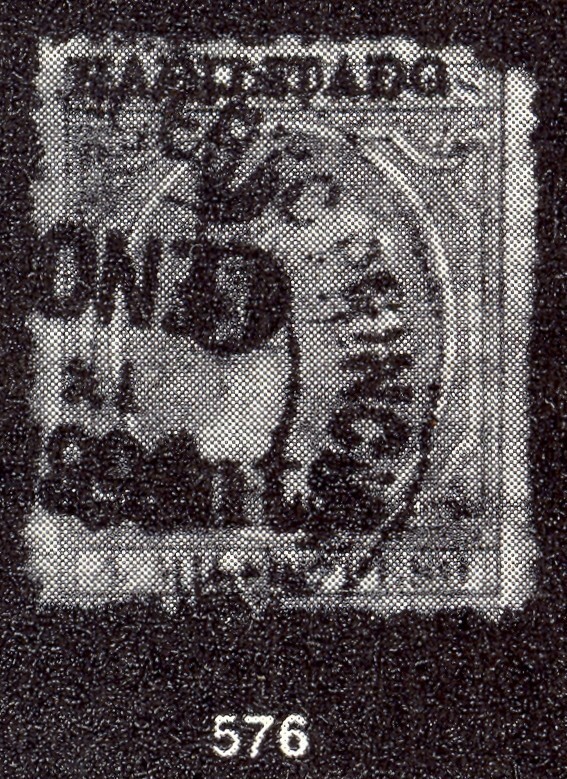 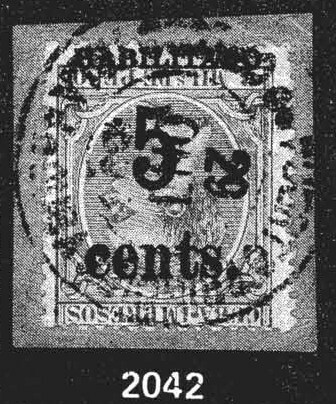 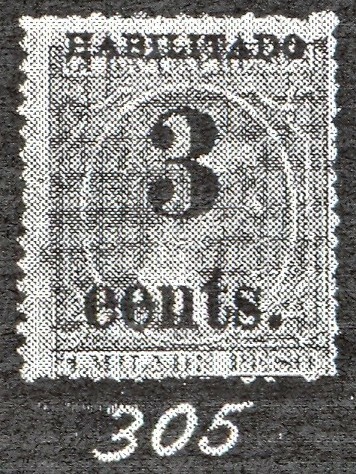 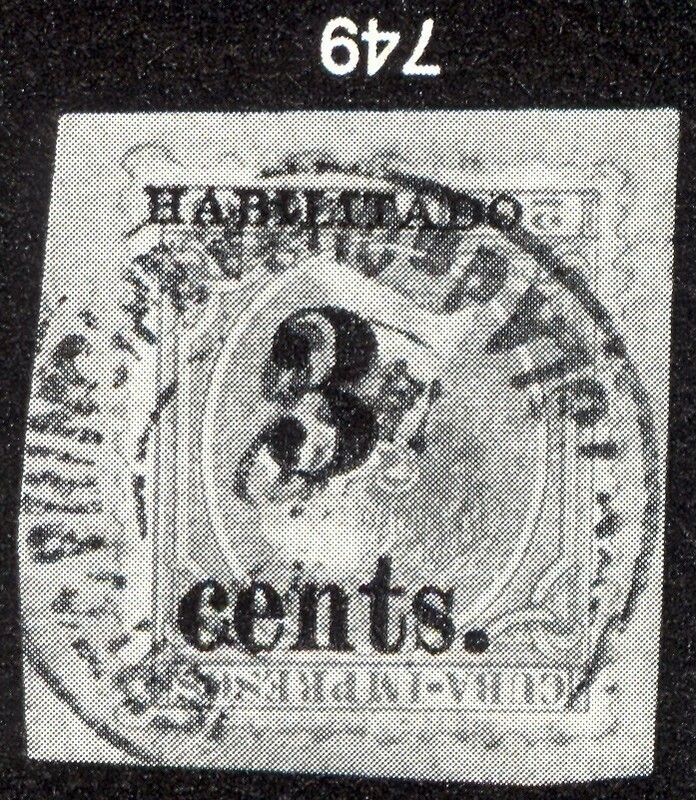 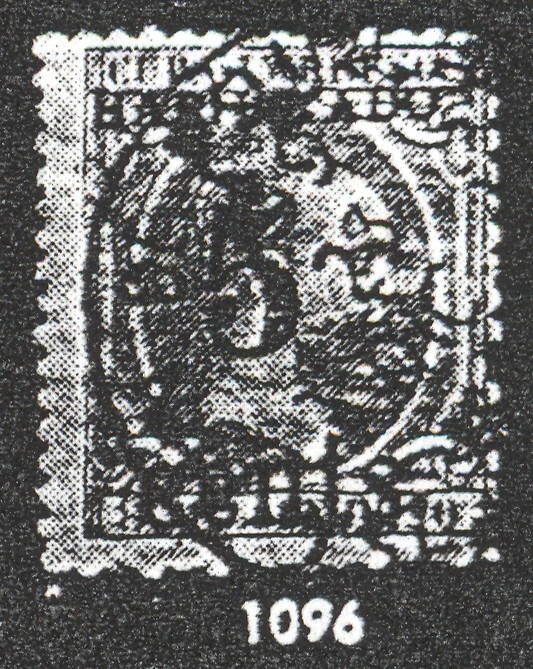 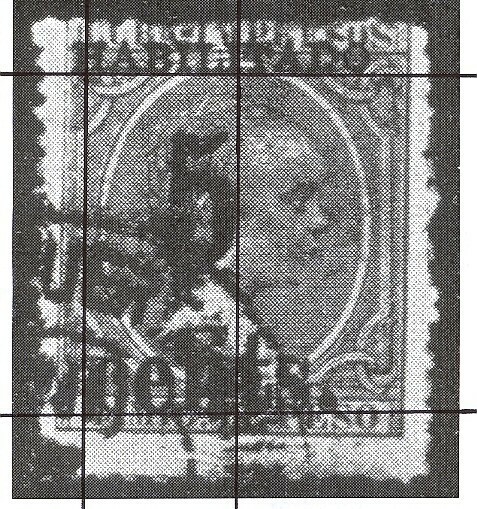 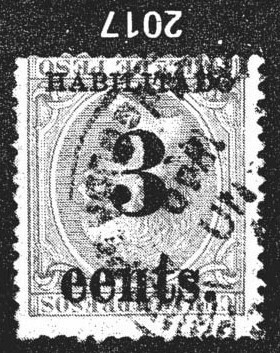 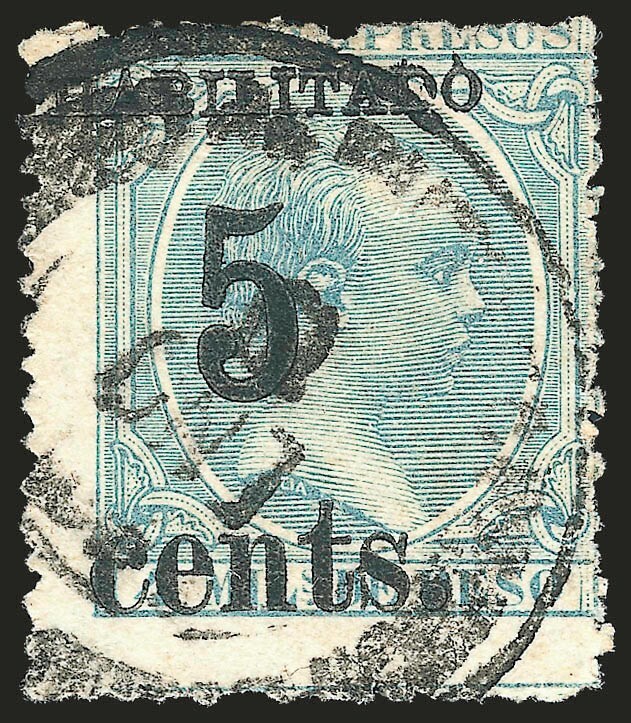 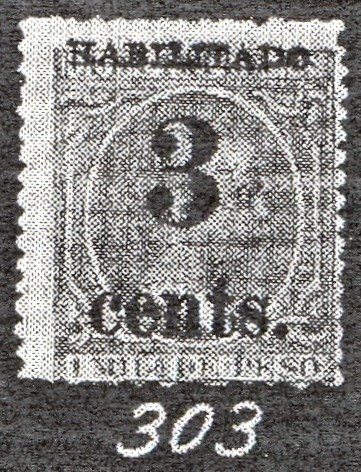 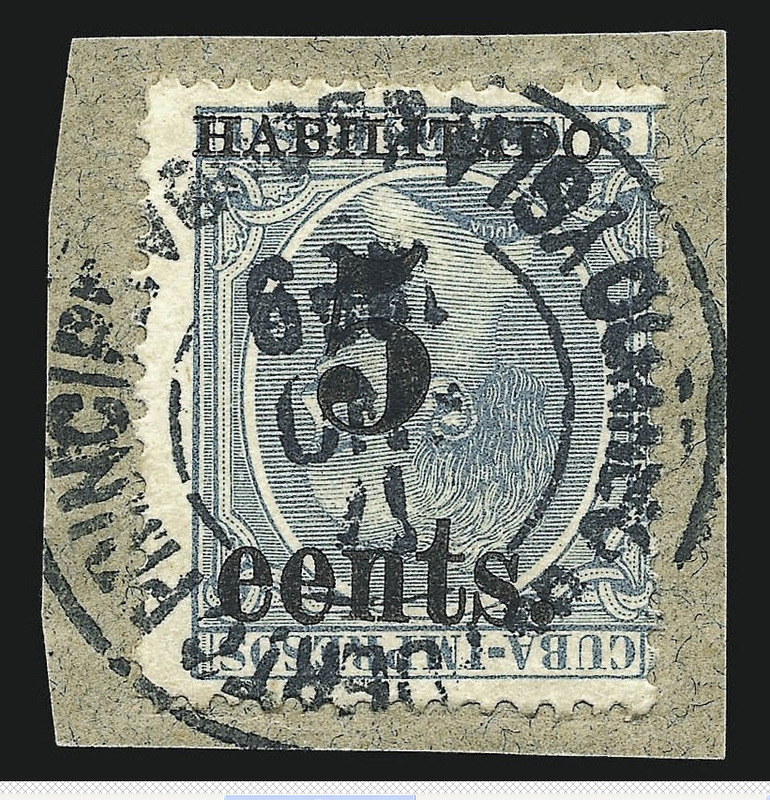 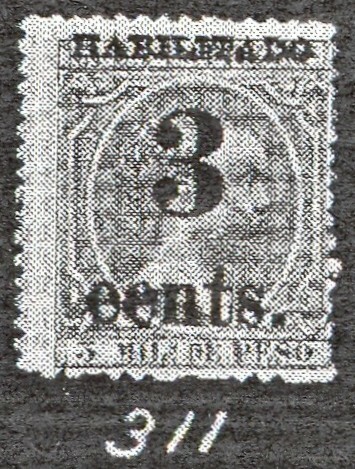 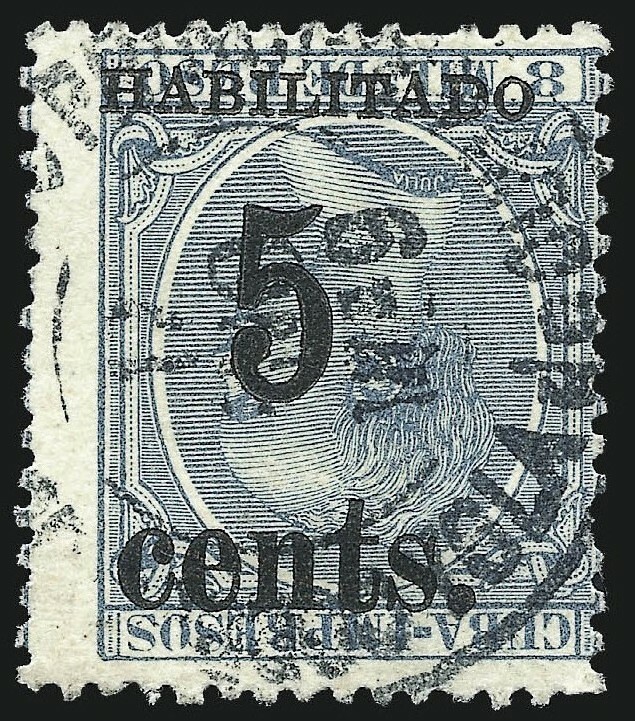 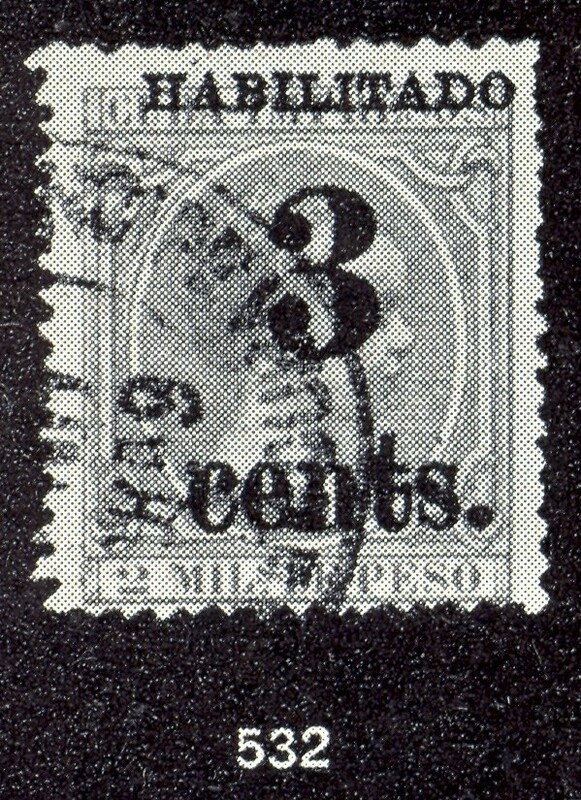 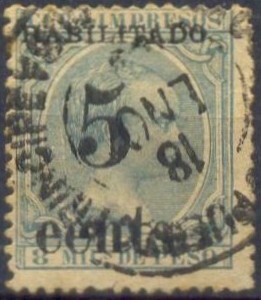 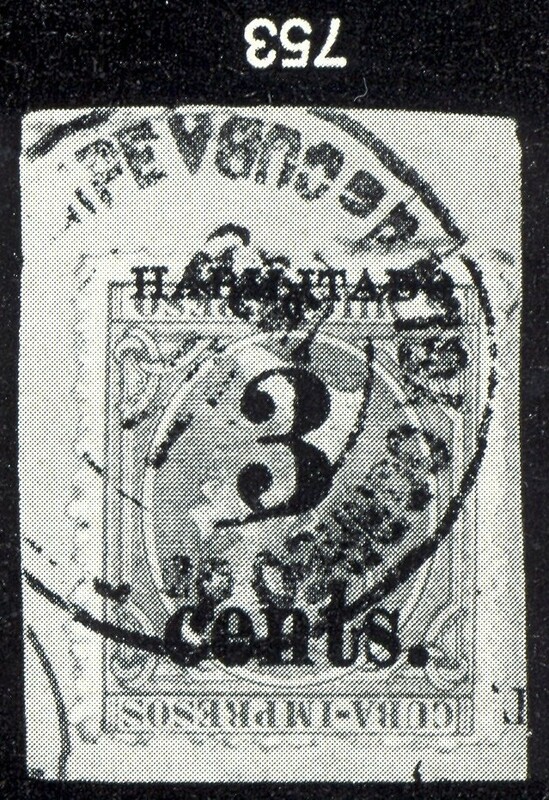 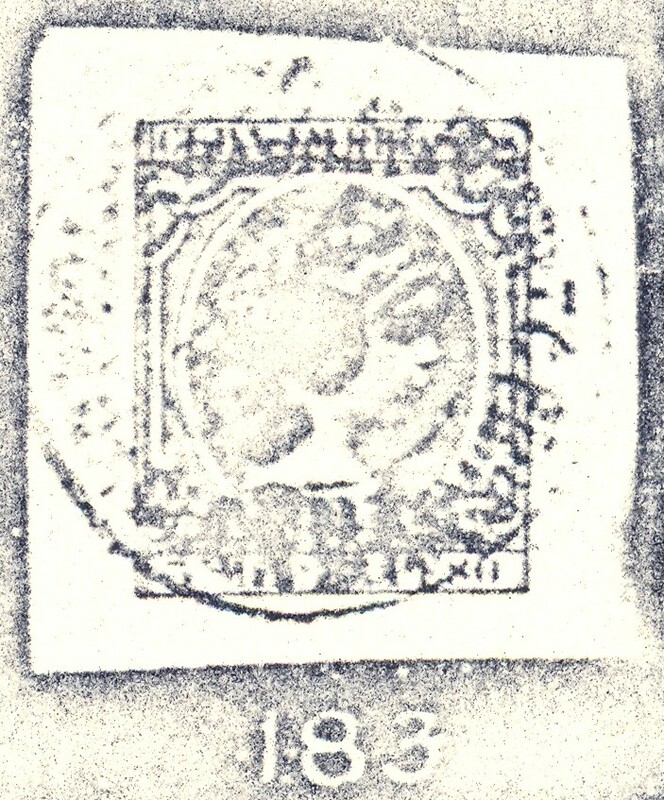 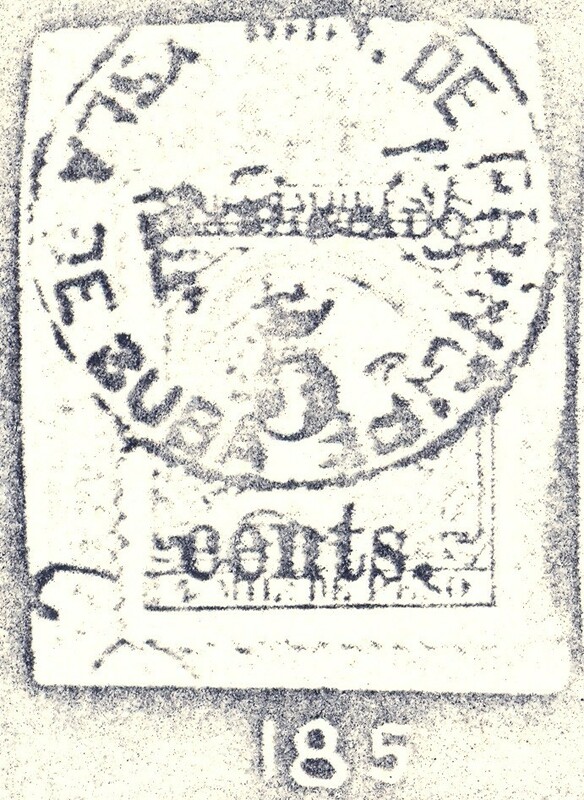 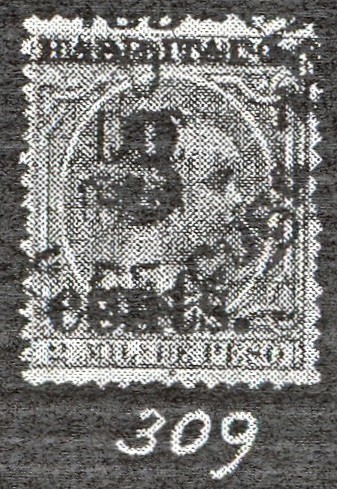 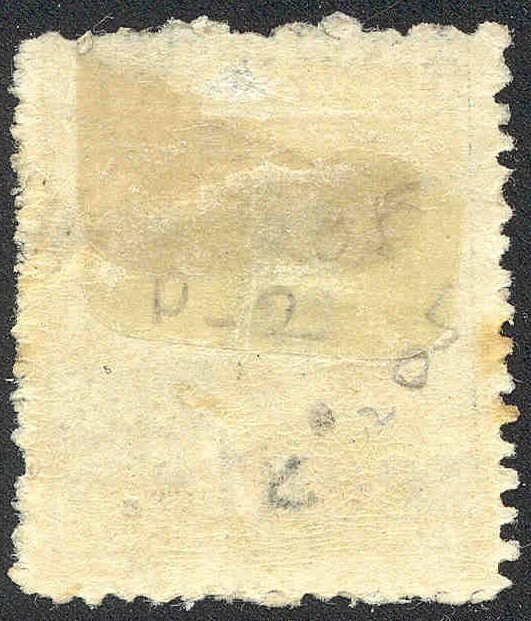 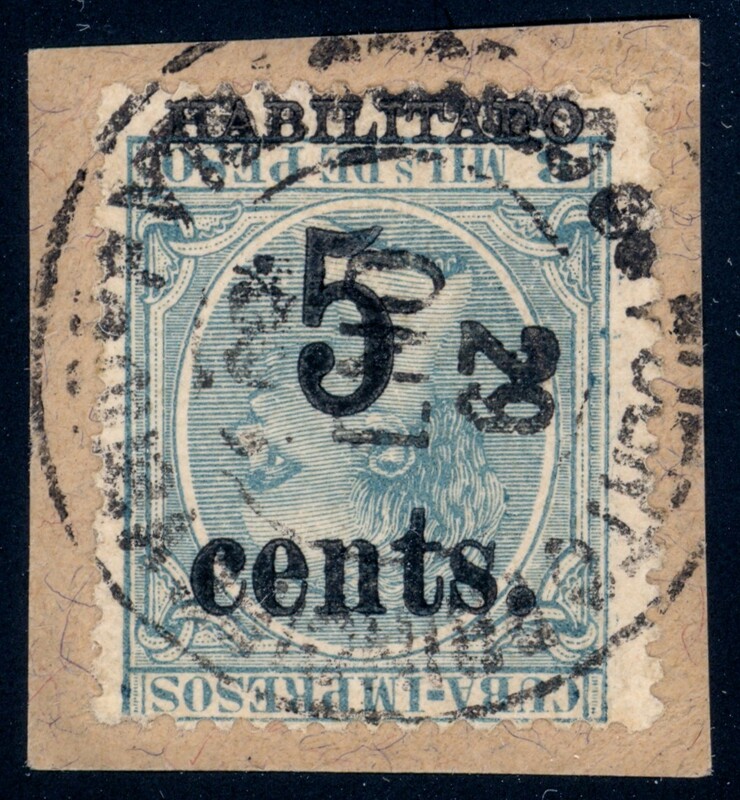 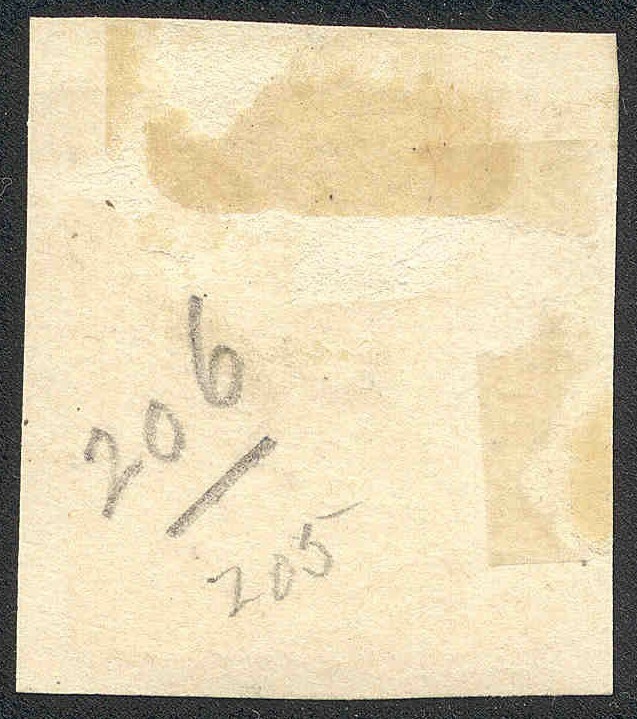 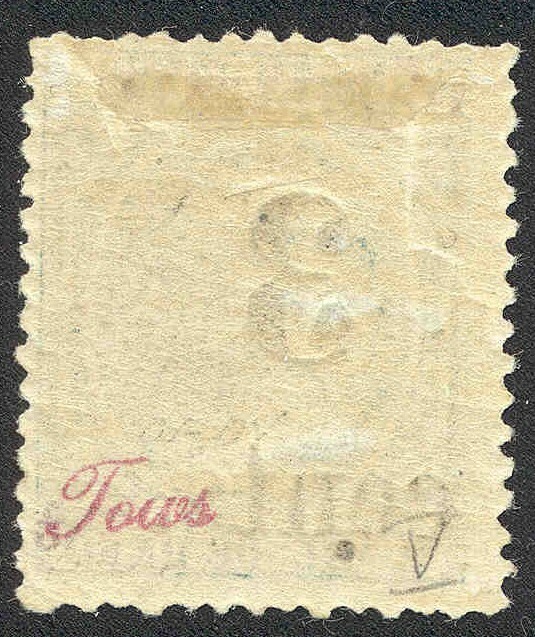 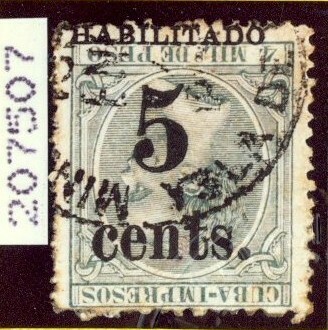 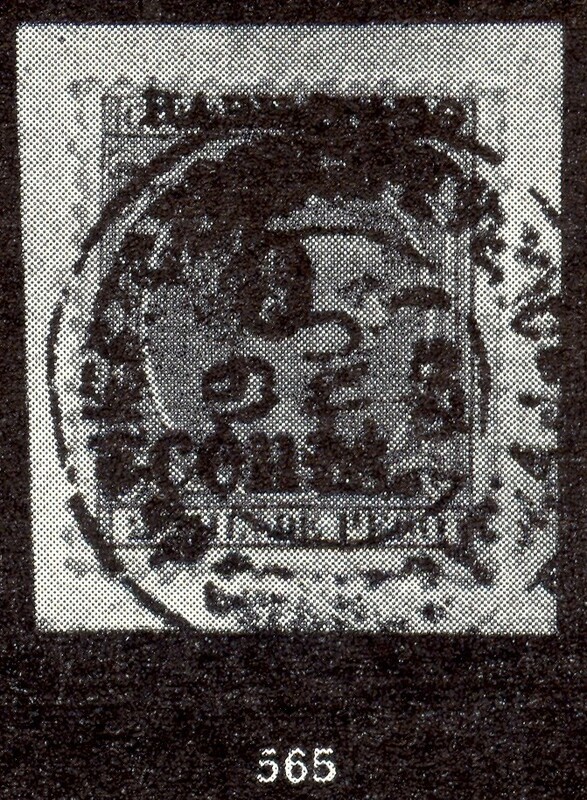 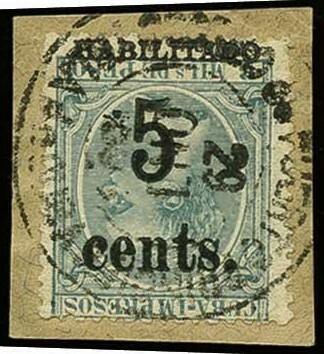 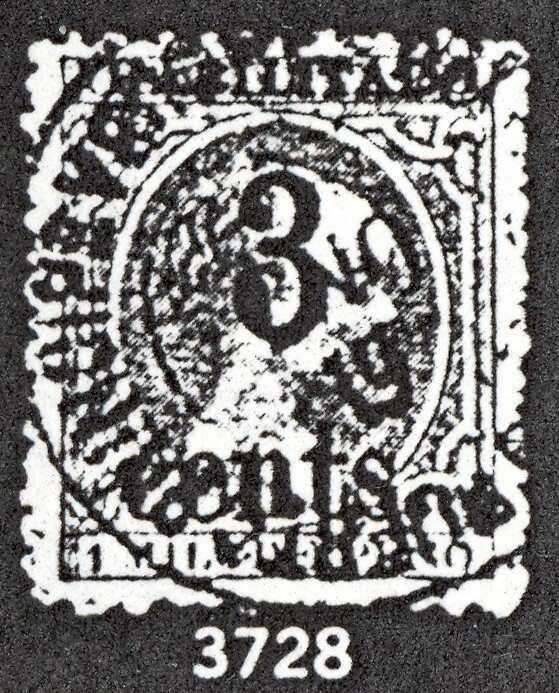 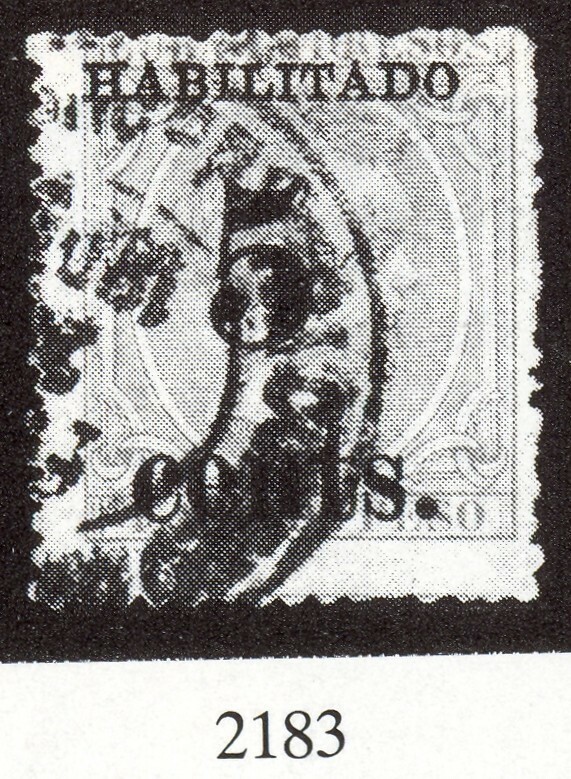 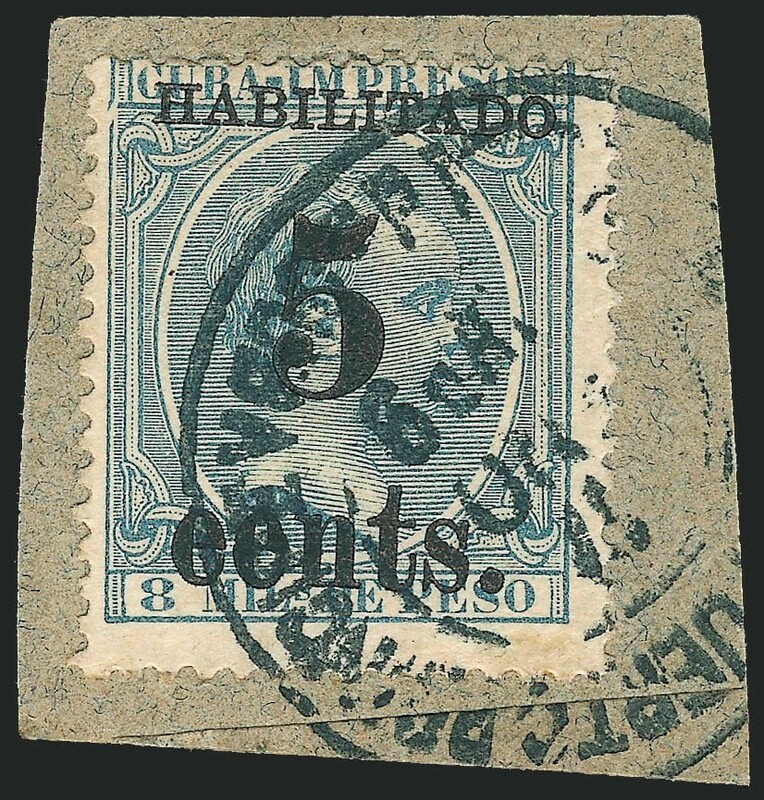 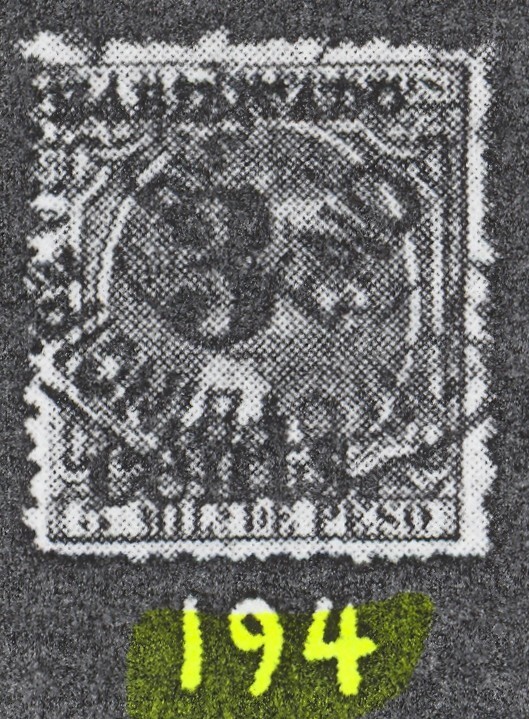 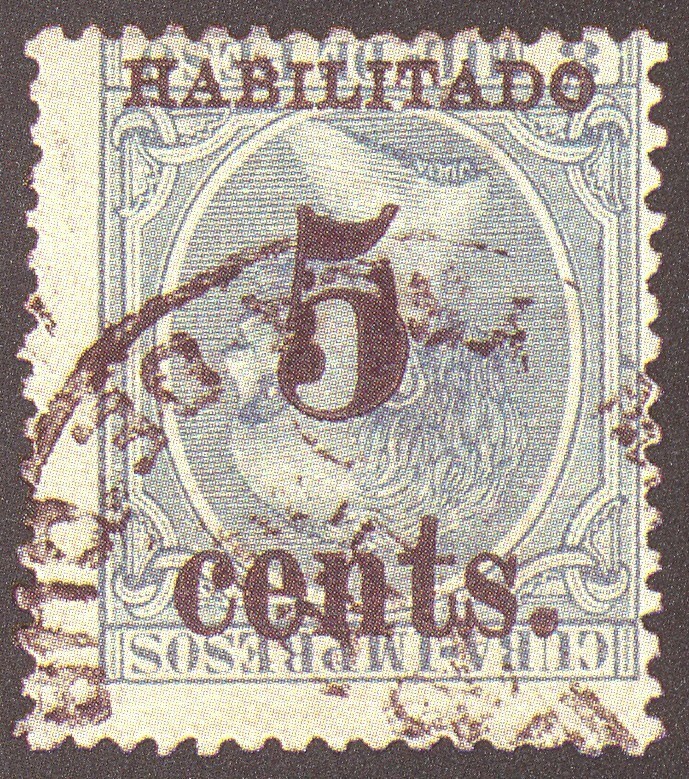 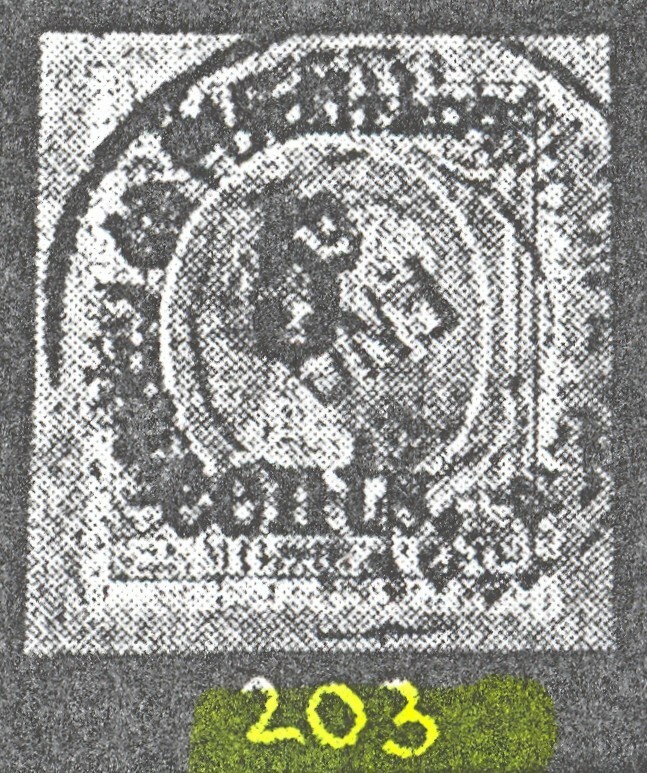 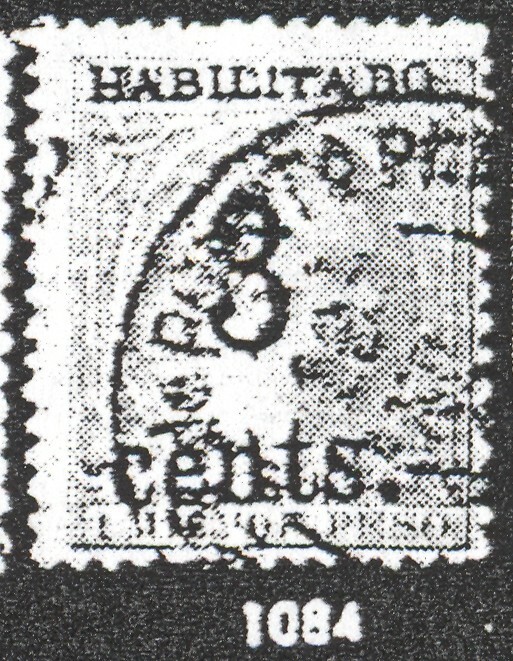 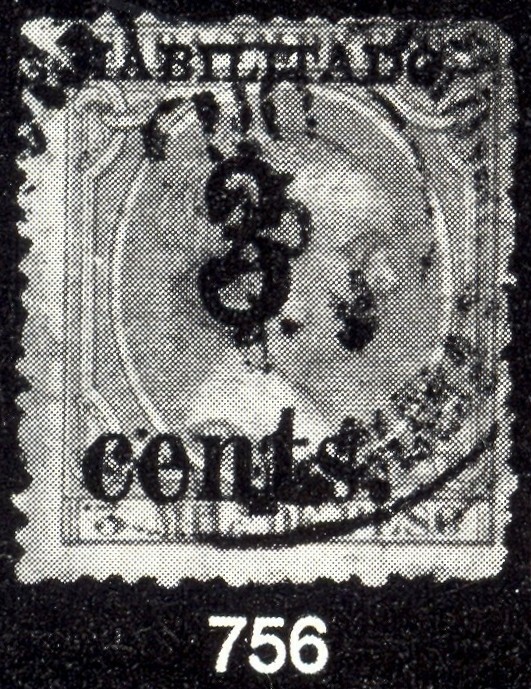 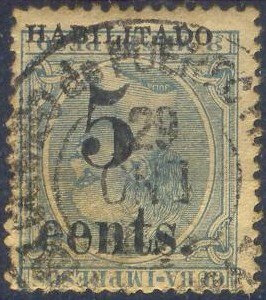 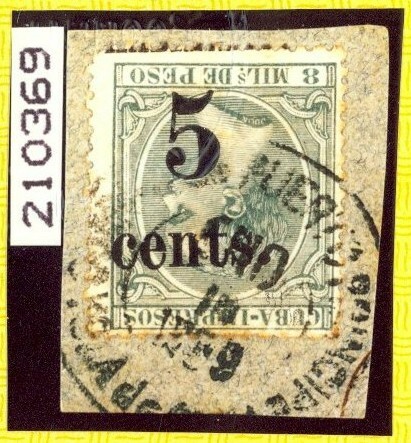 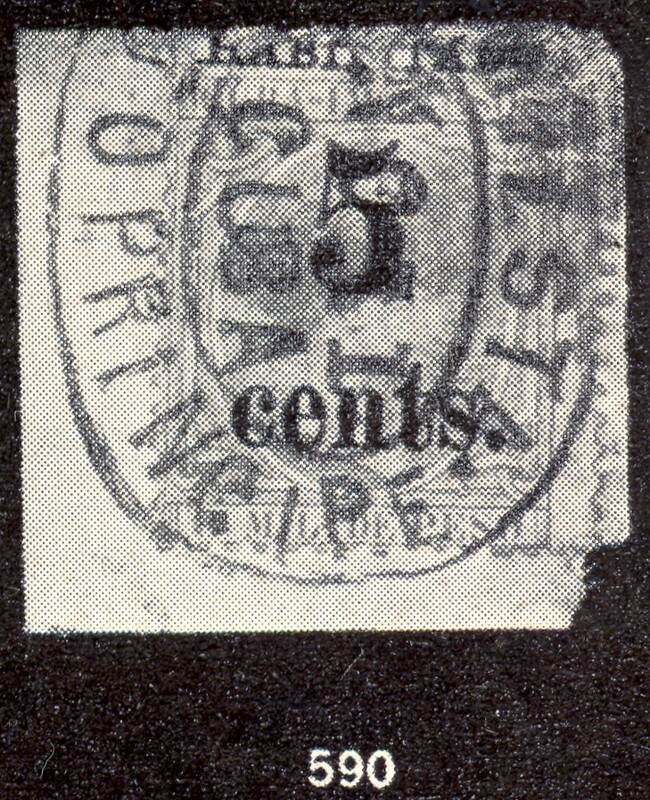 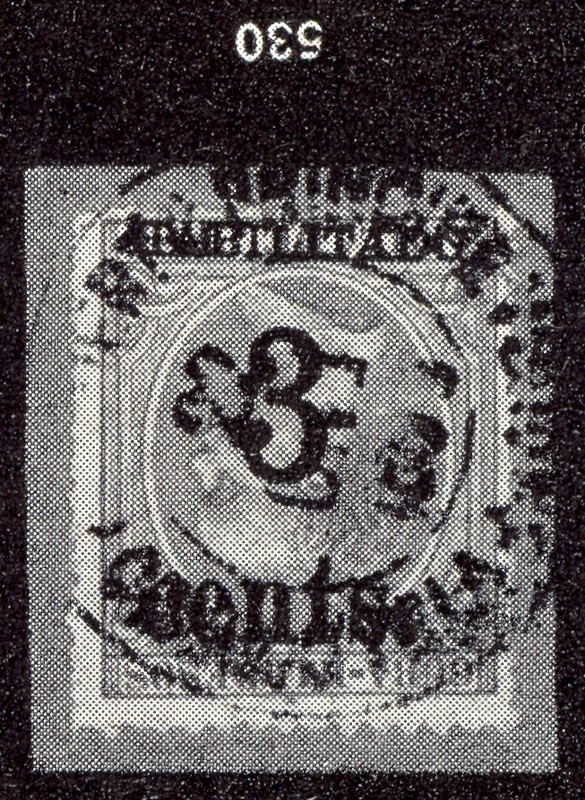 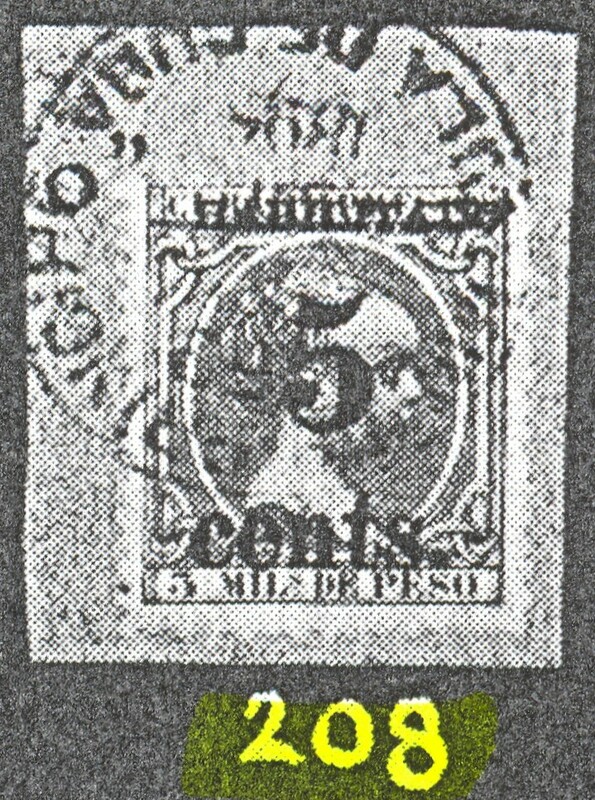 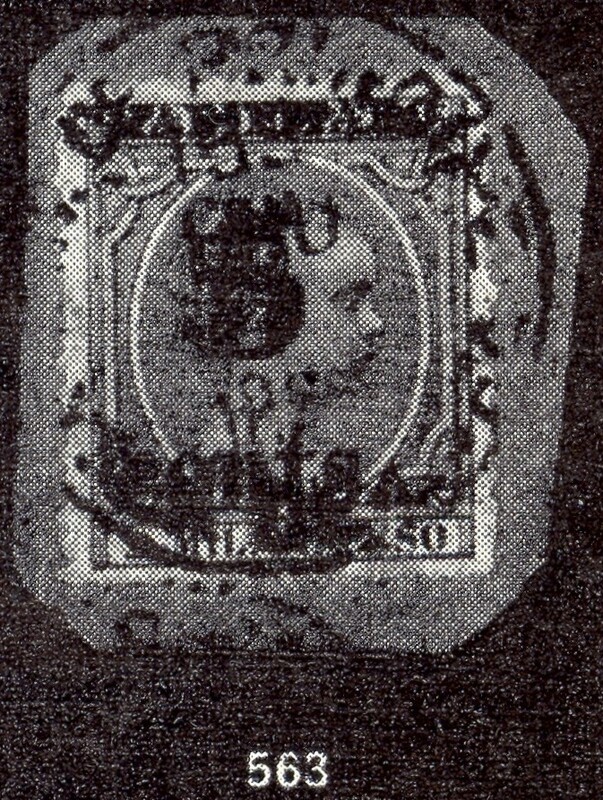 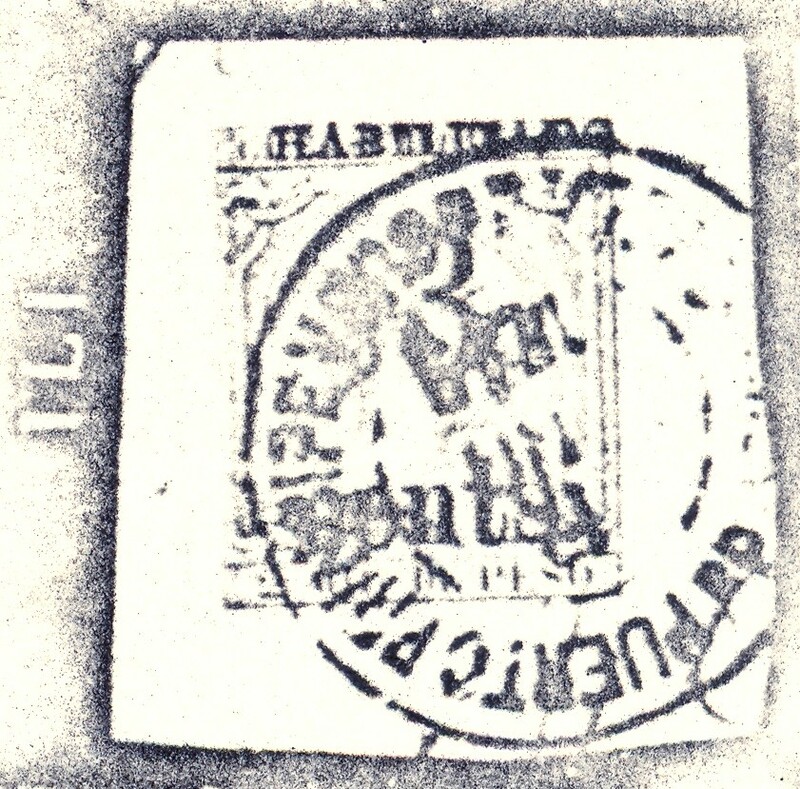 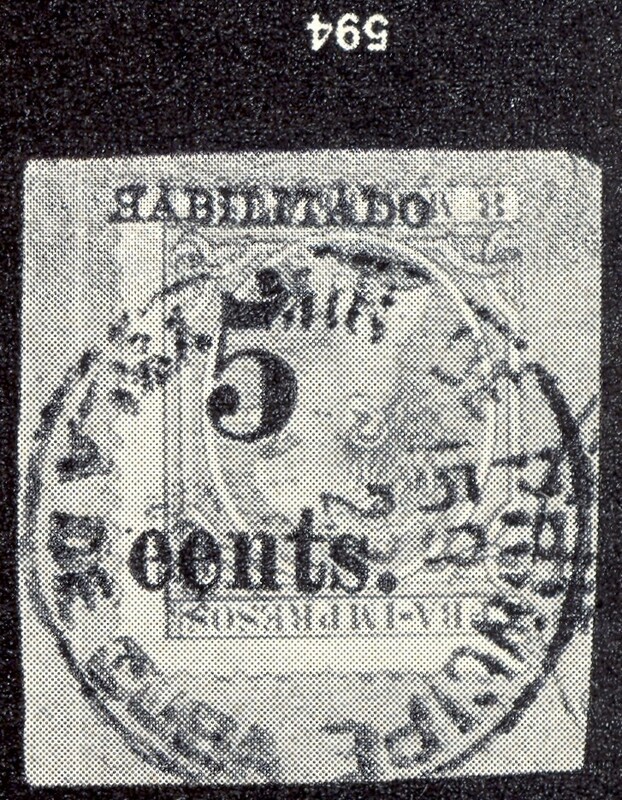 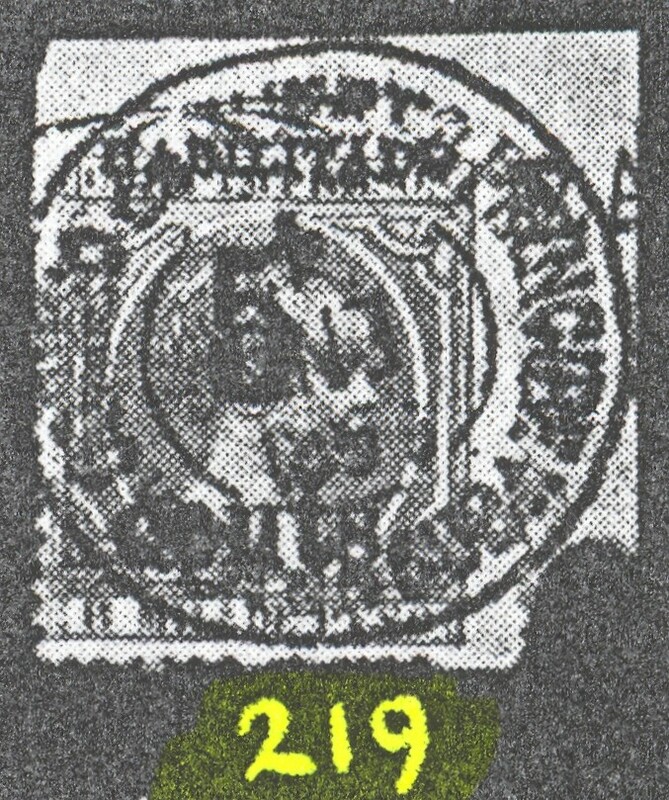 This stamp was identified as Pos1 in the Robertson sale. 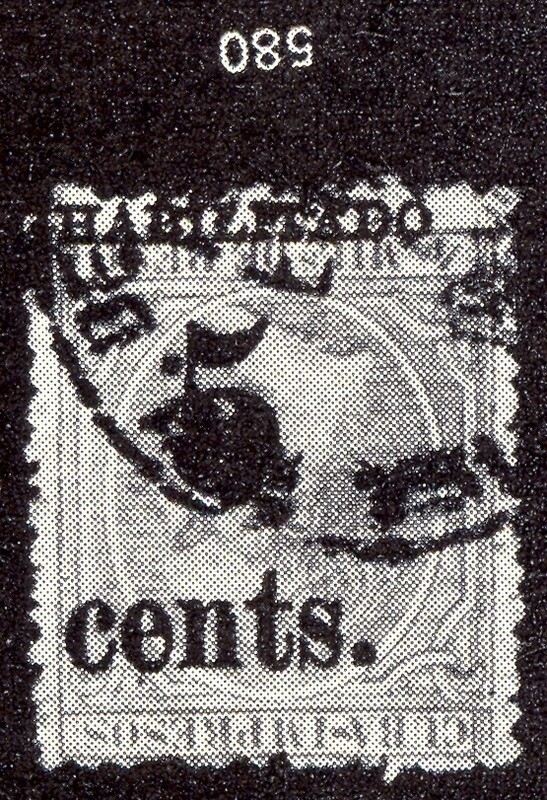 This piece was cut at top between Tows and Juhring sales. 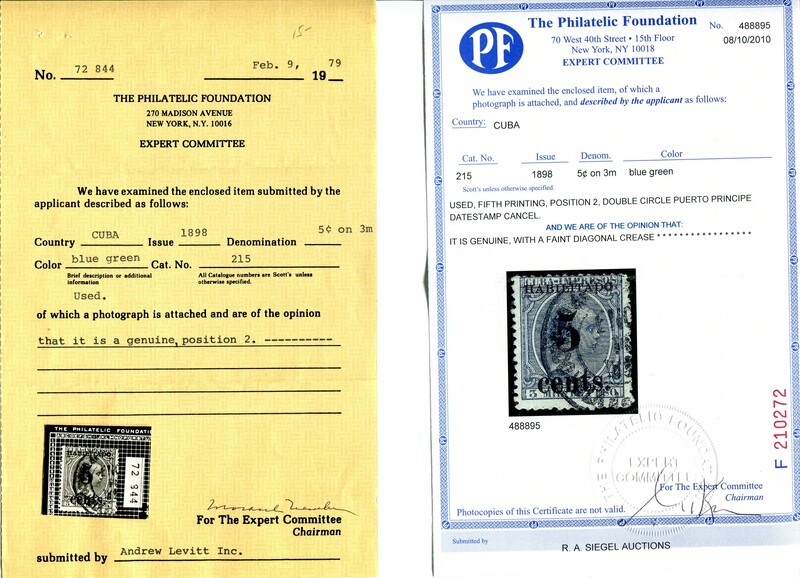 Auction listing claimed it has a 1964 Philatelic Foundation Certificate, but a search for it at the PF did not find it. 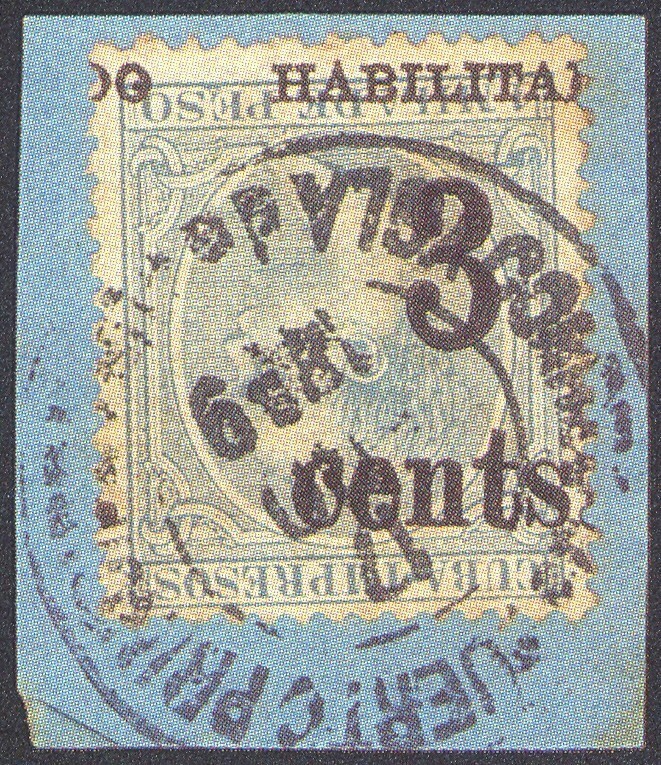 Stamp was reoffered at Kelleher Sale 625, 8-9 July 2011, as Lot 1337. 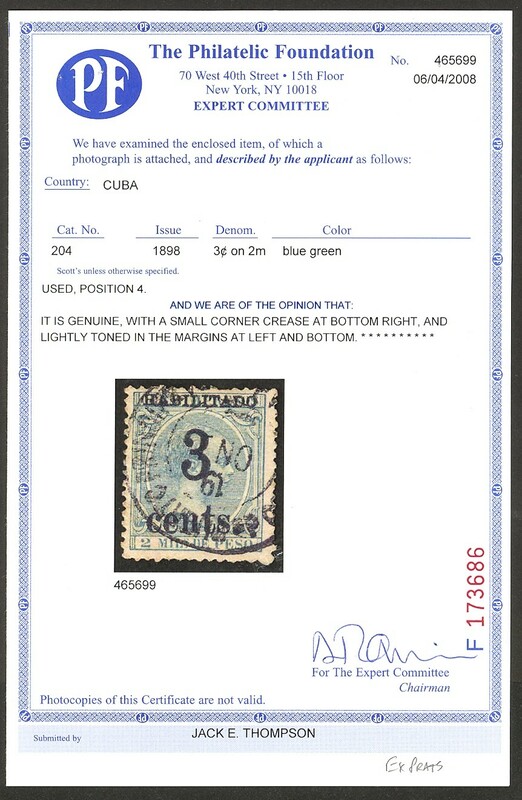 Stamp was reoffered at Kelleher Sale 625, 8-9 July 2011, as Lot 1339. 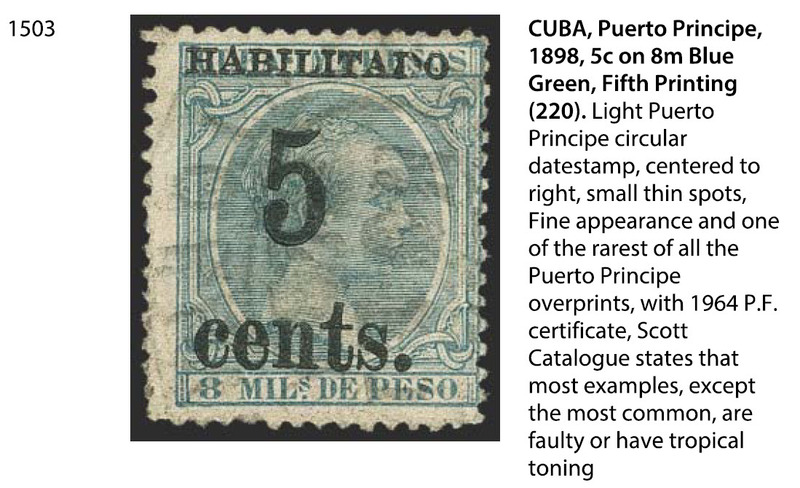 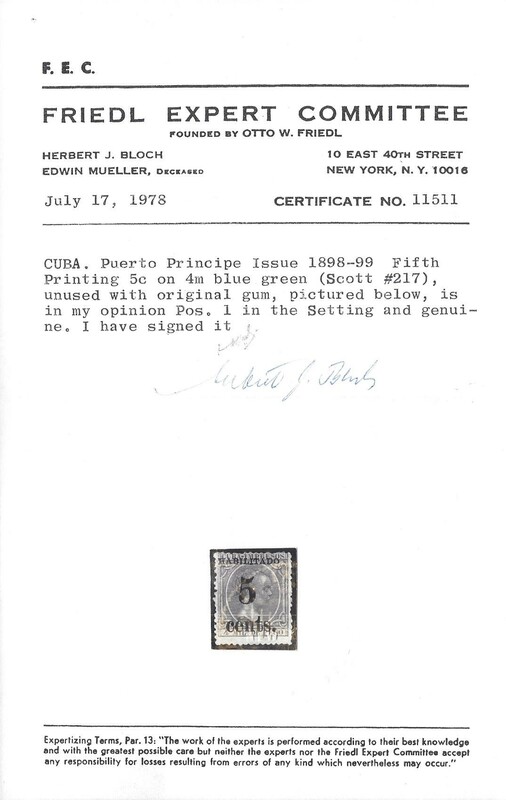 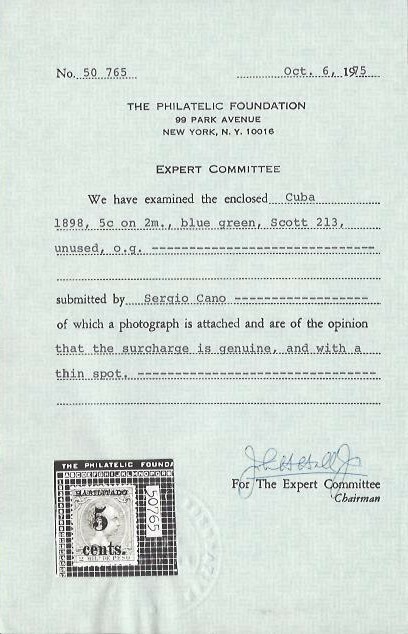 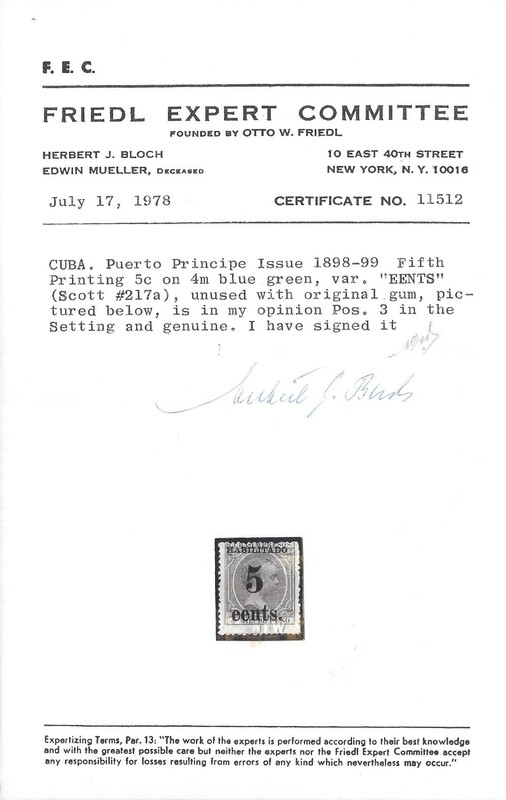 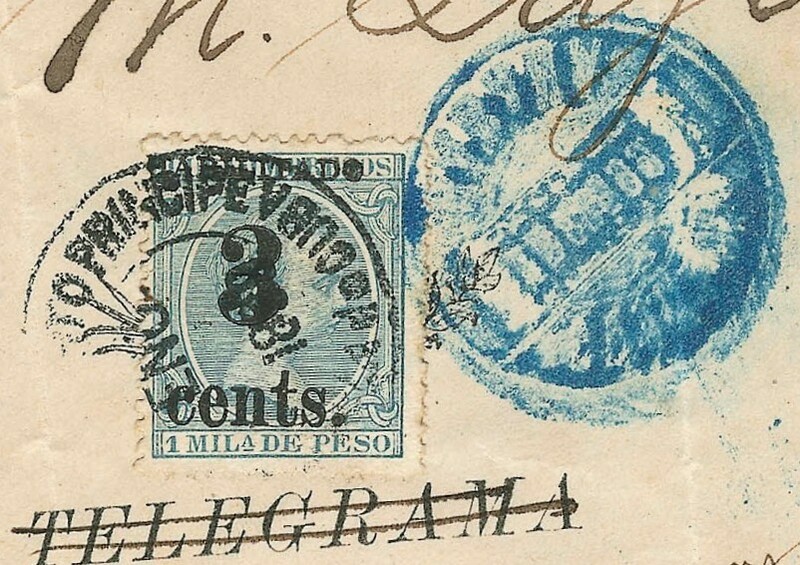 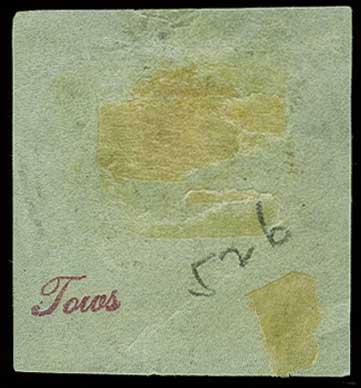 This was lot No.544 in the Carl E. Pelander Auction of the Ferrars H. Tows Collection of Puerto Príncipe stamps. 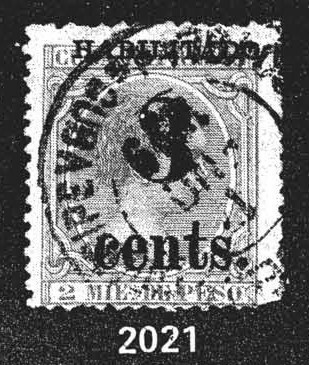 It was described in the auction catalog as being Scott 205, Position 5; however, the VVLs do not coincide with that position. 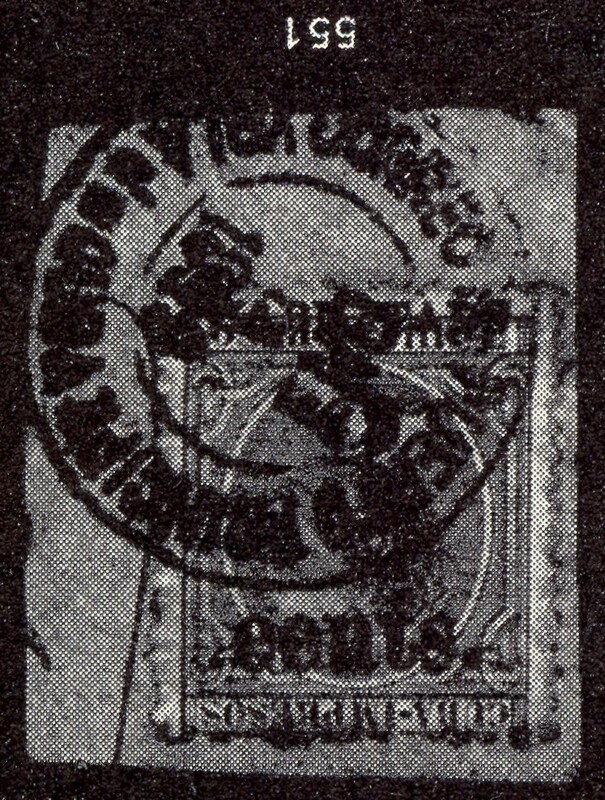 In fact, the VVLs do not coincide with any of the five positions of the surcharge although they are closer to positions 1 or 2. 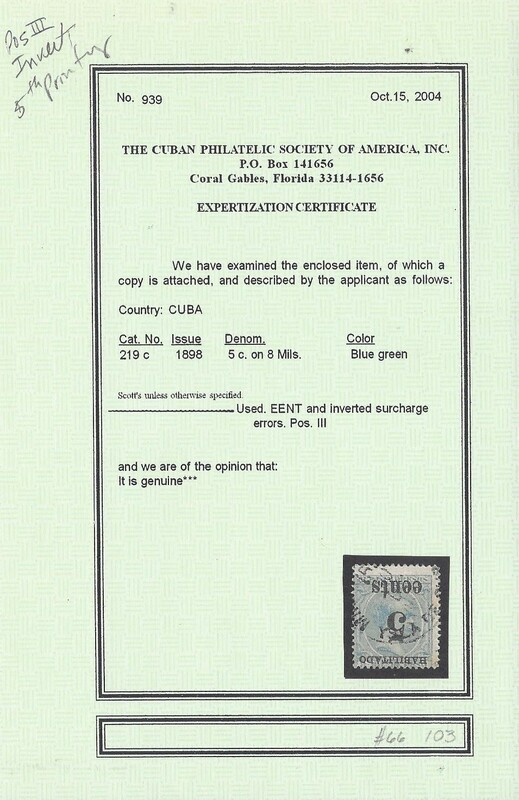 However, close examination of the fonts in the surcharge reveal that the surcharge is a crude fake. 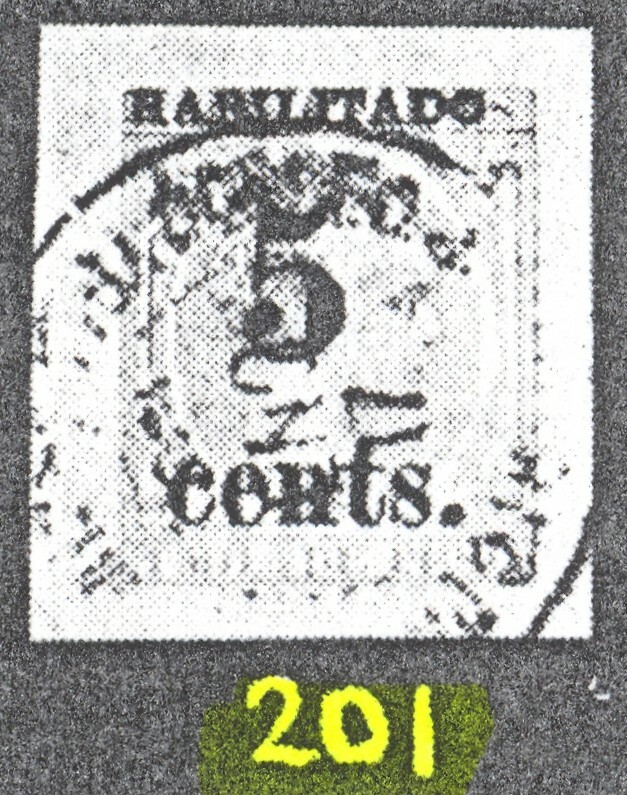 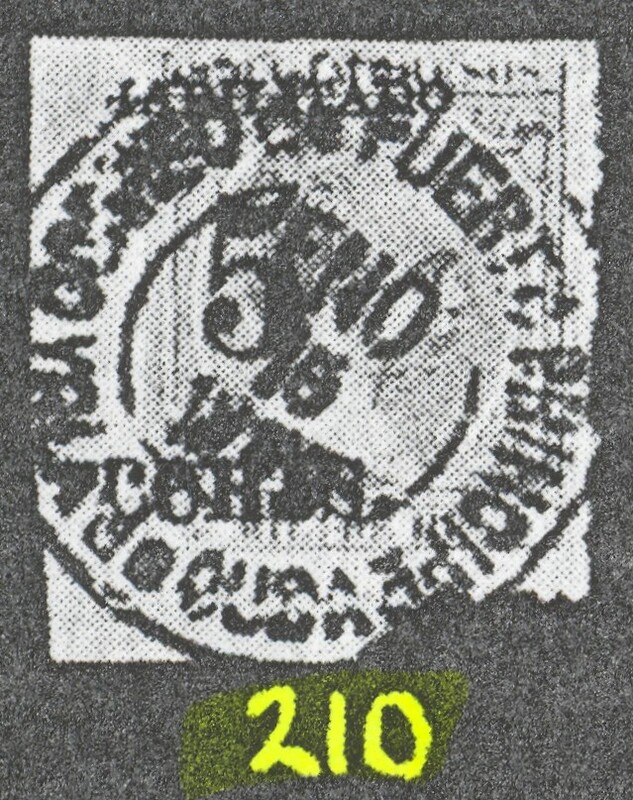 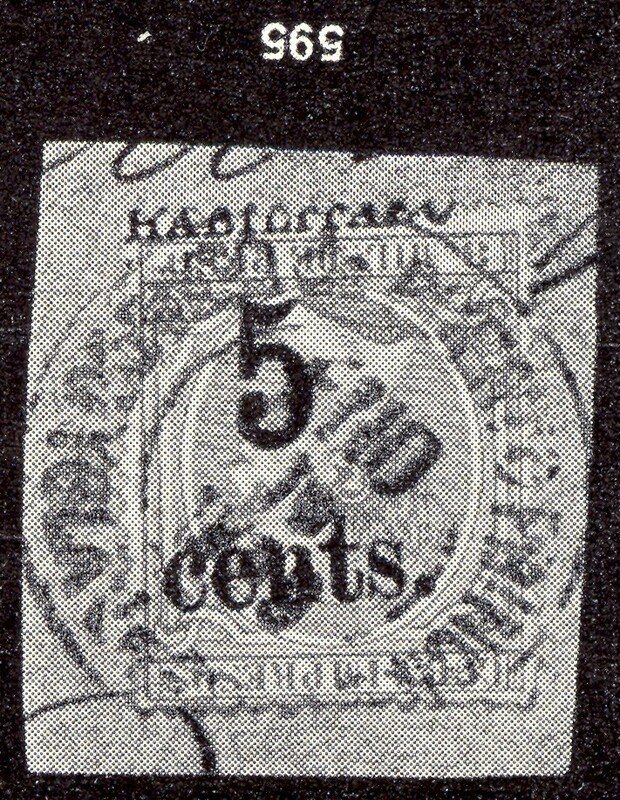 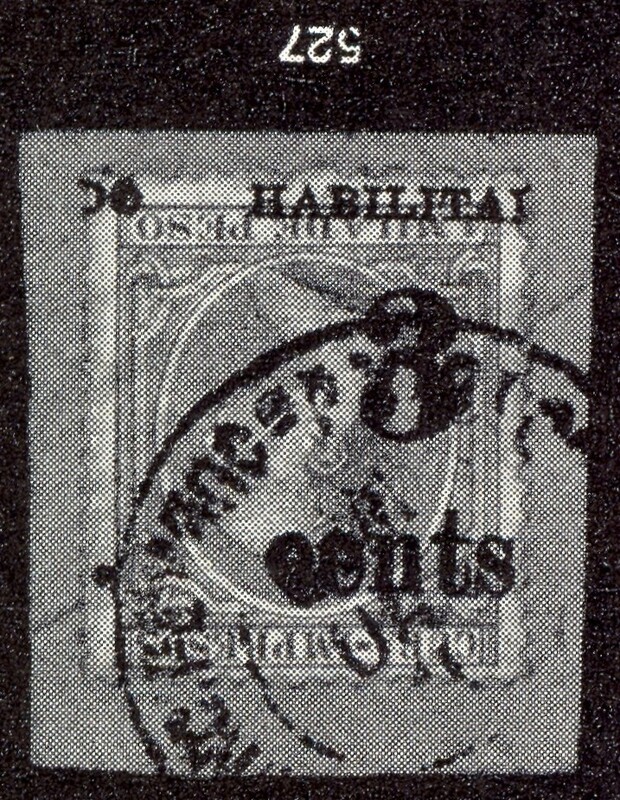 Close examination of the surcharge on this stamp reveals that the VVLs do not match those of any of the 5th printing positions. 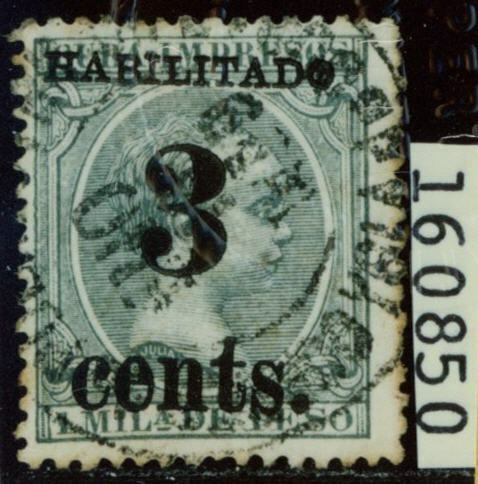 Additionally, the formation of the letters in HABILITADO is not correct and the letters are misaligned. 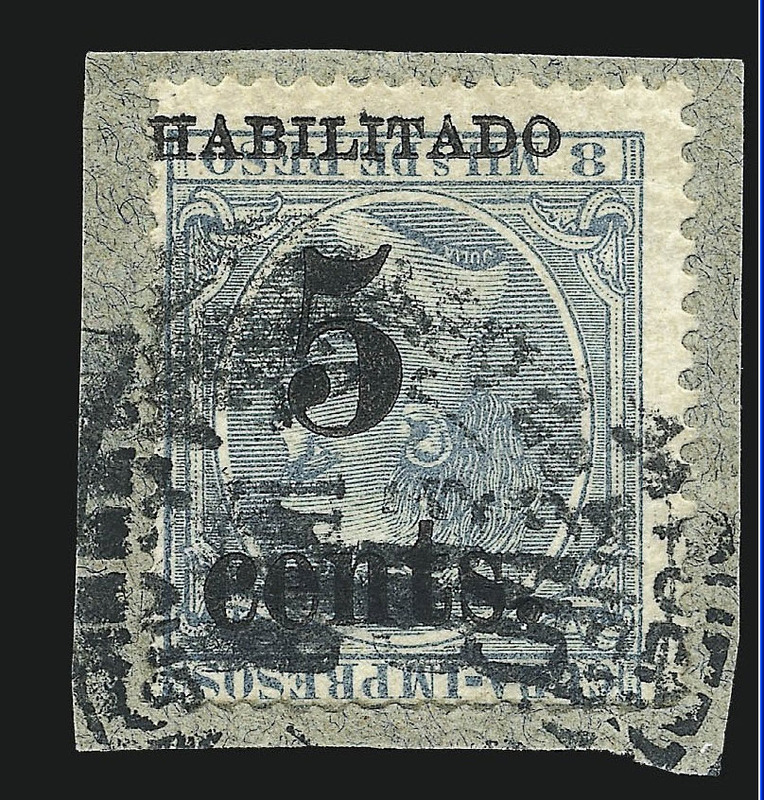 y los catálogos de subastas de colecciones de estos sellos. 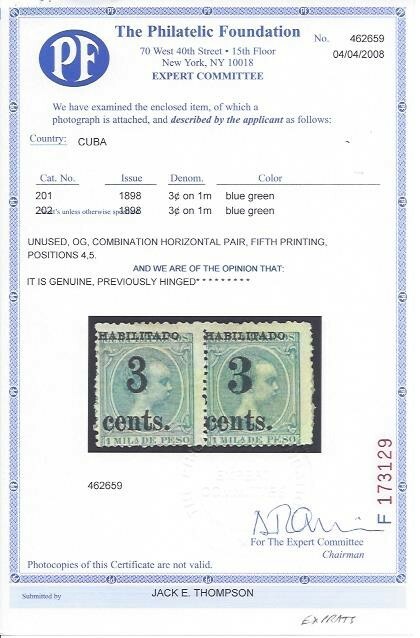 Ignacio Prats, vendida 24 Junio 2006 por Greg Manning Auctions, West Caldwell, N.J.
o piezas notables de estos sellos; identificándose también las piezas provenientes de ellas. 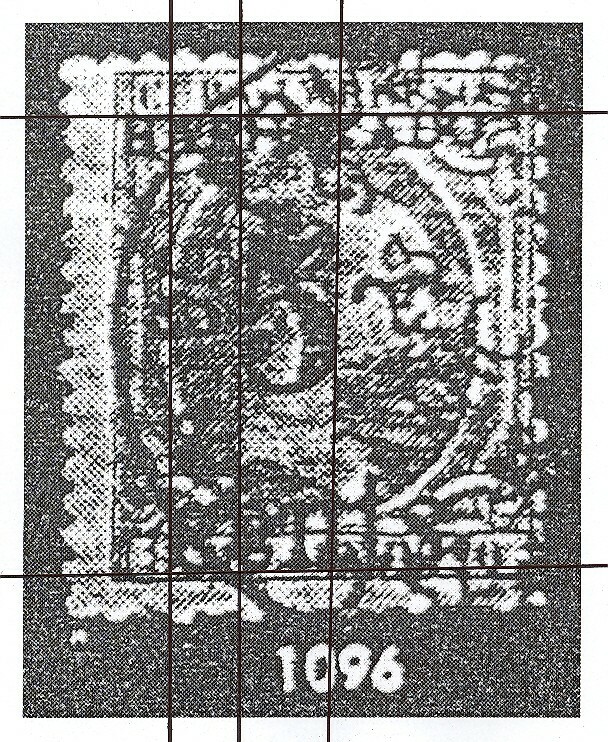 y de cubiertas con una resolución de 150 dpi con detalle de los sellos en 600 dpi. 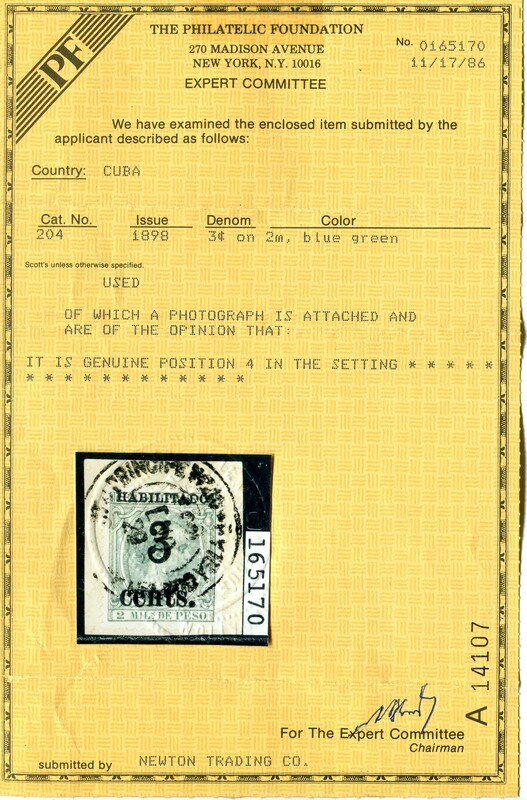 a menos de que se encuentre acompañado de un certificado de autenticidad emitido por una entidad reconocida. 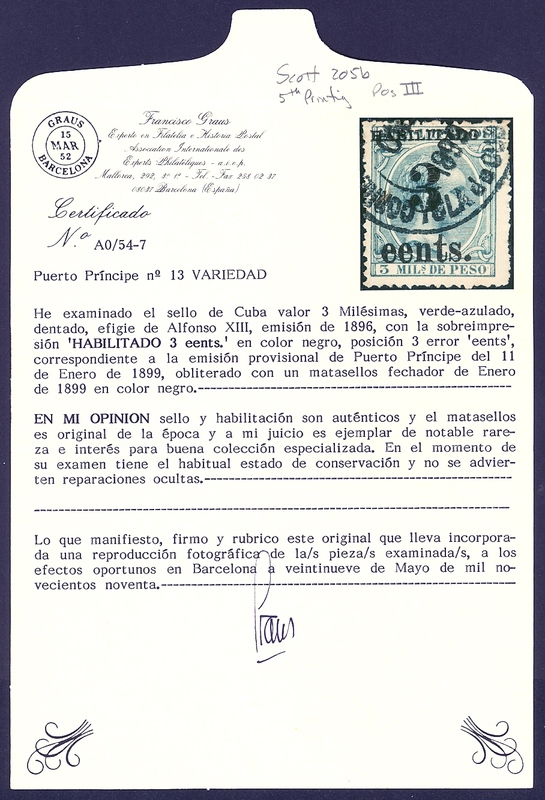 No se puede esperar que las casas de subastas sean expertos en estos sellos.